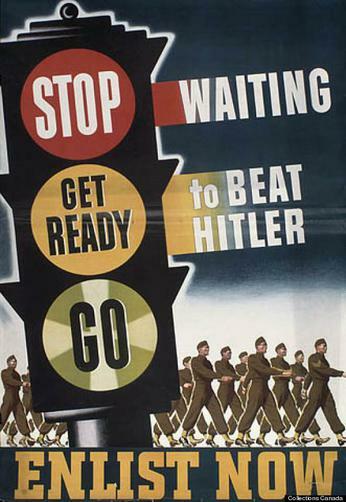 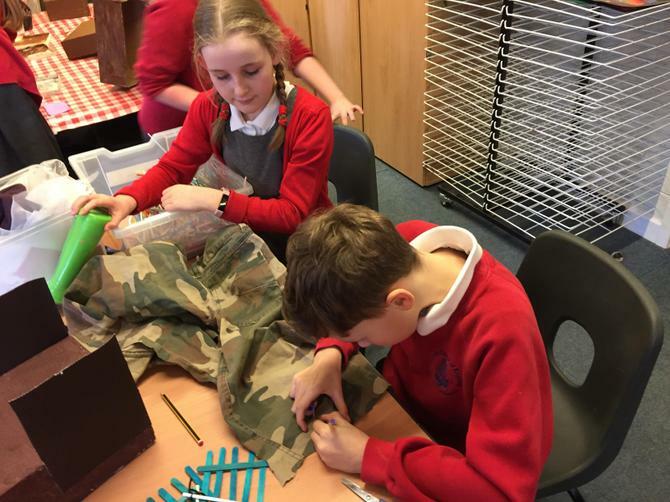 Excitingly, we are now working on a sewing project linked to the 'Make Do & Mend' slogan and campaign used during WWII. 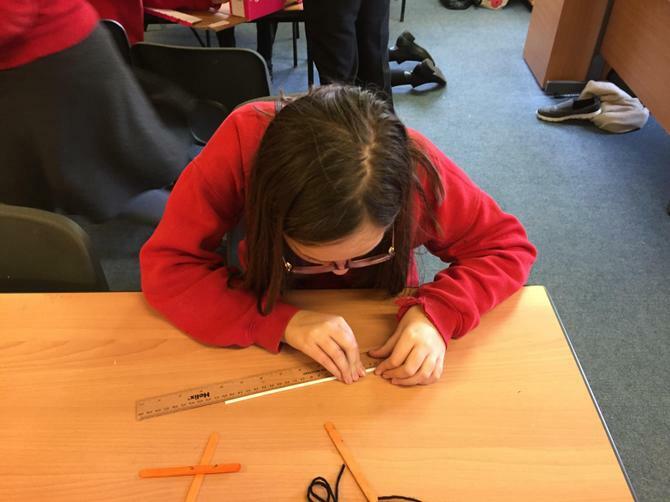 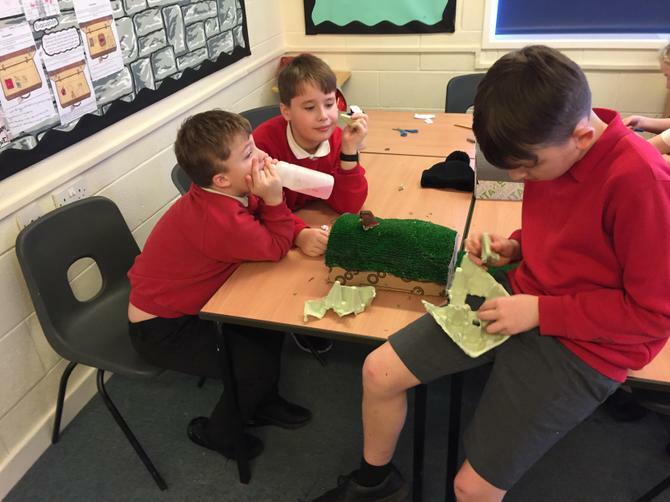 Firstly we refreshed our skills in the basic stitches of back stitch, running stitch and cross stitch by creating small 'samplers' before designing a final piece, which we are now working away on. 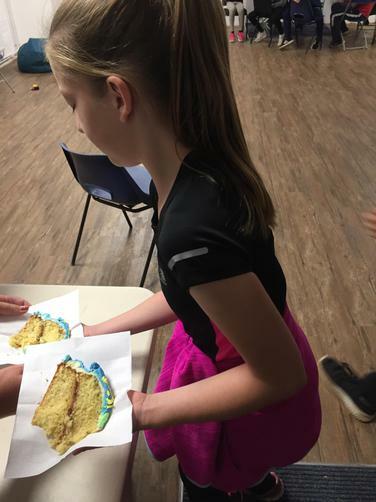 Stay tuned for the end results! 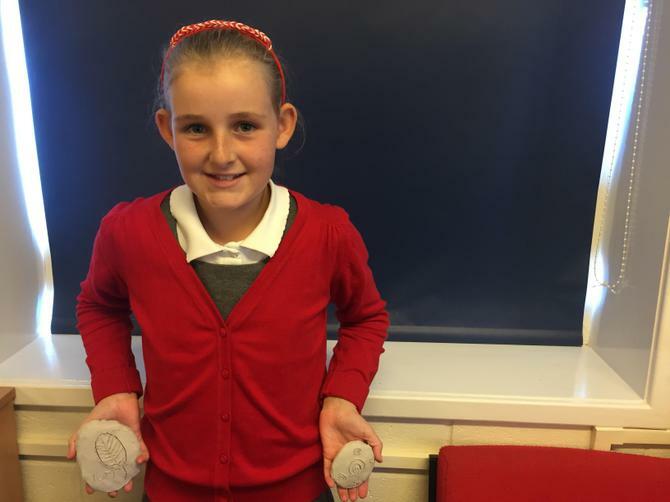 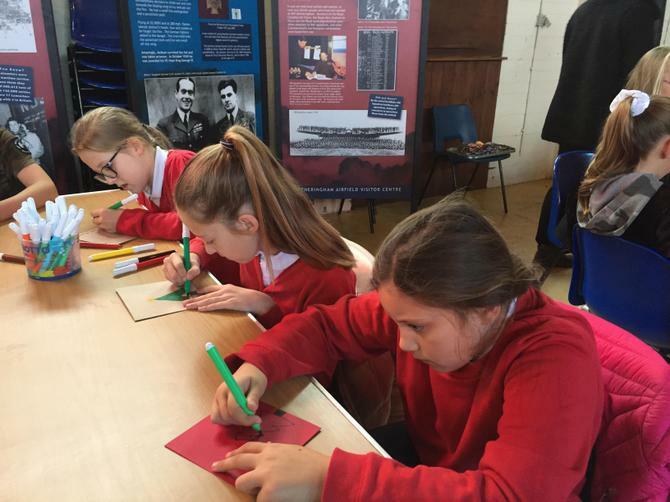 We have recently been learning all about Anne Frank, who is sometimes known as 'The Voice of a Generation'. 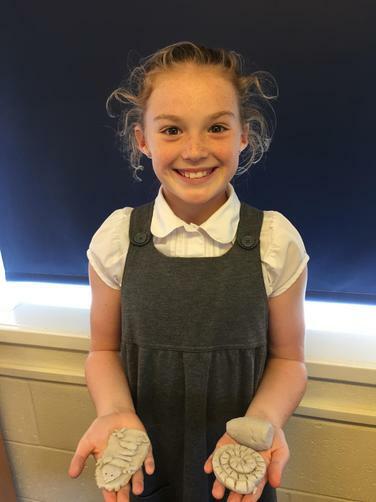 We have been researching all about the tragically short life of this wonderful girl and her lasting legacy thanks to her infamous diary. 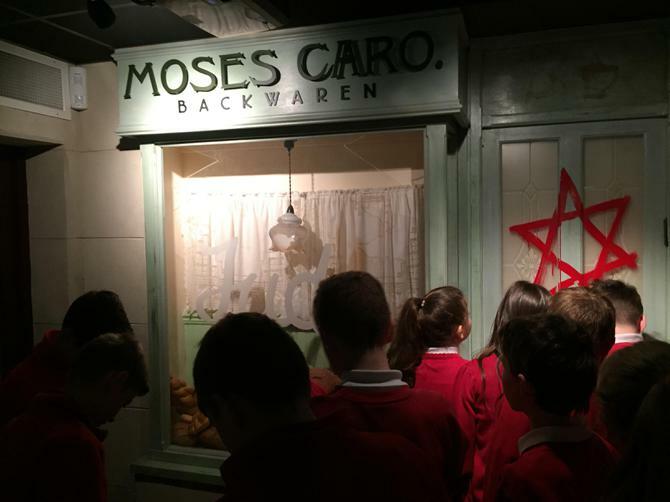 We will also be learning more about her on our school trip to the National Holocaust Centre (25th March). 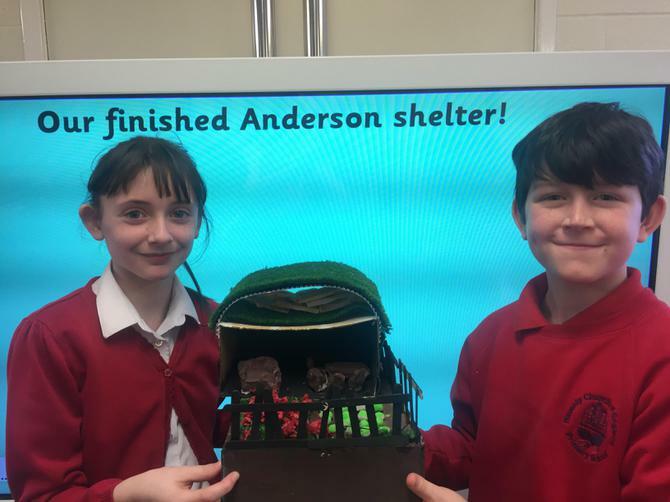 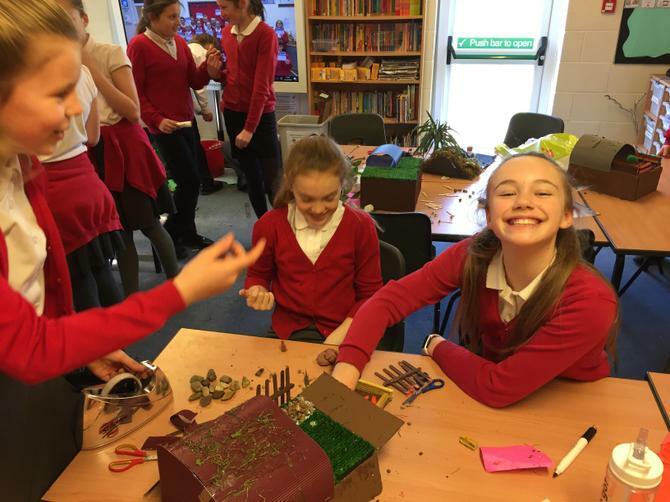 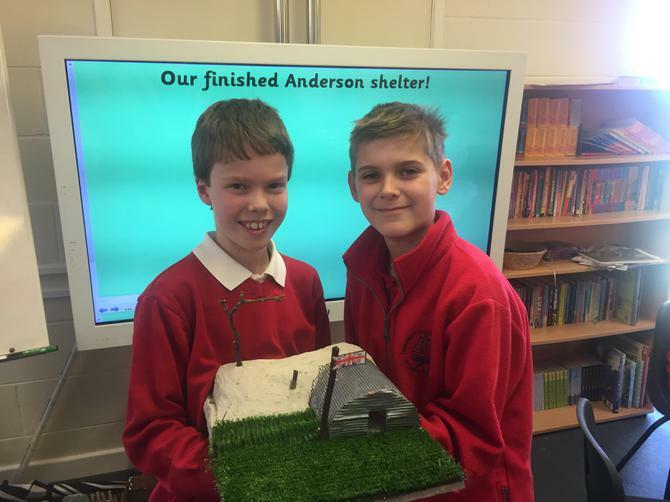 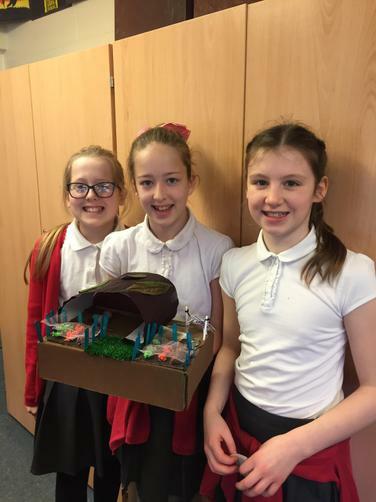 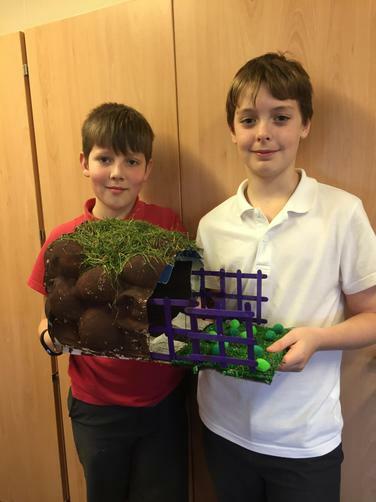 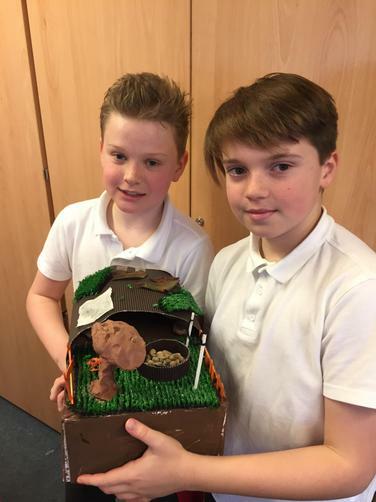 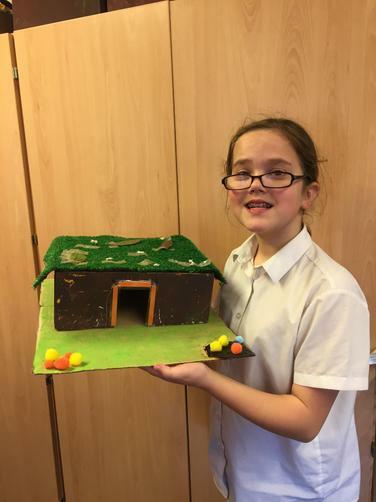 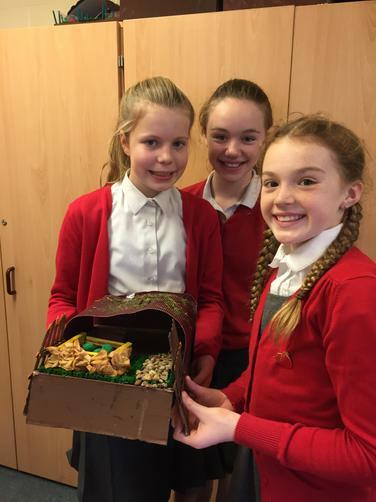 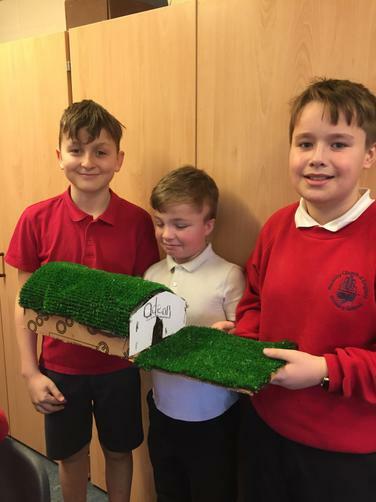 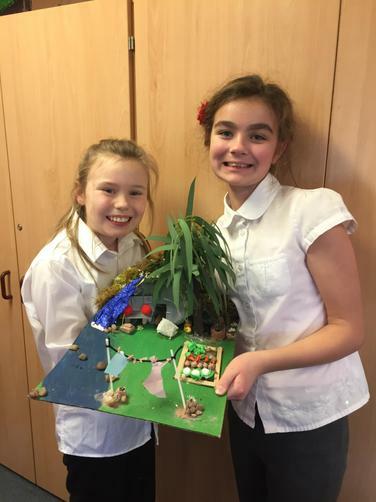 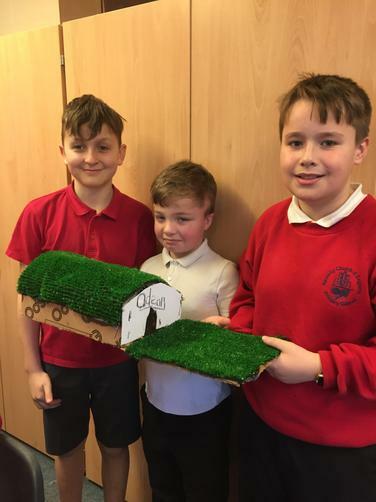 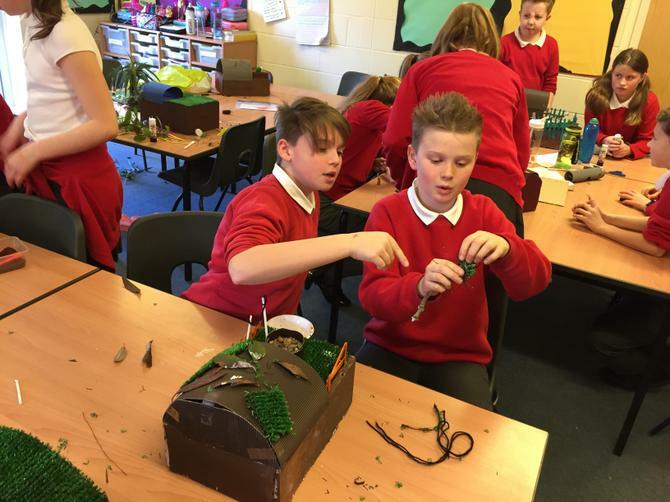 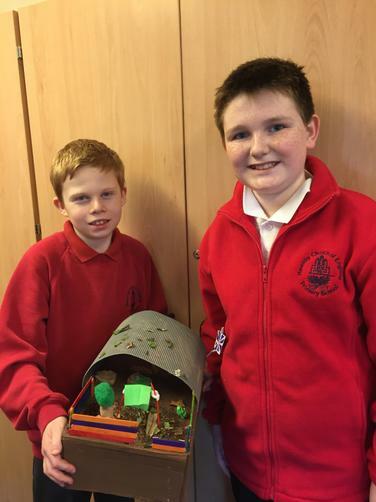 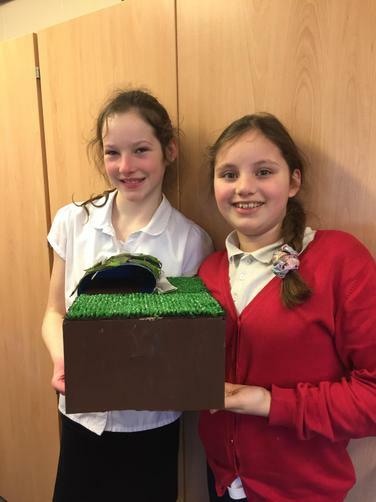 We began this exciting DT project by researching some key facts about Anderson shelters. 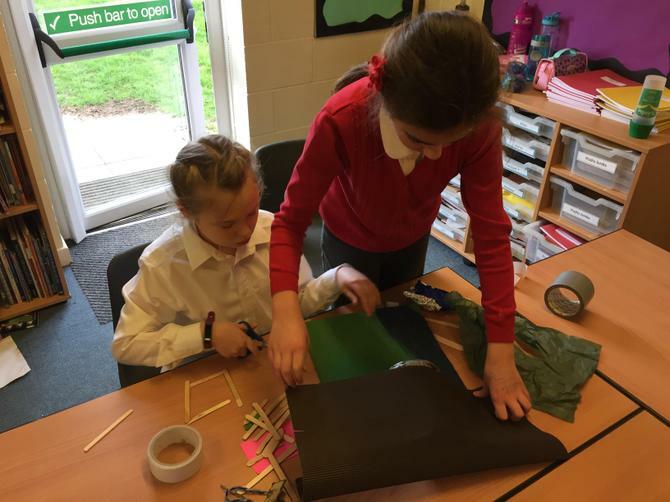 Following this, we created a detailed plan and materials list of how we wanted our structures to look. 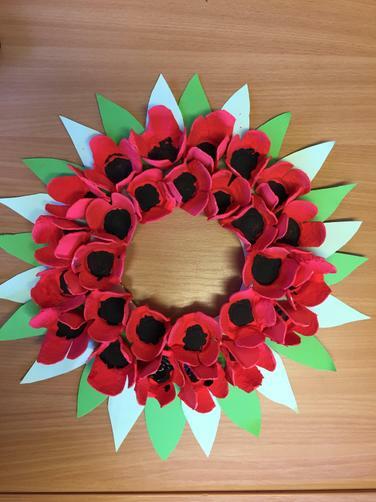 Then it was on to making and evaluating - we've had a great time making these and think they look wonderful! 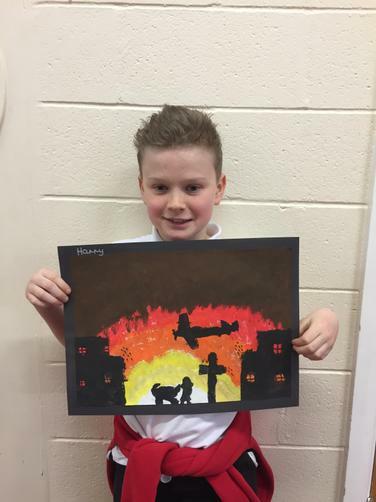 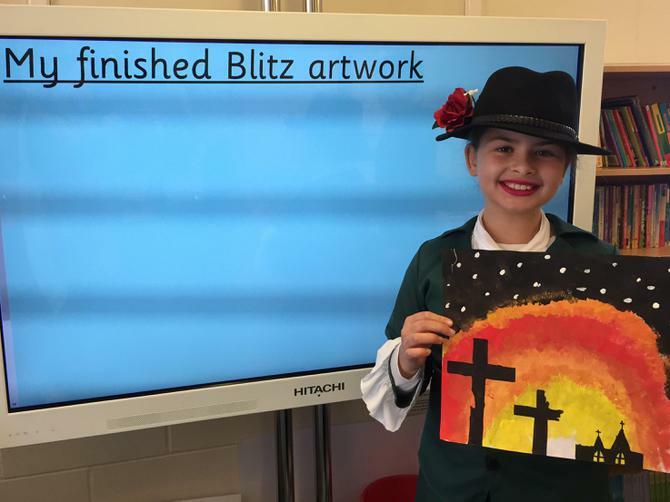 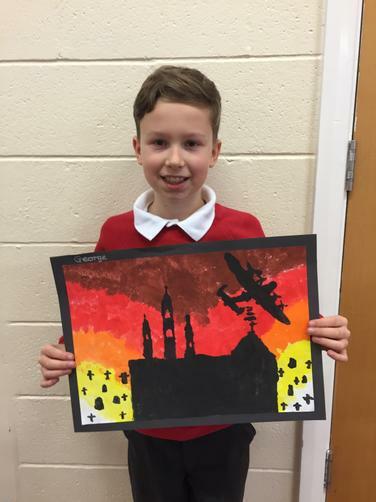 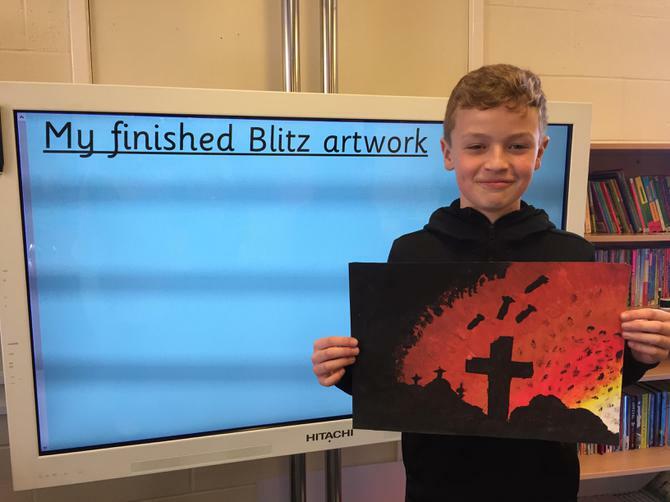 We are thoroughly enjoying our new topic of WWII, particularly our learning all about The Blitz. 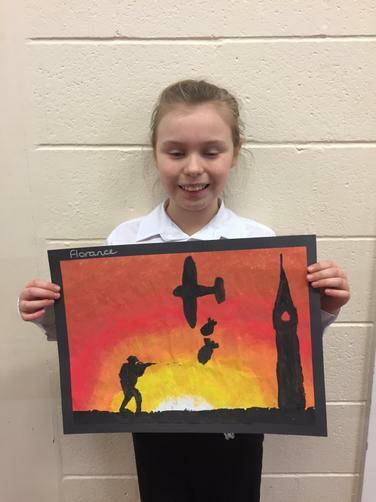 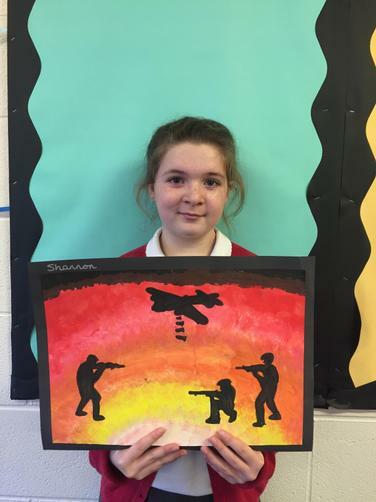 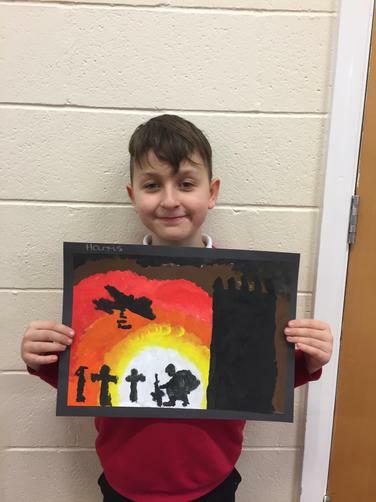 We have taken the idea of silhouette art to create these wonderful pieces to commemorate this dark time during Britain in the 1940s. 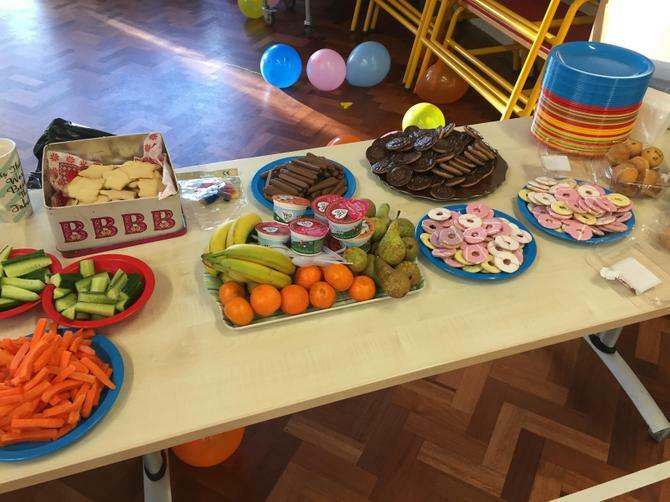 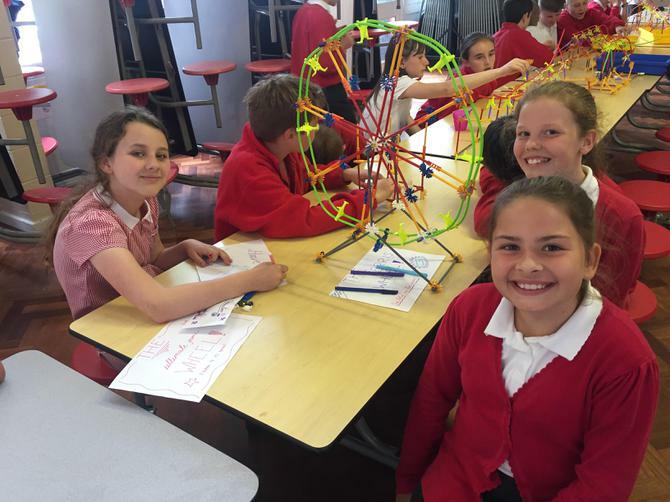 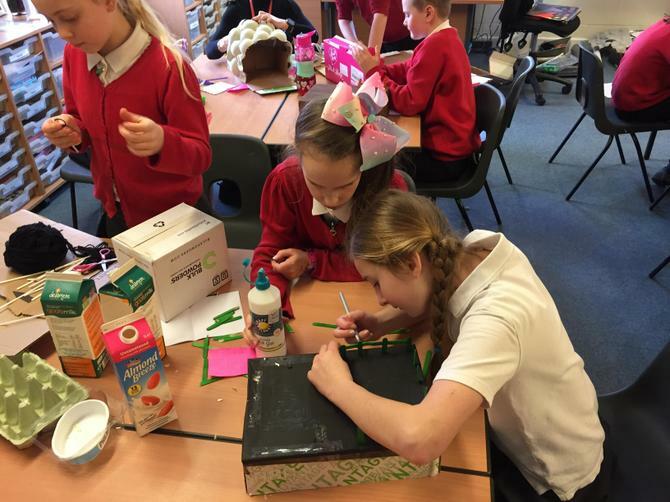 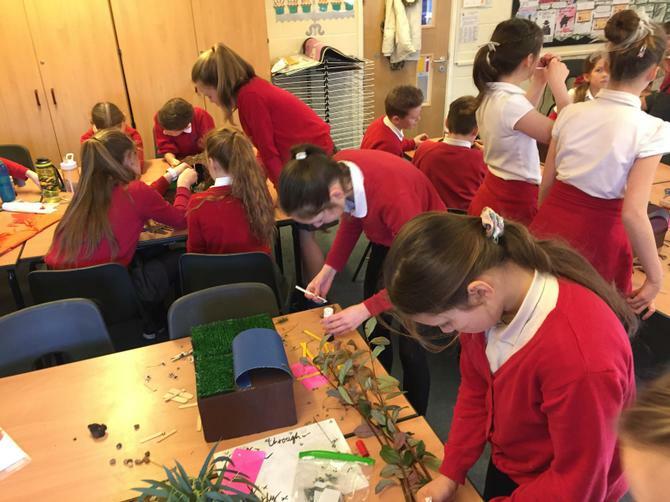 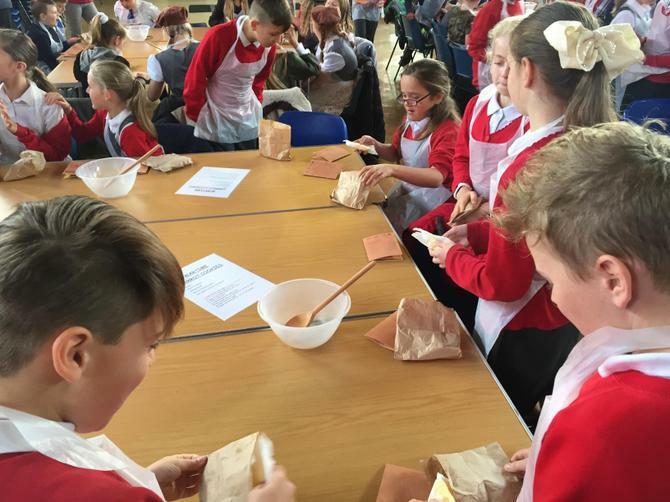 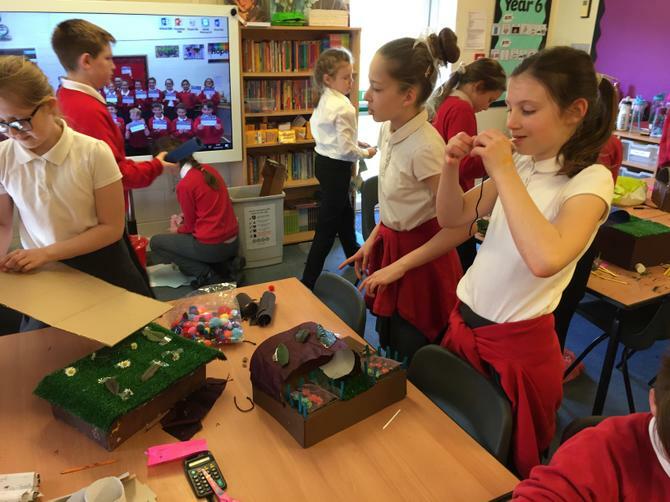 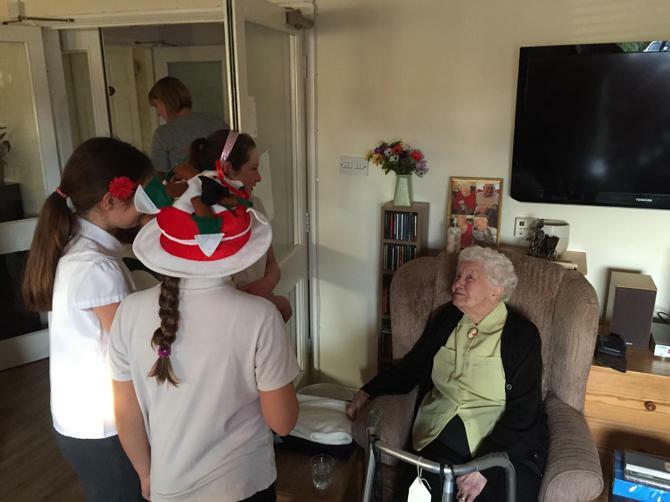 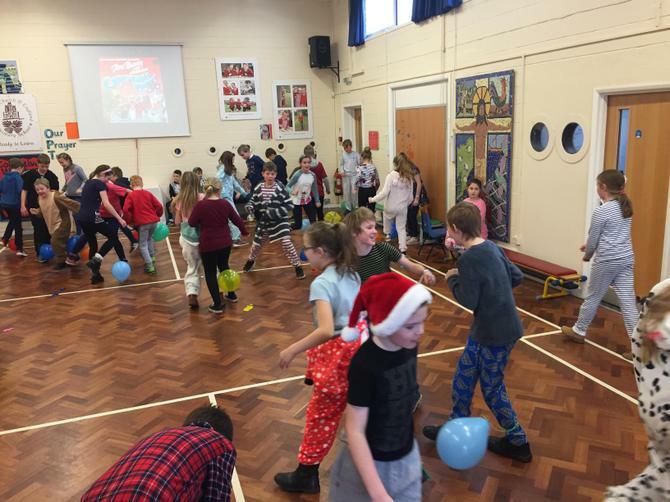 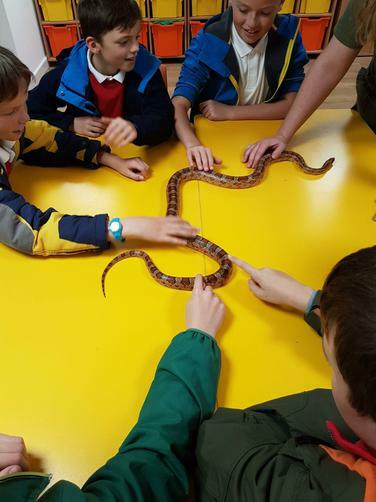 To finish off our Autumn term, we joined together for a party with Year 5. 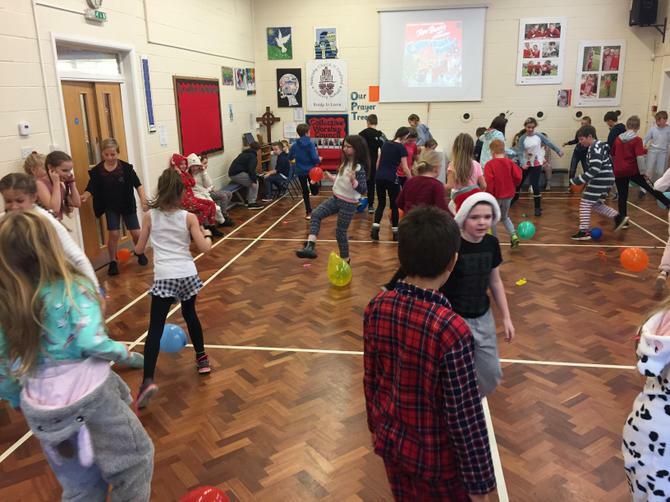 There was a small buffet, music and plenty of party games. 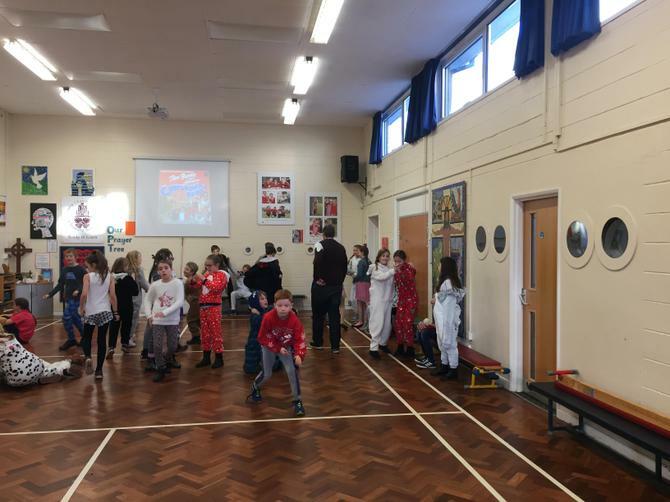 What a great way to finish our term - merry Christmas everyone! 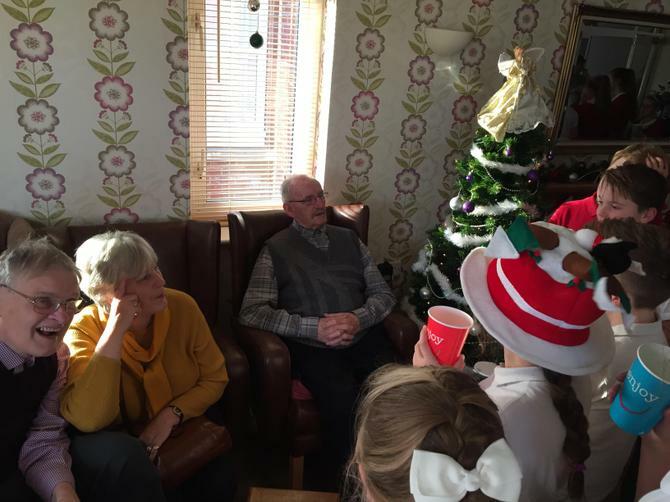 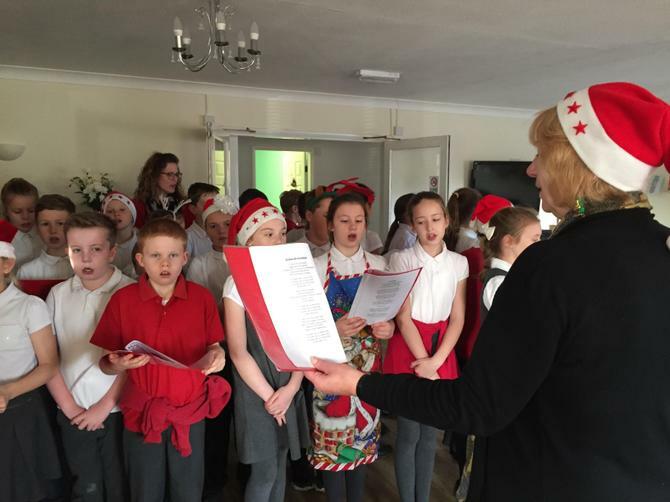 Today we visited our local residents' care home, 'Holmleigh' to sing some Christmas carols and spread some festive cheer! 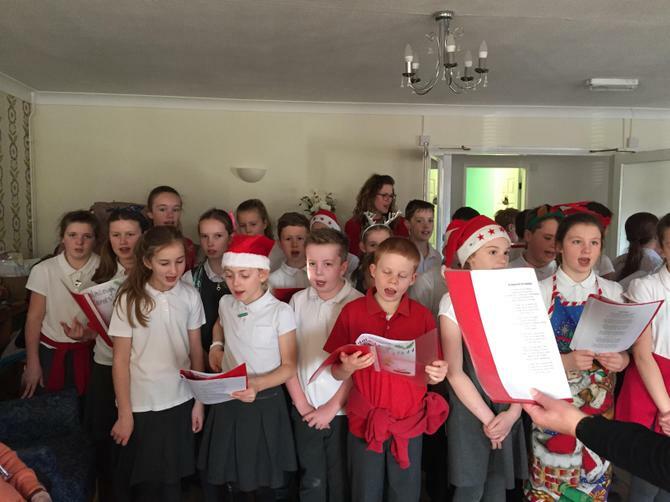 We also had a biscuit and a drink with some of our wonderful audience afterwards, who thanked us for visiting and singing so beautifully. 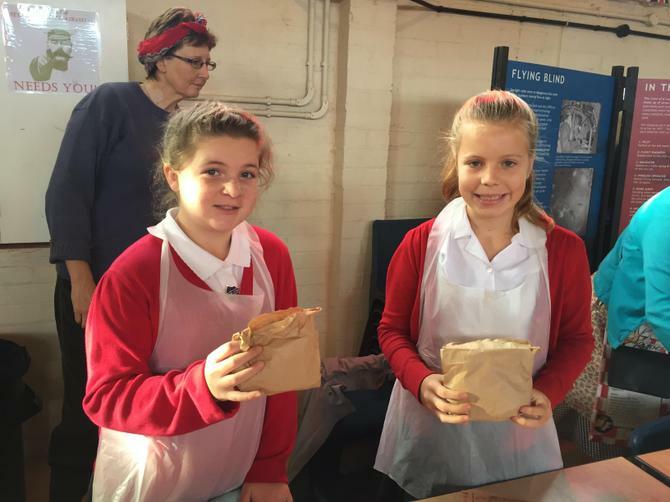 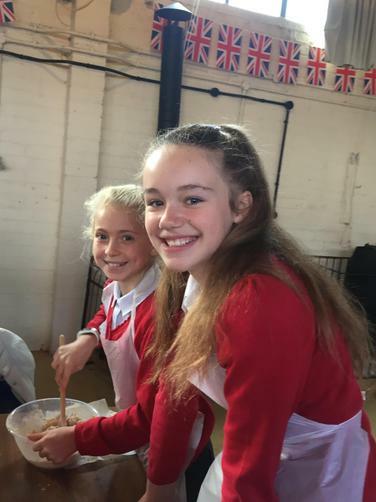 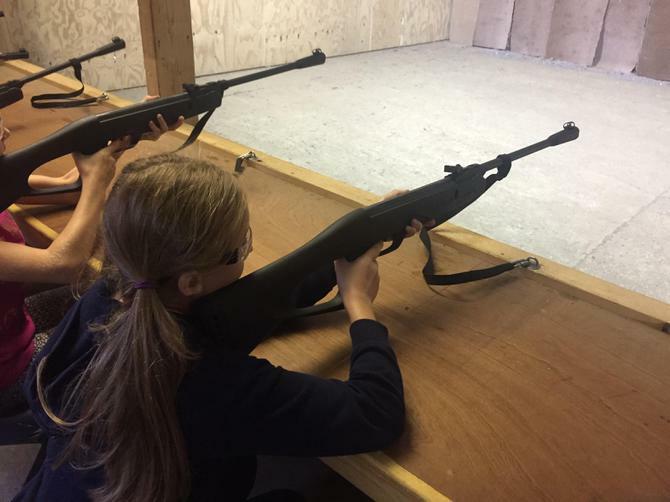 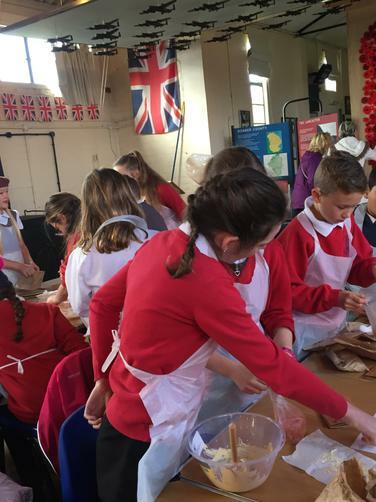 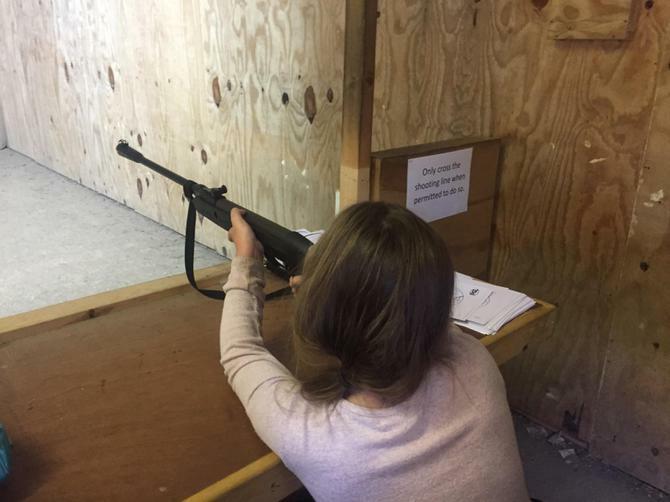 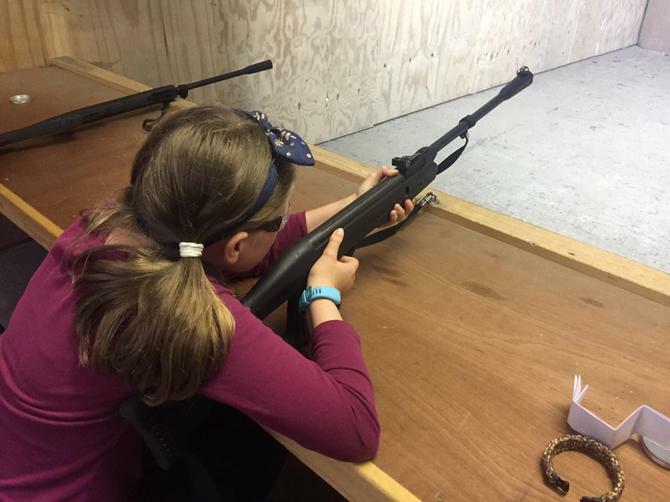 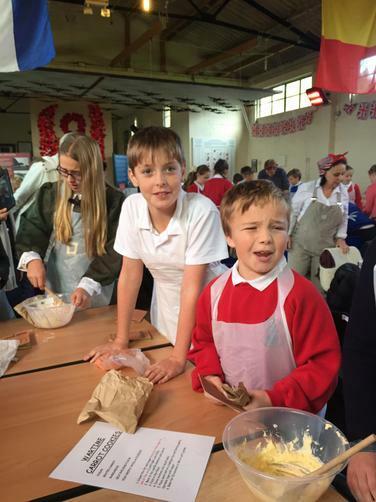 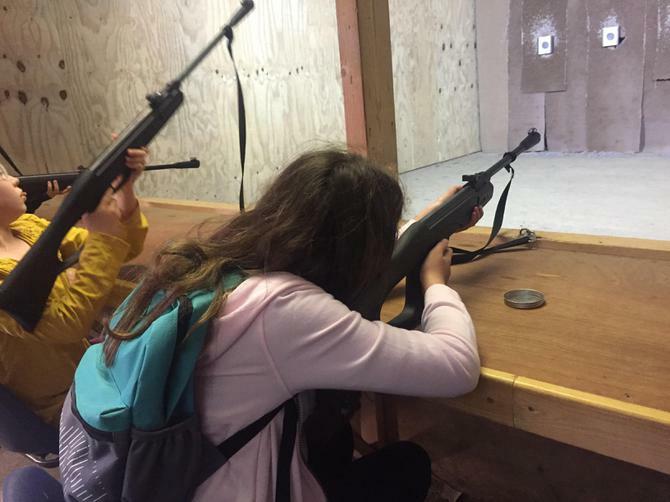 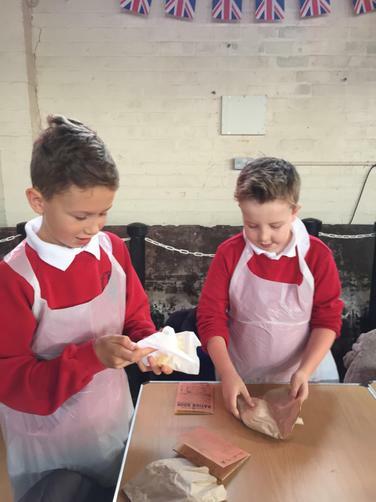 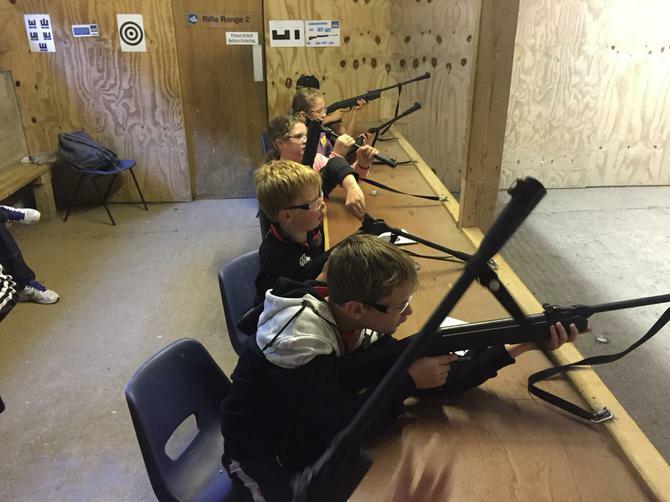 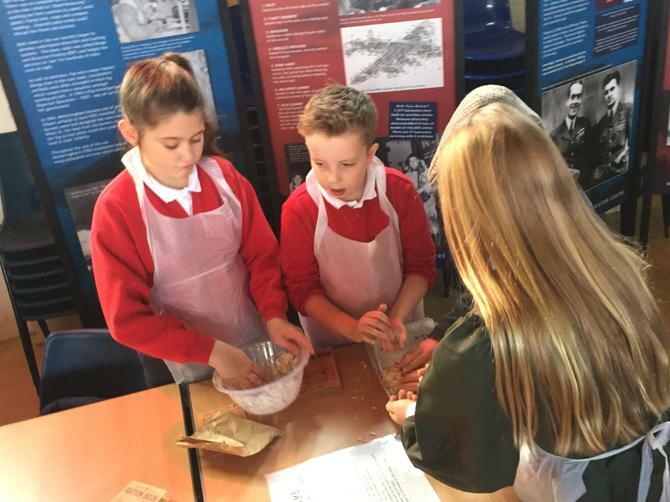 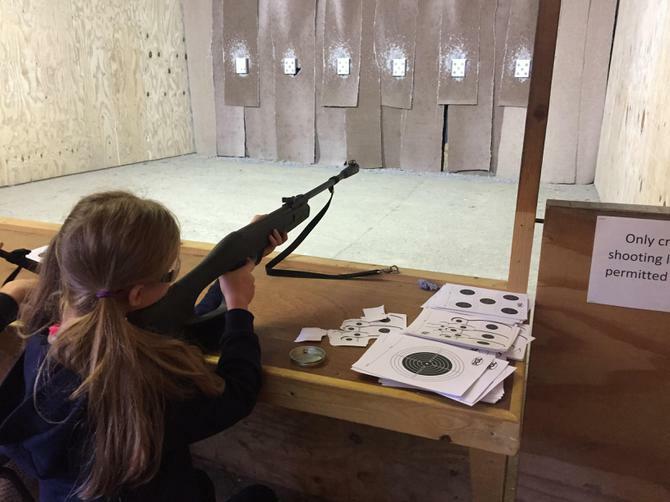 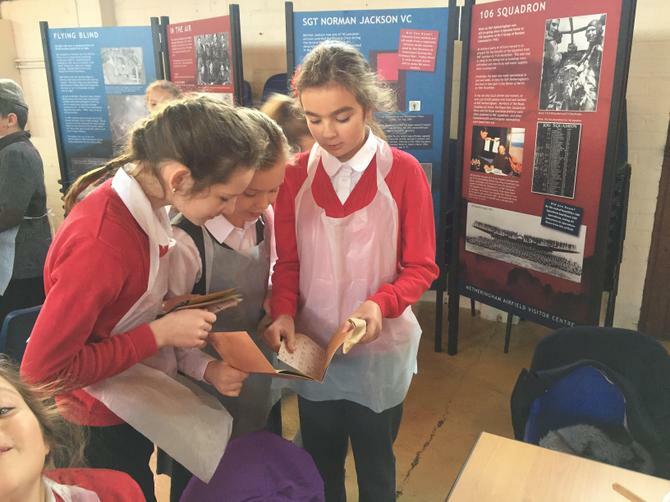 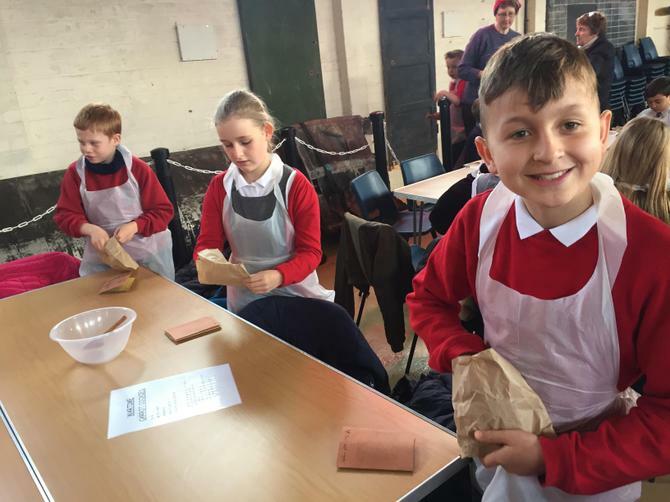 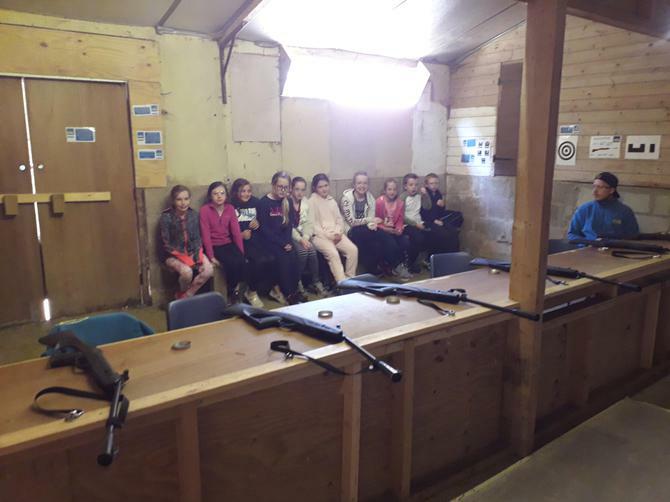 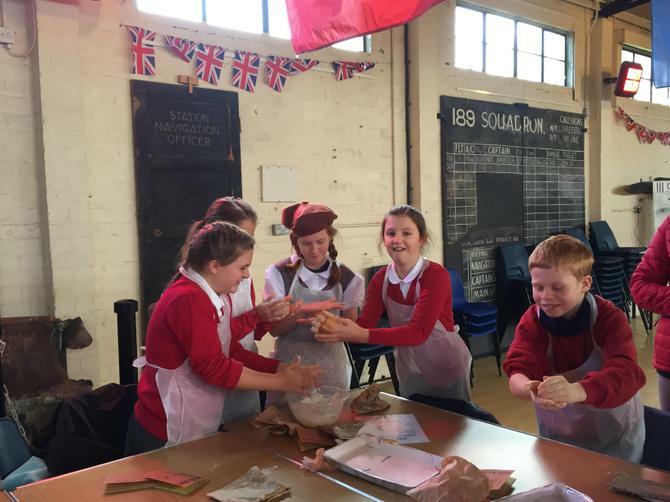 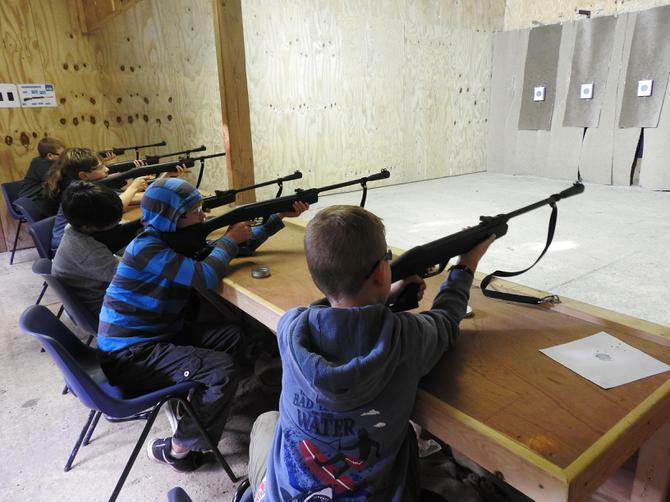 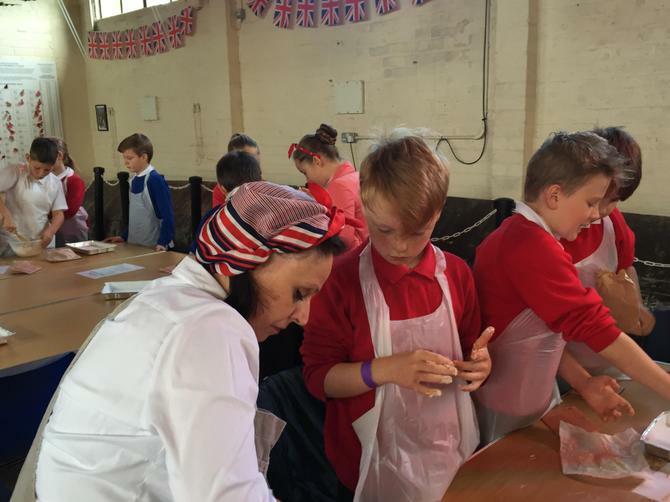 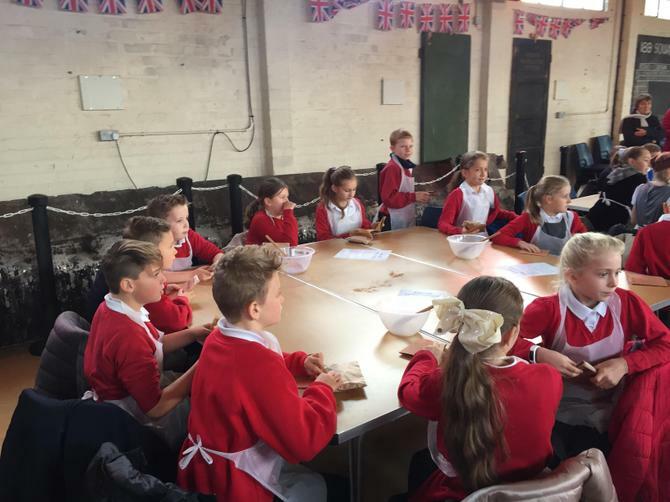 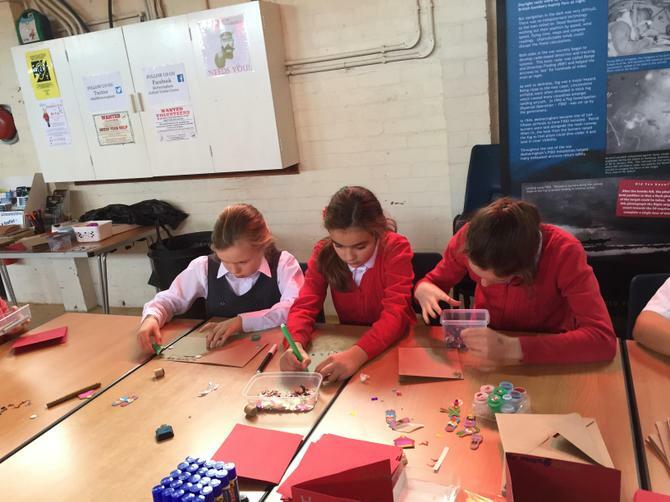 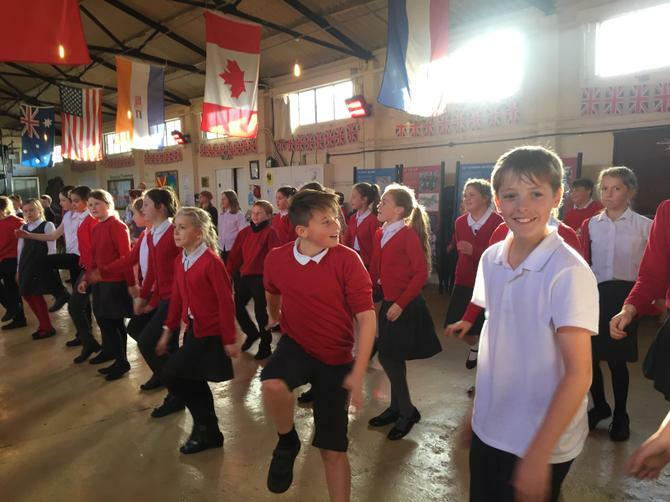 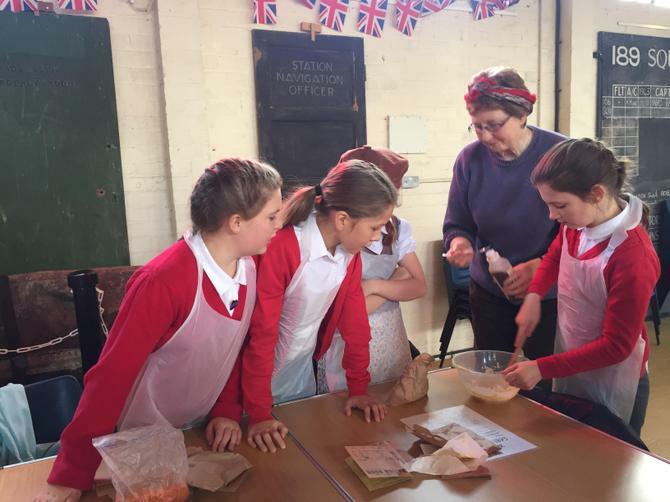 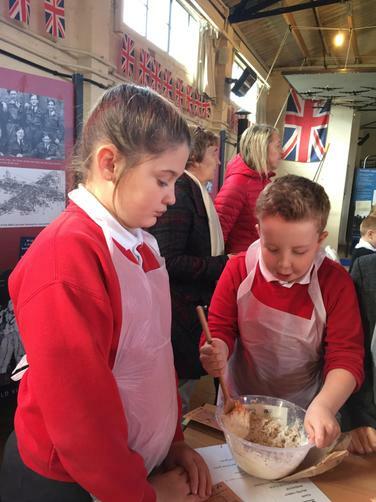 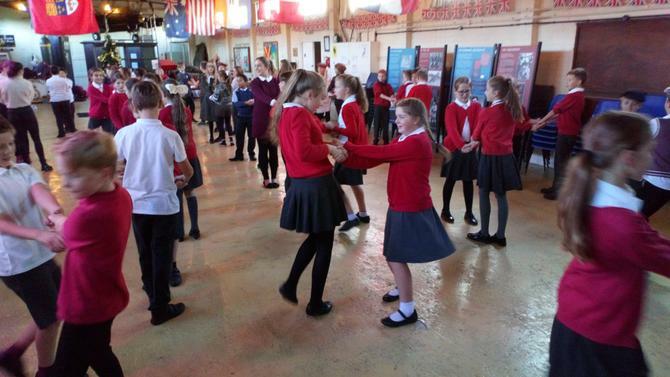 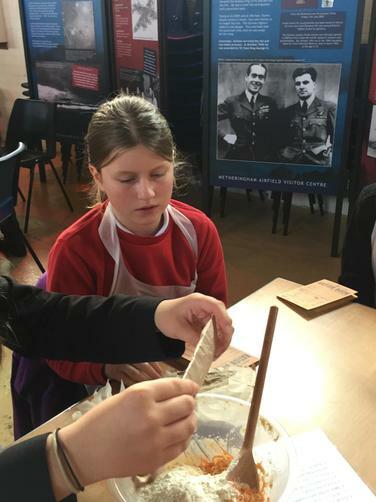 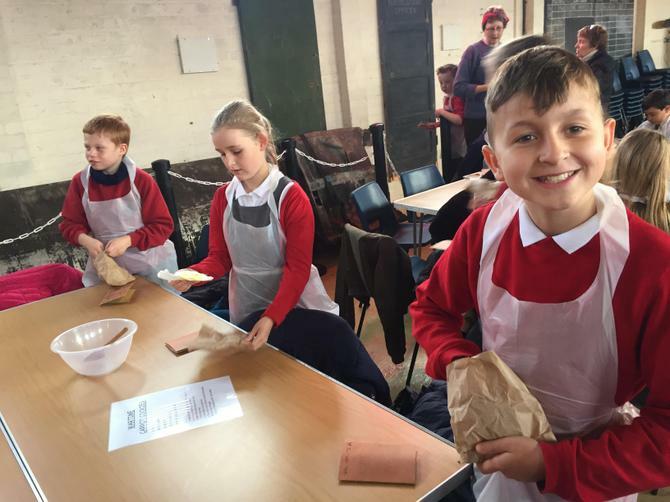 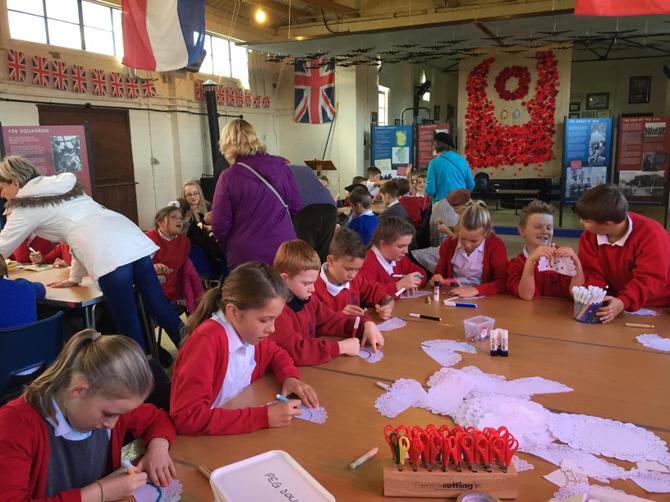 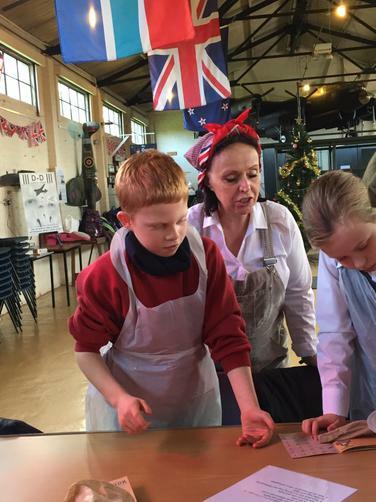 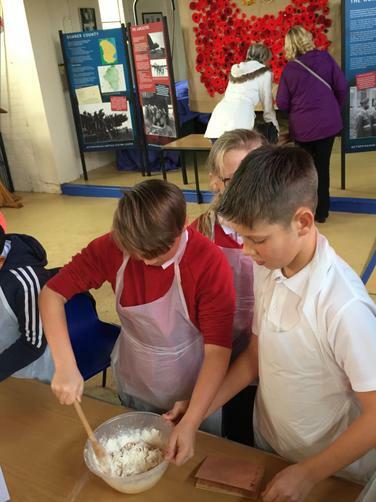 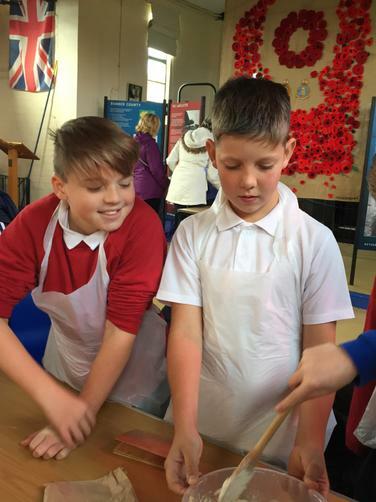 On Monday 19th November, Year 6 ventured out to a rather chilly aircraft hangar at the former RAF Metheringham base to take part in a Wartime Christmas event to inspire us for our topic of WWII which commences in January. 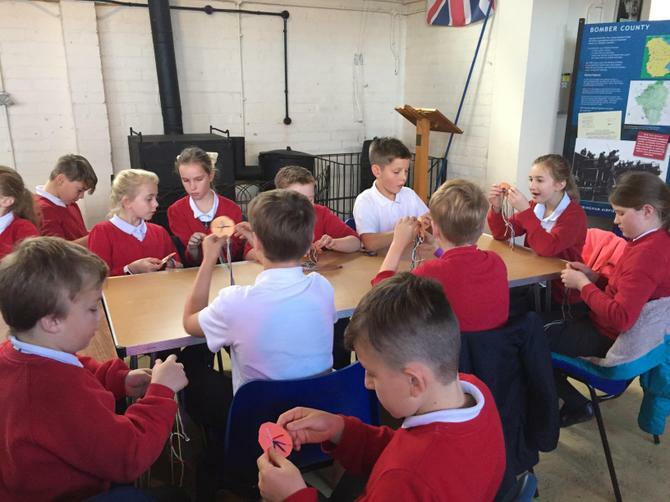 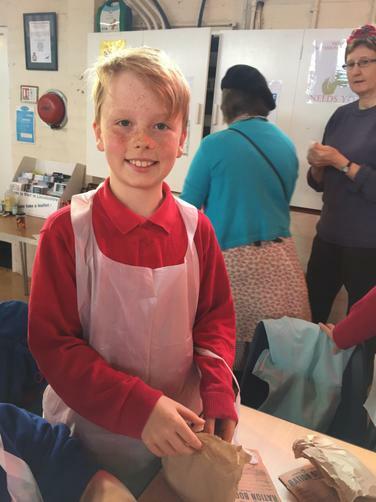 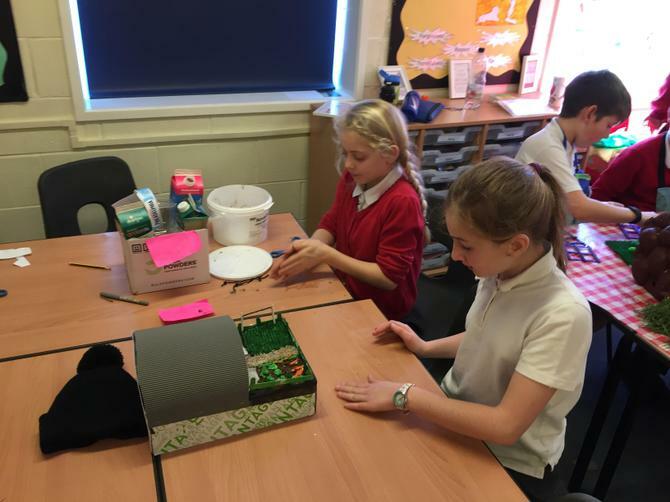 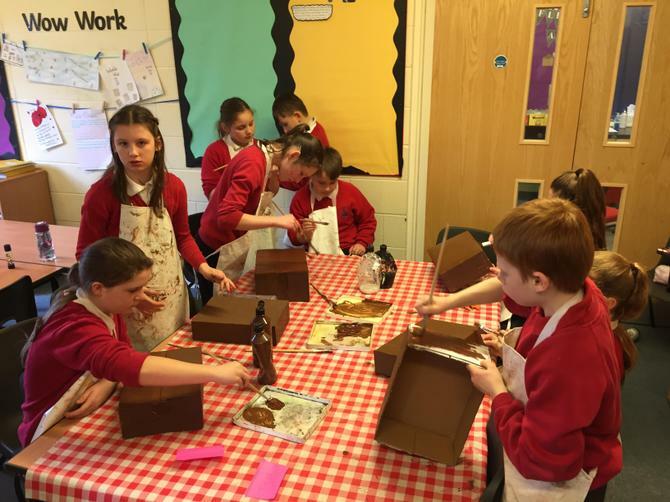 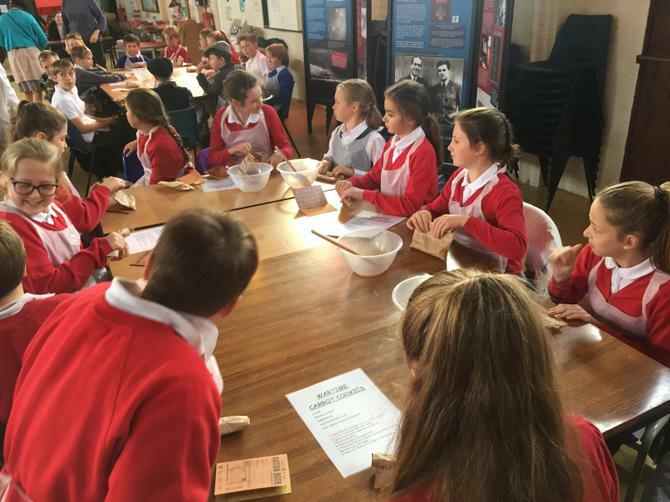 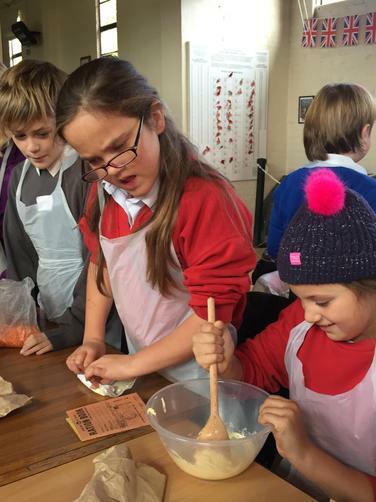 Whilst there, we made some Christmas carrot cookies, completed traditional crafts such as peg dolls and woven bracelets and wrote Christmas postcards from evacuees. 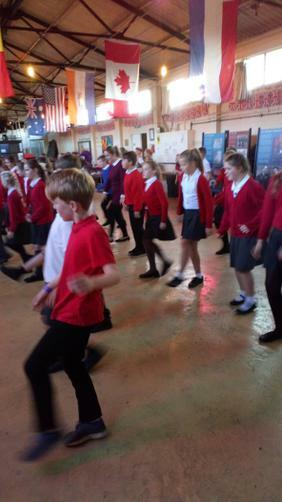 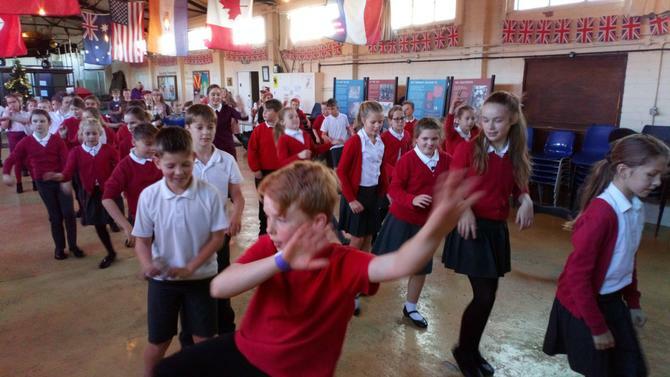 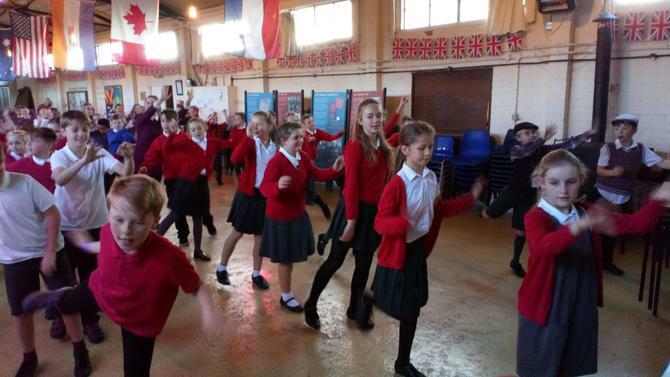 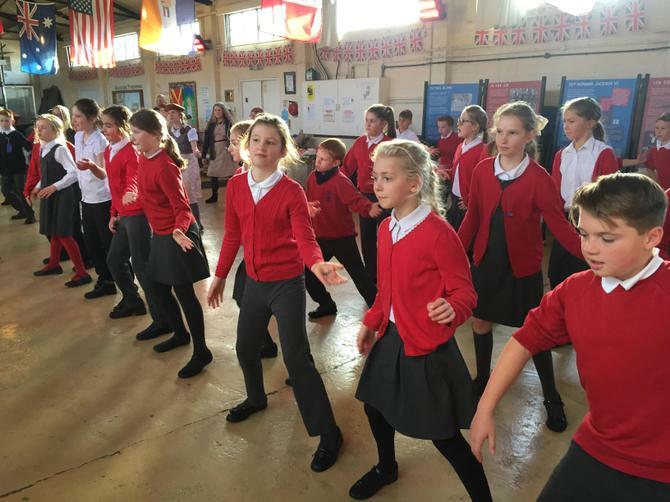 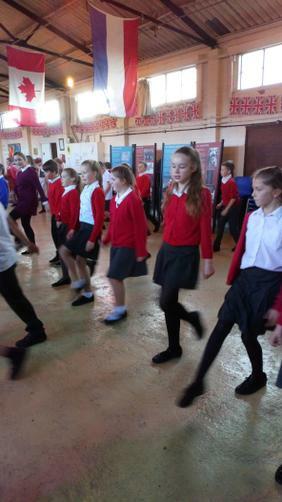 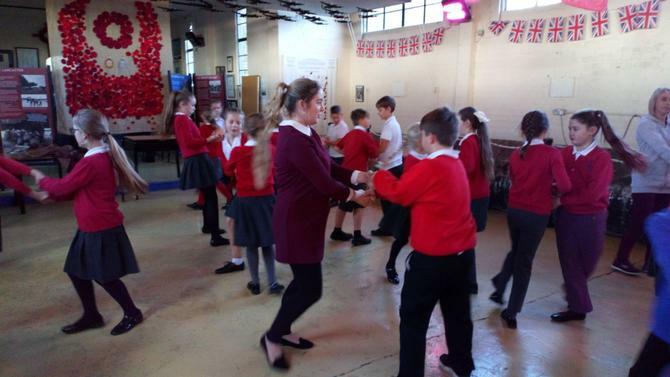 In the afternoon we also learnt some wartime songs and dances! 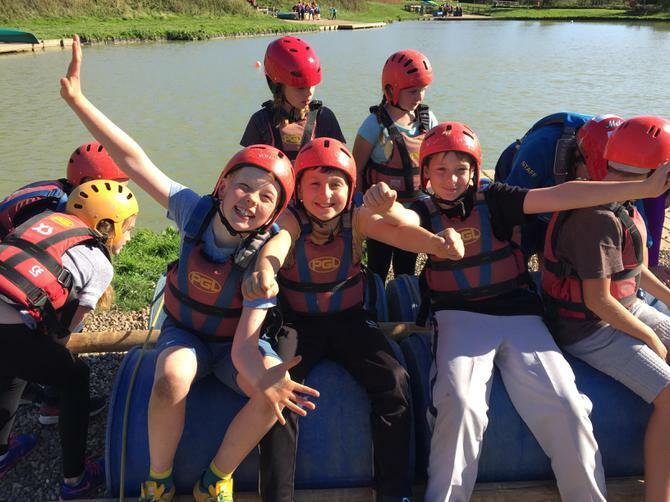 What a brilliant trip! 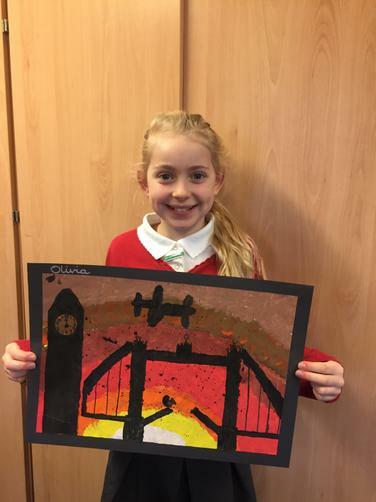 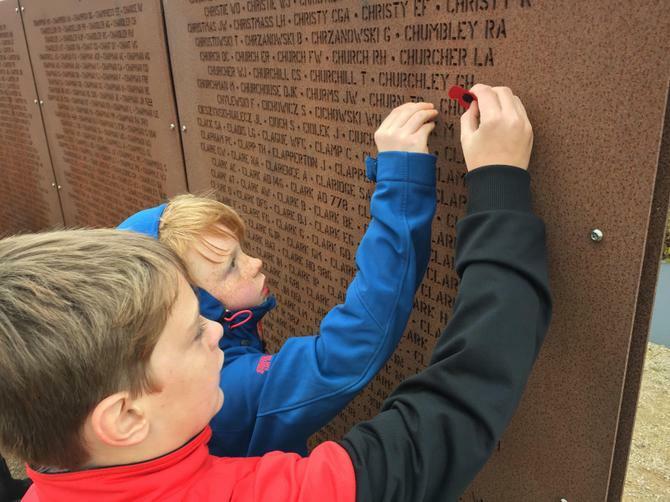 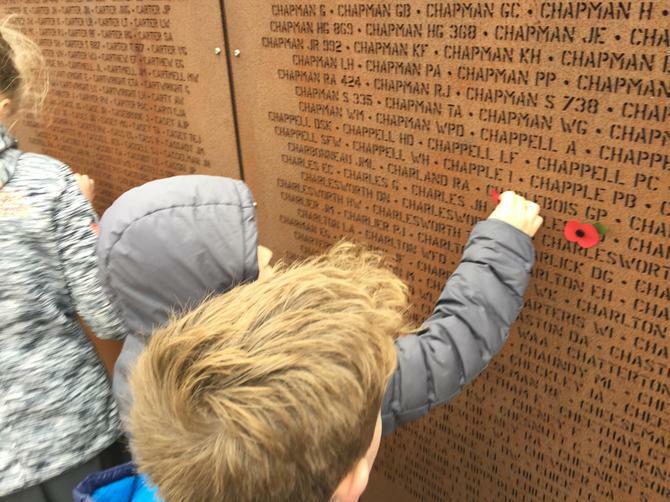 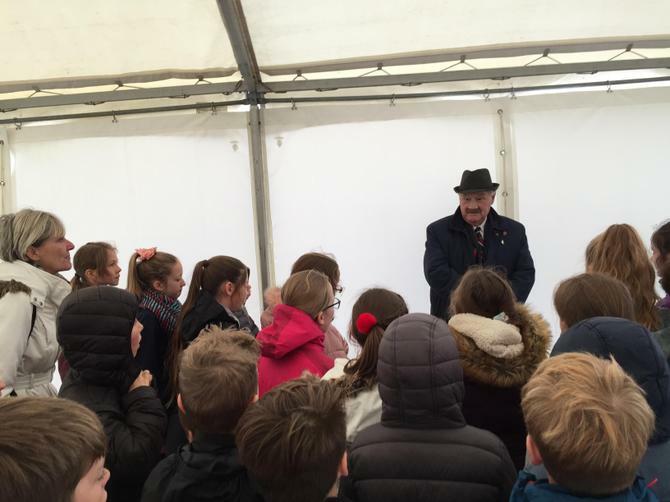 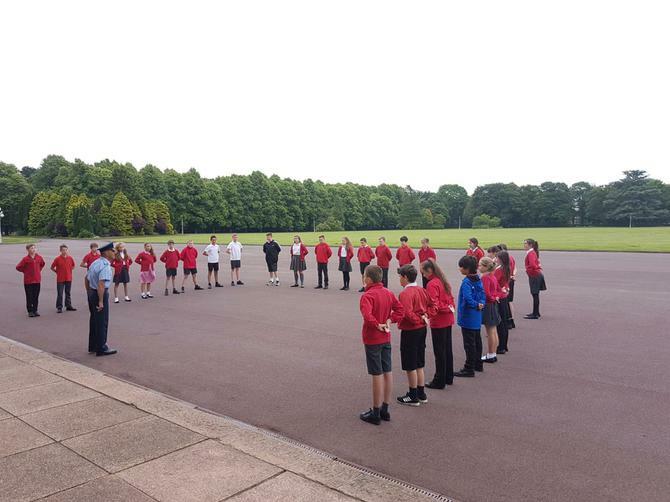 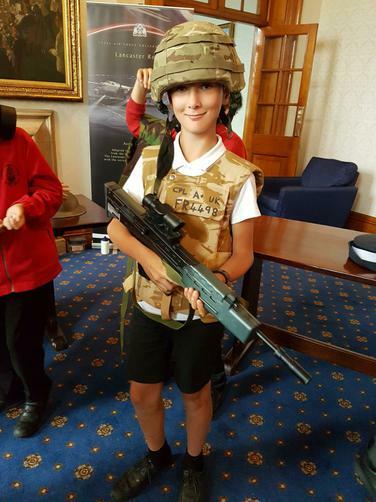 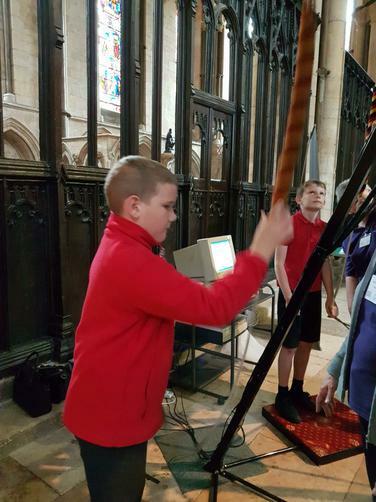 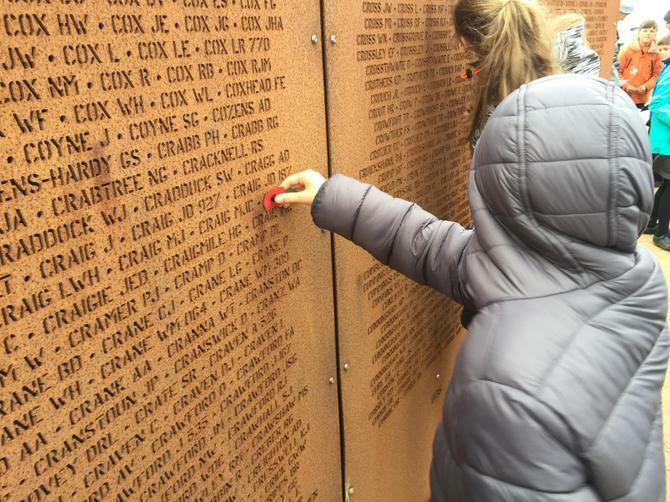 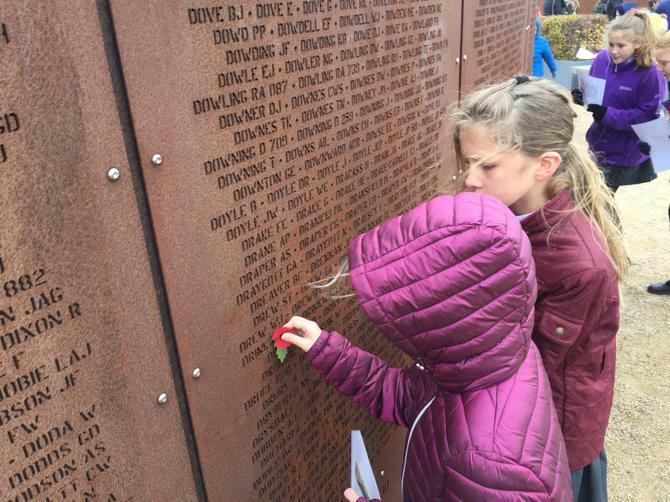 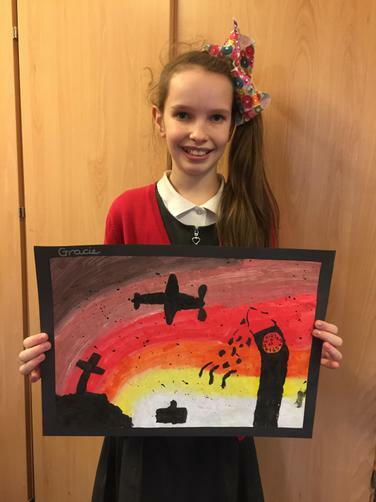 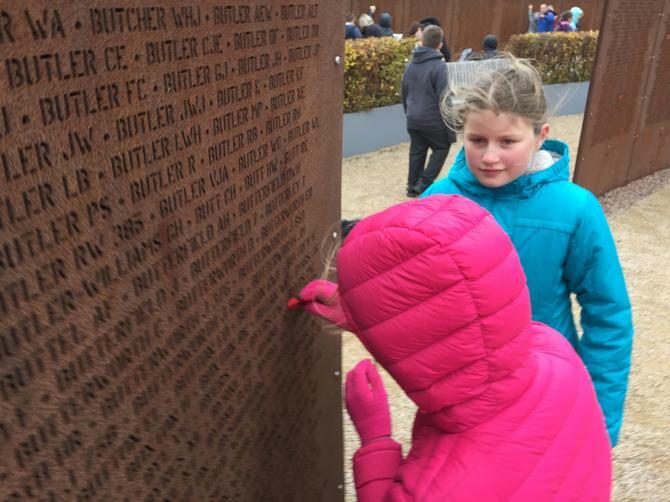 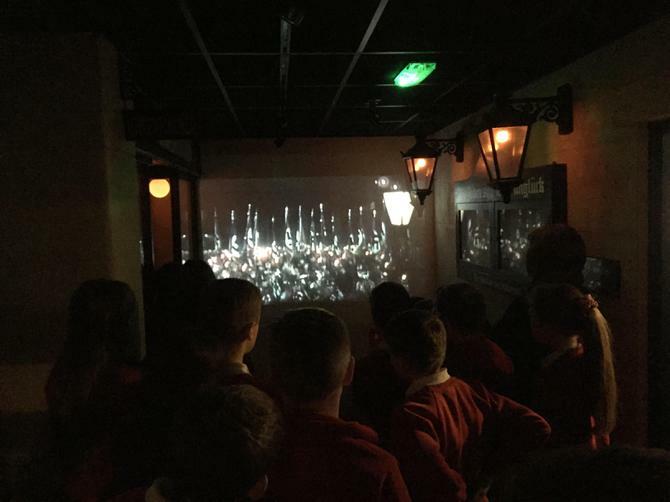 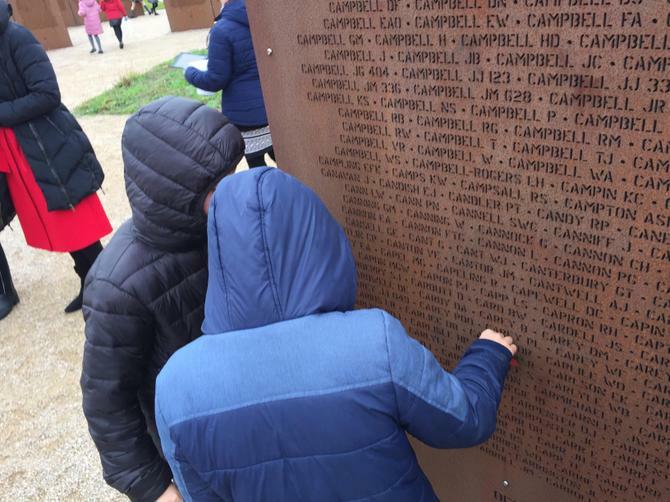 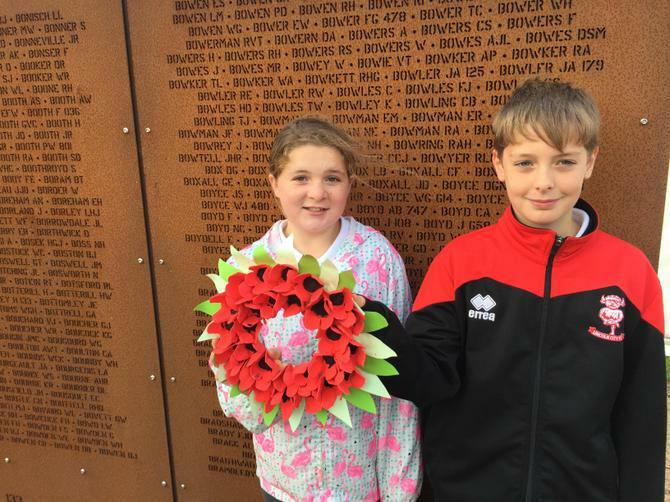 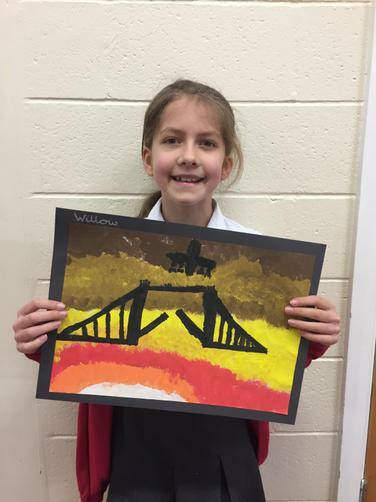 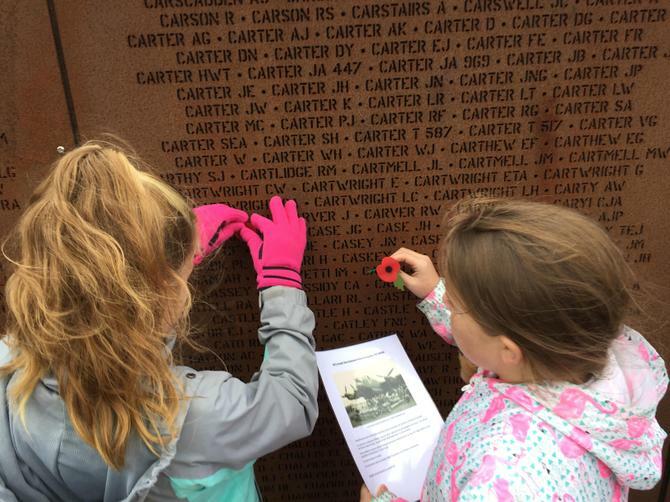 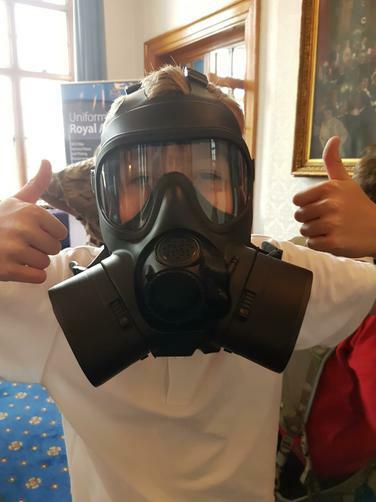 This past Friday, Year 6 were invited to attend the special Remembrance Service held at the recently-built International Bomber Command Centre on the outskirts of Lincoln. 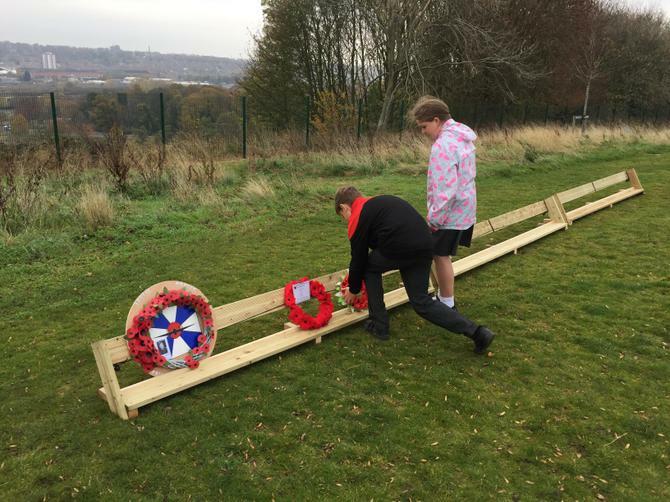 Whilst there, we took part in a commemorative service, placed poppies in the etched names of some of the fallen on the remembrance walls and laid a wreath which we had hand made. 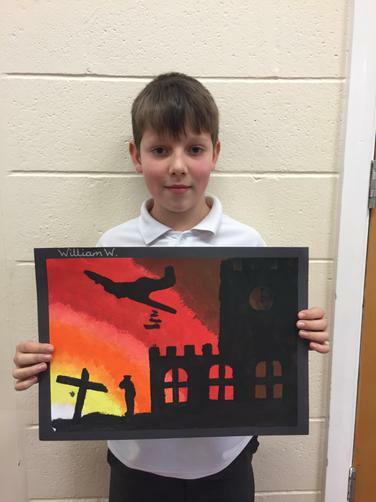 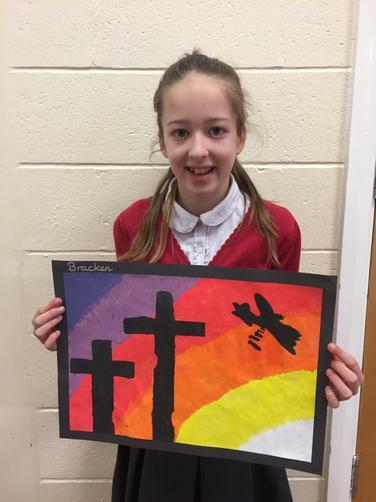 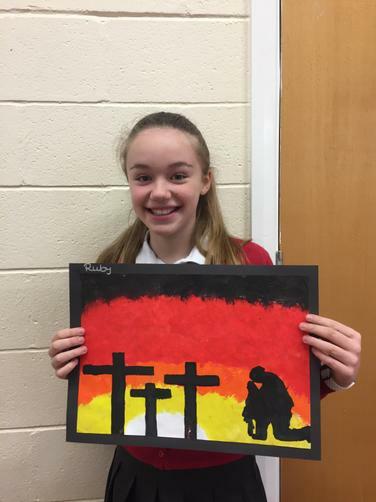 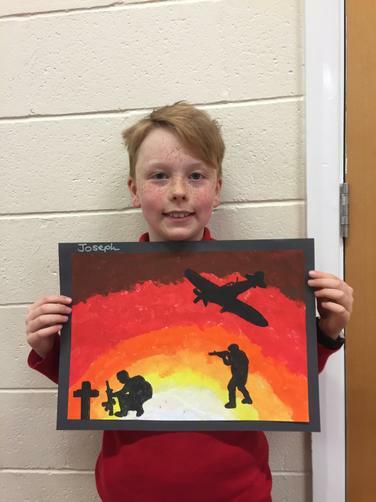 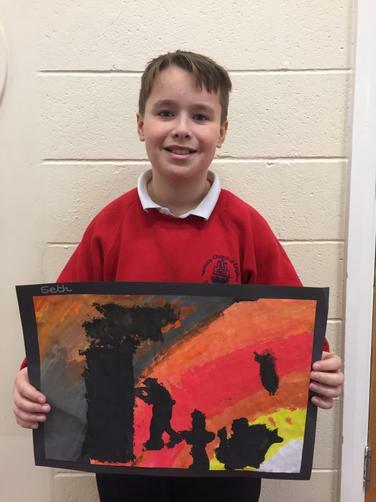 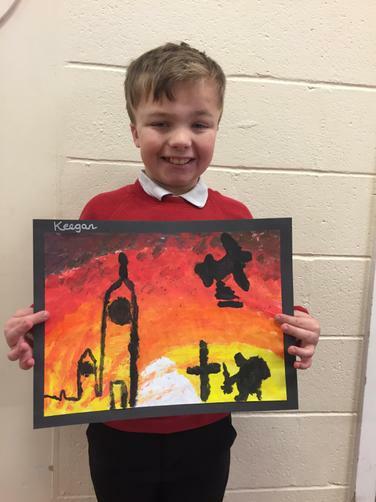 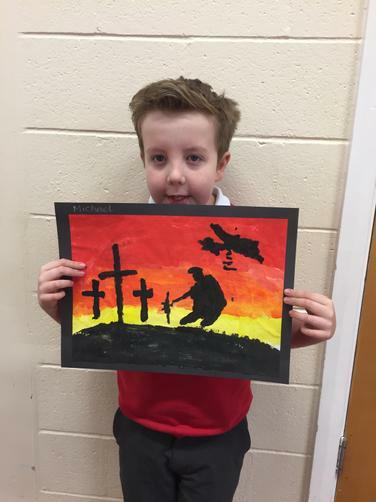 Also, in school we have made a beautiful class piece of artwork as a tribute to those who made the ultimate sacrifice. 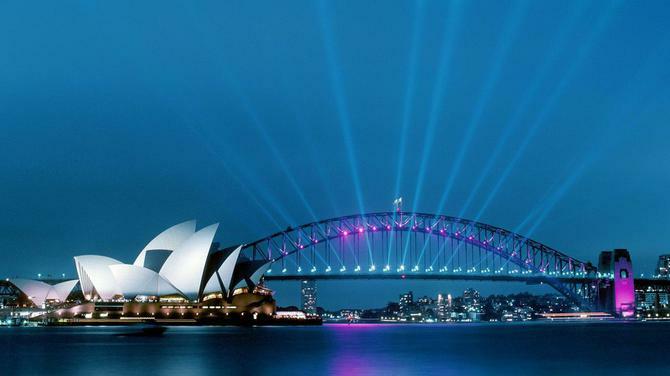 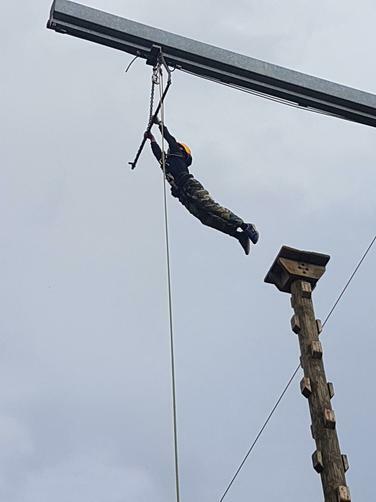 Have a look at the photos below to see more. 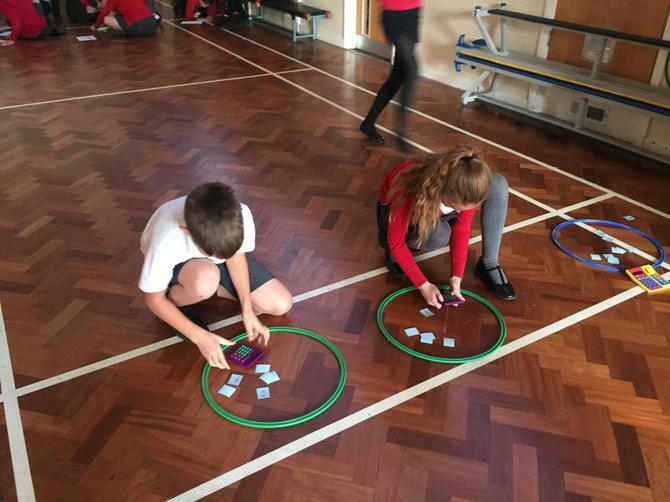 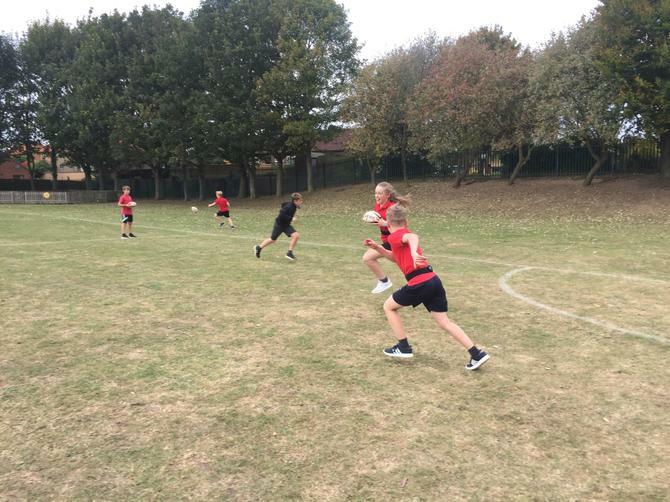 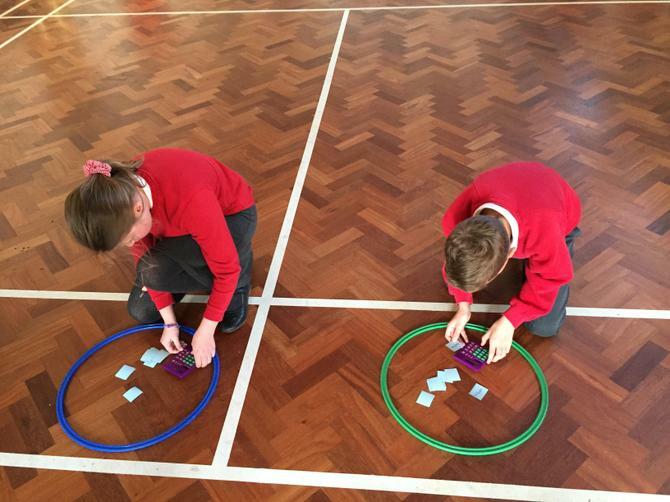 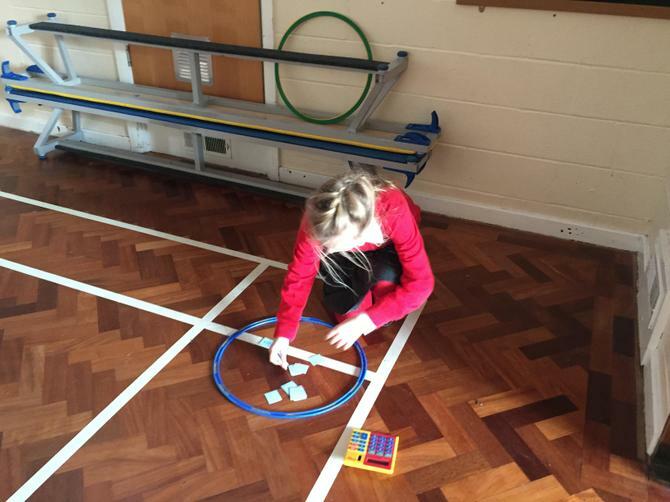 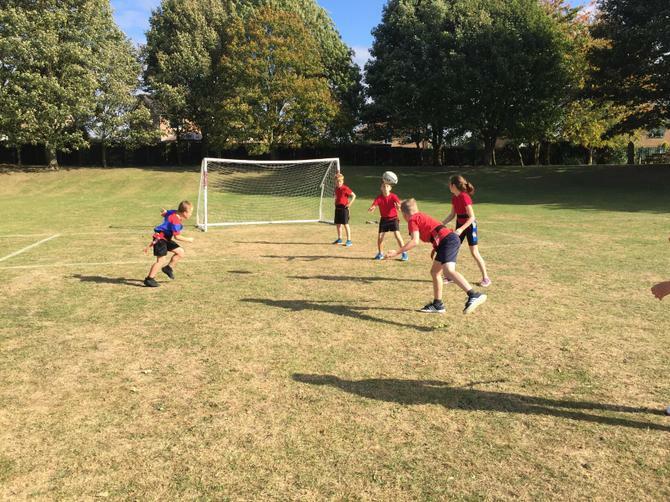 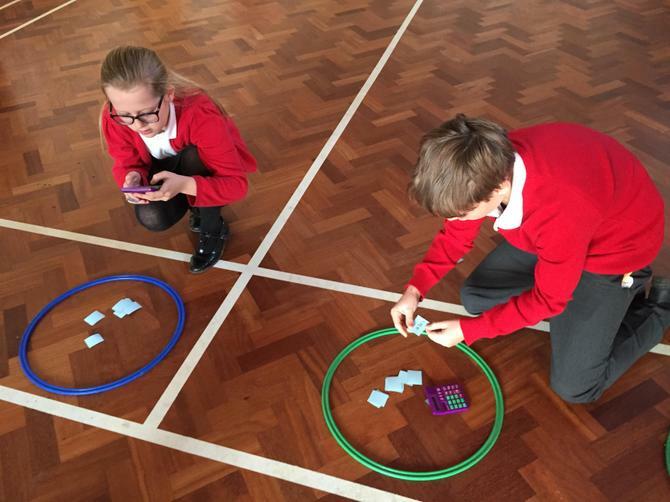 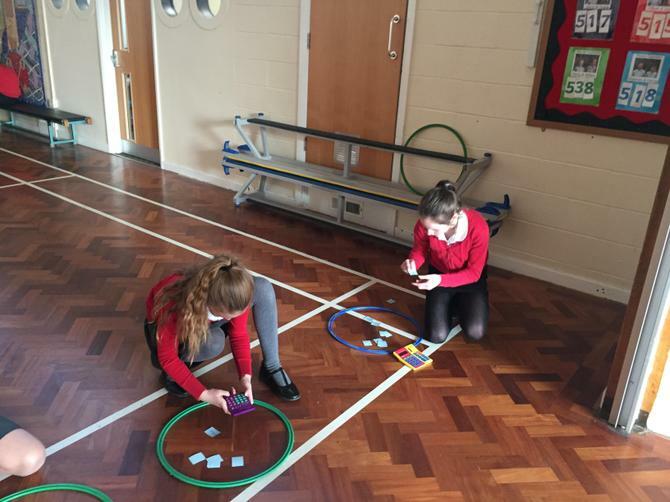 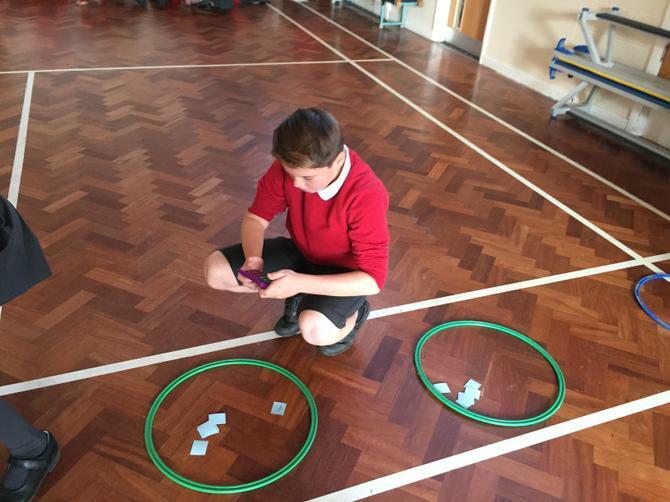 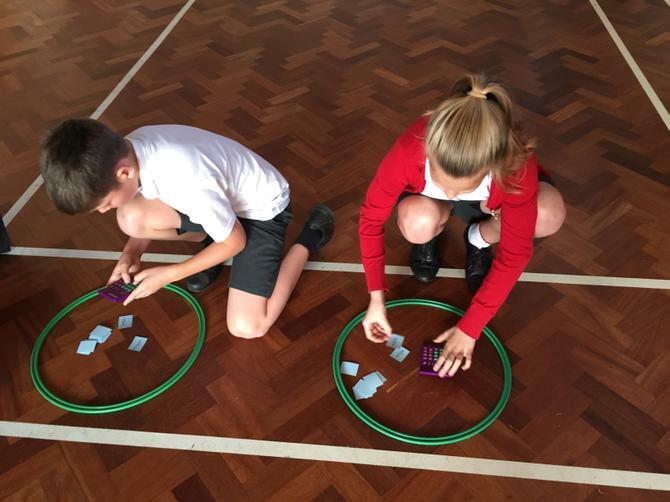 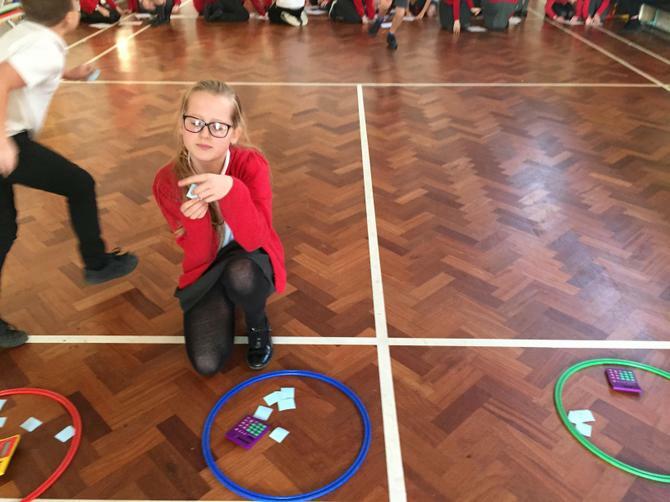 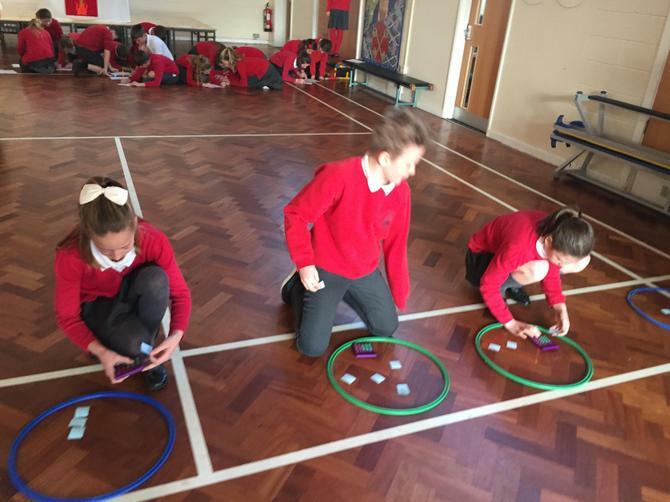 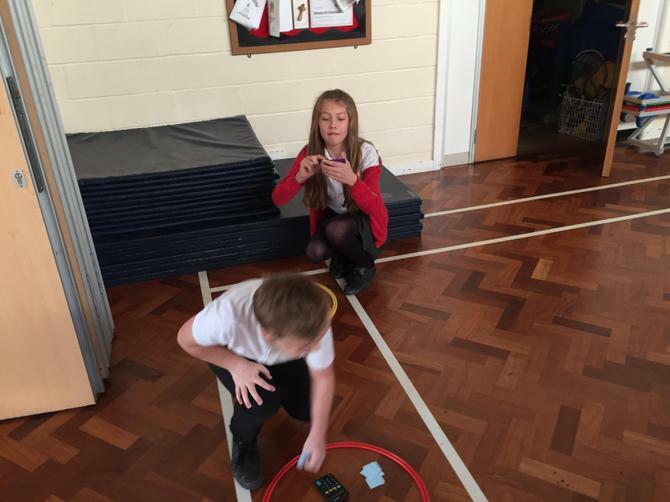 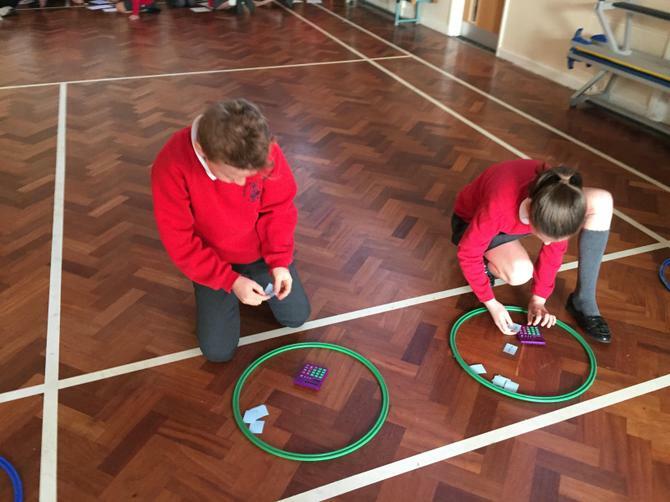 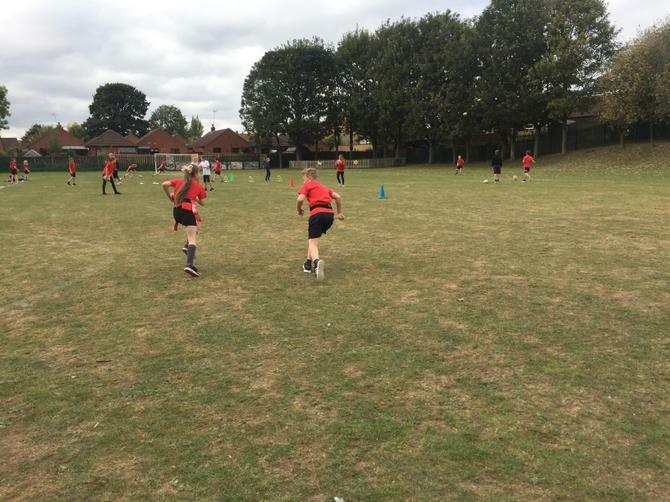 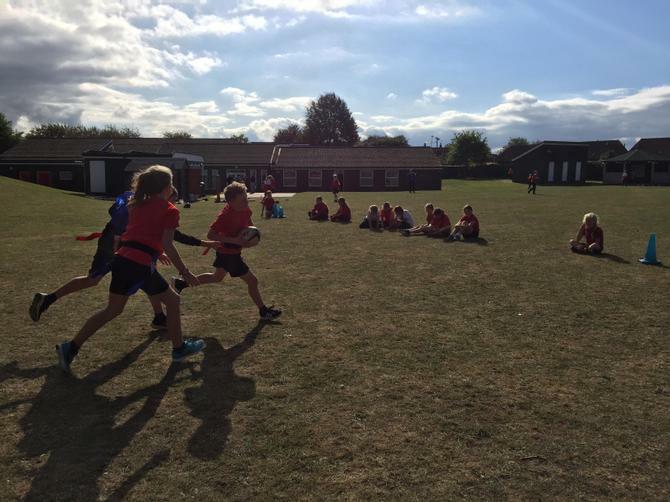 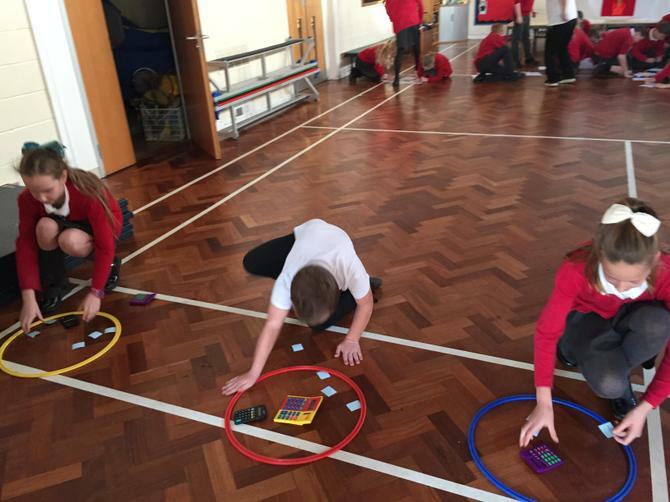 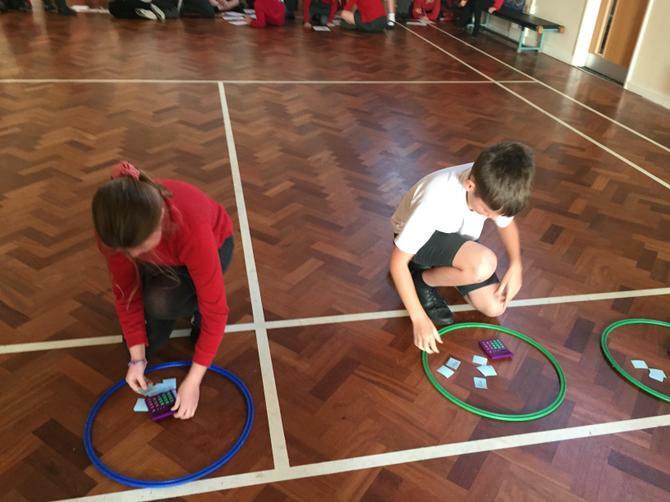 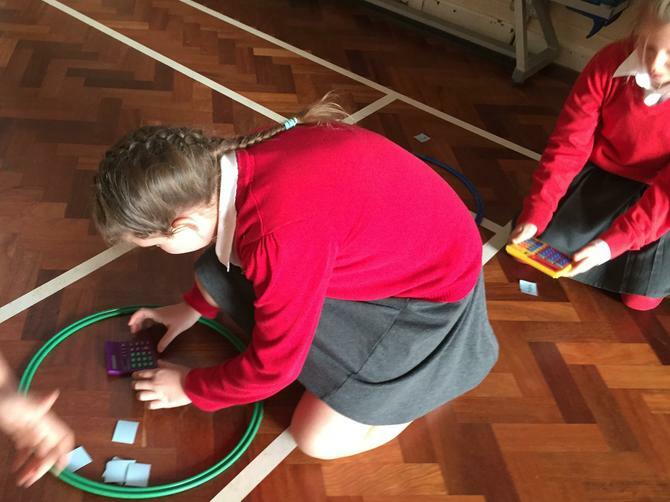 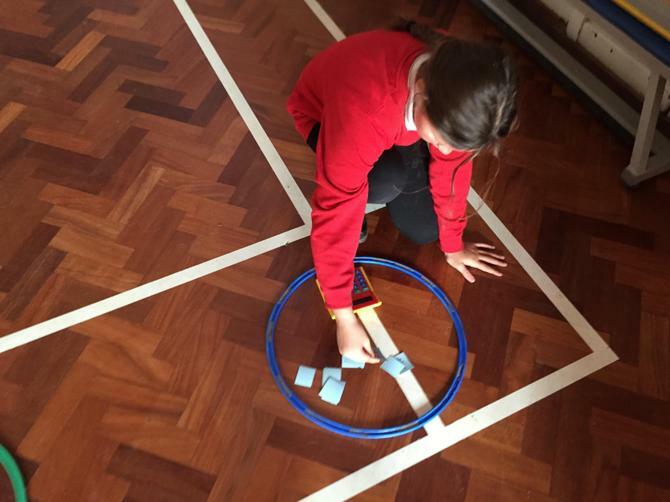 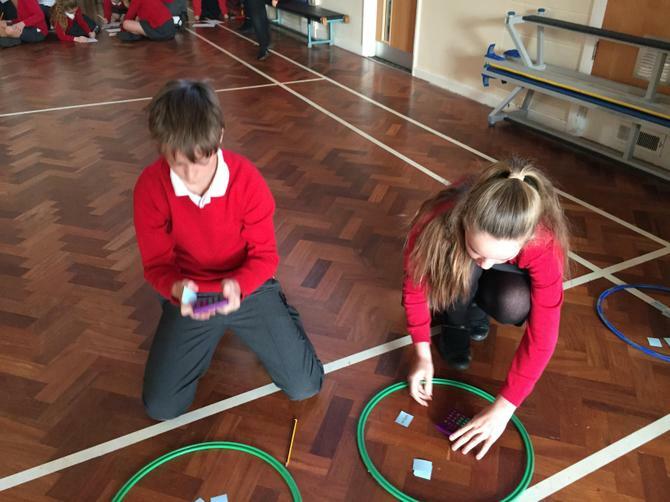 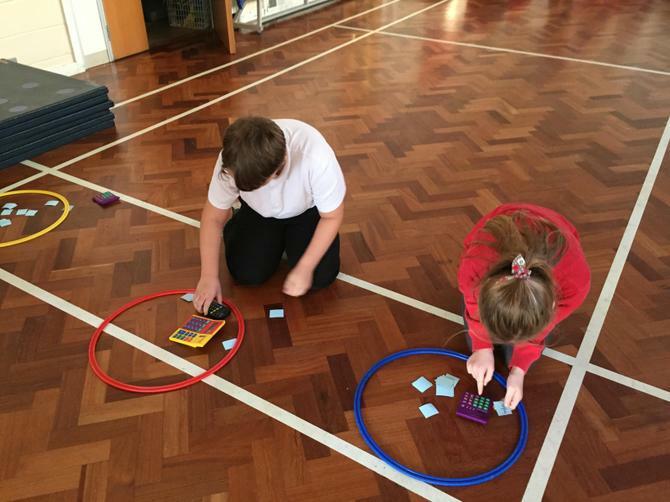 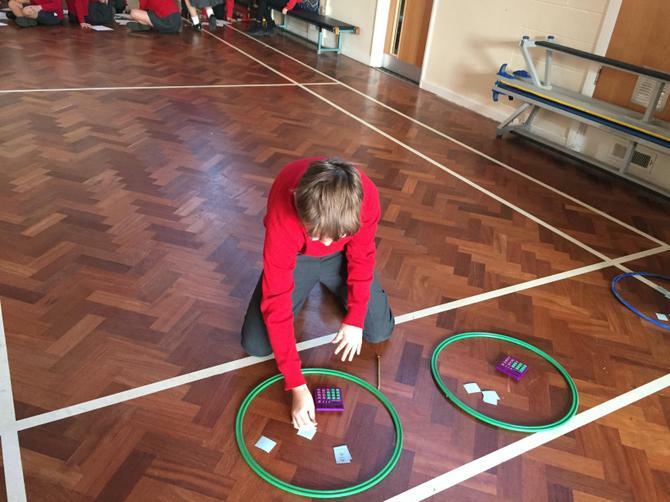 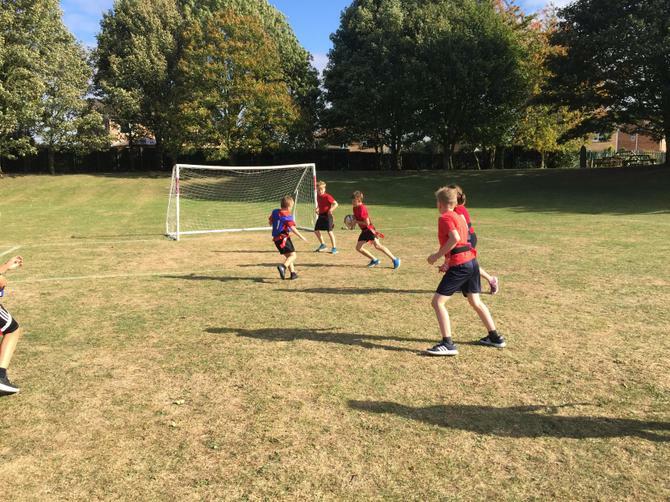 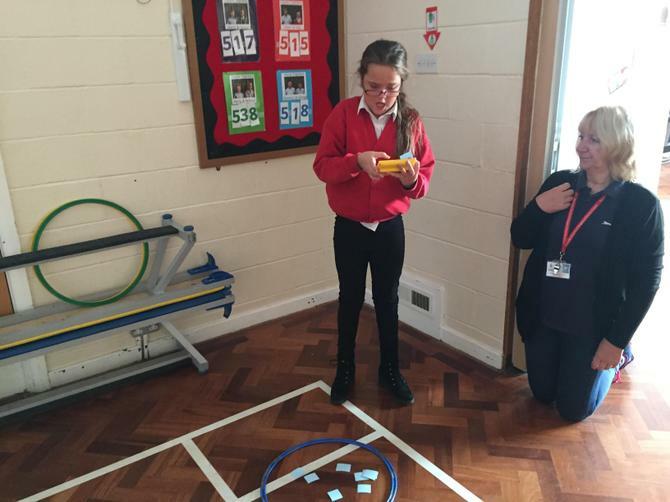 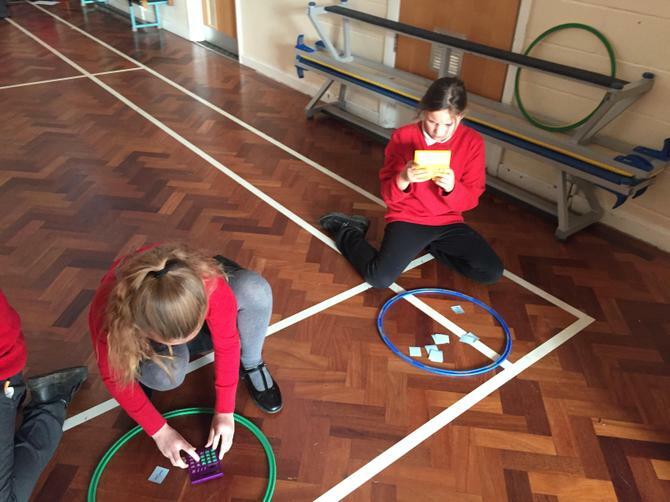 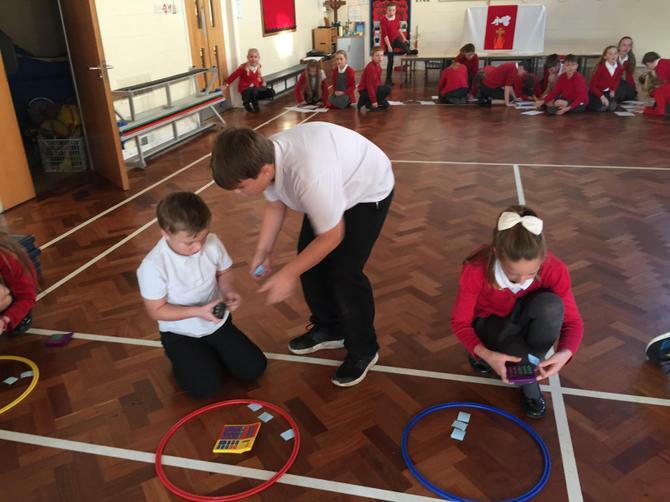 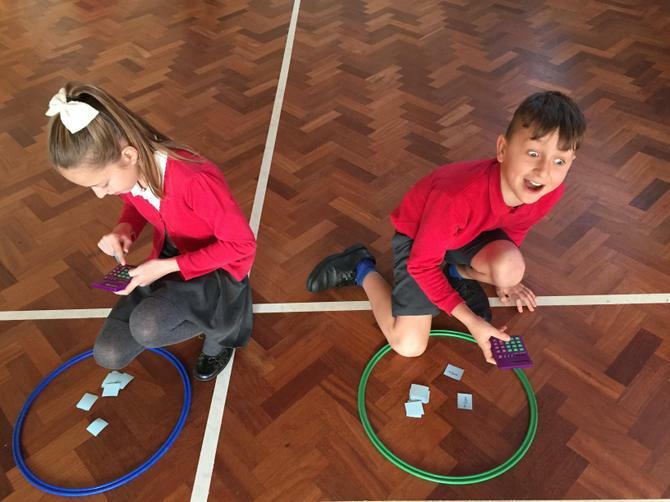 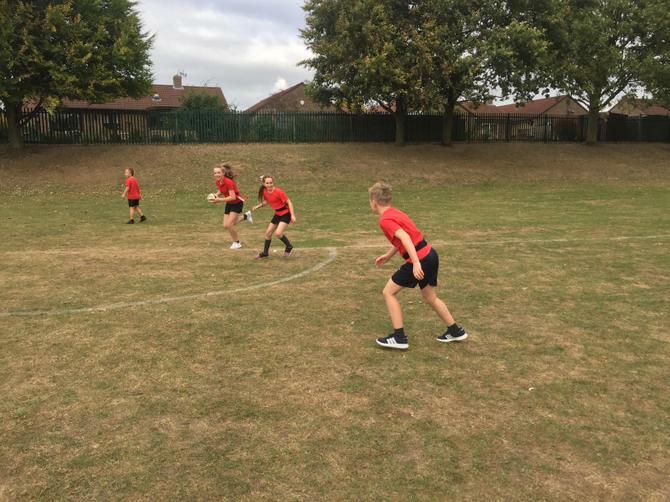 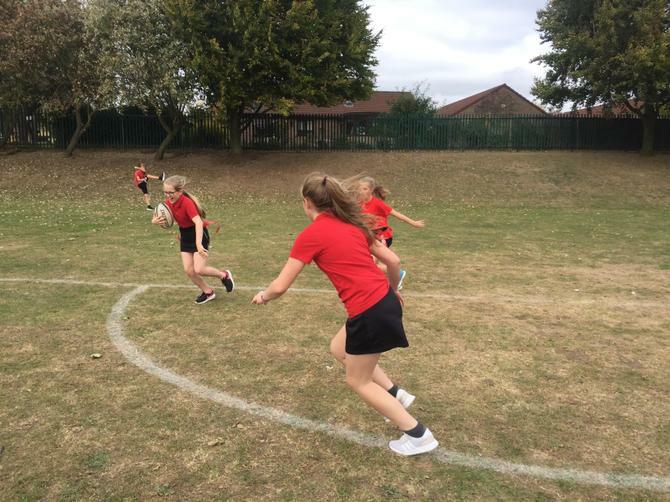 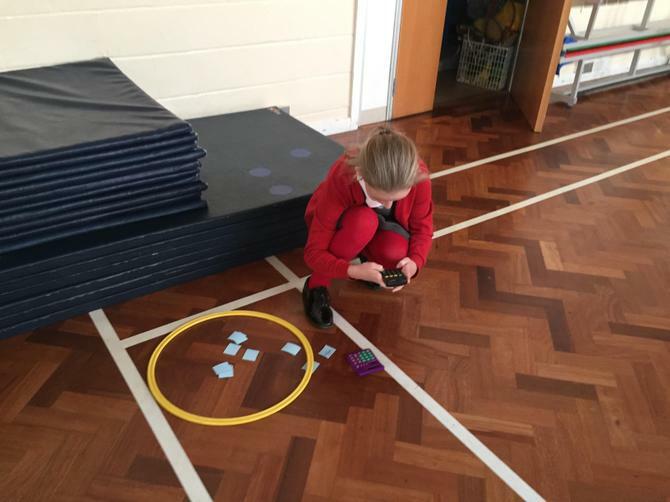 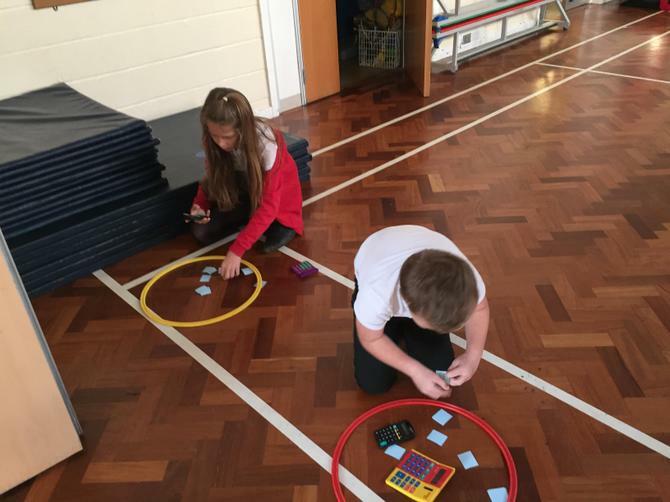 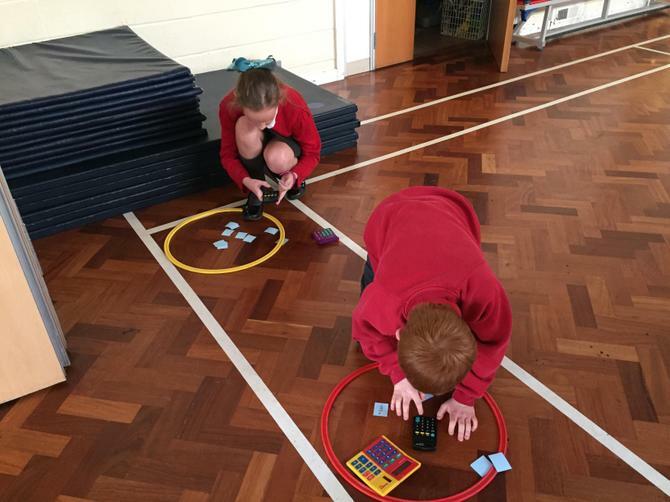 We love to combine PE and maths in Year 6, with a bit of healthy competition too! 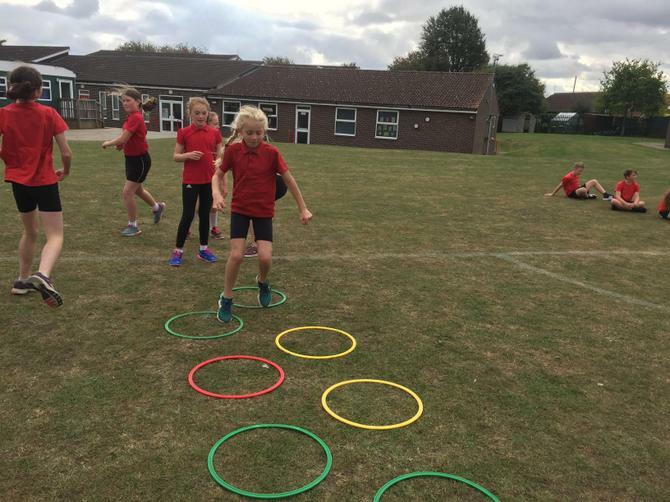 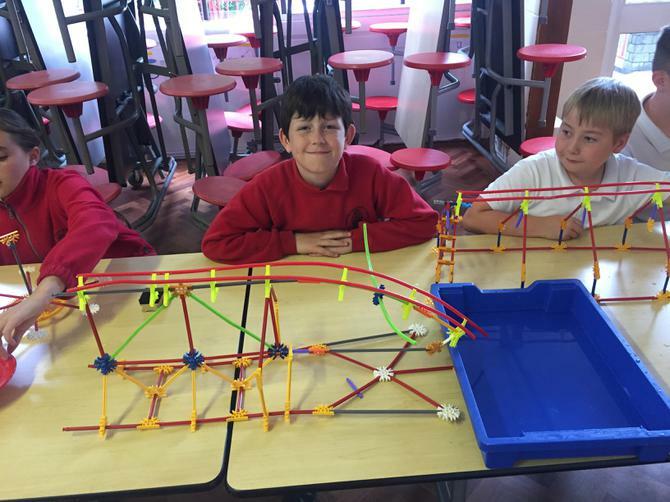 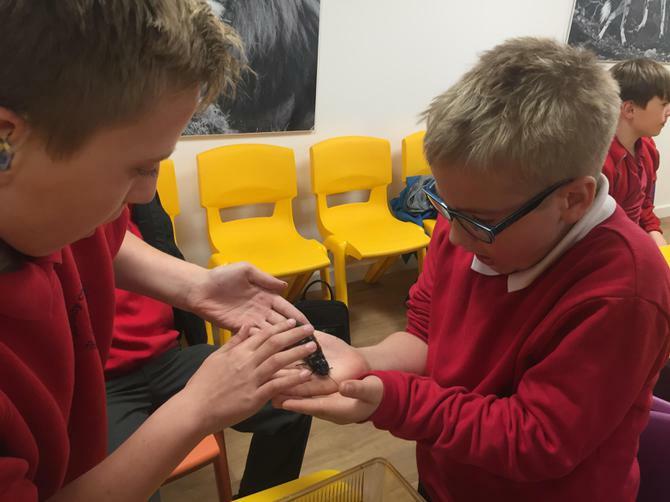 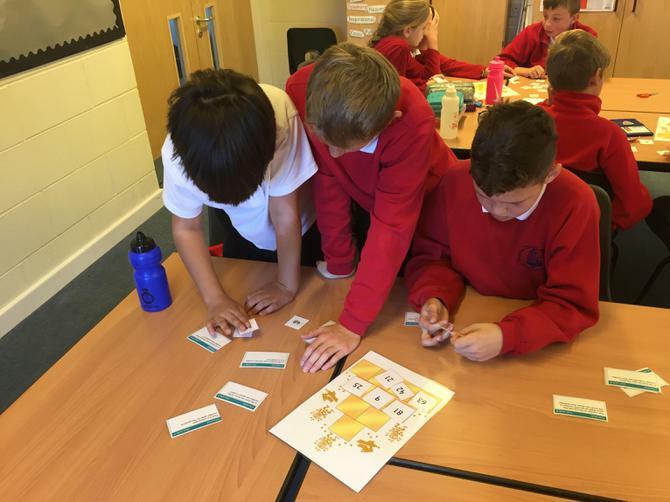 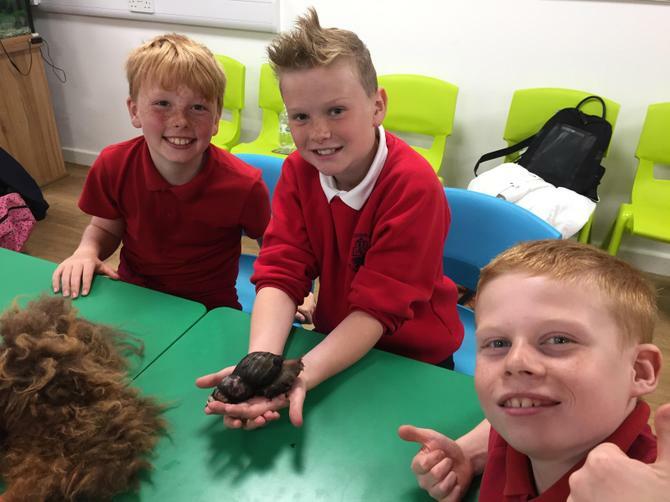 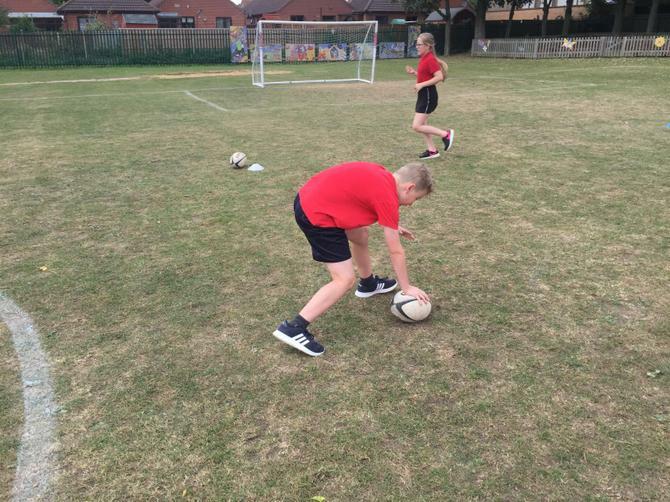 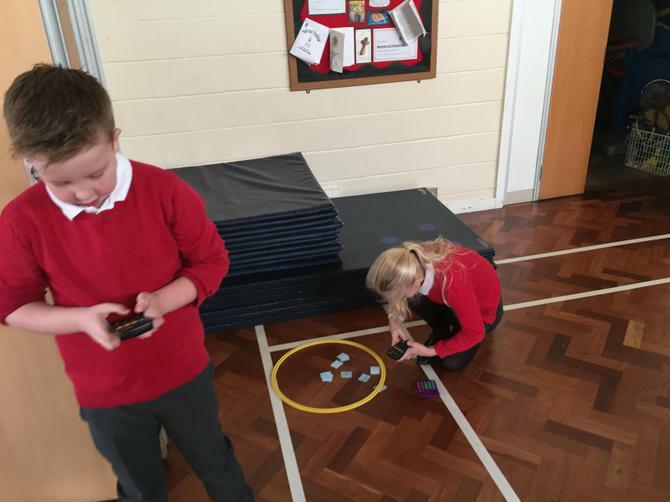 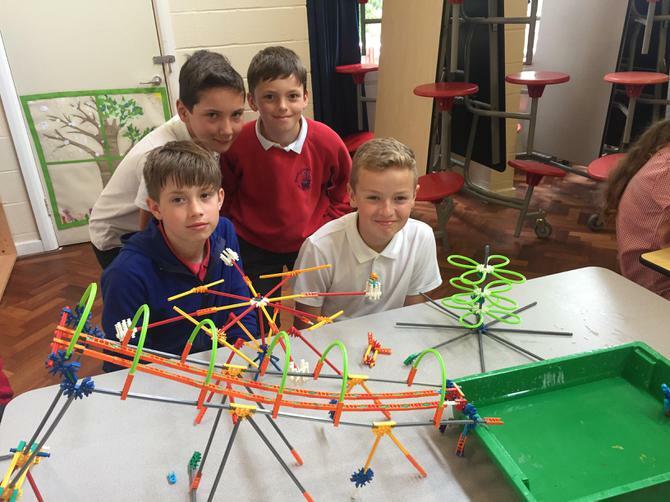 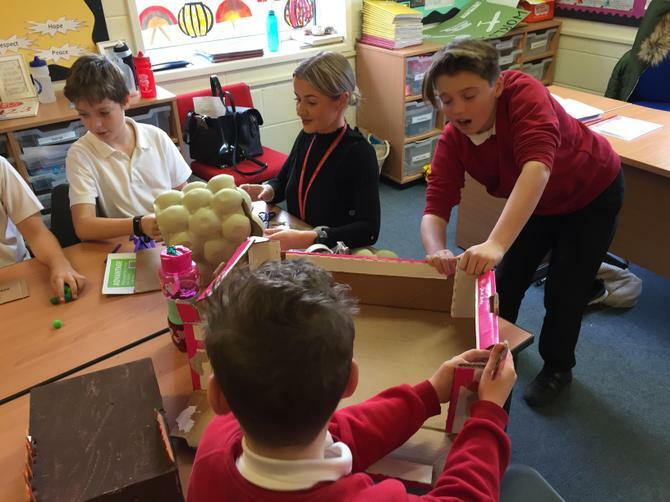 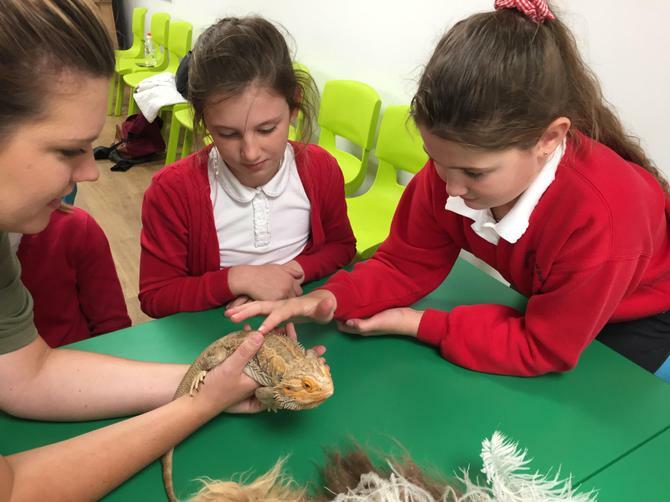 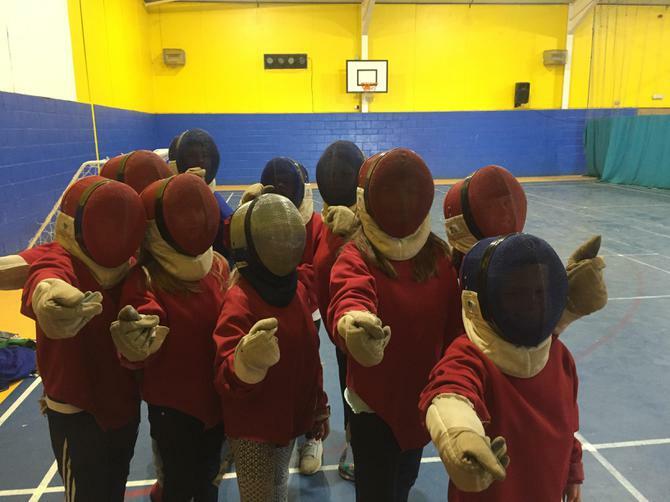 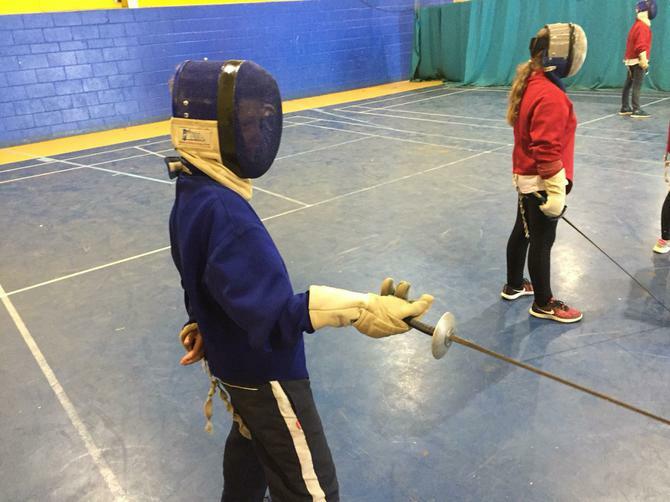 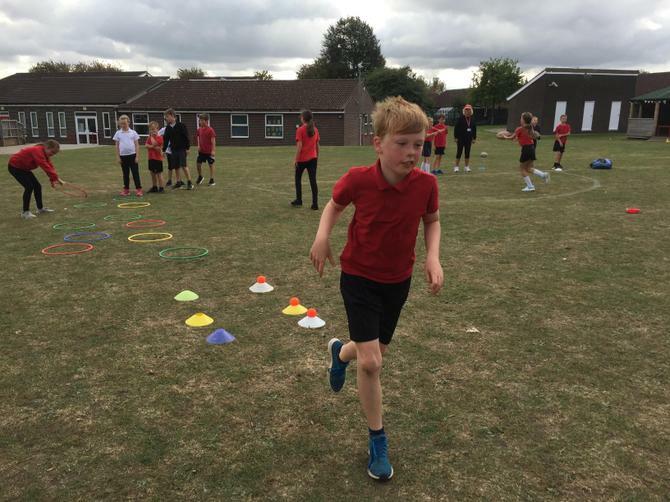 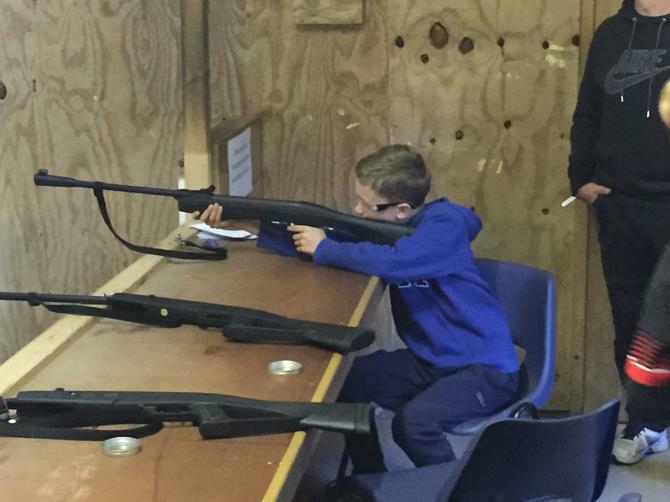 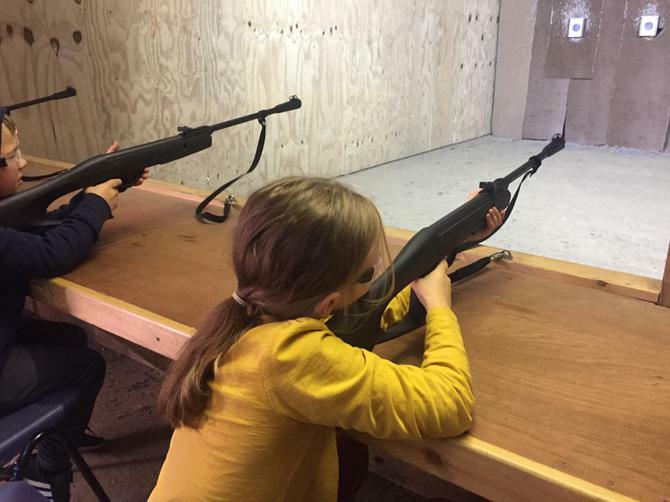 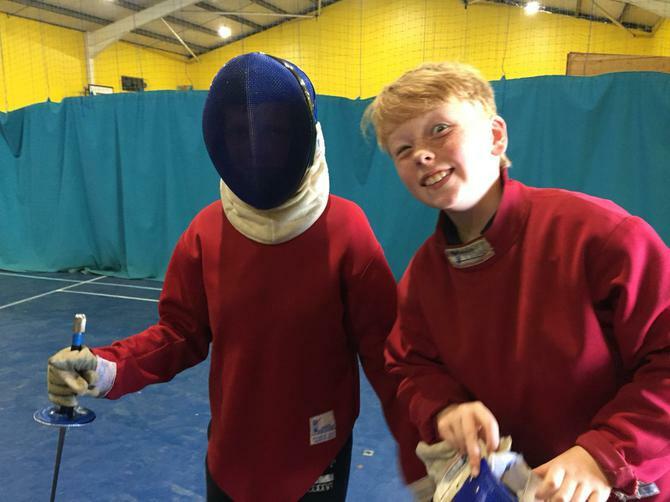 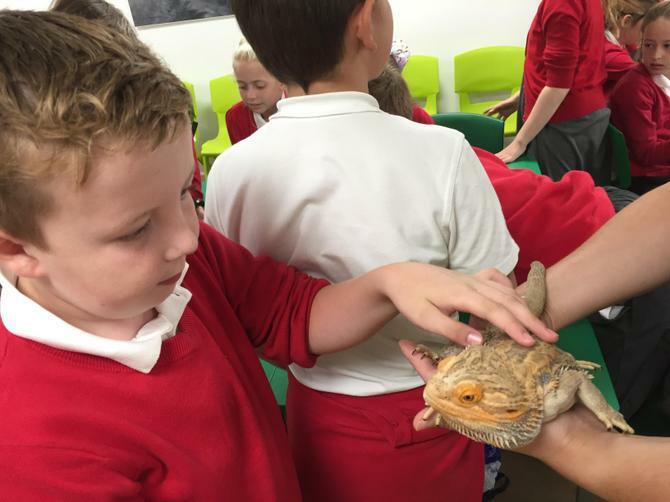 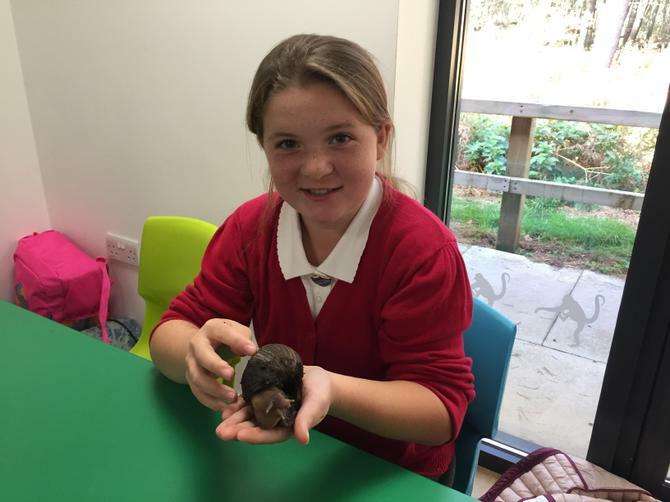 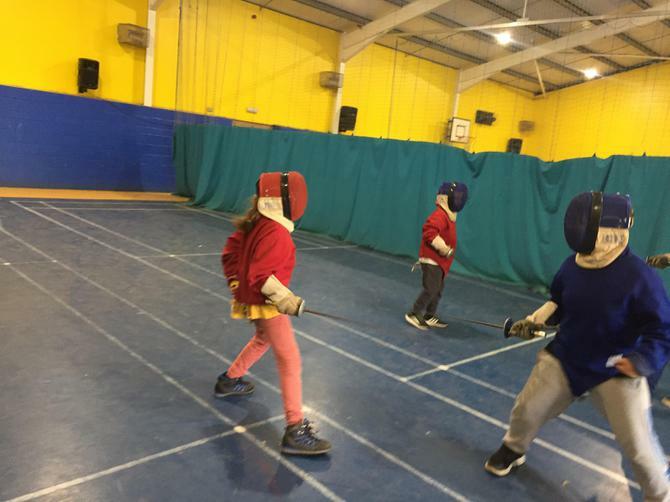 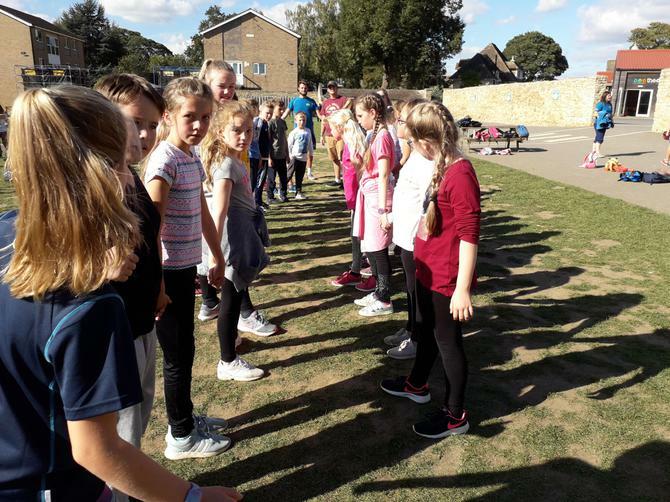 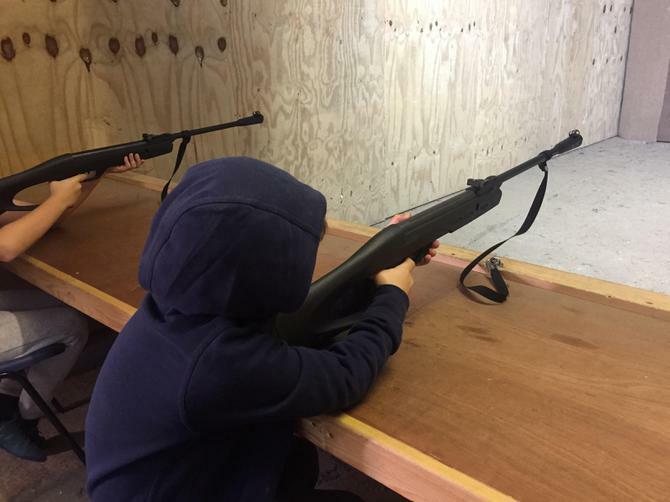 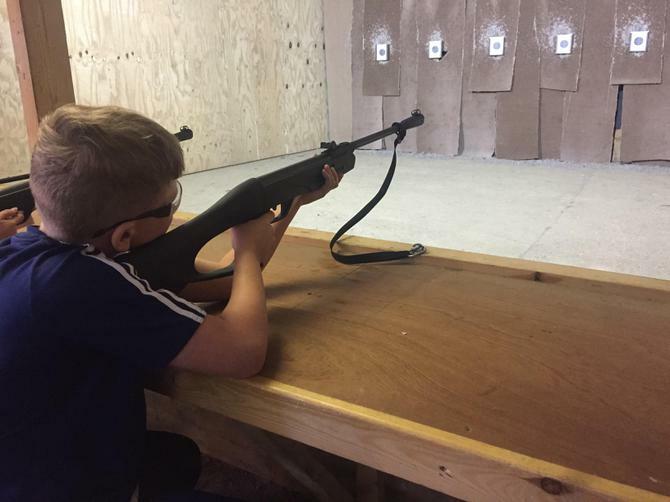 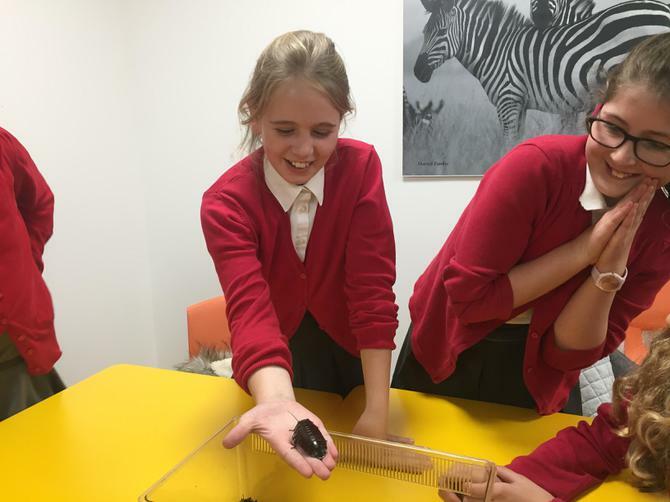 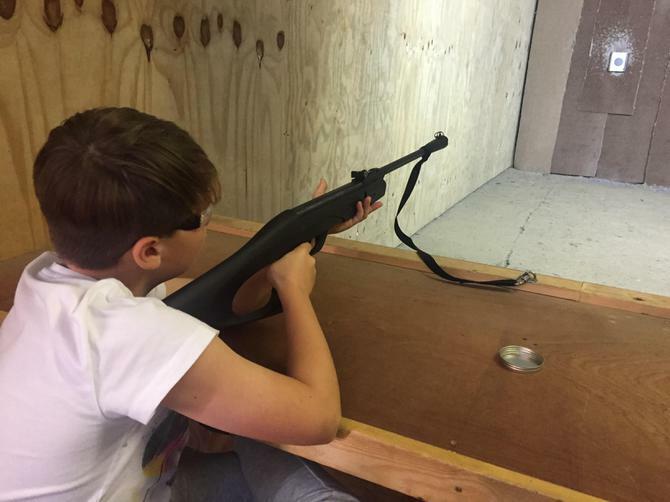 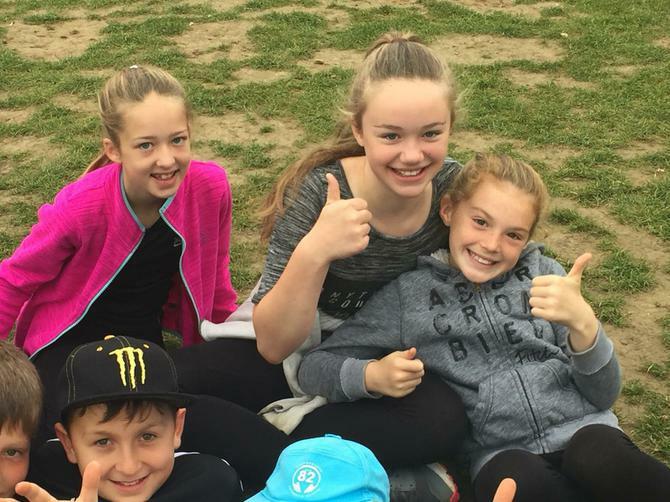 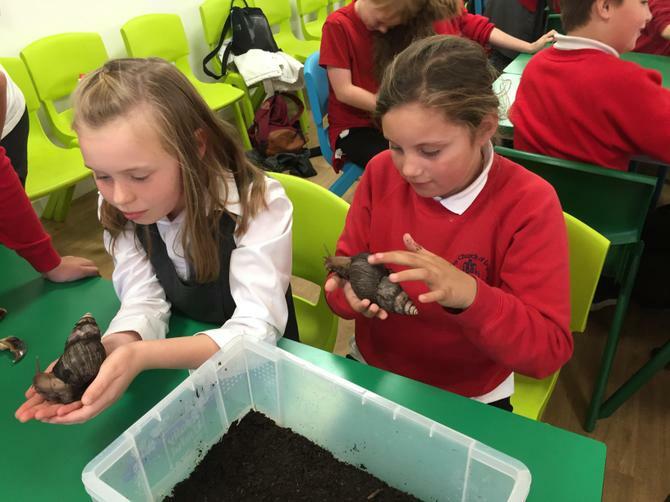 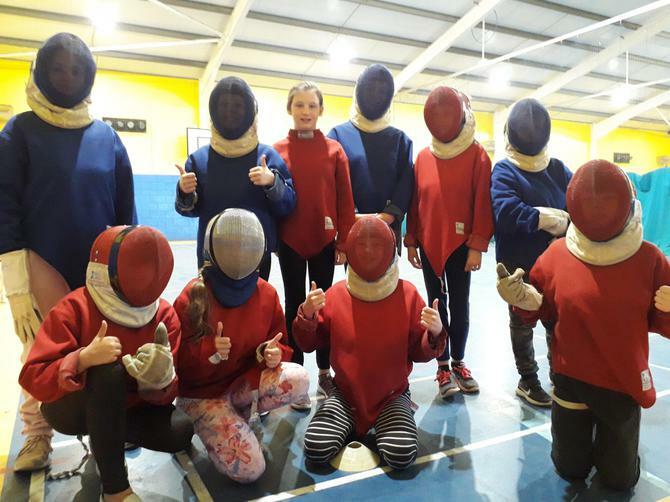 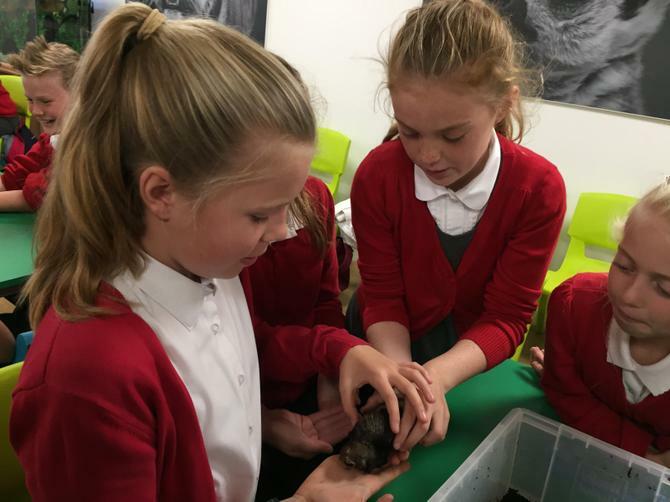 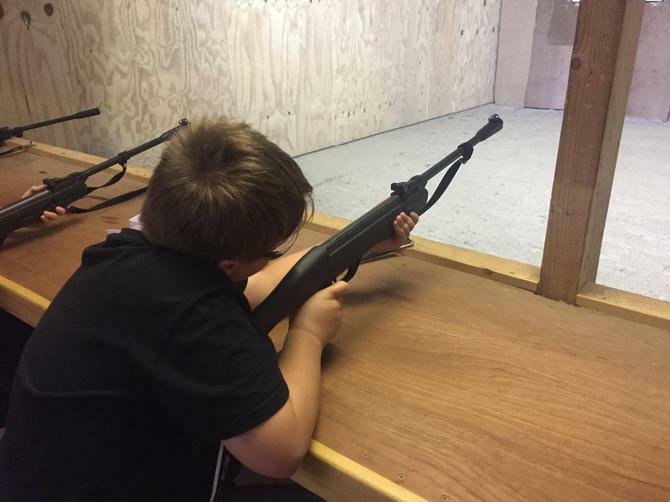 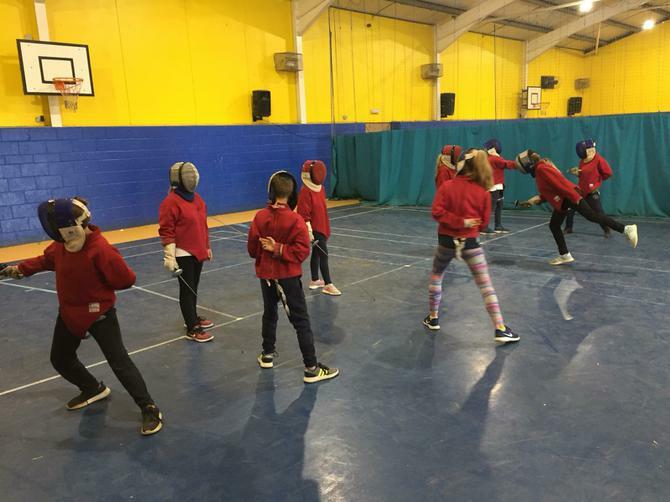 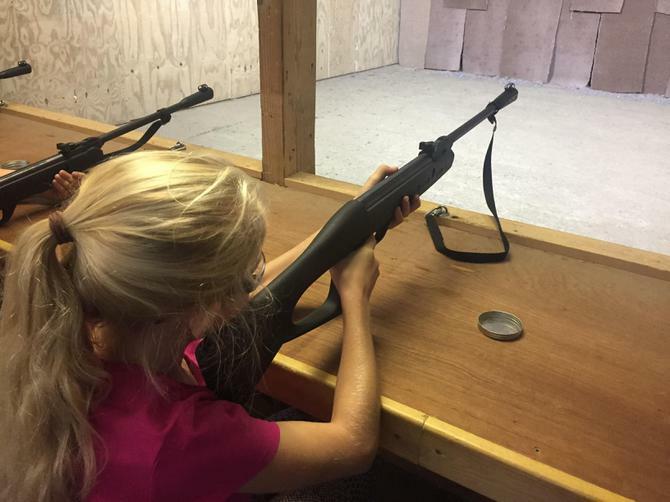 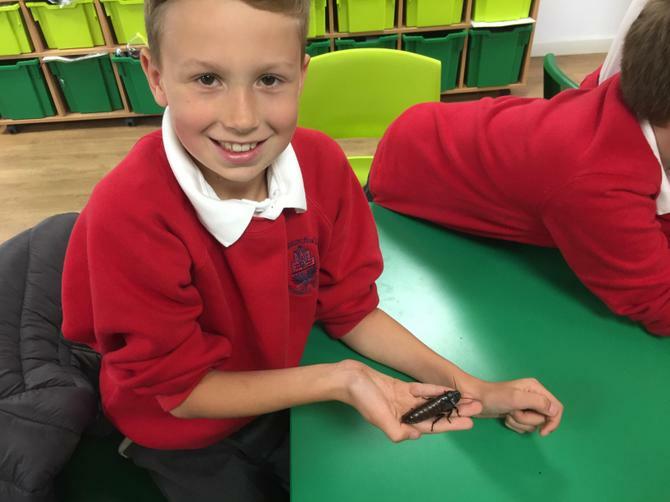 Have a look at some of these photos from our most recent active lessons. 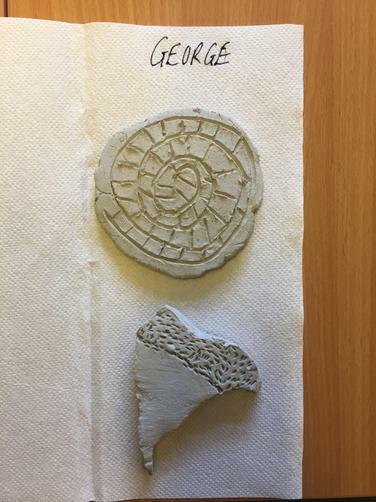 The day has finally come! 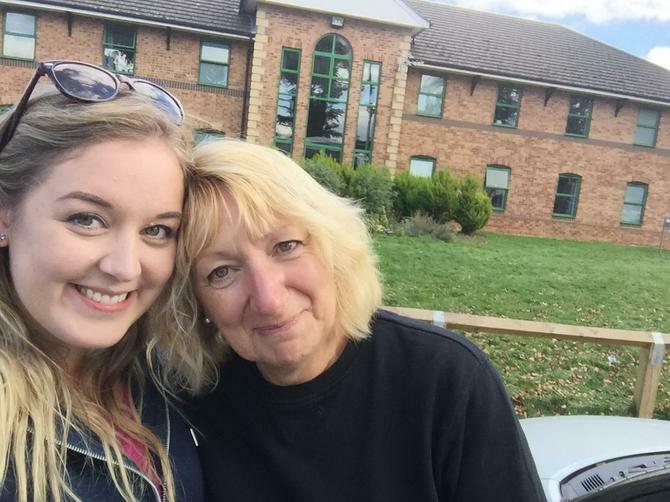 After arriving at 3.30pm, we said goodbye to our parents and headed off for a week of adventure! 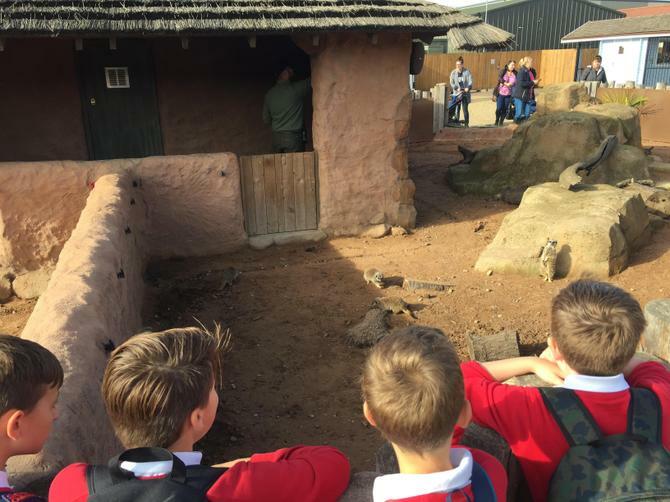 Firstly, we were shown to our rooms where we had a quick few minutes to unpack before being led on a site tour by our groupie for the week, Matty. 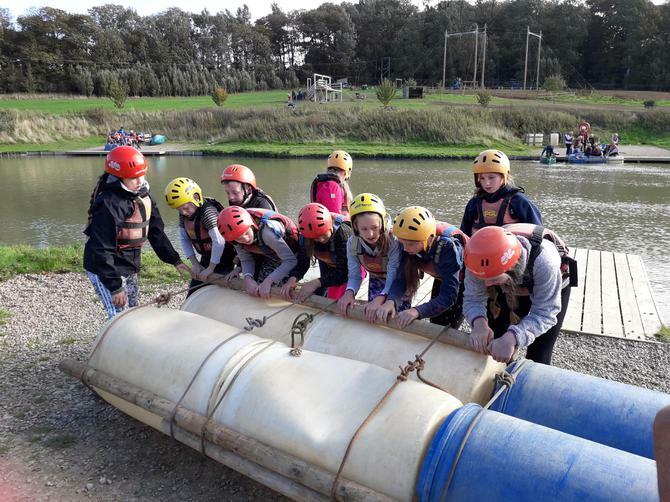 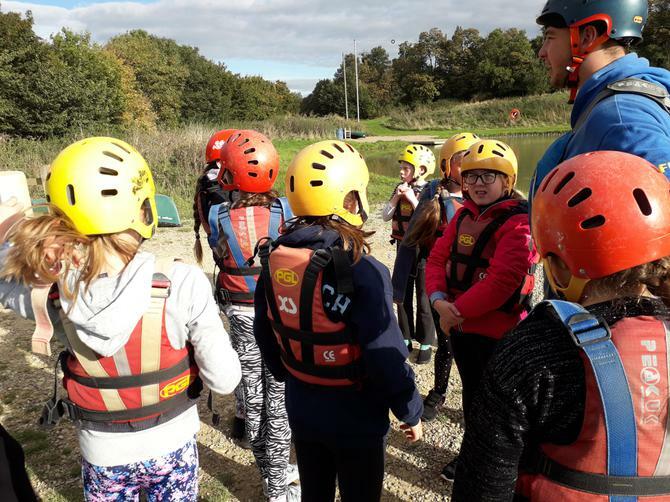 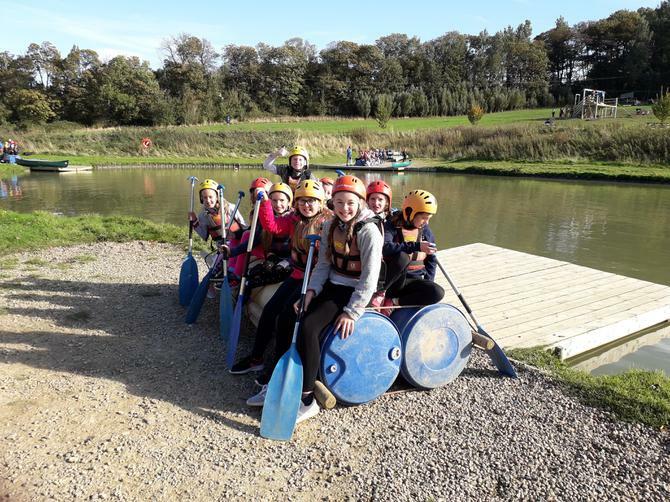 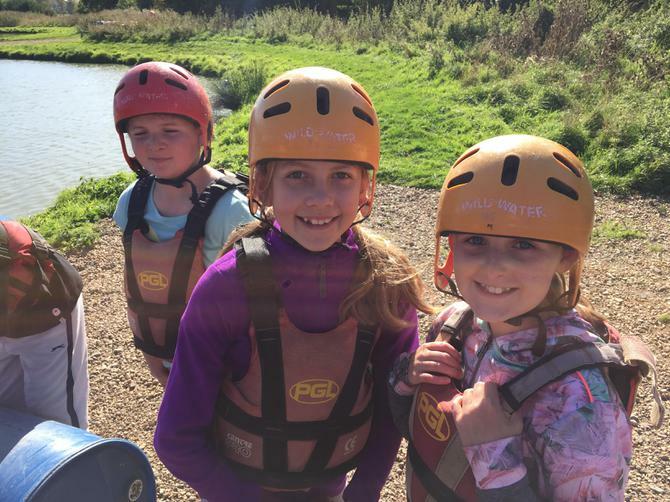 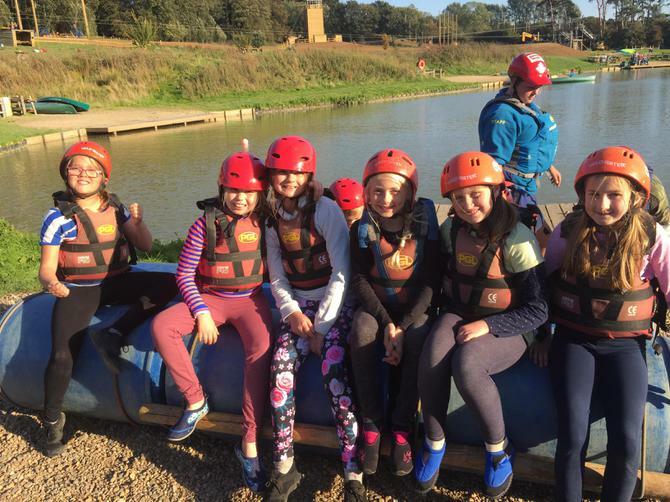 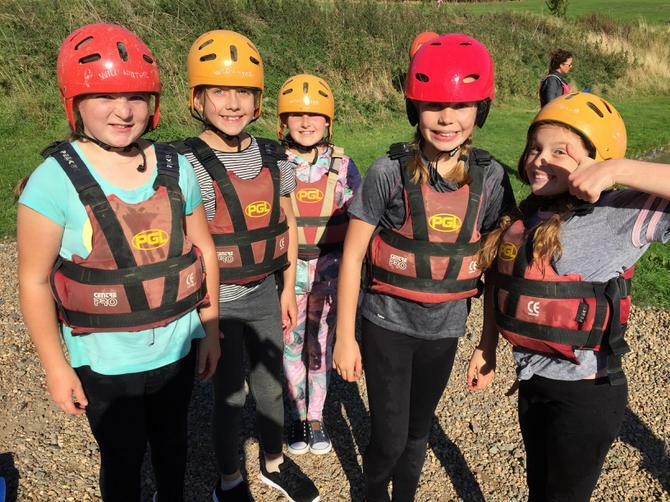 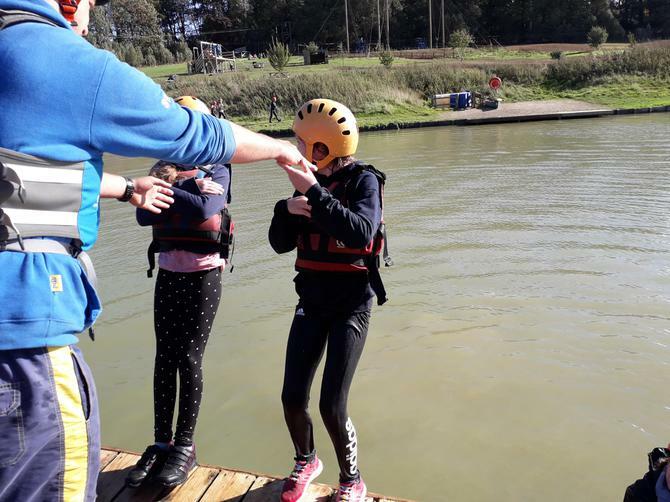 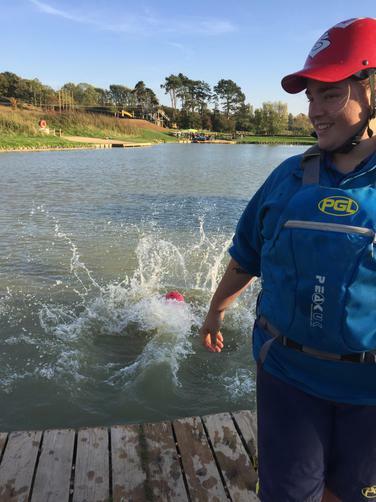 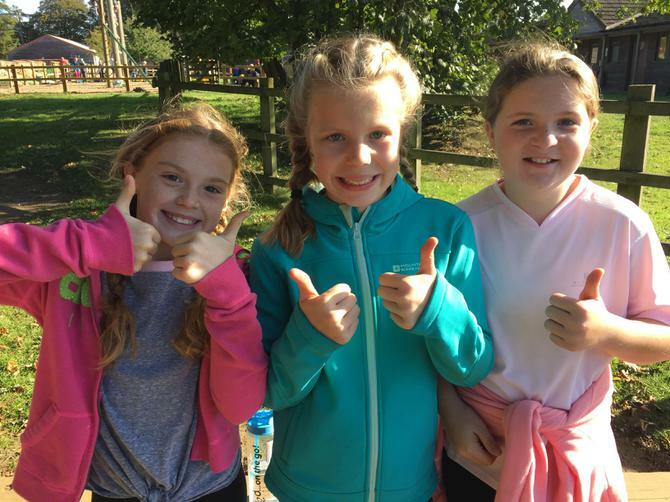 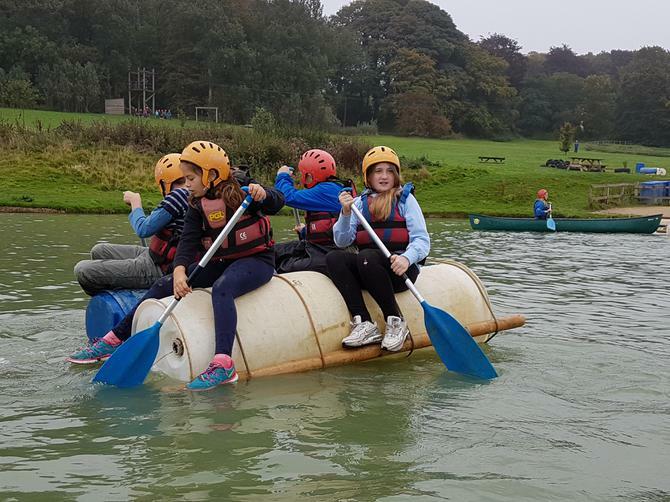 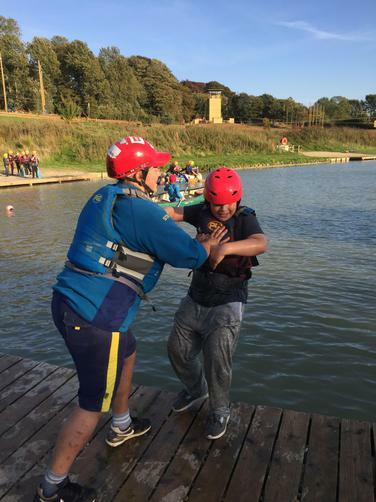 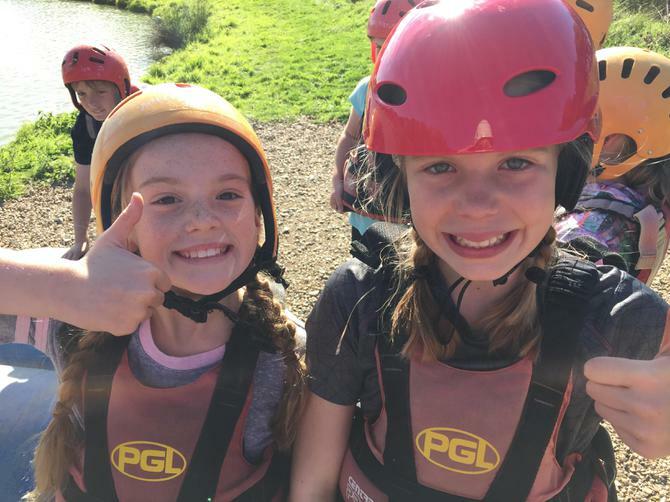 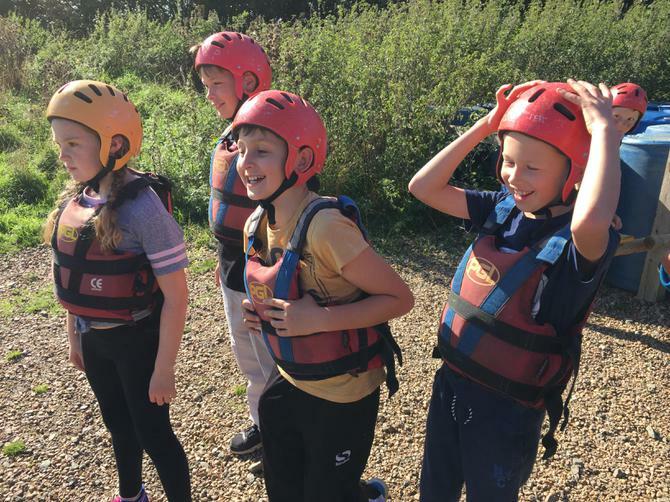 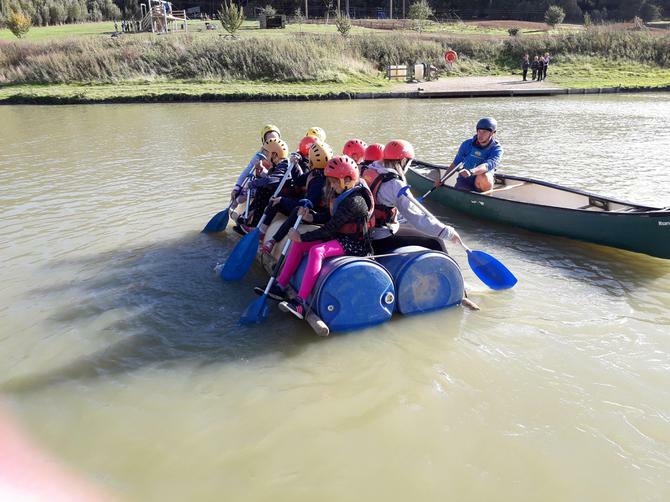 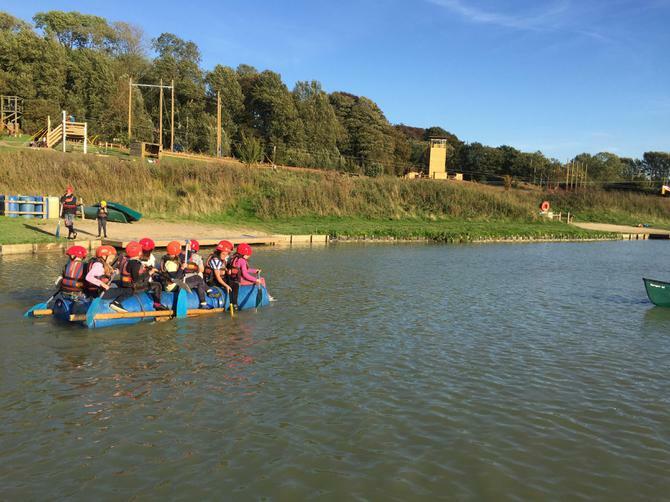 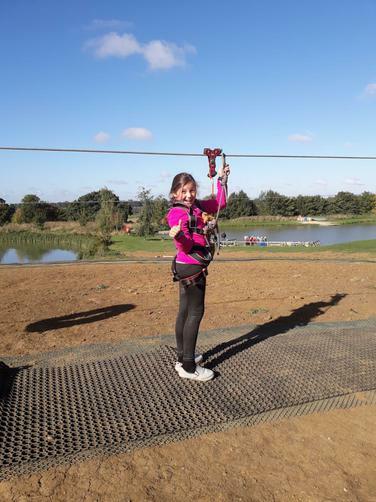 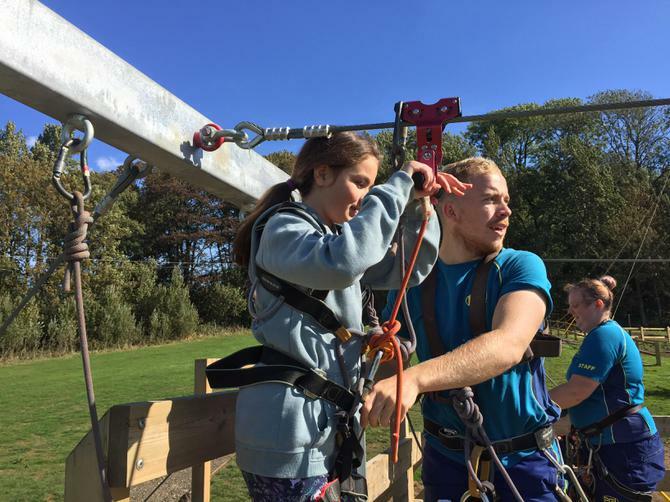 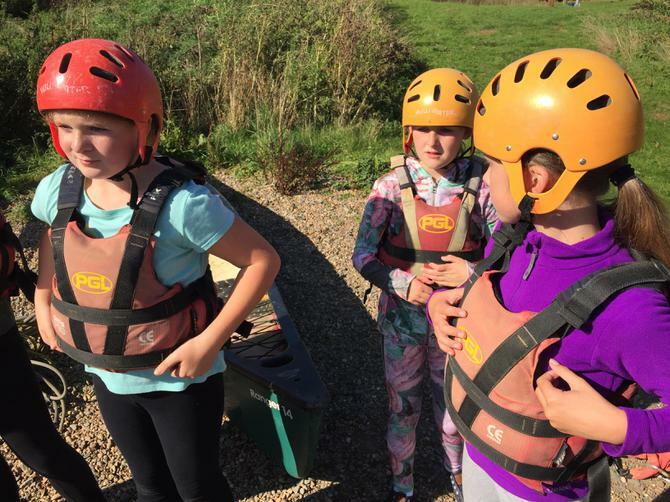 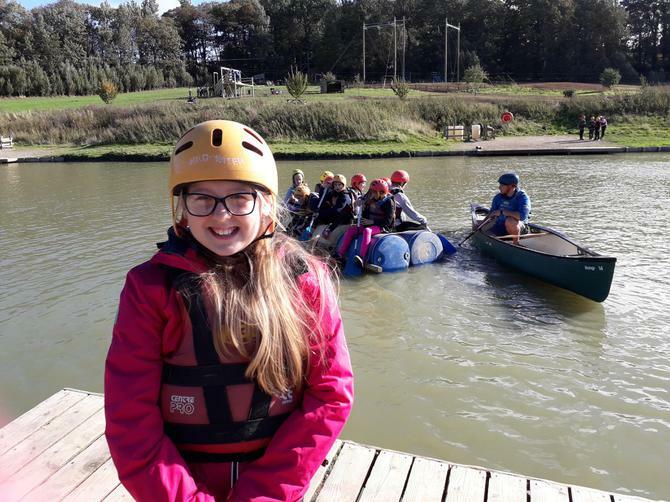 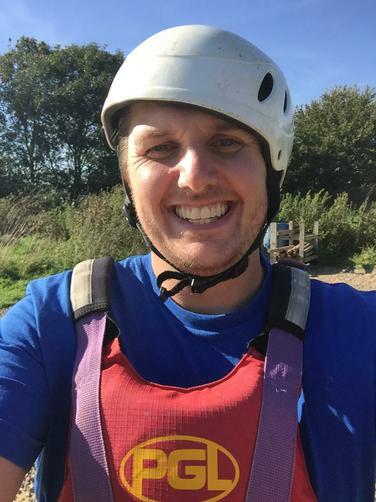 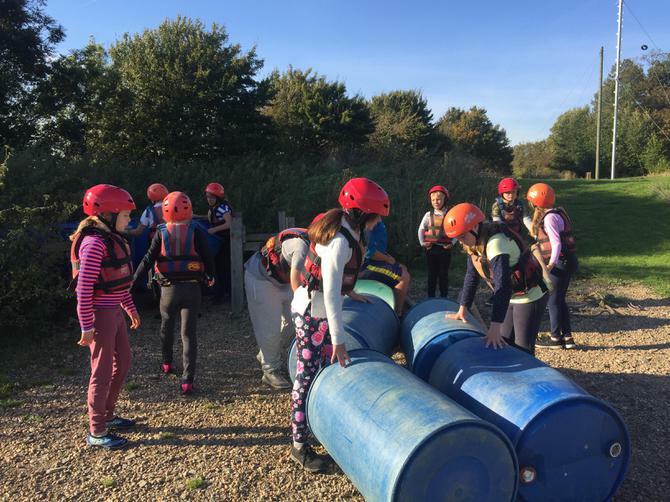 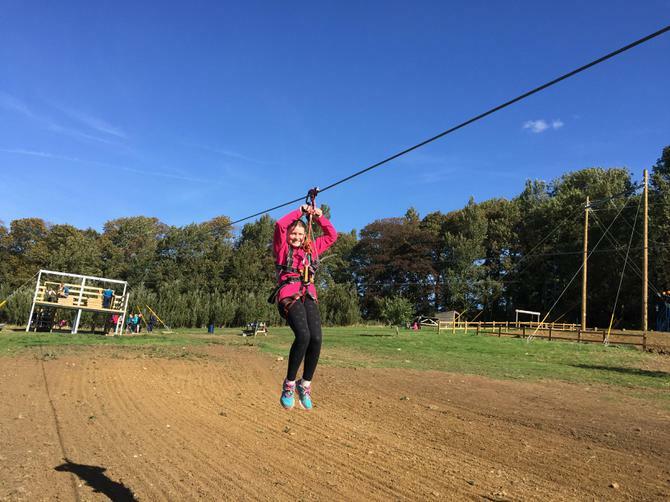 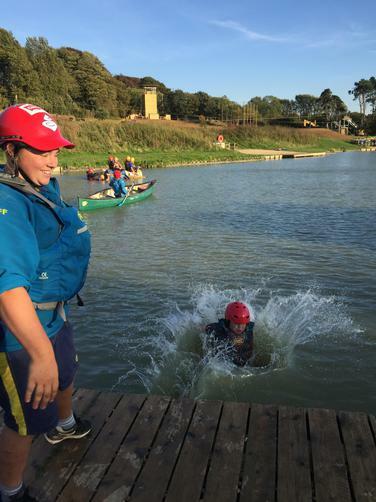 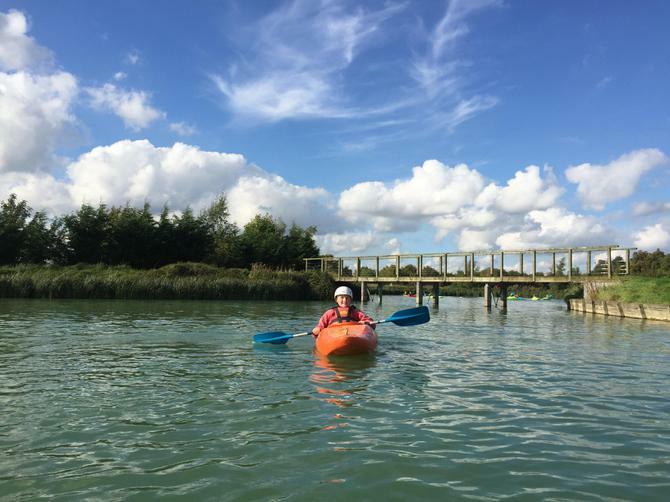 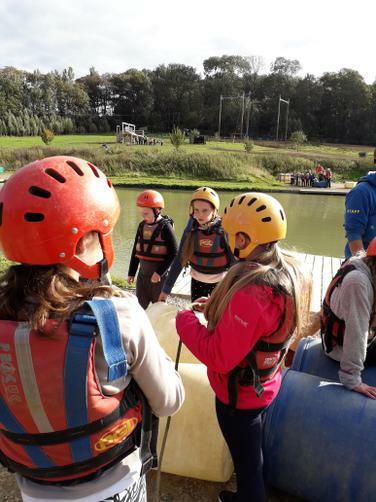 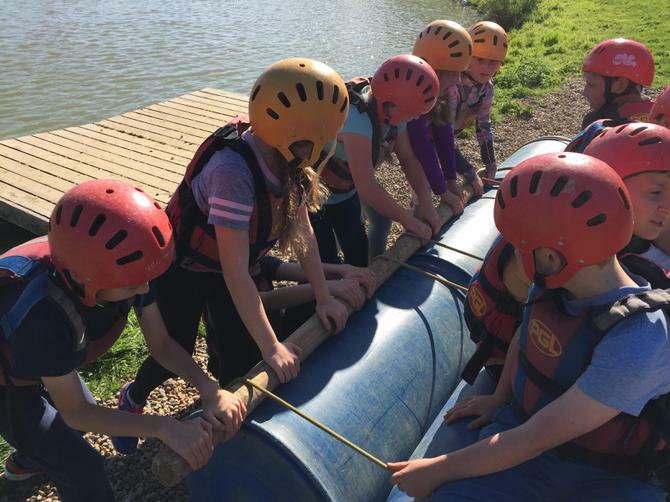 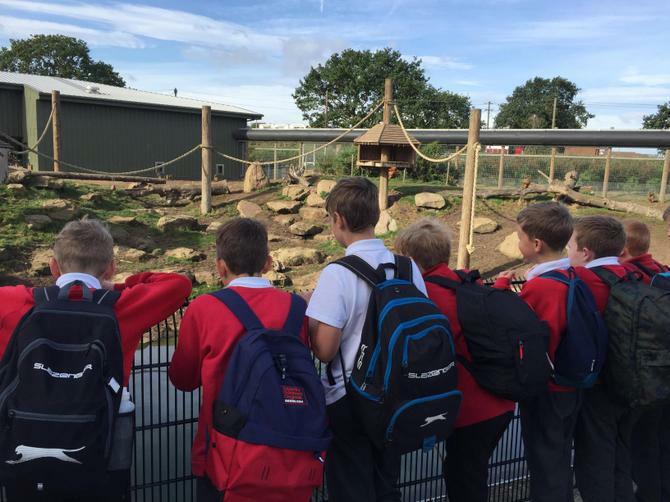 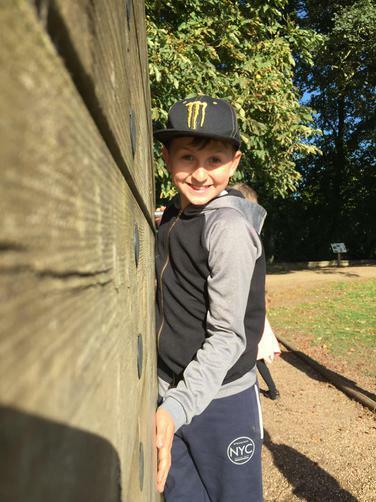 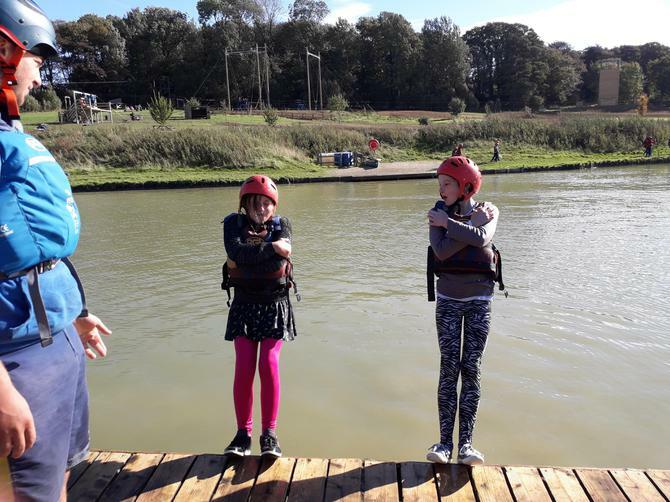 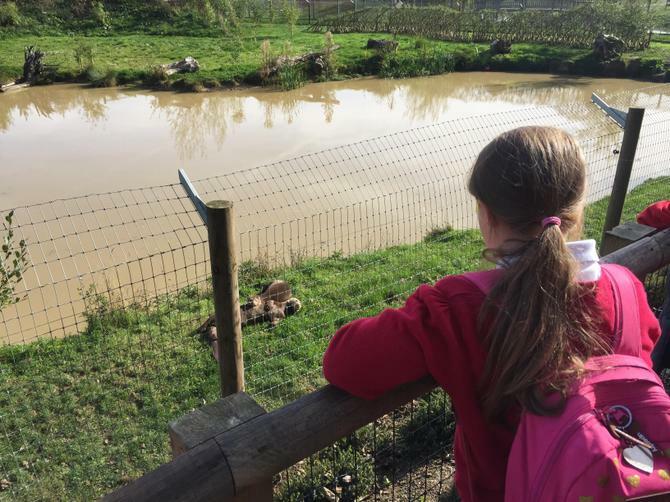 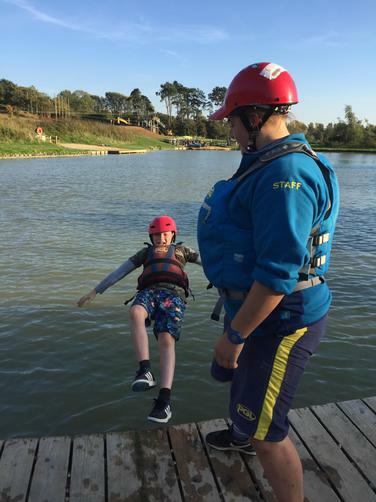 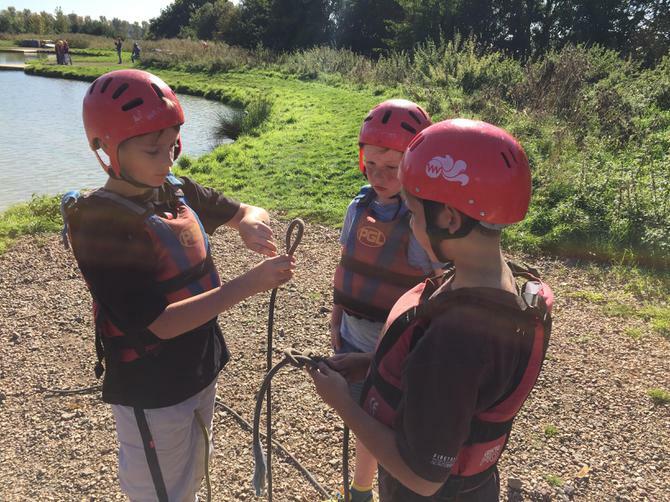 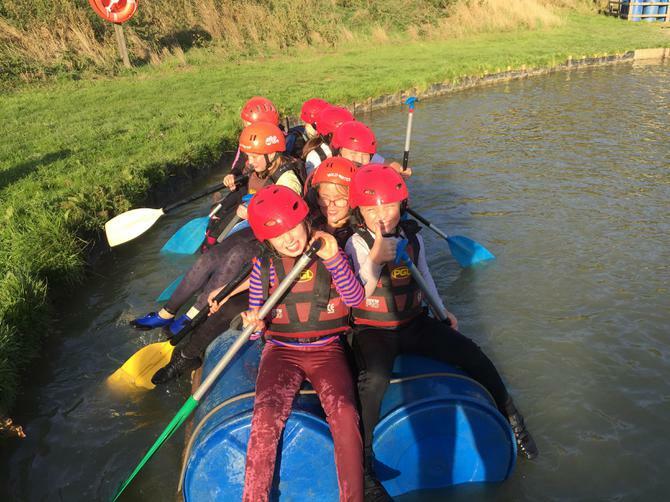 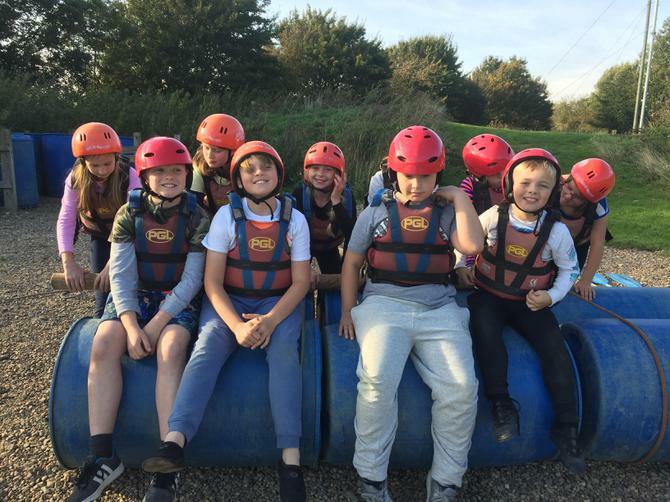 We were excited to see some of the activities we’d be taking on first-hand, such as the giant swing, trapeze and the lake where we will be building rafts (and taking a swim no doubt)! 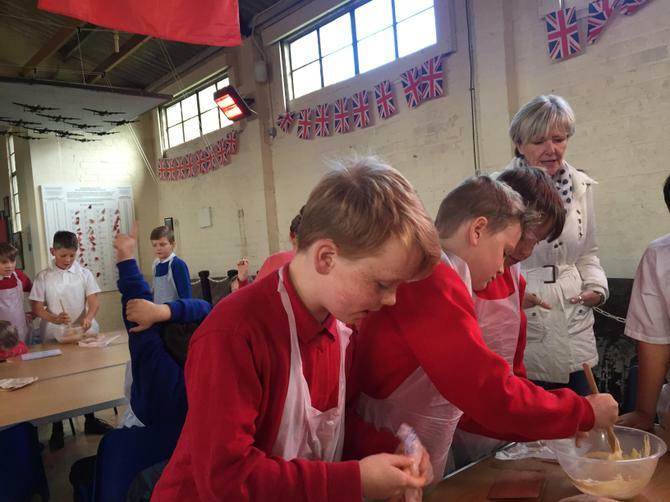 After playing some games together, we headed for tea in the dining hall. 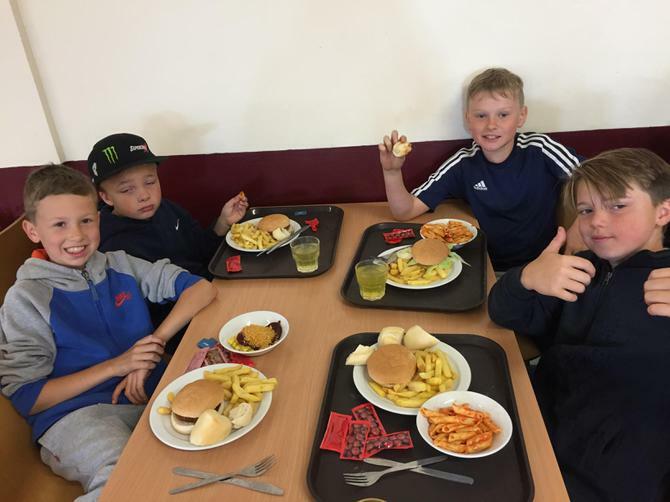 We had a choice of sausage casserole with rice or fish fingers, chips and beans with a selection of side salads and jam doughnuts for dessert. 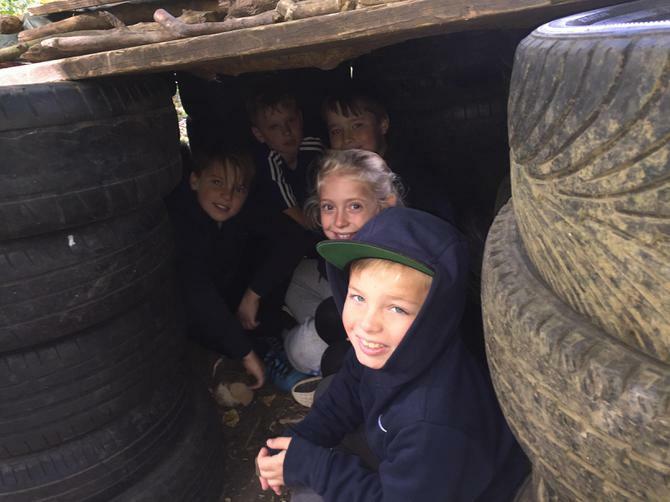 Everyone stocked up! 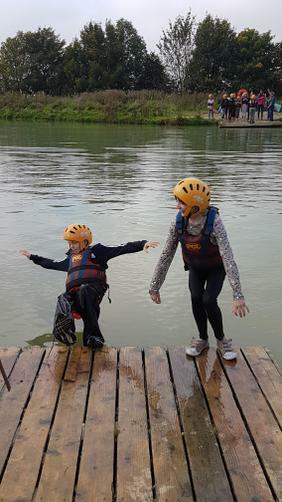 Our first evening activity was ‘Splash’. 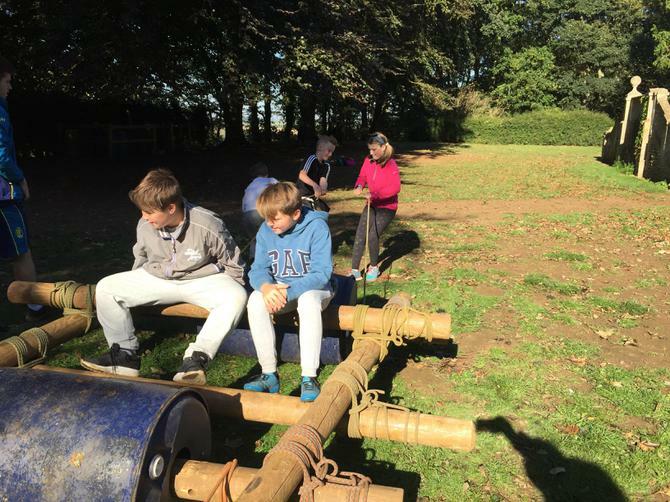 We had to carry out some team challenges to earn equipment, from which we built protective cradles for water balloons. 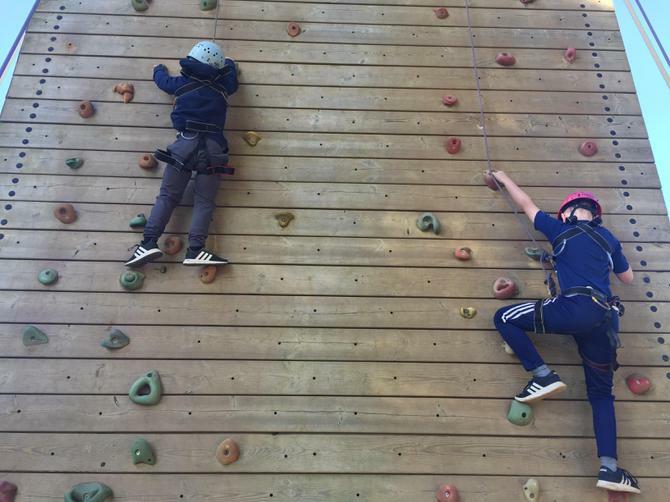 These were then dropped from the top of the climbing wall by Matty, a good 35ft in the air! 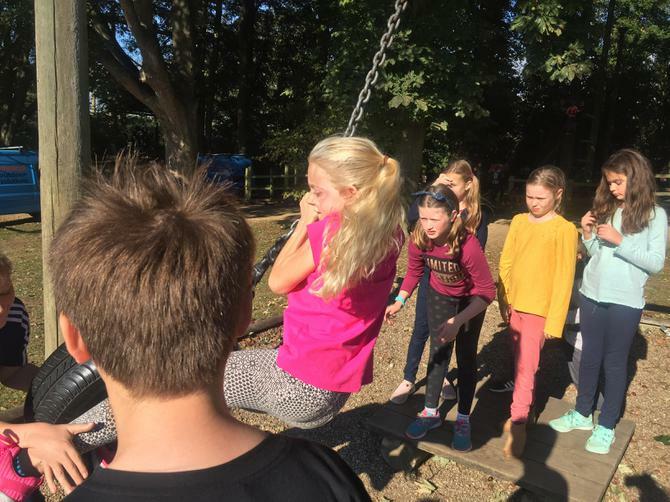 Amazingly, every single water balloon survived the drop; perhaps there’s a future in engineering for some of us! 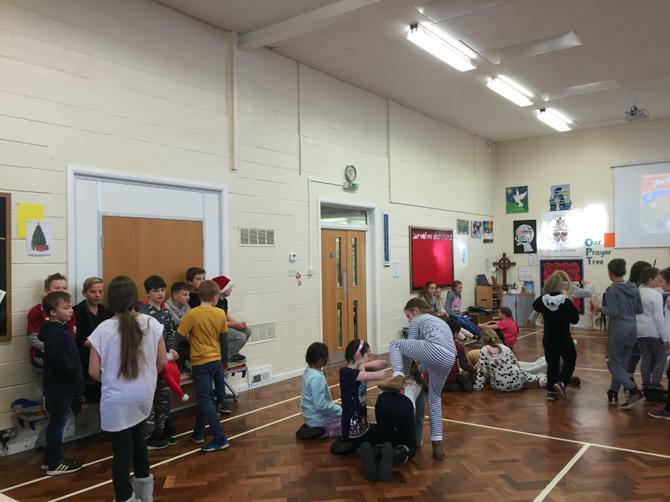 Well, there were certainly a few sleepy faces this morning! 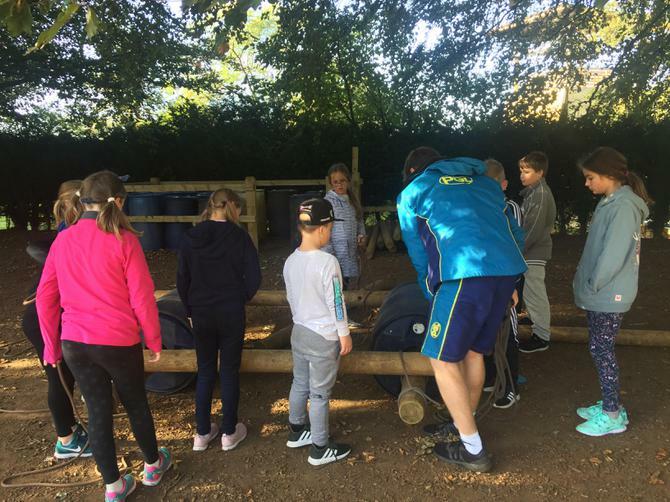 After a hearty cooked breakfast along with cereals, toast, yogurt and fruit, we set off for our first morning activities. 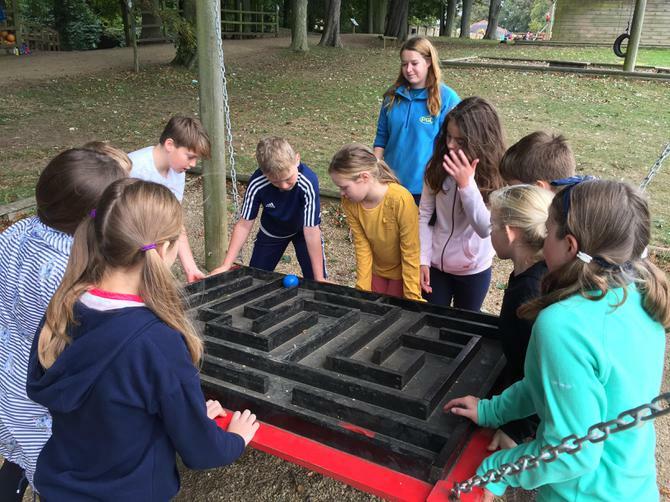 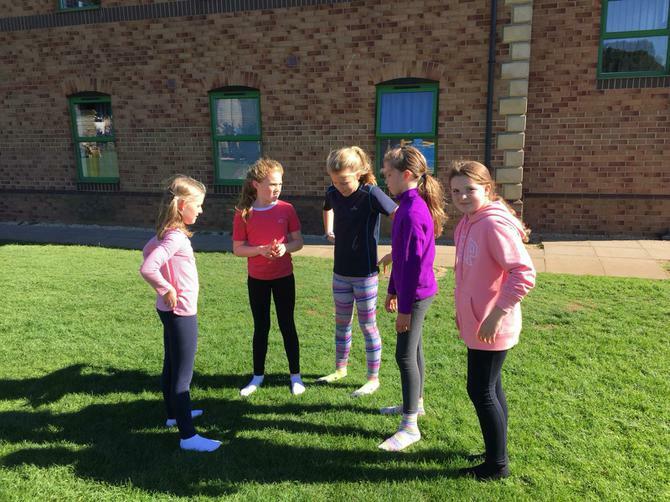 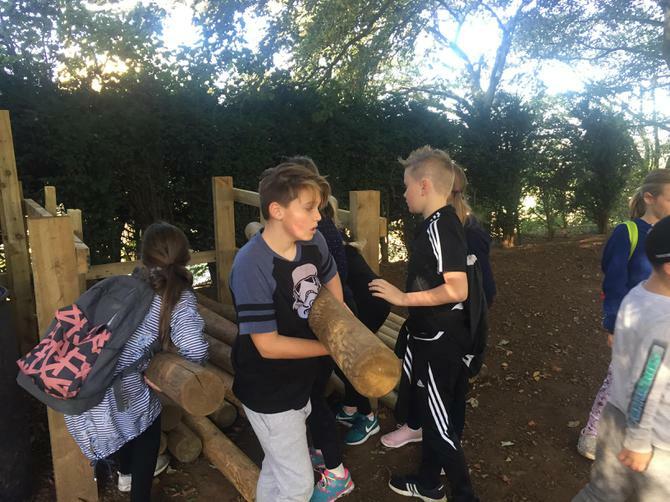 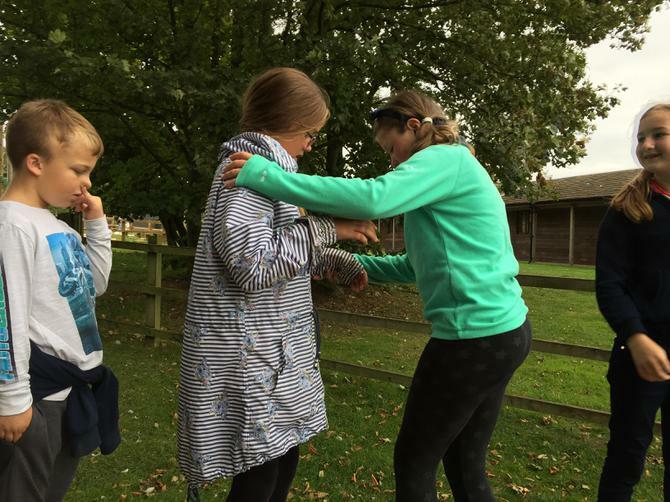 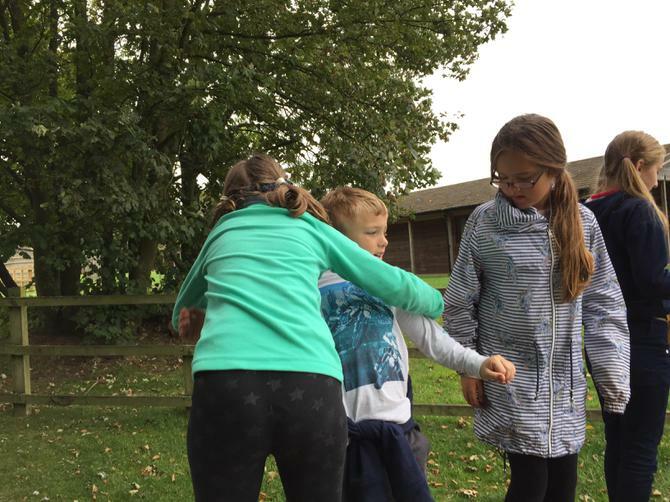 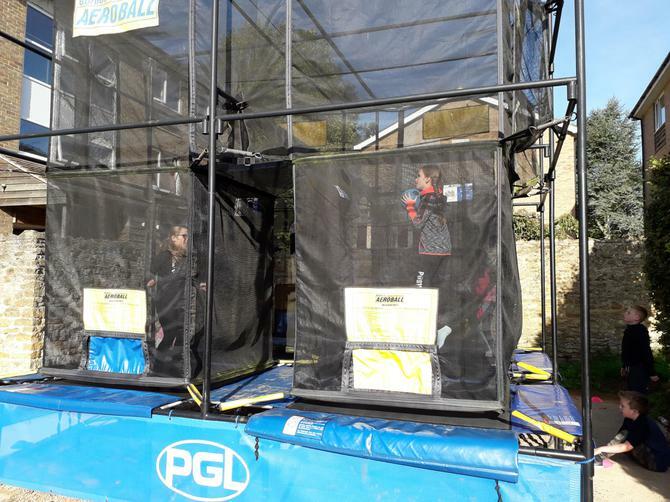 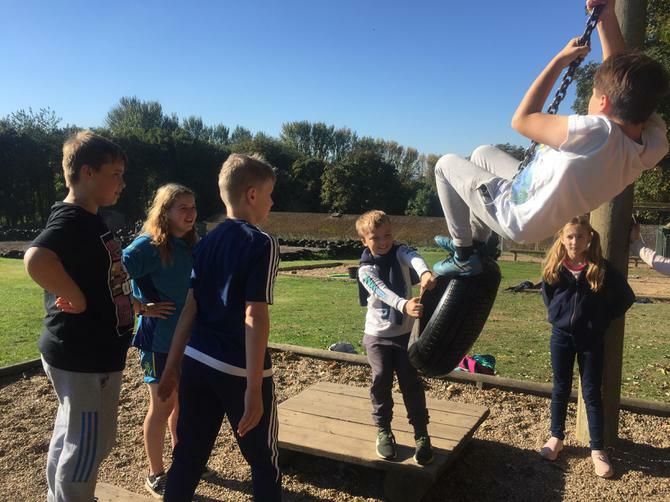 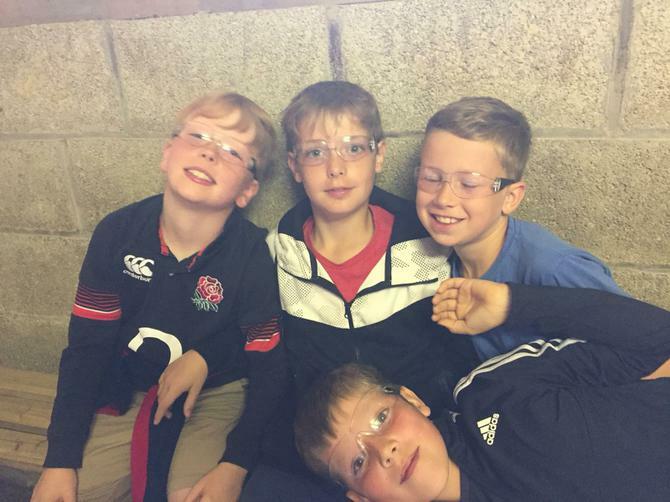 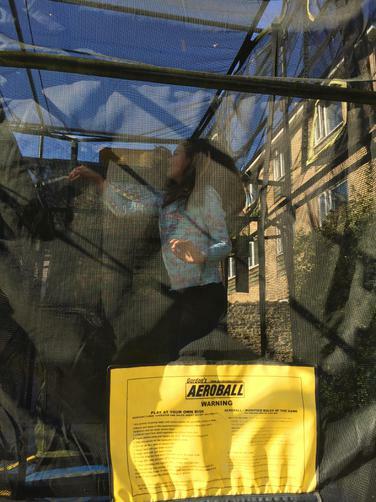 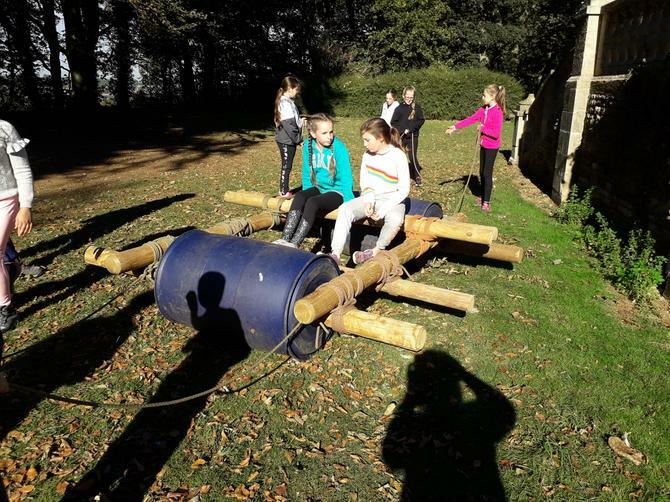 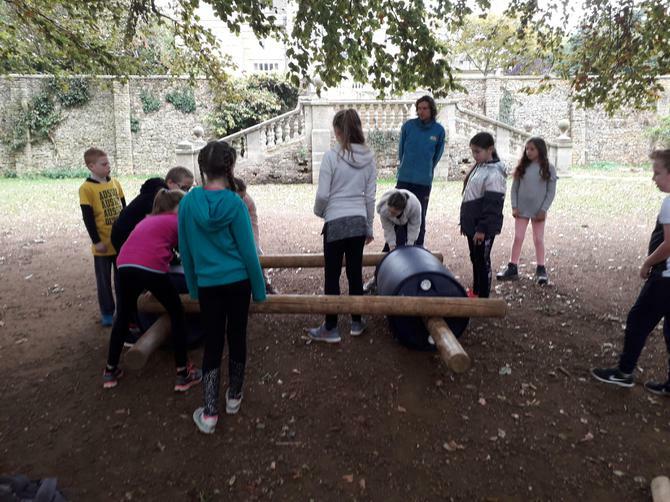 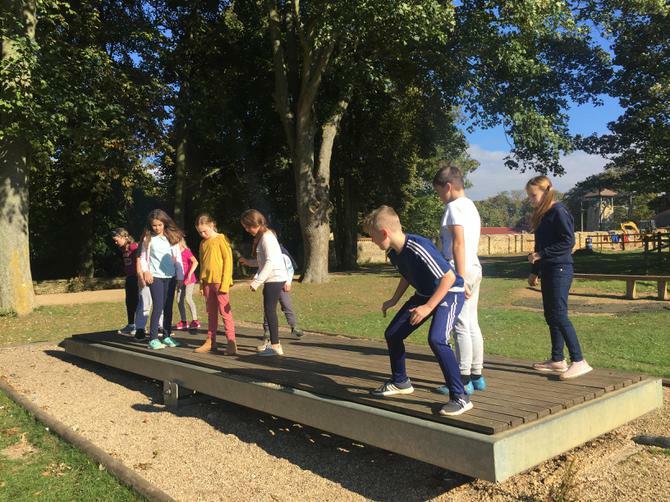 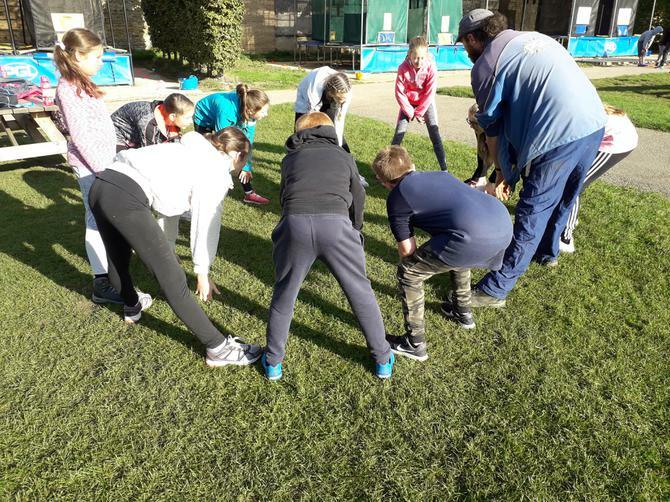 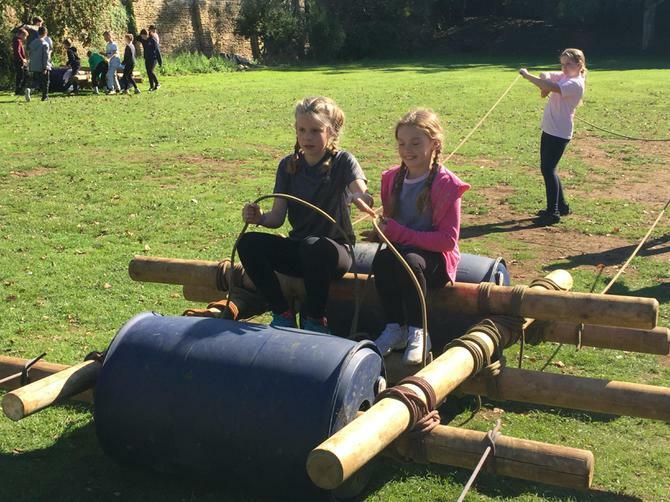 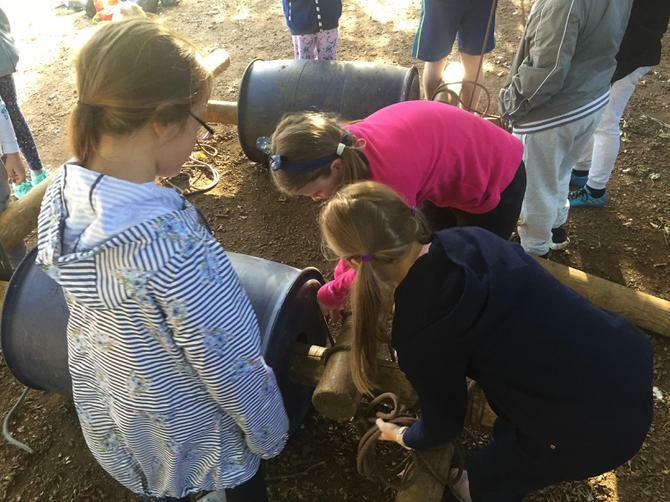 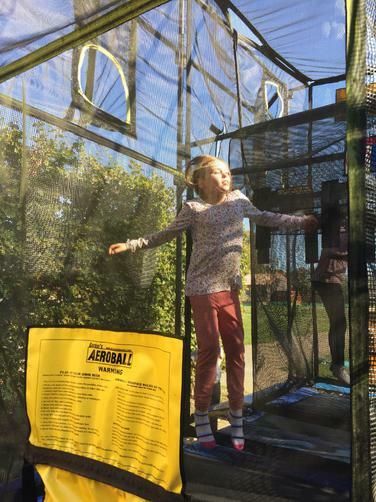 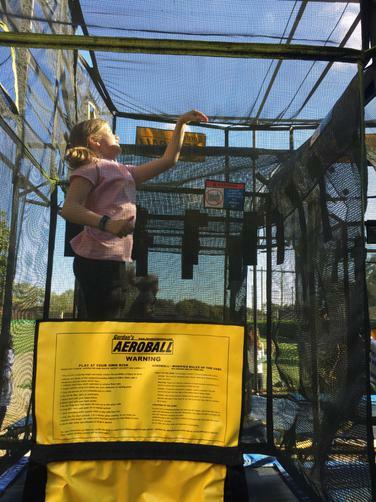 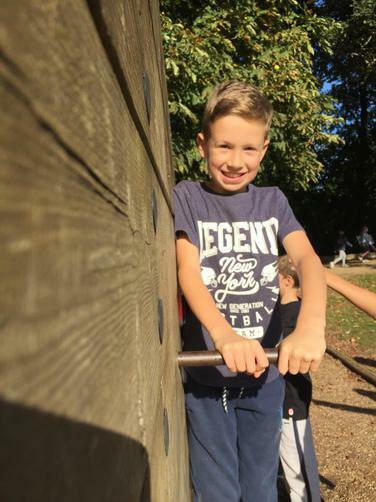 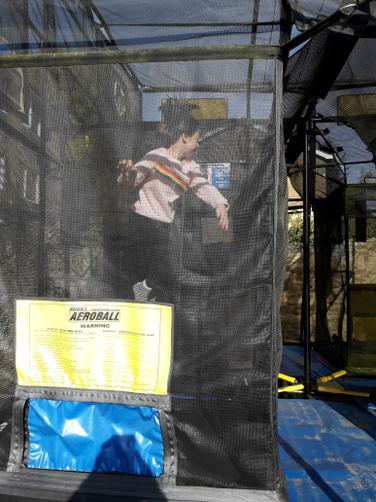 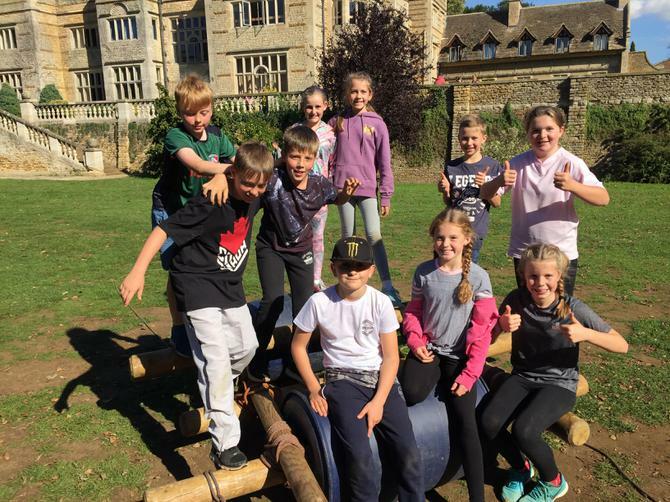 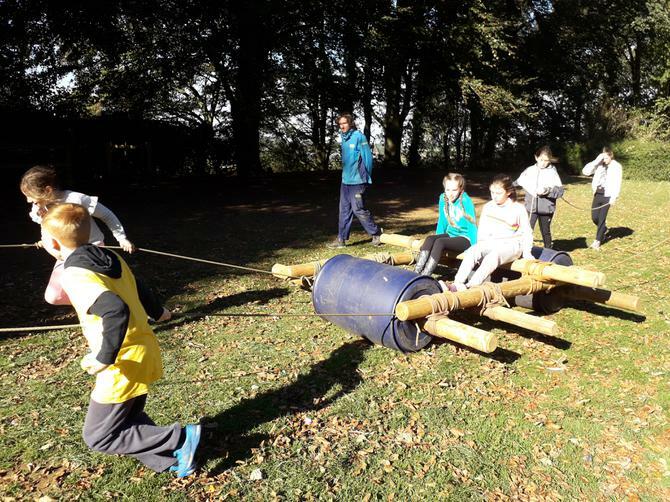 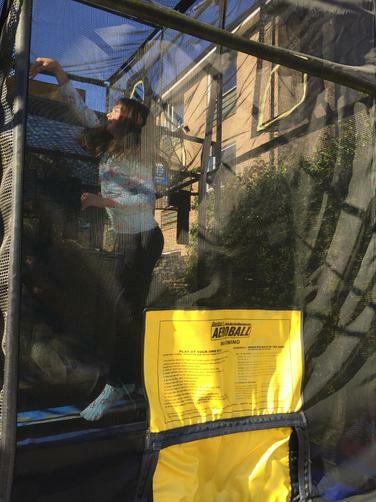 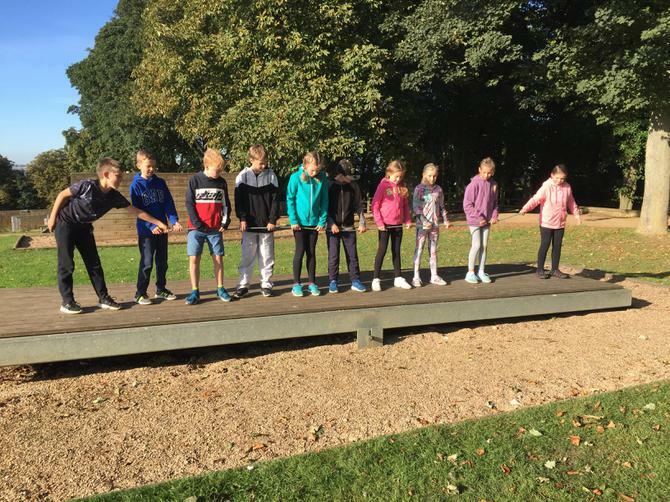 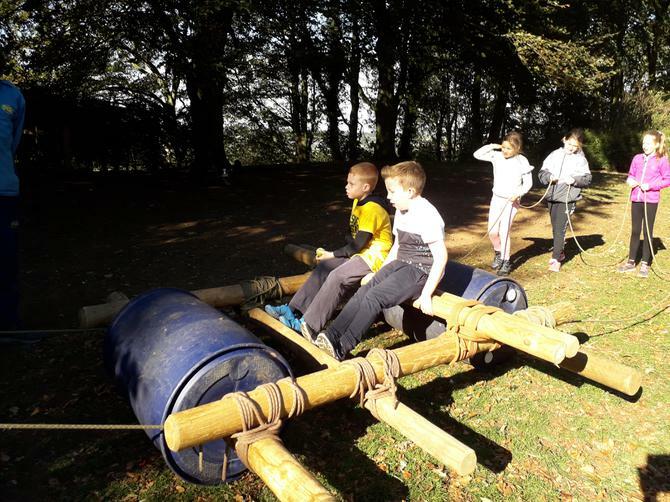 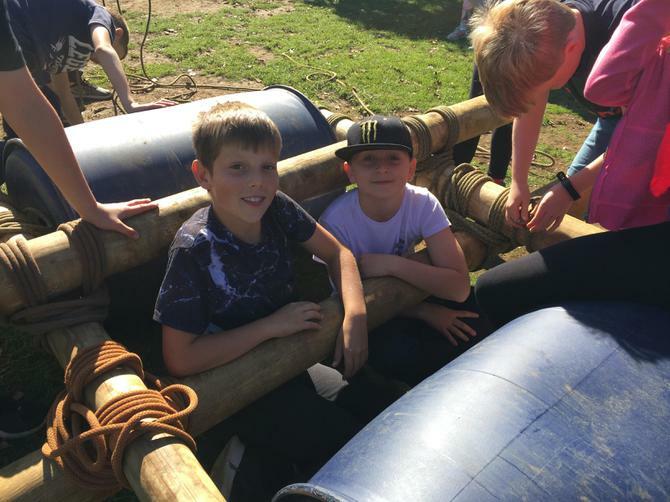 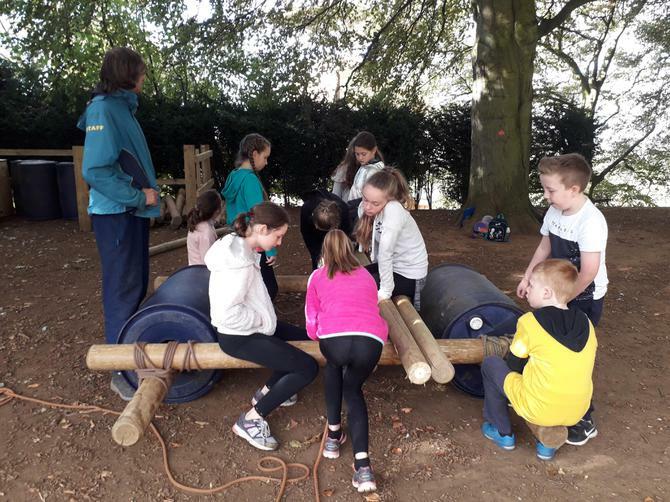 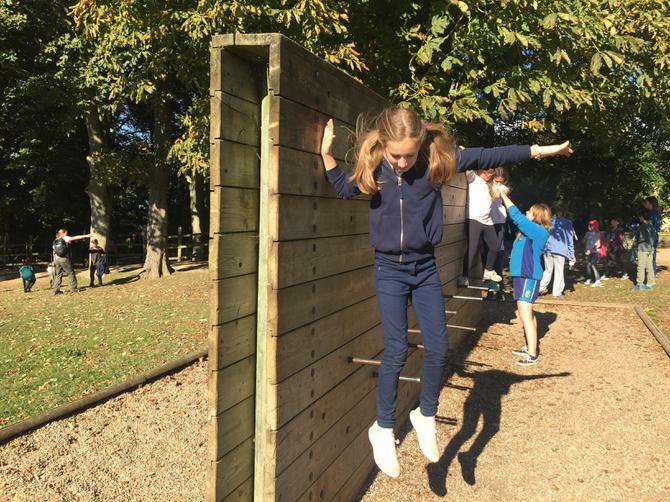 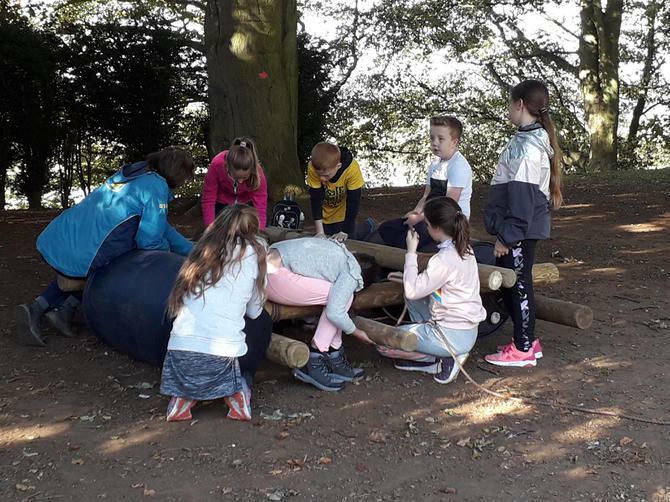 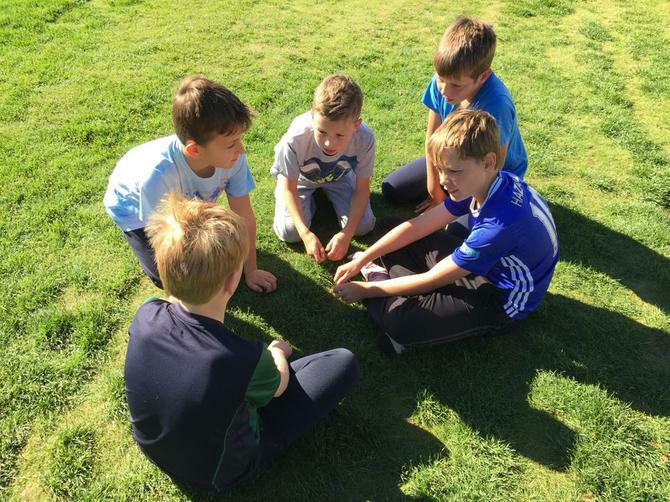 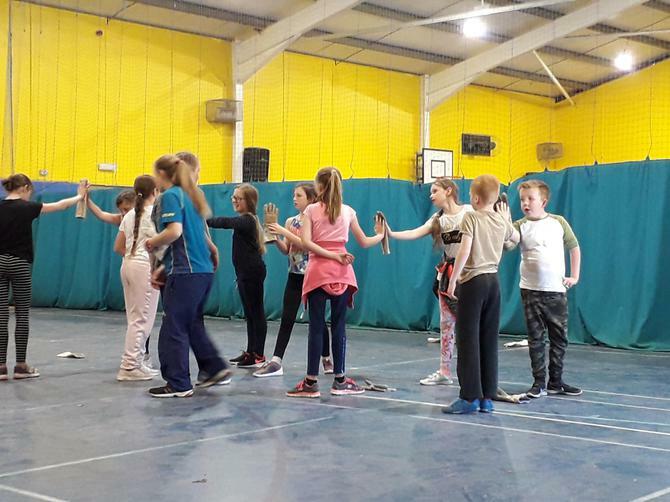 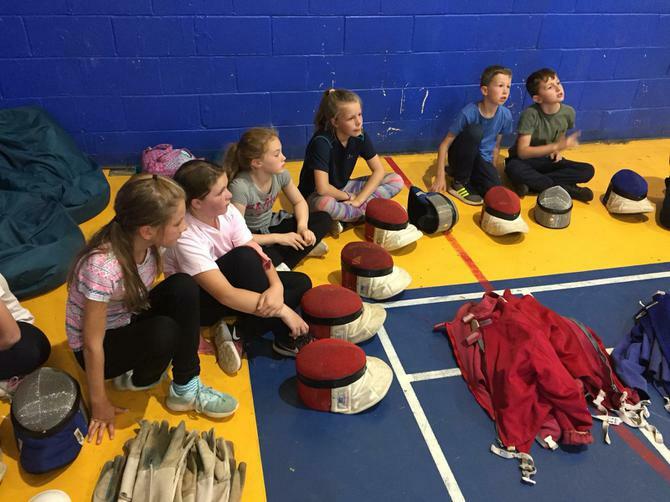 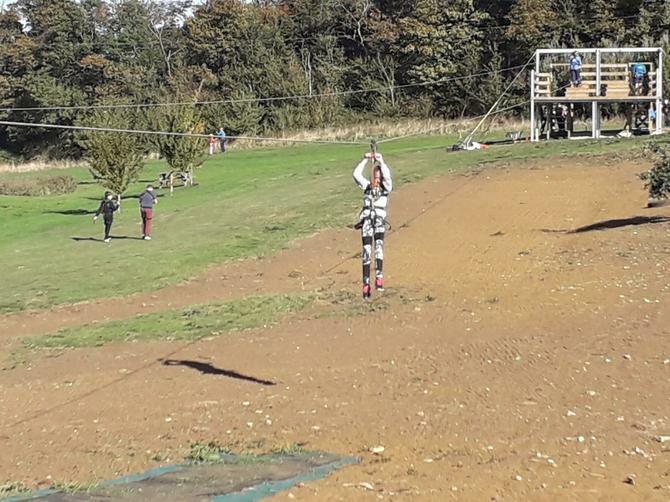 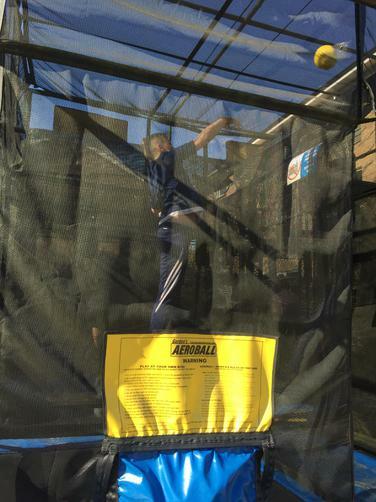 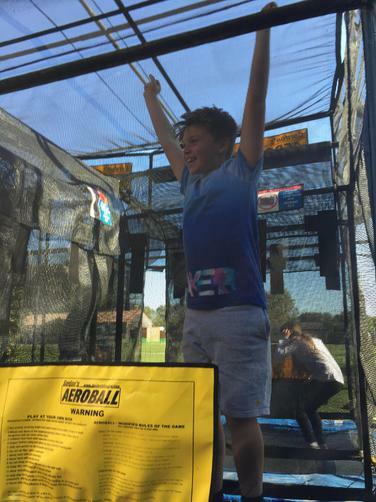 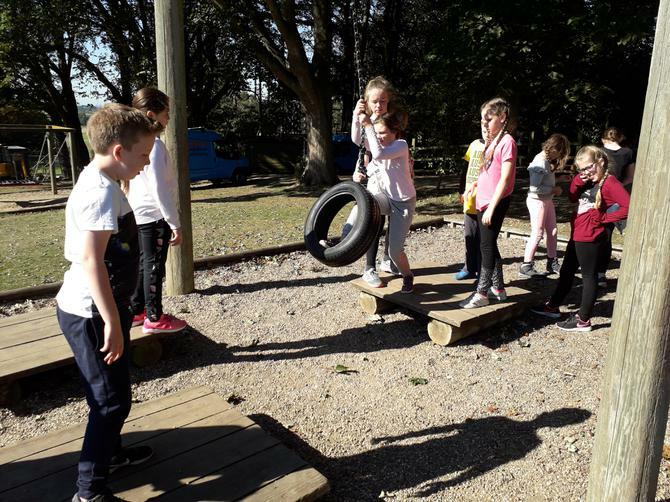 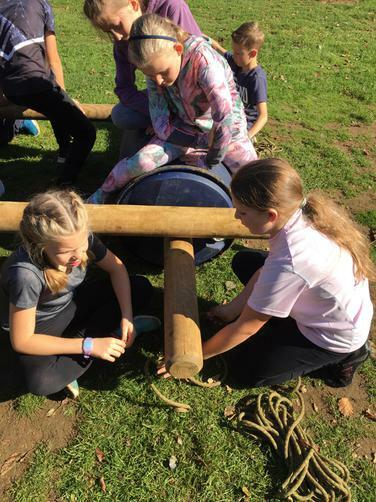 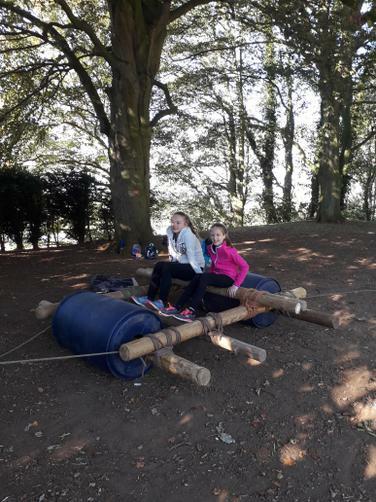 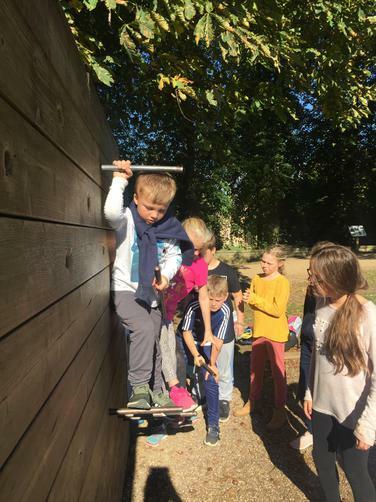 Some went off to try out some problem-solving challenges, others created moveable buggies from oil drums, logs and rope and the third group tried out ‘Aeroball’, a combination of trampolining and basketball! 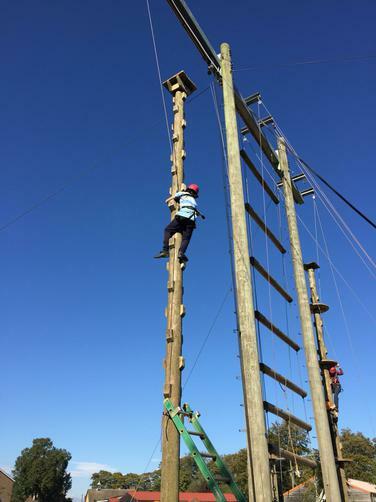 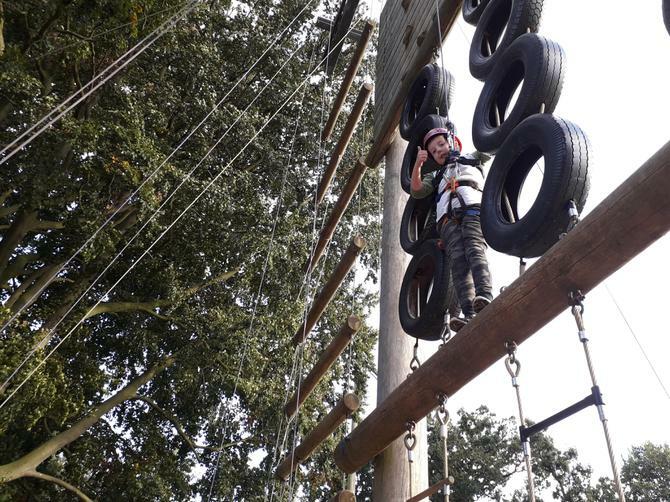 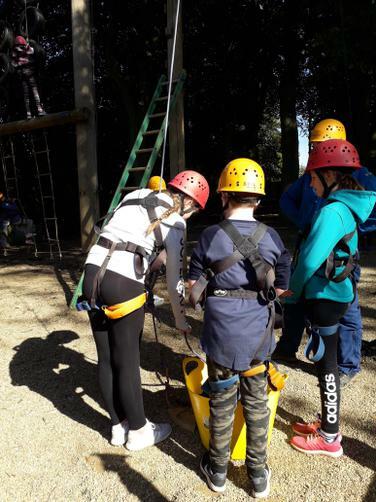 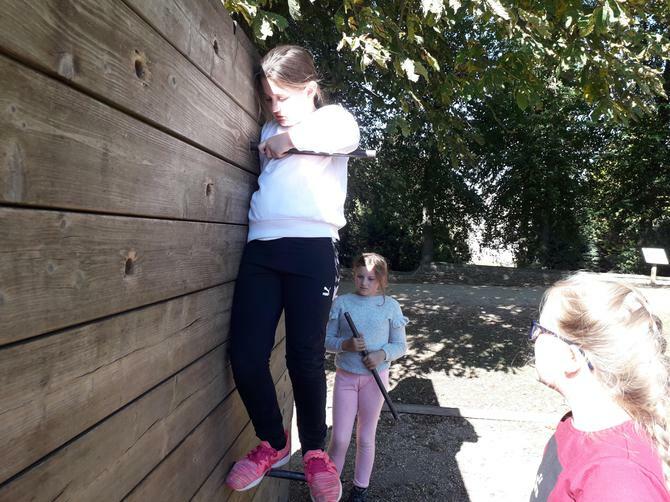 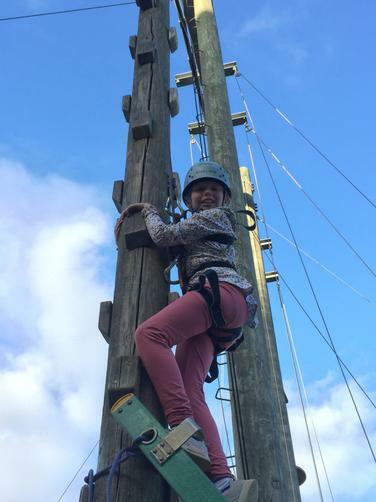 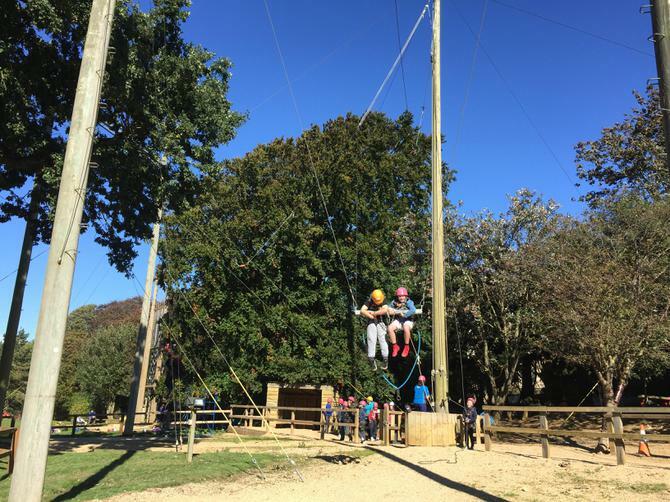 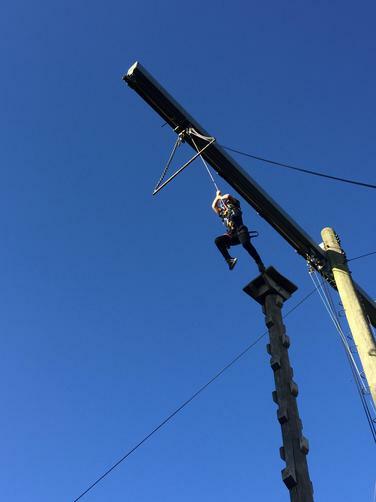 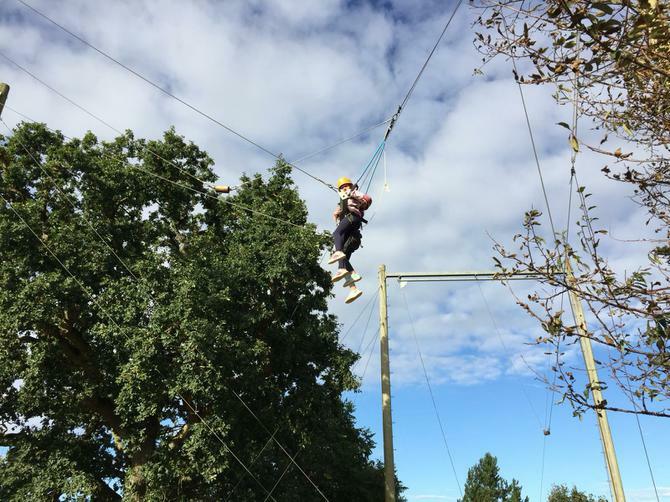 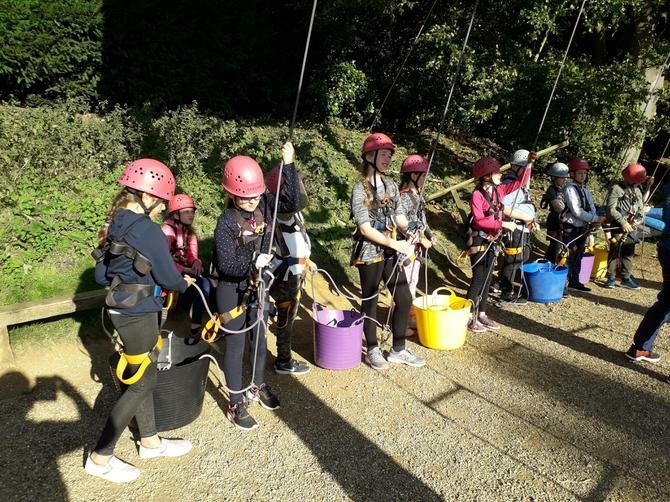 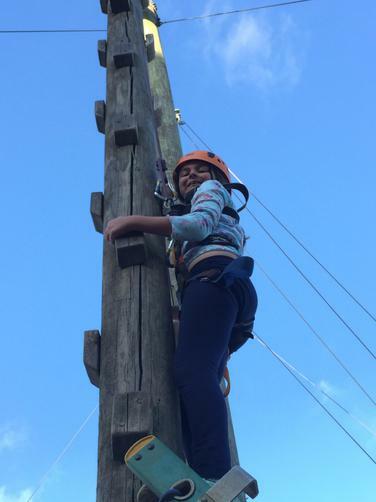 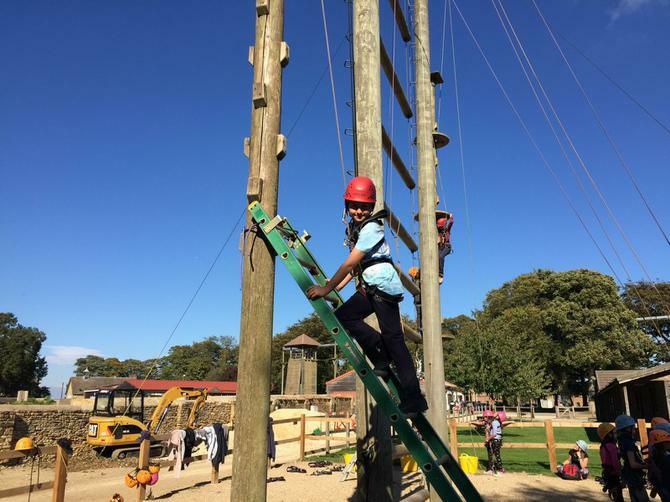 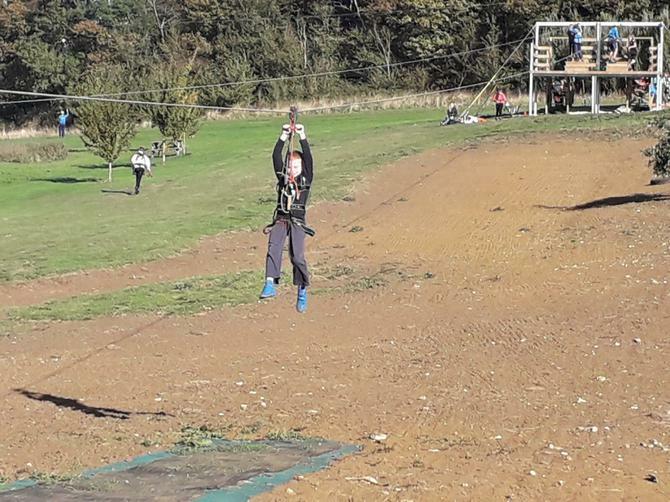 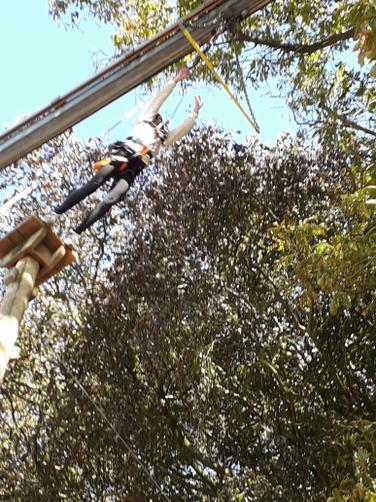 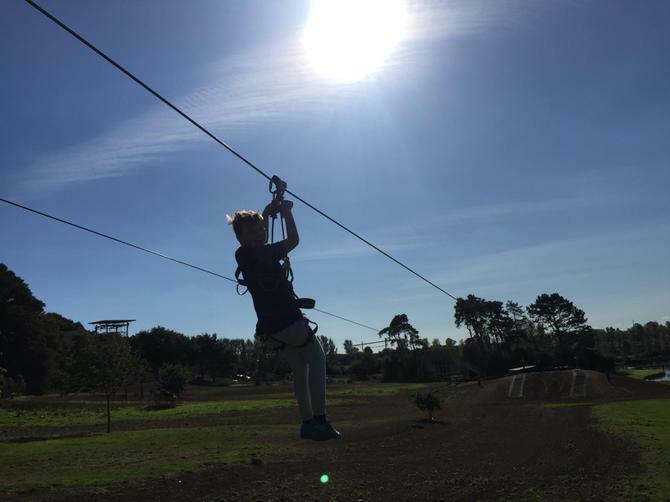 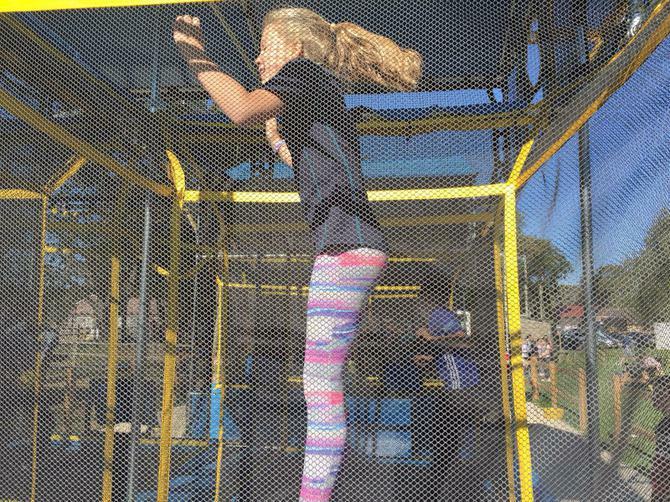 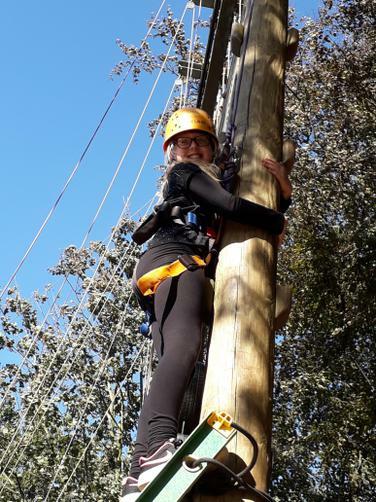 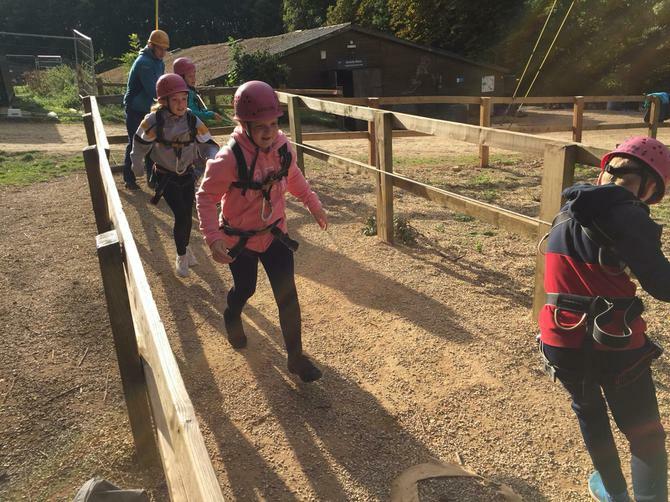 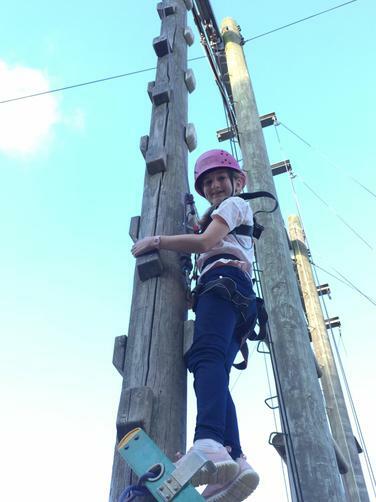 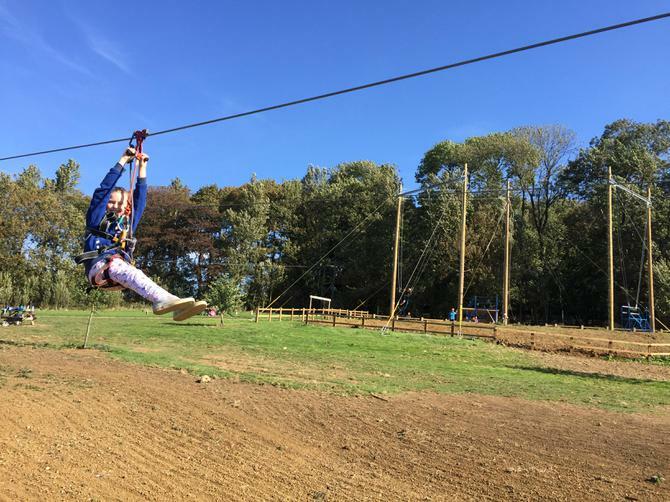 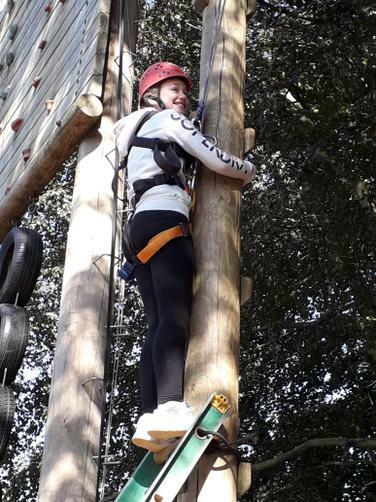 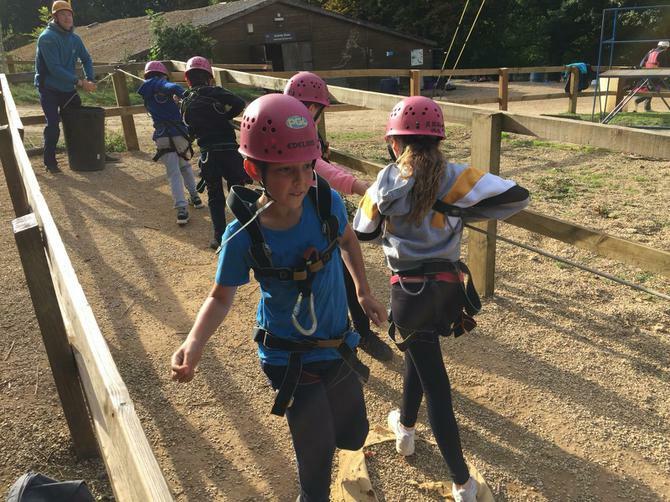 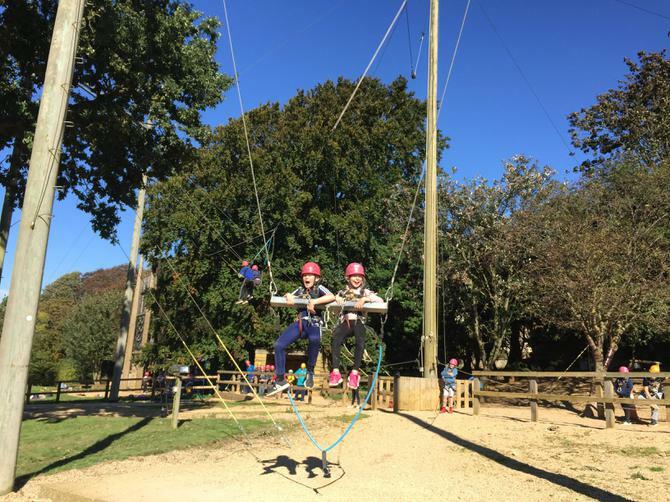 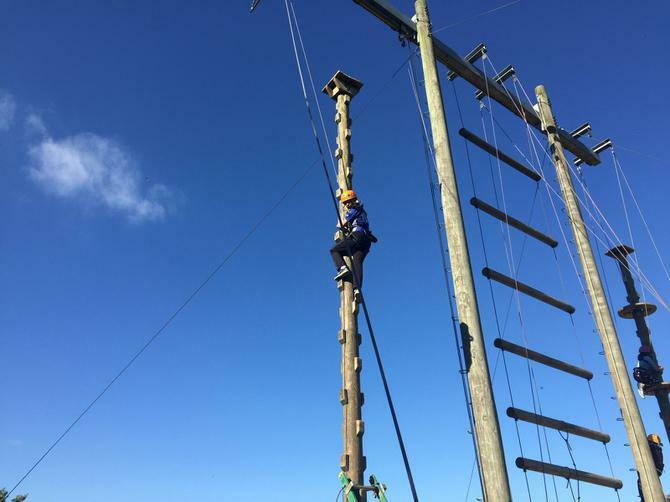 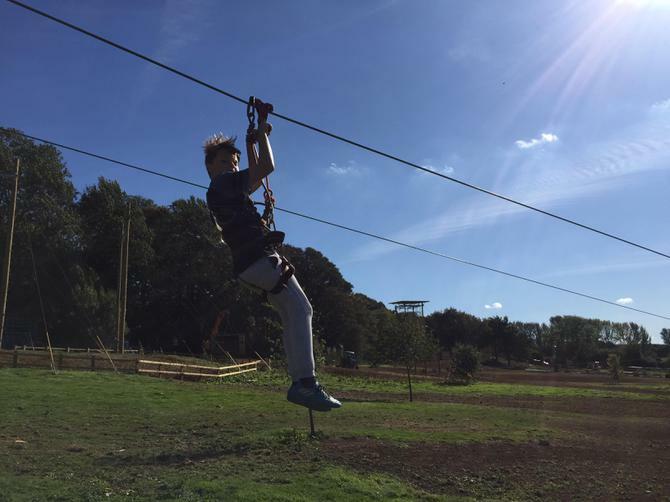 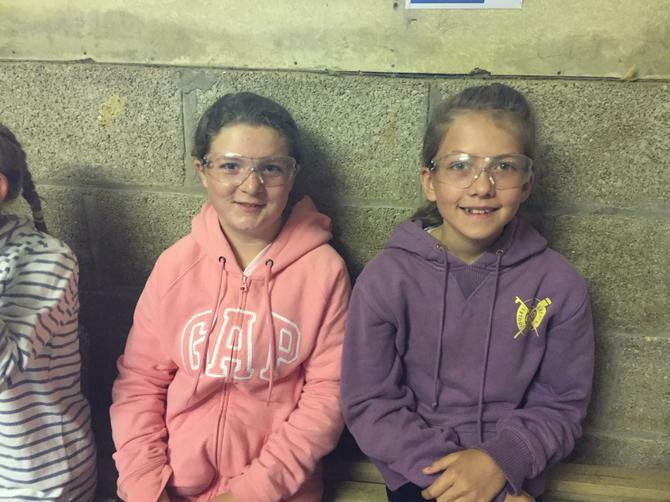 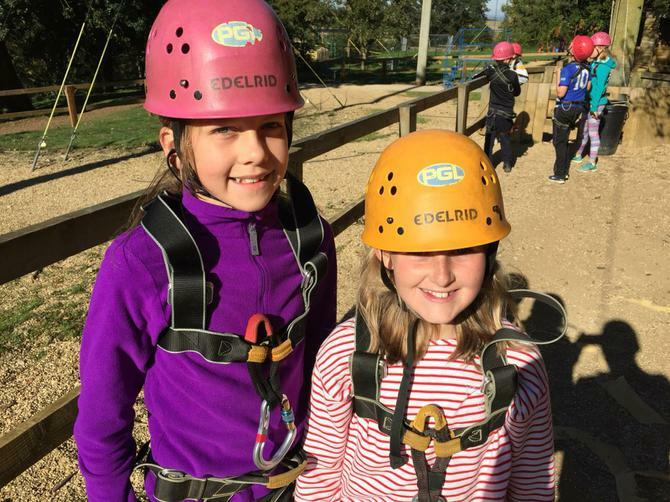 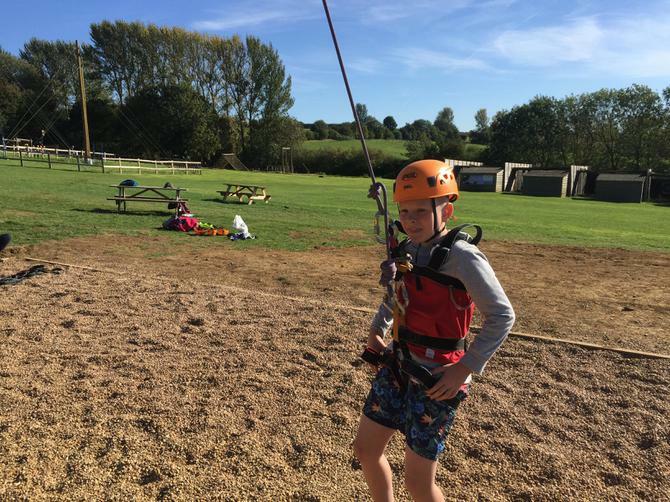 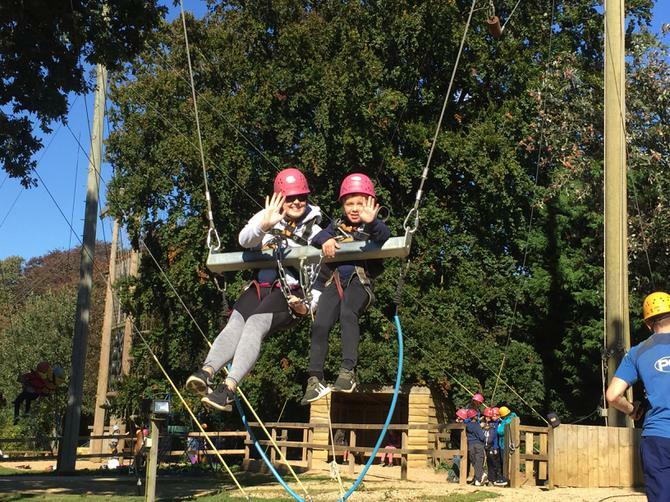 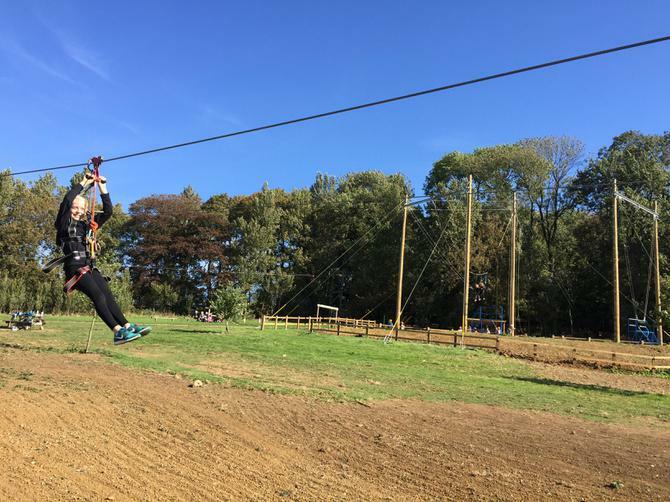 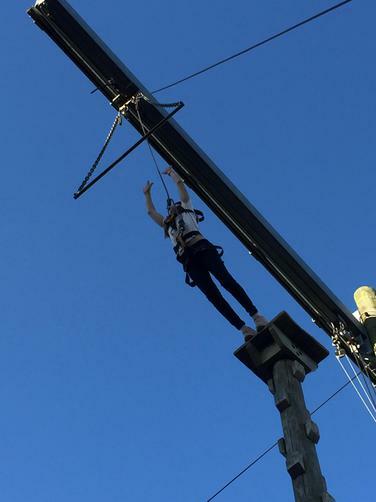 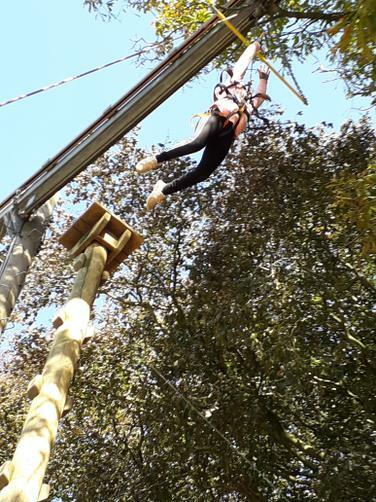 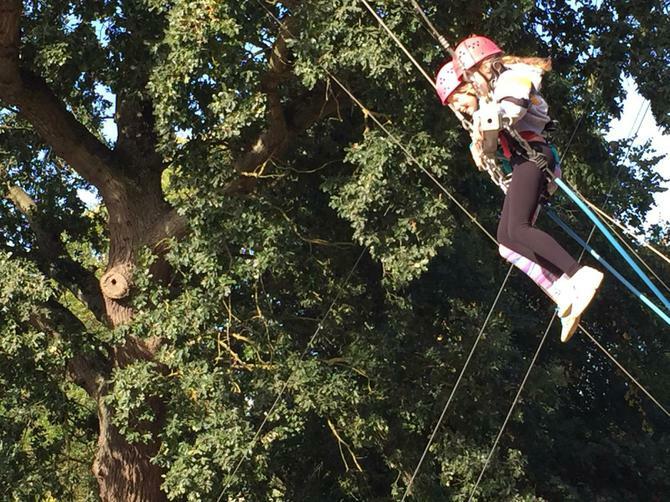 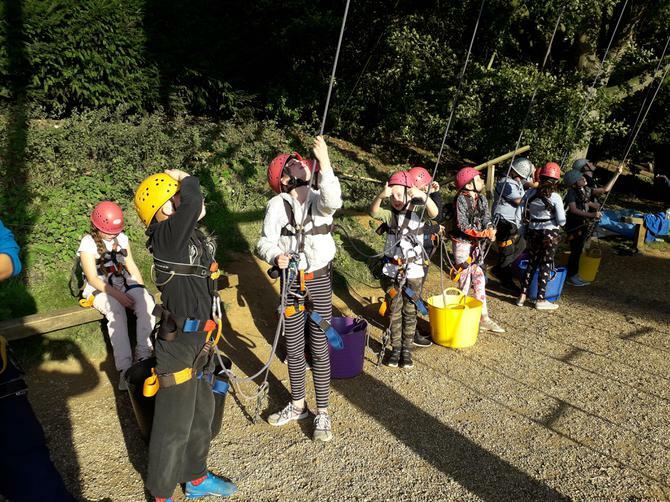 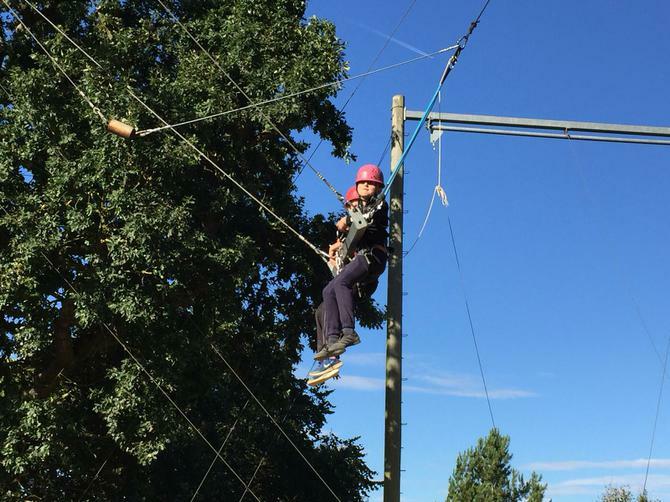 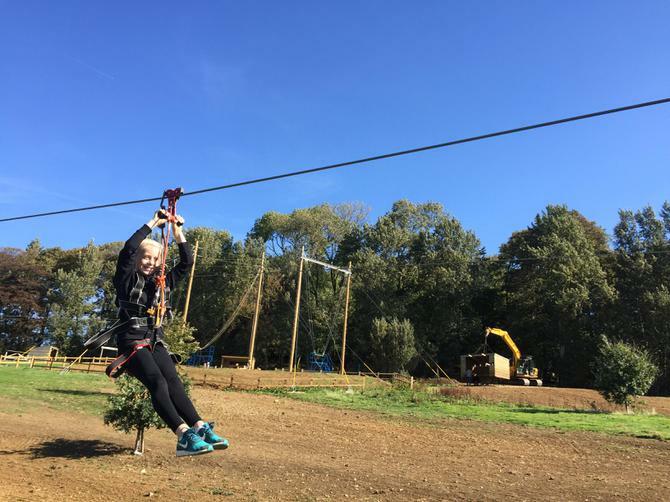 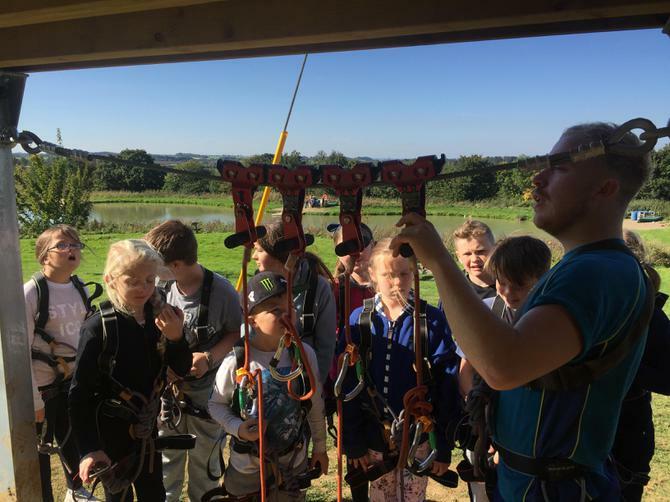 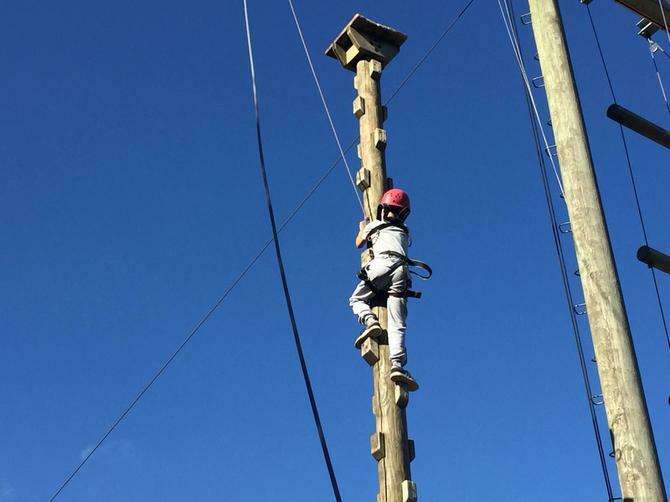 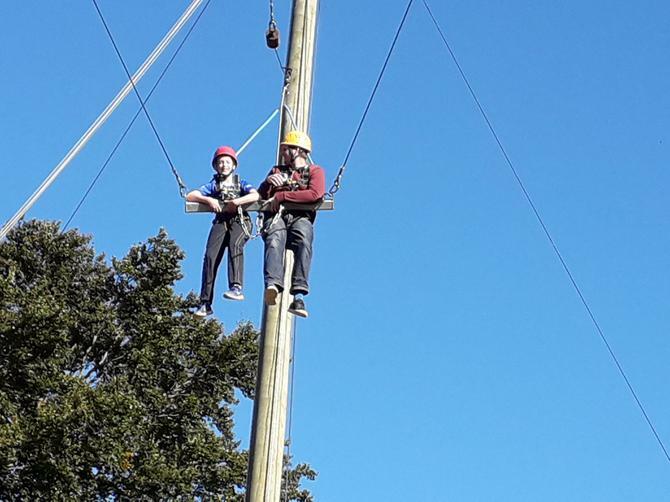 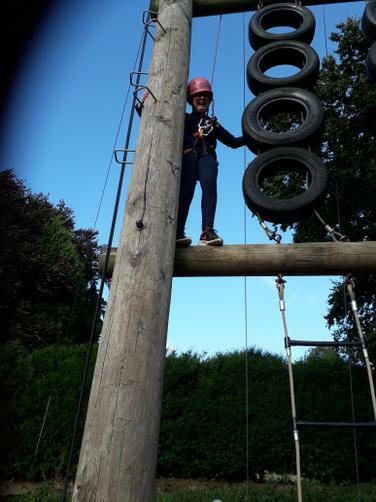 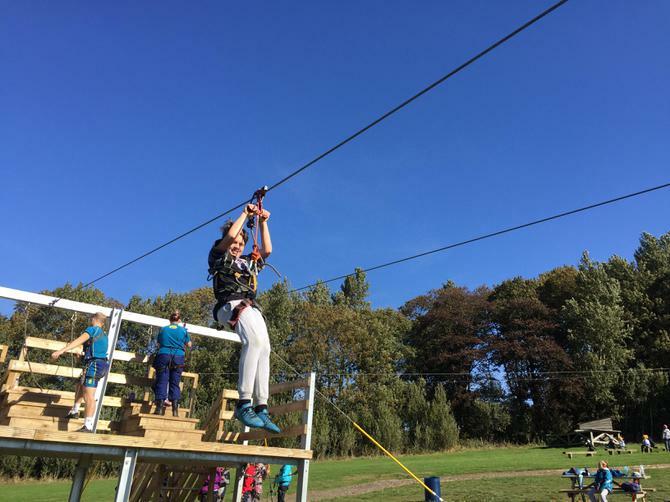 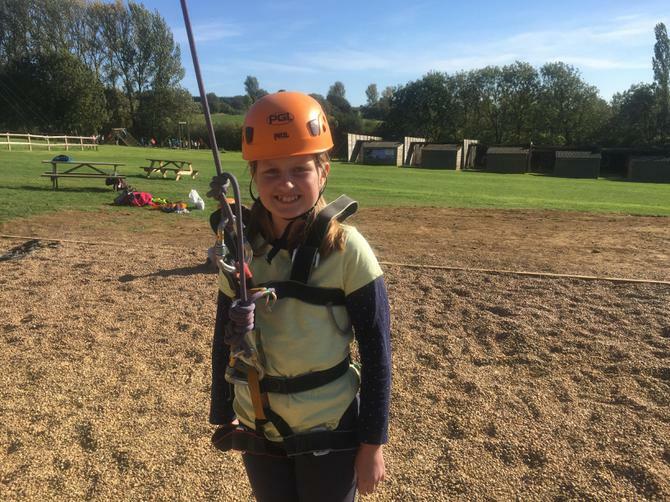 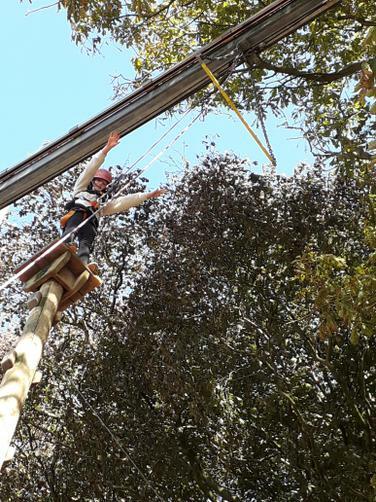 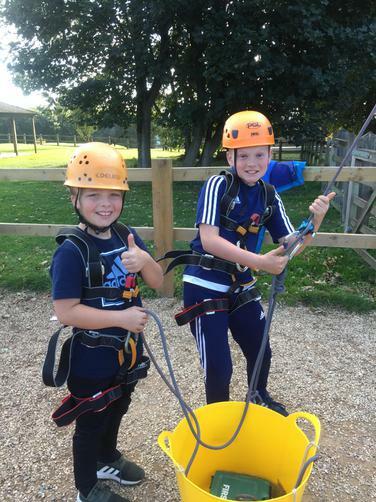 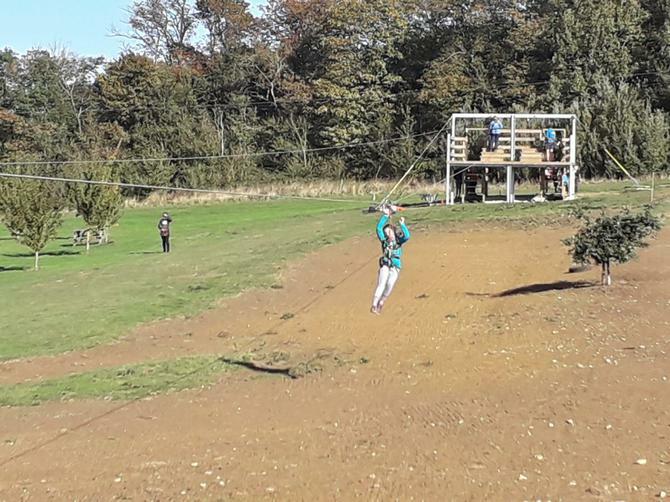 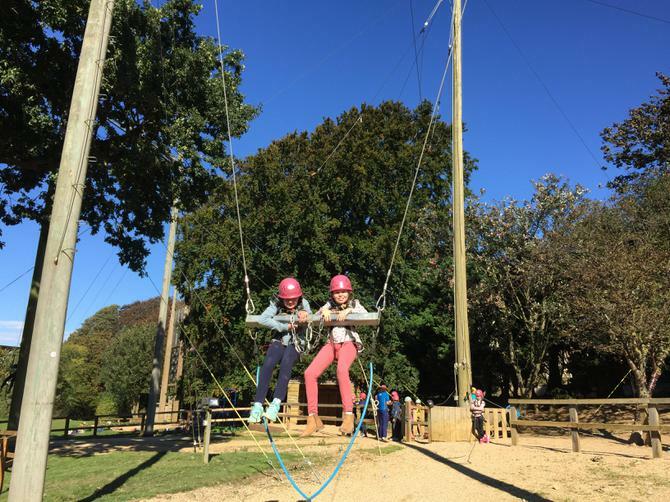 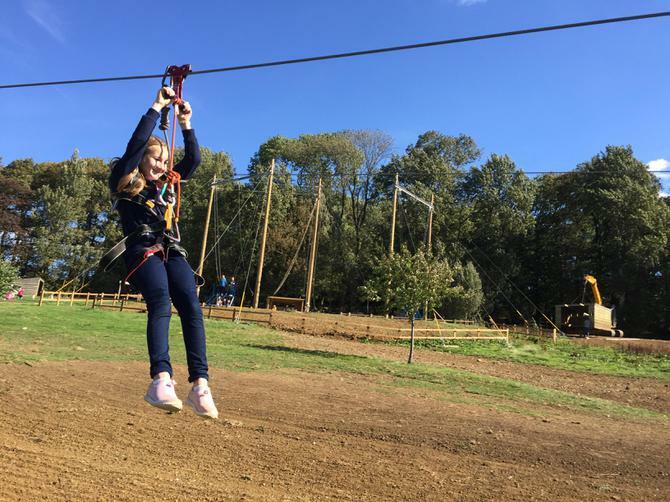 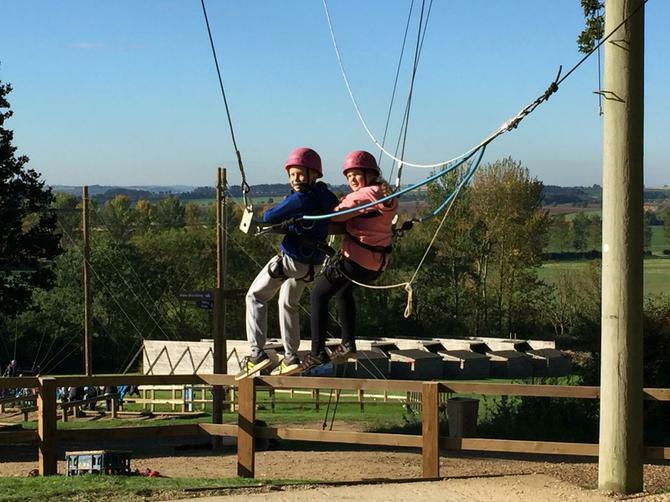 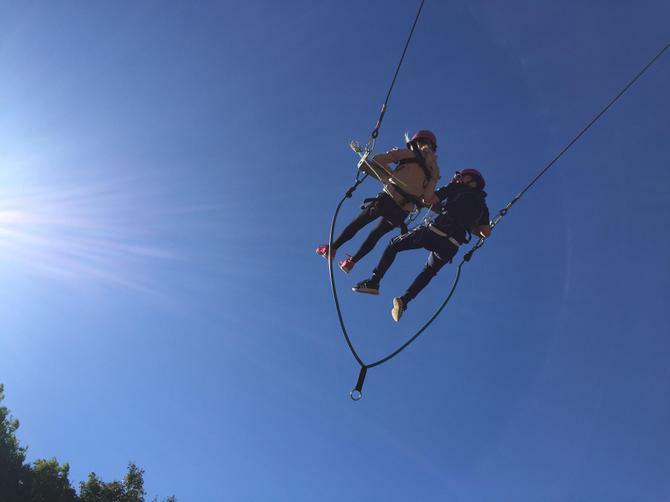 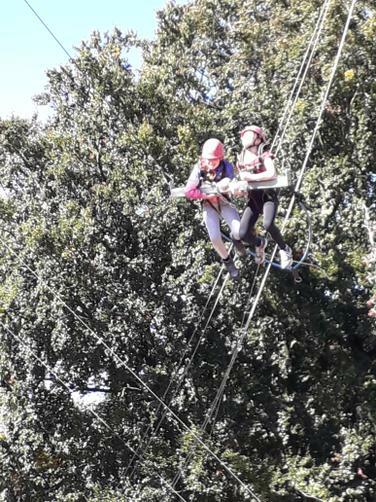 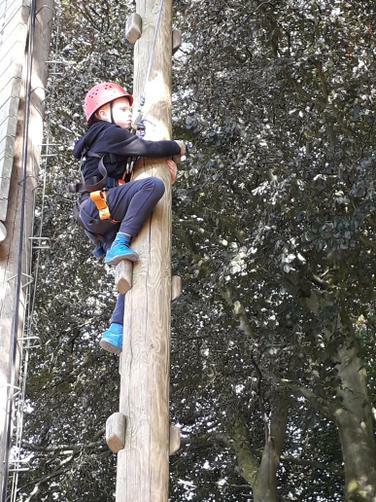 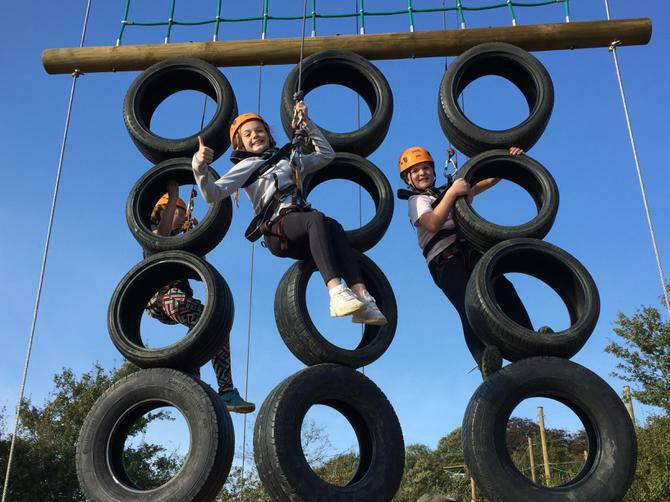 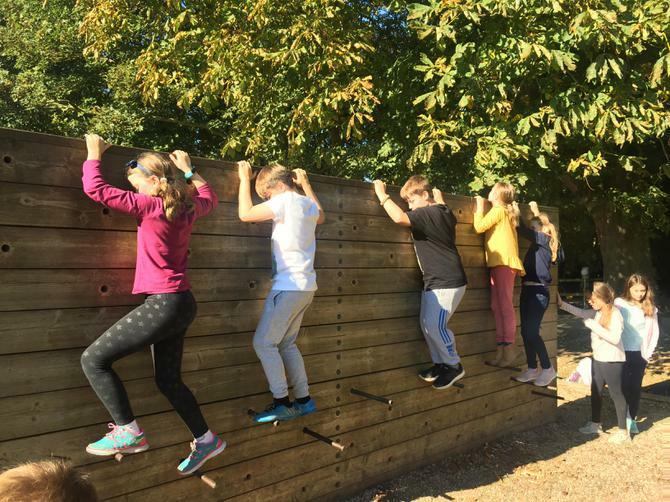 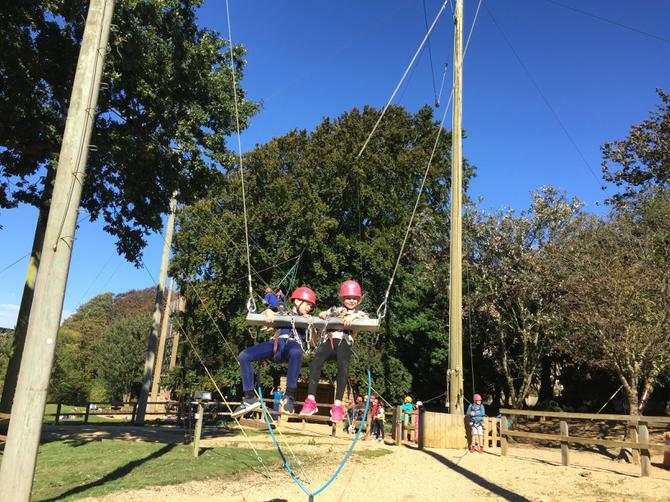 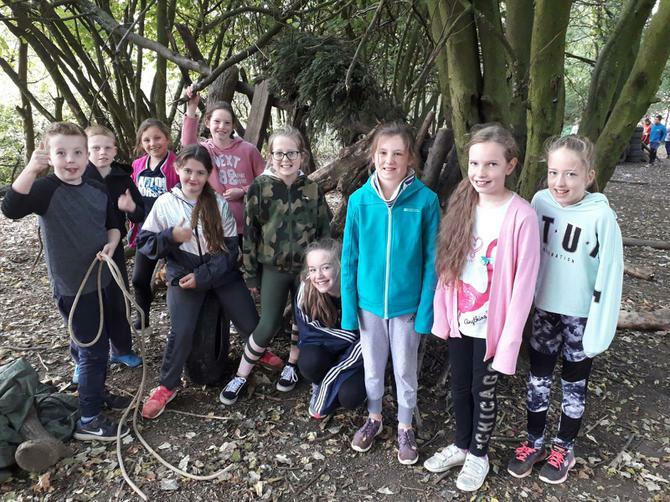 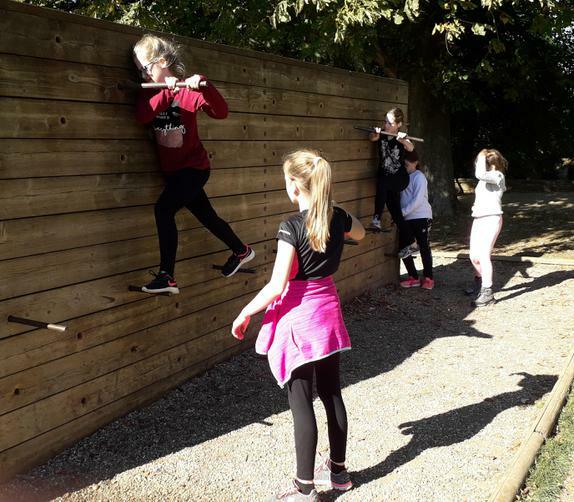 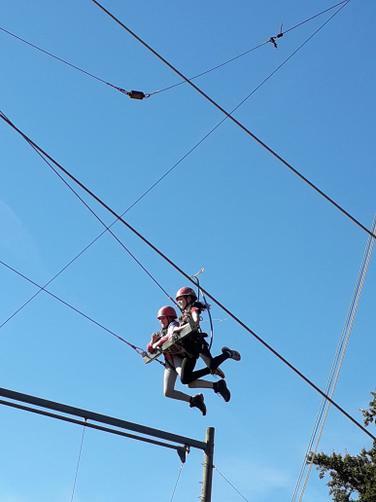 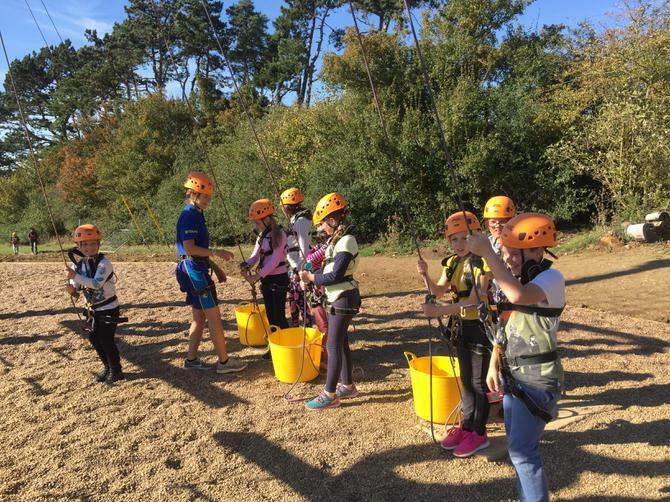 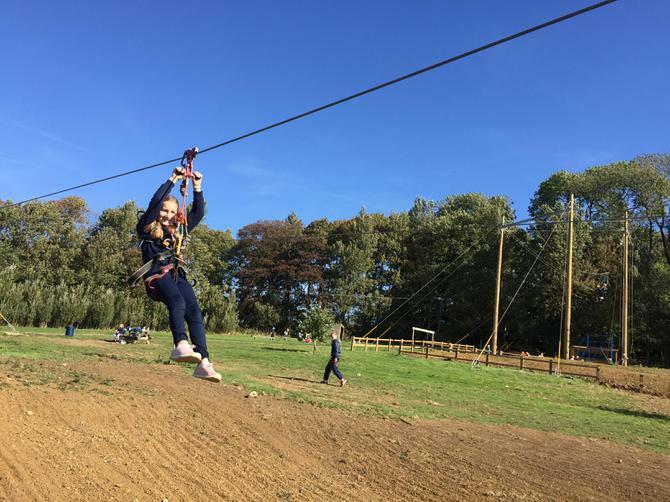 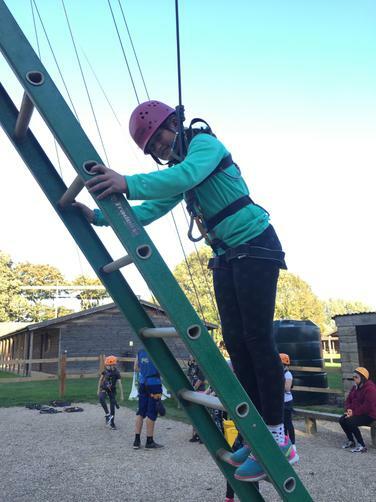 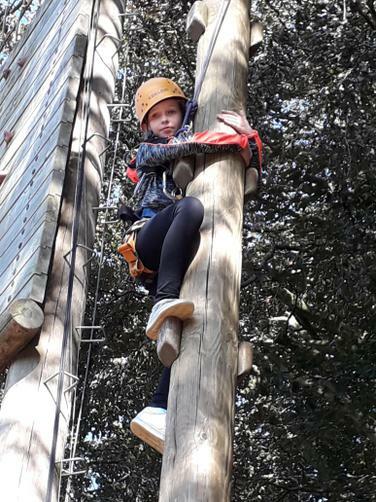 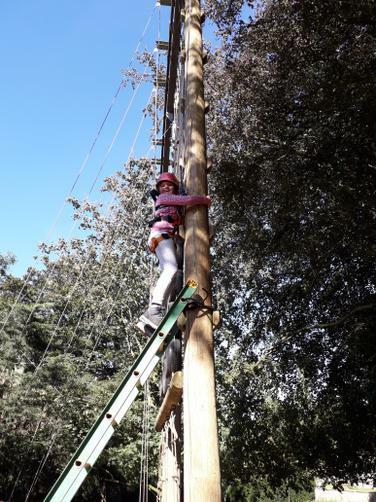 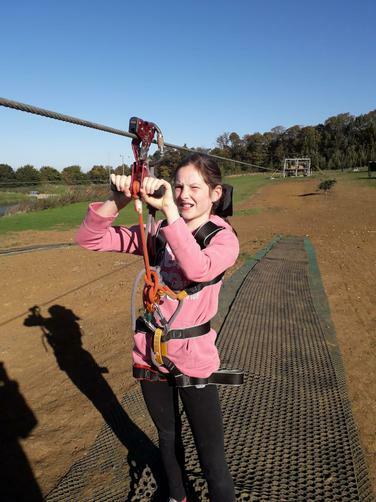 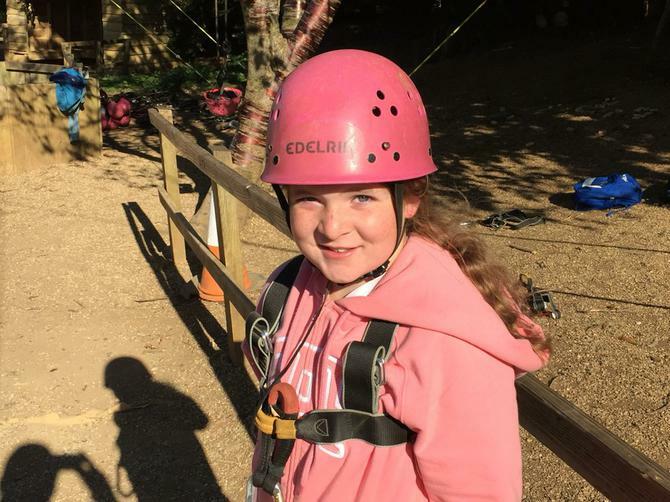 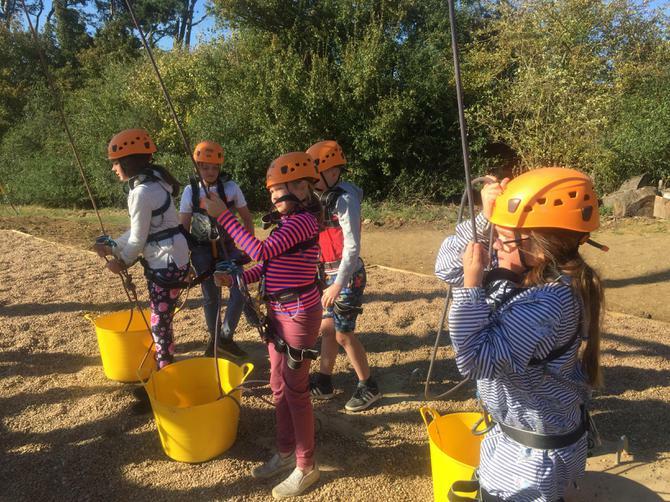 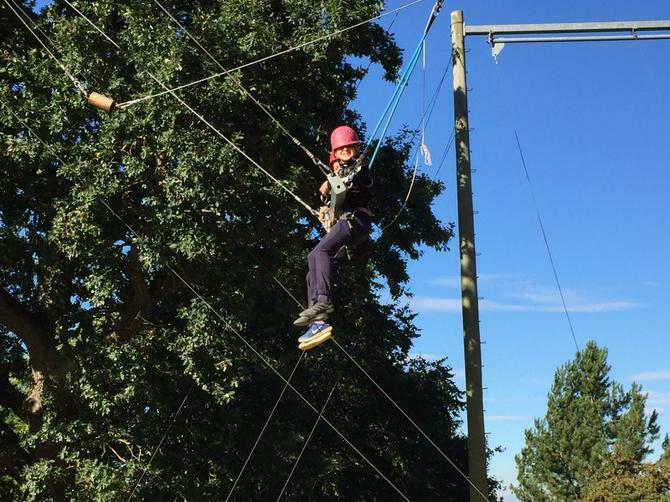 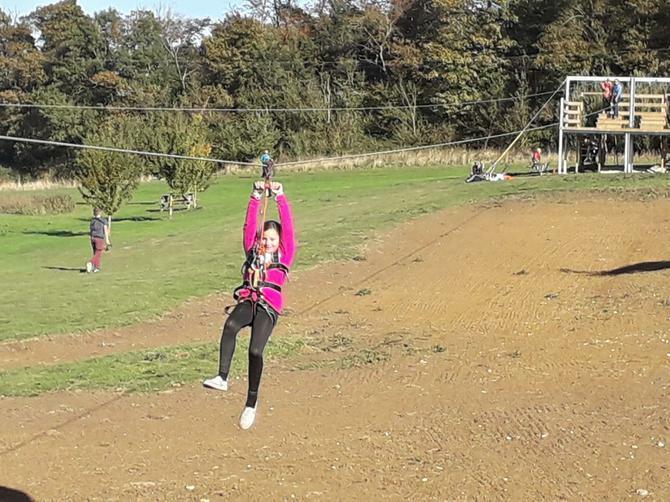 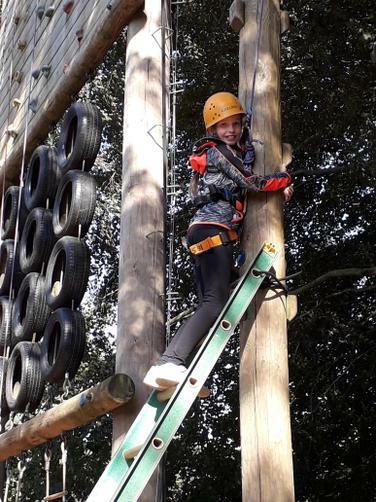 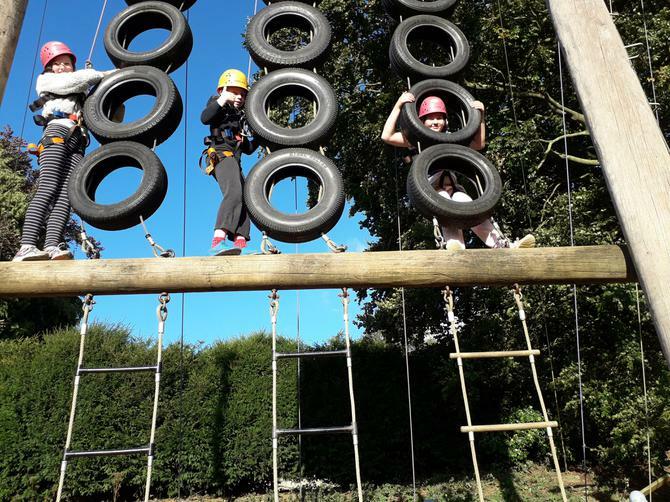 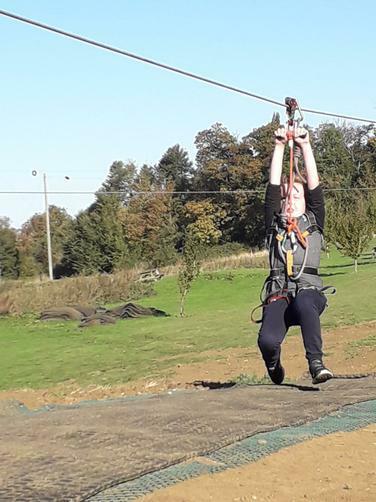 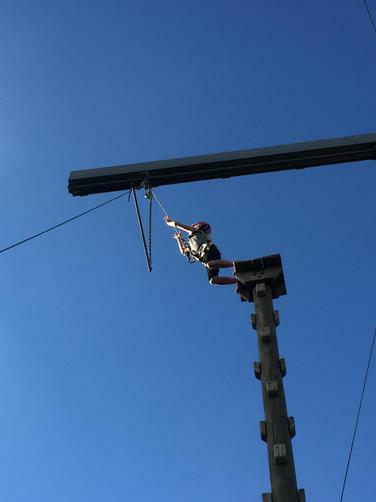 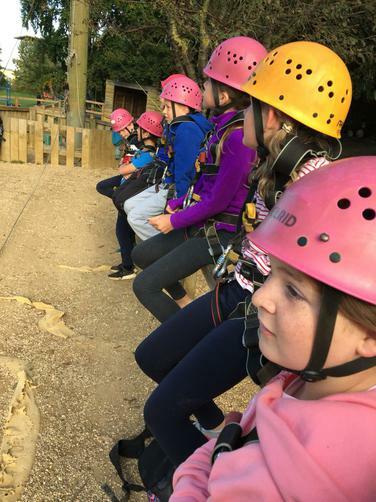 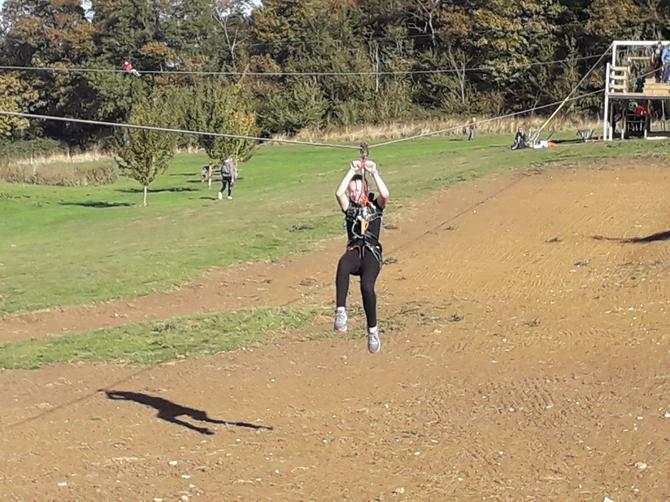 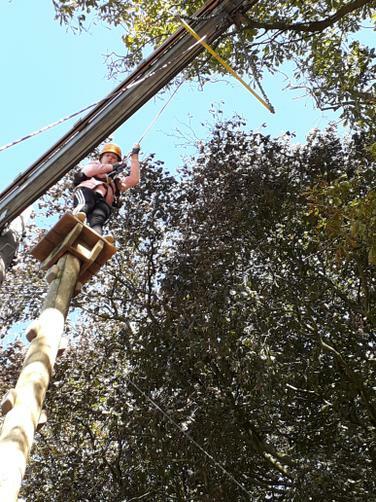 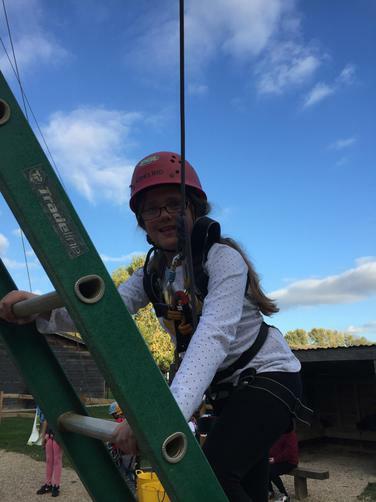 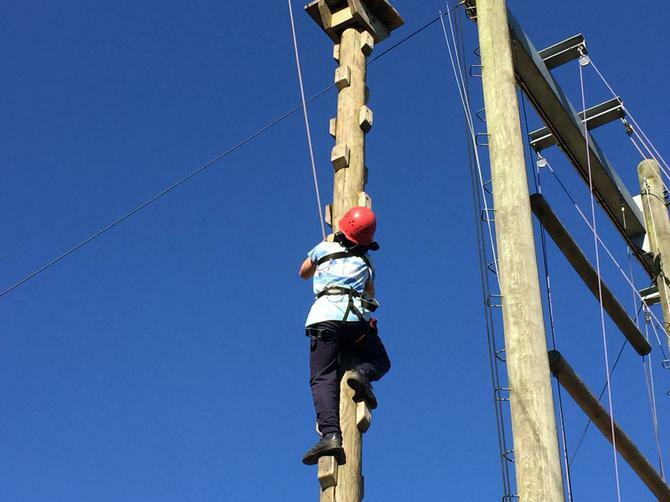 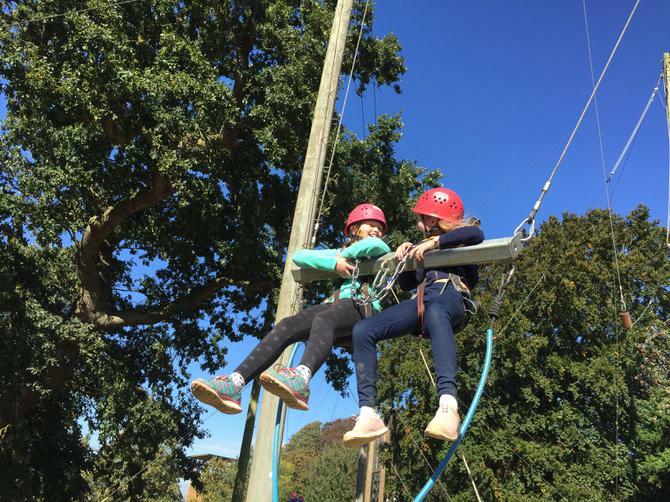 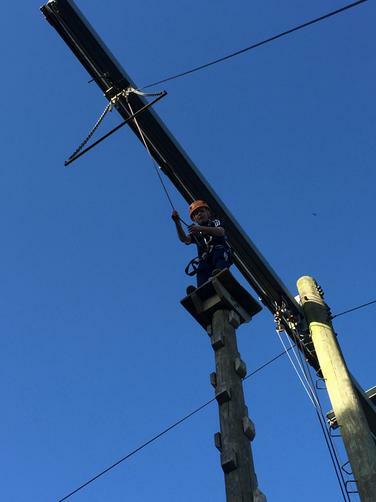 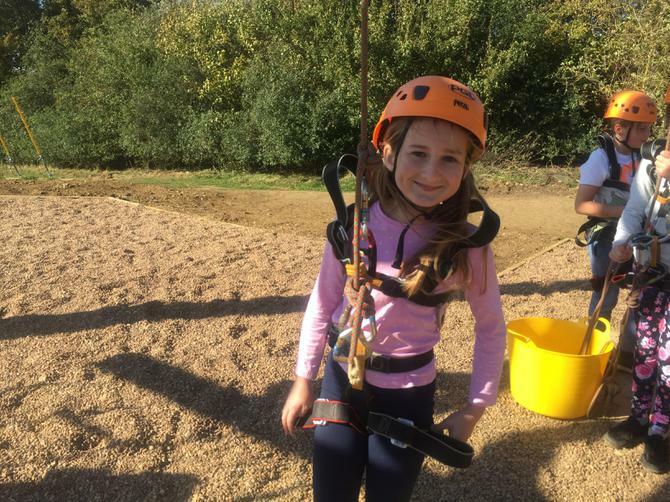 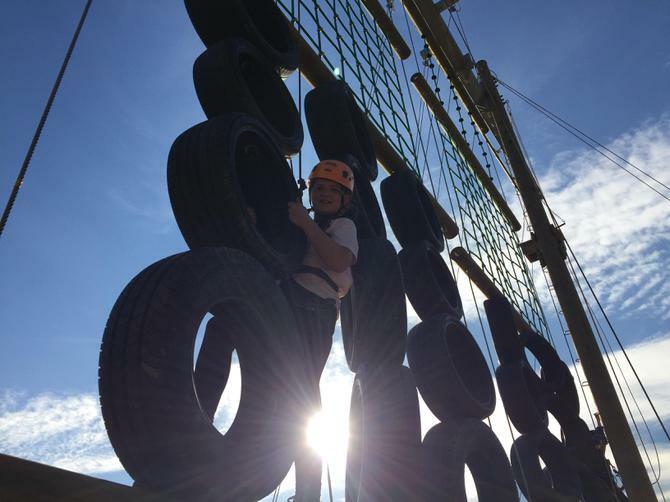 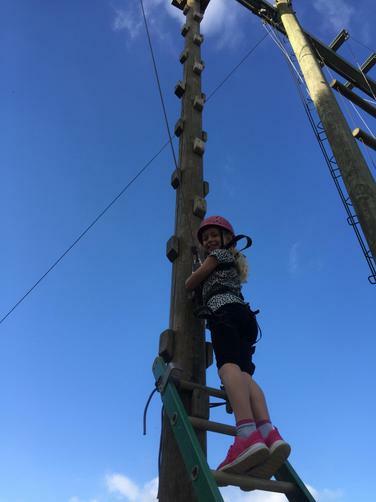 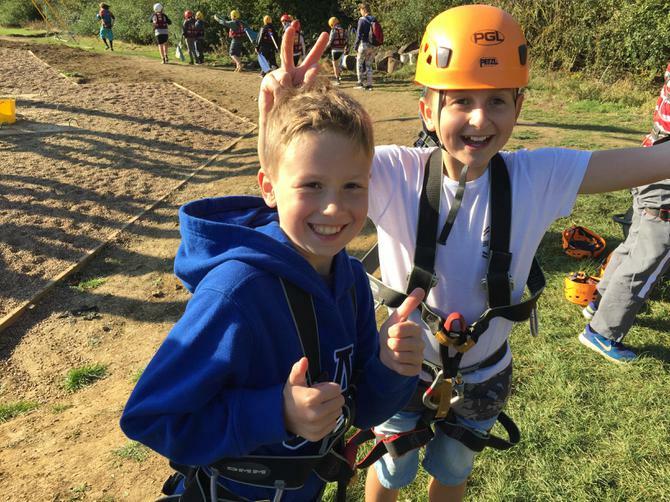 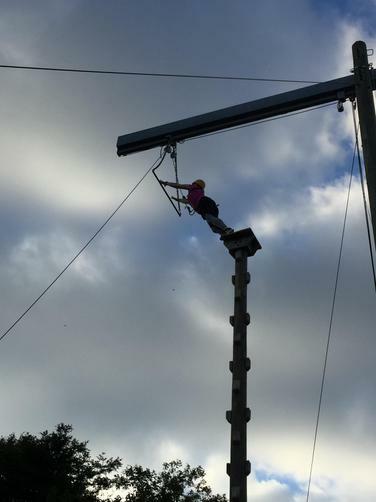 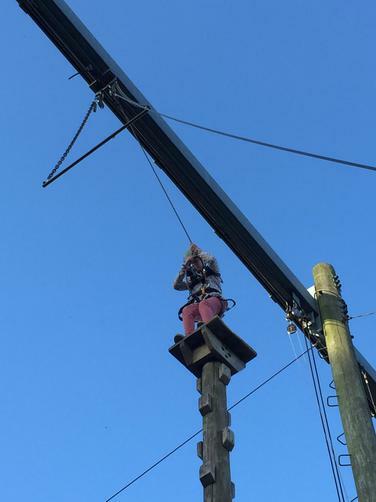 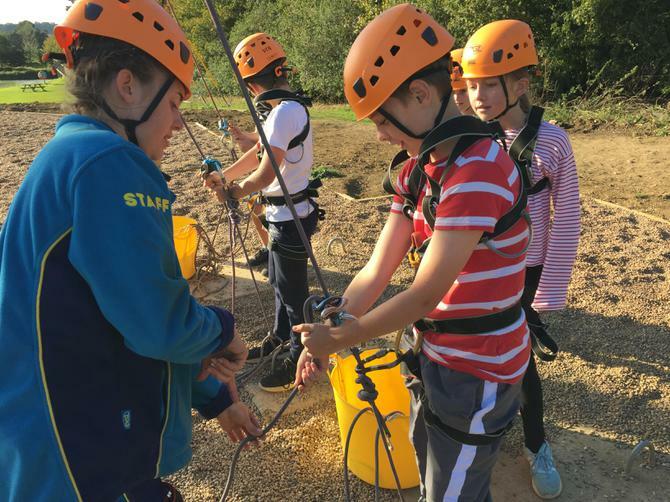 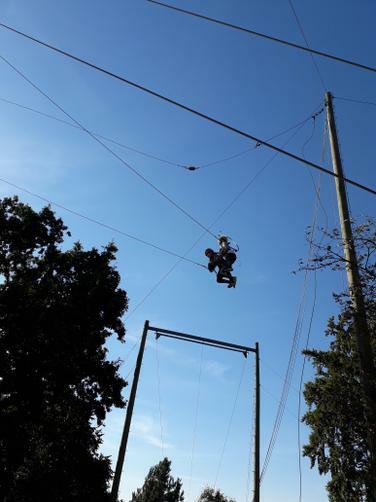 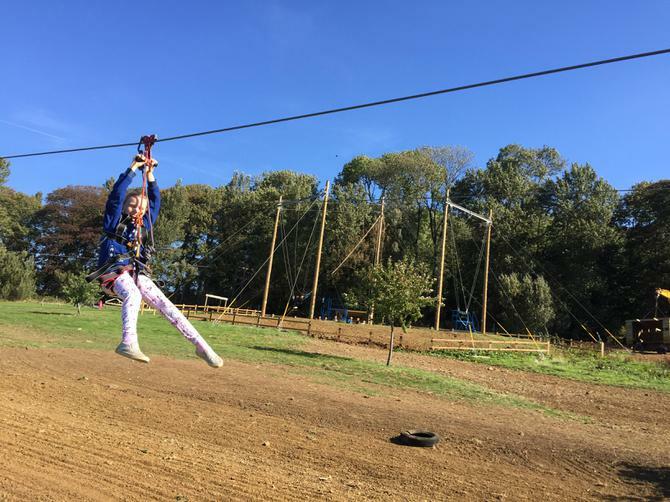 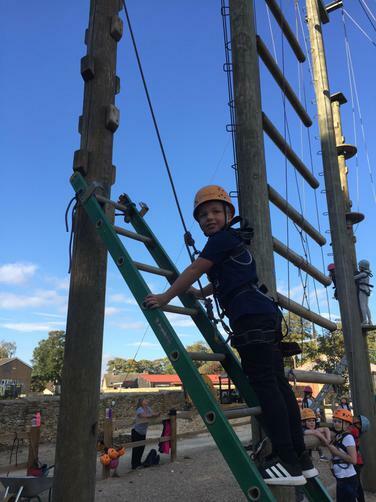 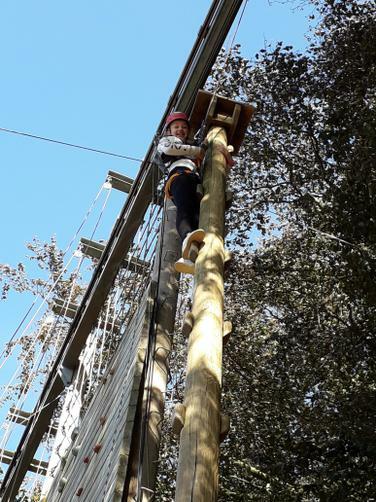 Our second morning activities consisted of zooming along a zip wire, taking a leap of faith from the top of a telegraph pole towards a trapeze bar and another group trying out the buggy building. 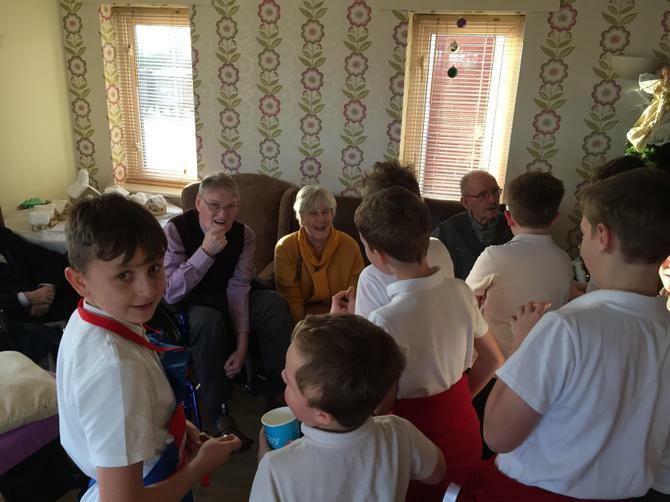 We all met up again for lunch at 1.10pm, and we were certainly ready for it! 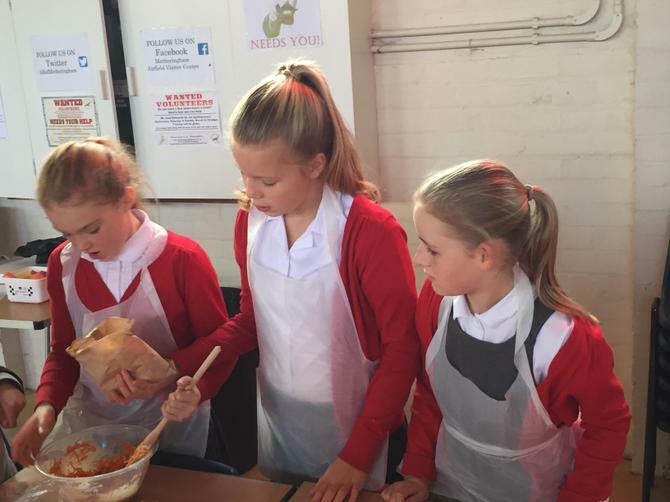 We feasted on jacket potatoes with cheese, chilli or beans; or maybe even all 3! 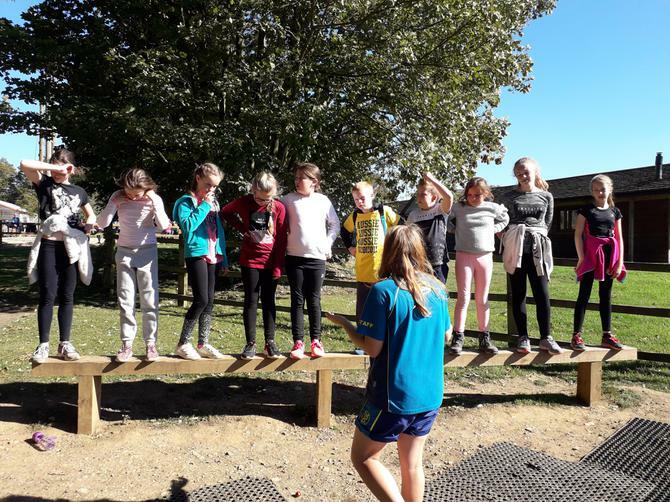 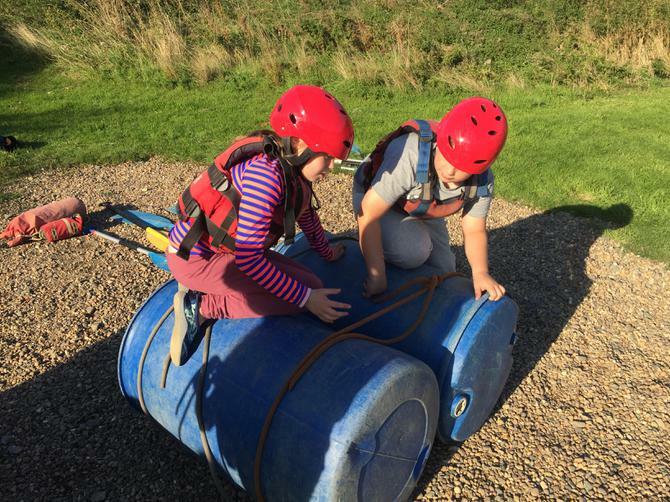 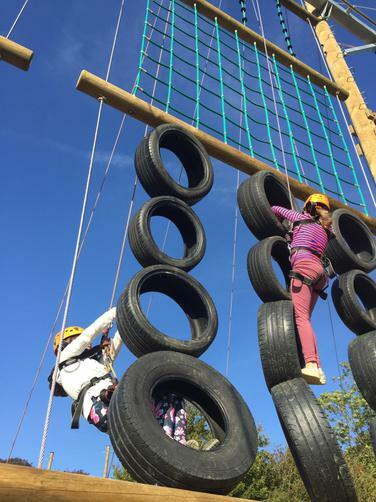 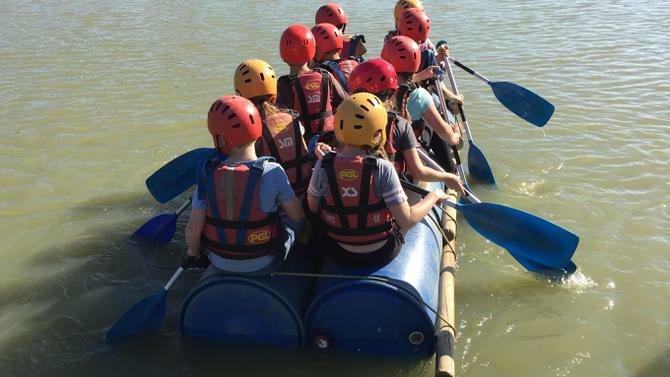 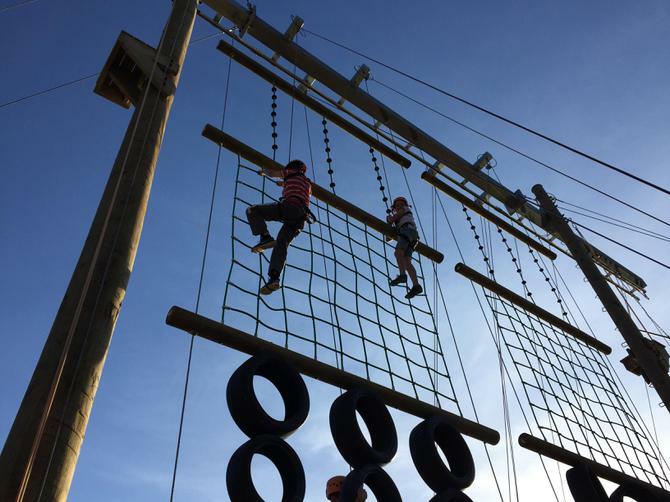 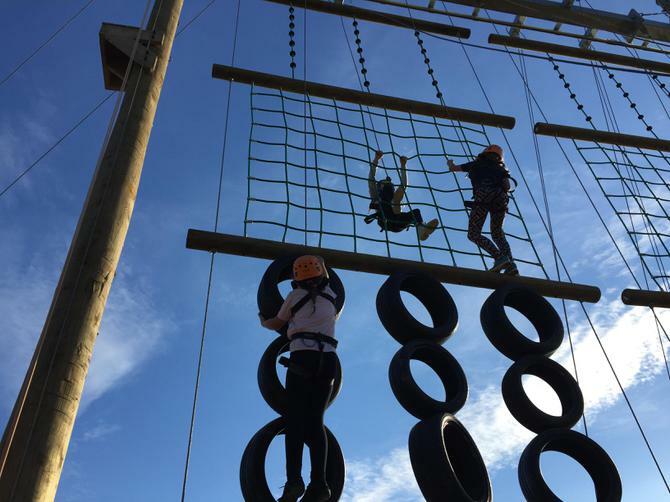 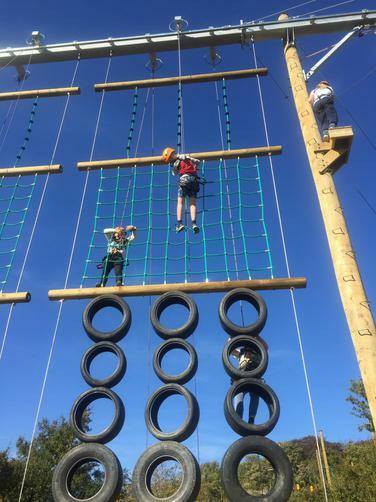 But there was no time to relax as we were then called for our afternoon adventures of raft building, the giant swing and the ‘vertical challenge’ an assault course going straight up! 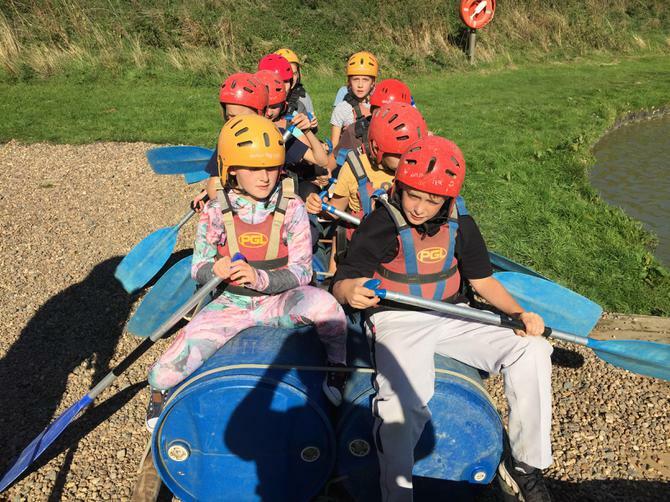 At 5.30pm, our activities came to an end and we quickly changed before heading to dinner just after 6pm. 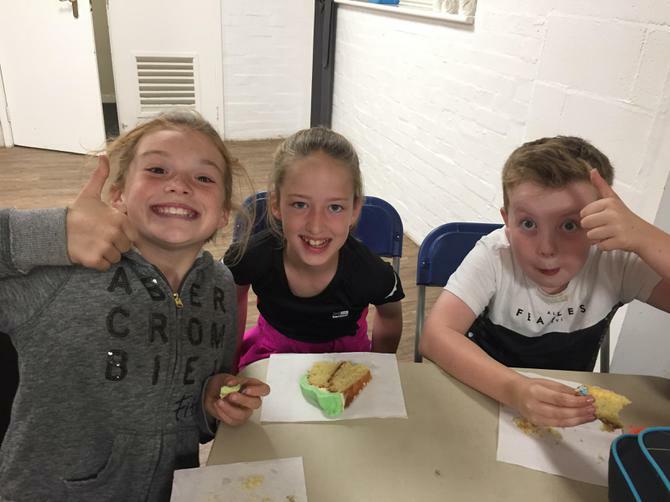 Tonight there was a choice of meatballs with pasta or chicken pies with roast potatoes and vegetables, along with all of the usual salads, and lemon drizzle cake for dessert! 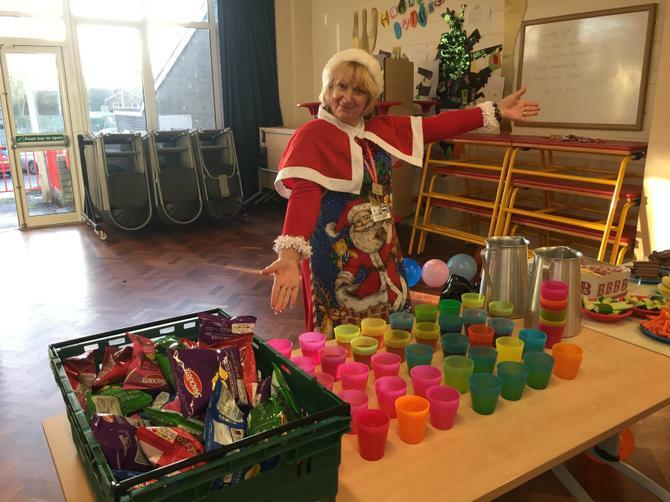 After that, we collected our purses and wallets and went over to the shop to buy ourselves a drink and sweet treat as a reward for all of our hard work during the day. 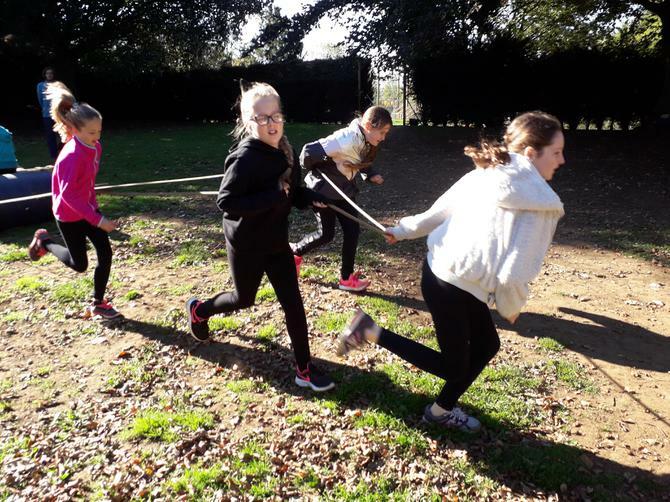 But we didn’t have too long to enjoy them as we were soon whisked off for our evening activity; a large-scale game of capture the flag in the dark! 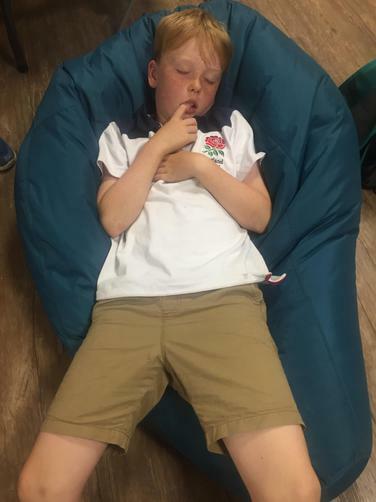 It’s been a long, exhausting day…here’s hoping for restful night! 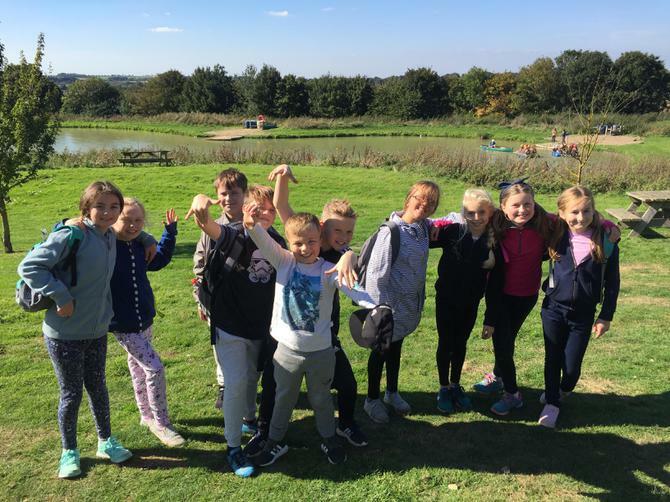 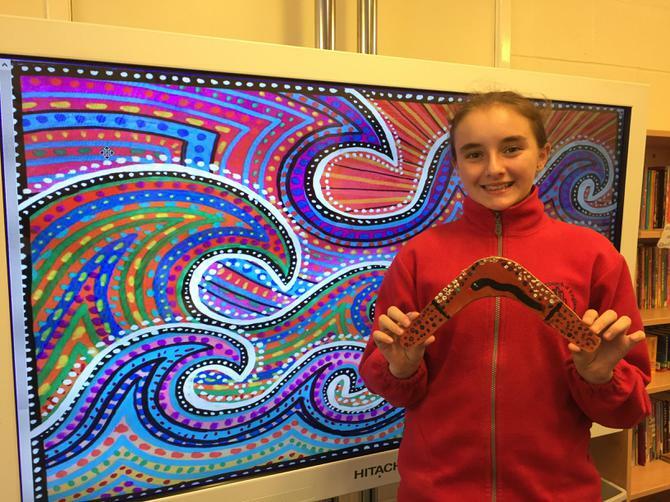 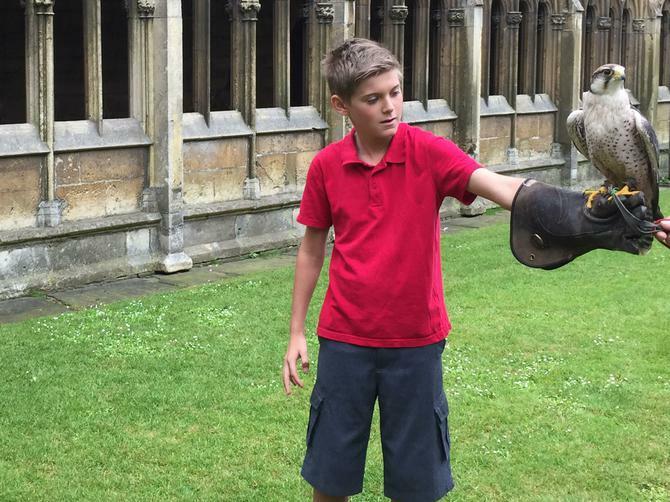 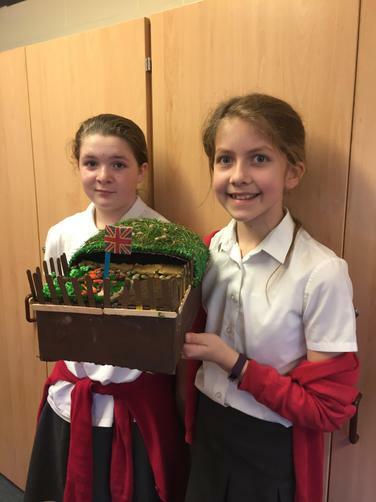 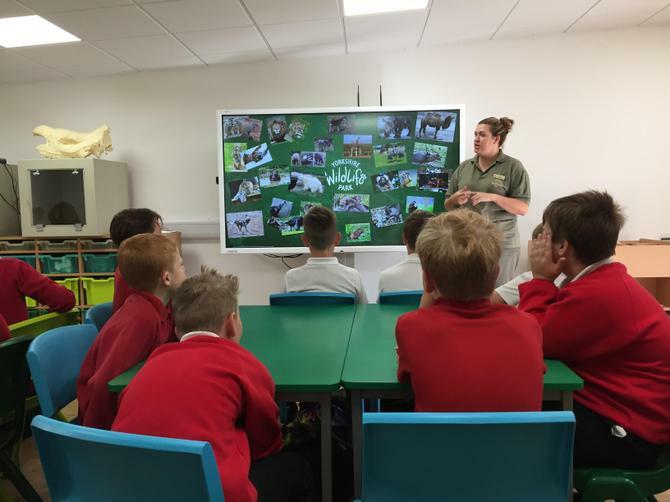 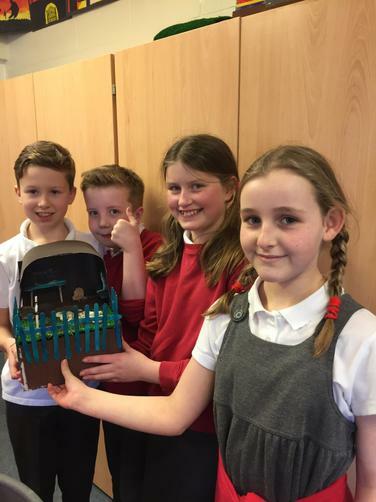 Please look through the gallery below to see some of our highlights! 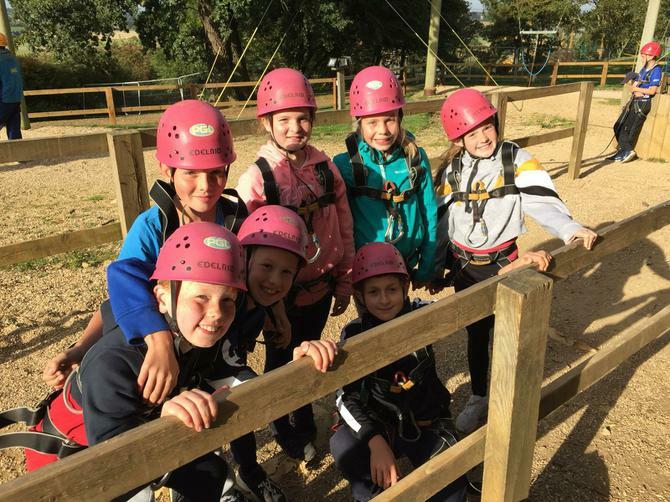 This morning we awoke with much fresher faces from a great night’s sleep. 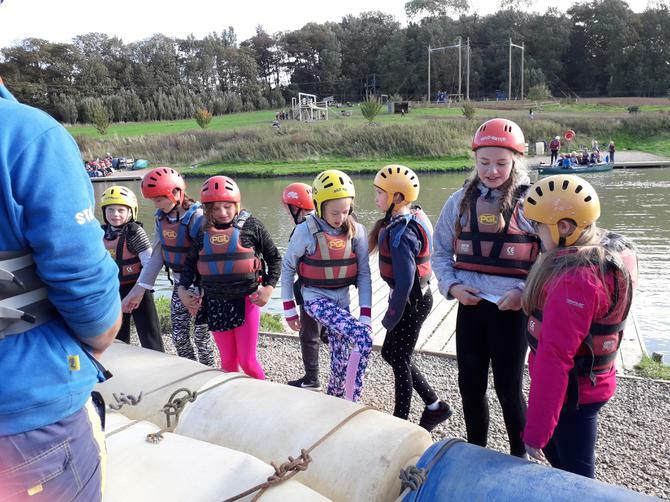 We began with breakfast, before getting stuck into a full day of activities once again. 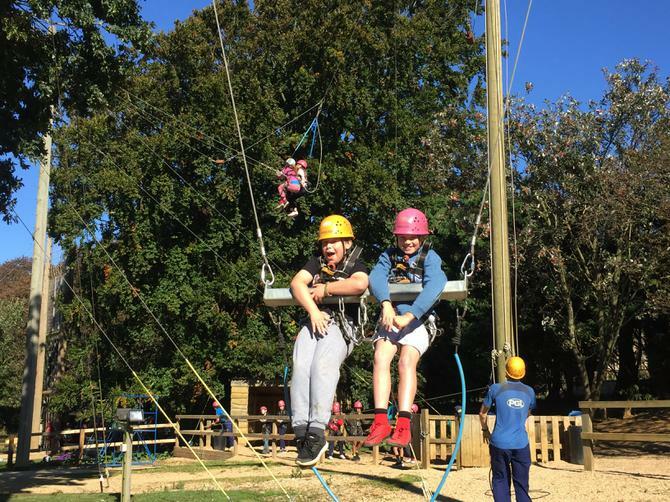 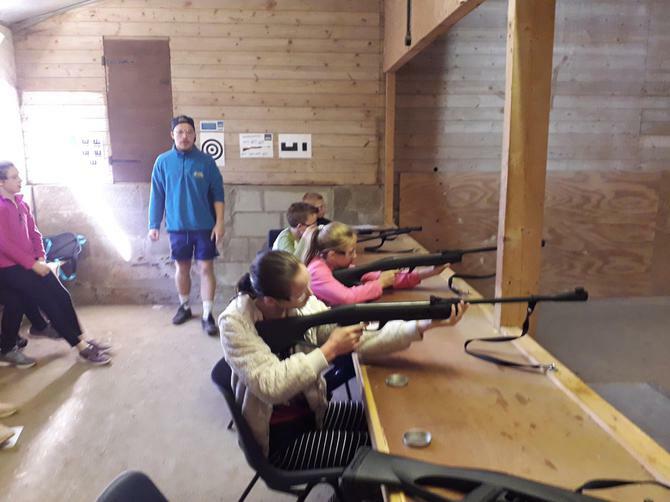 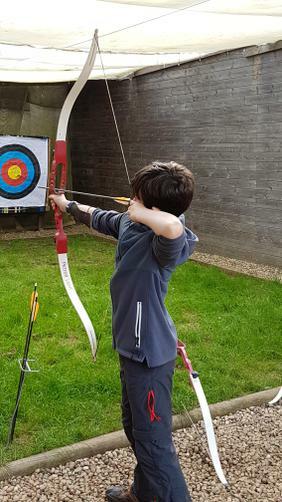 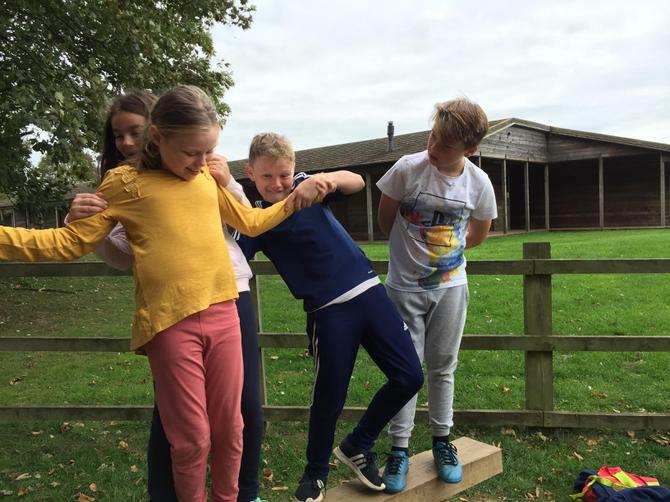 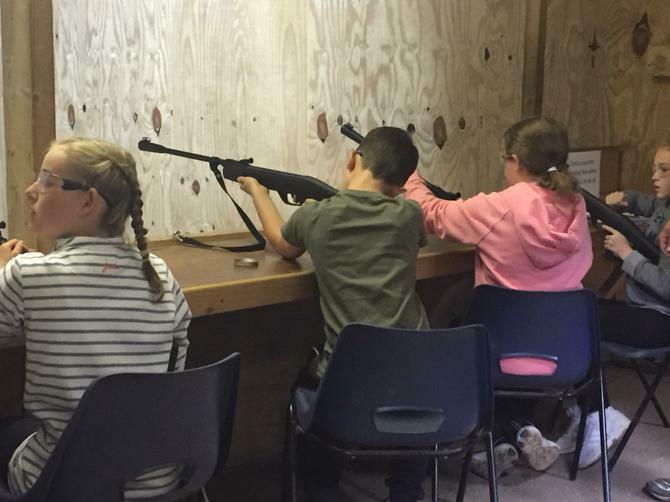 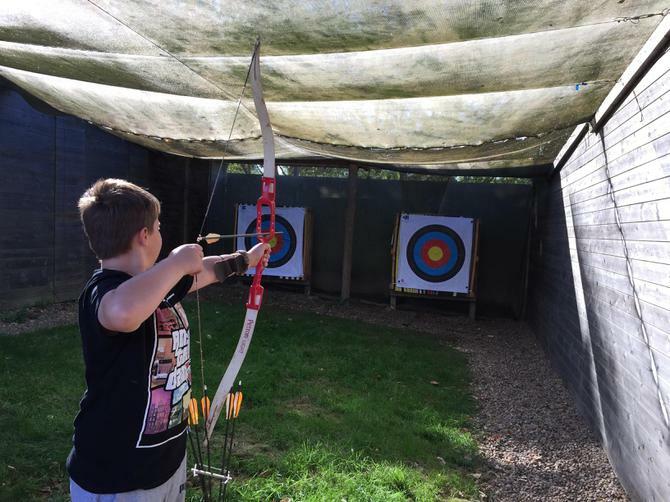 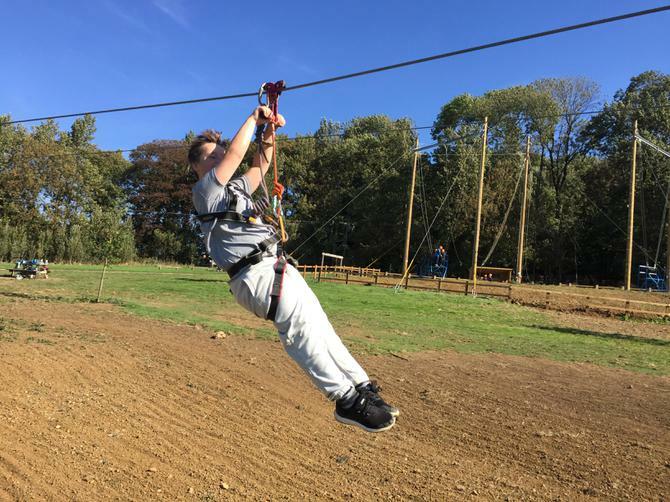 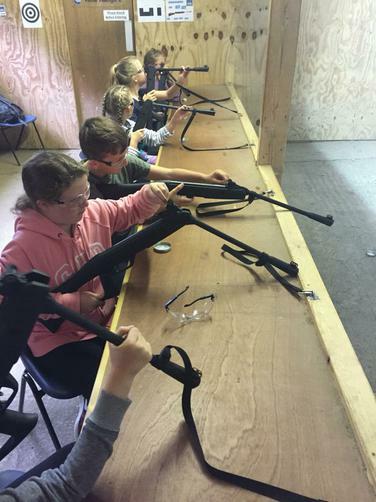 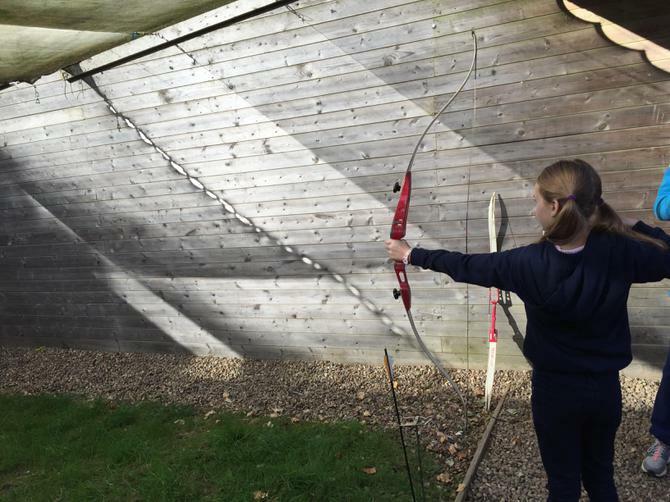 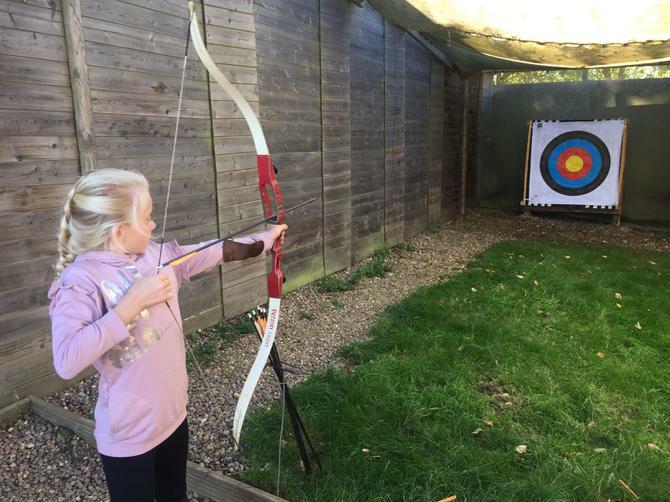 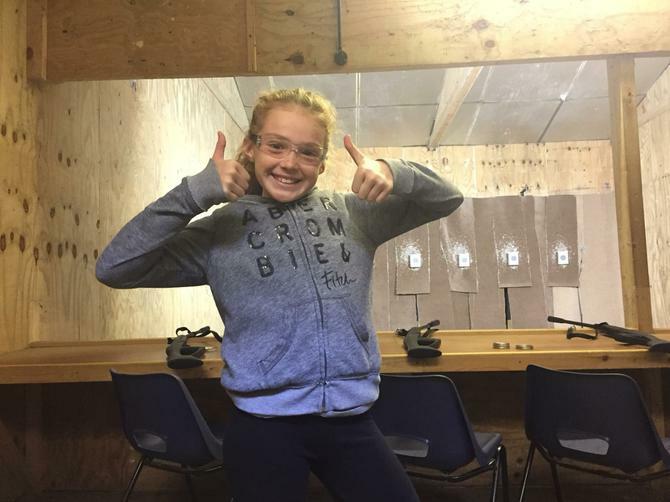 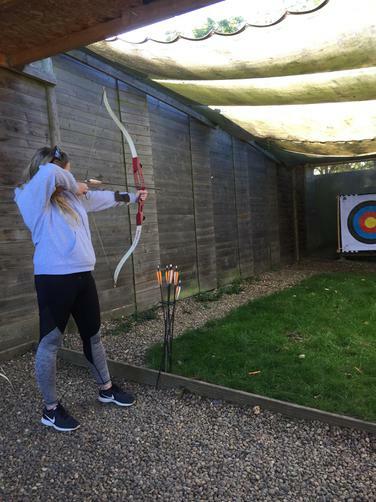 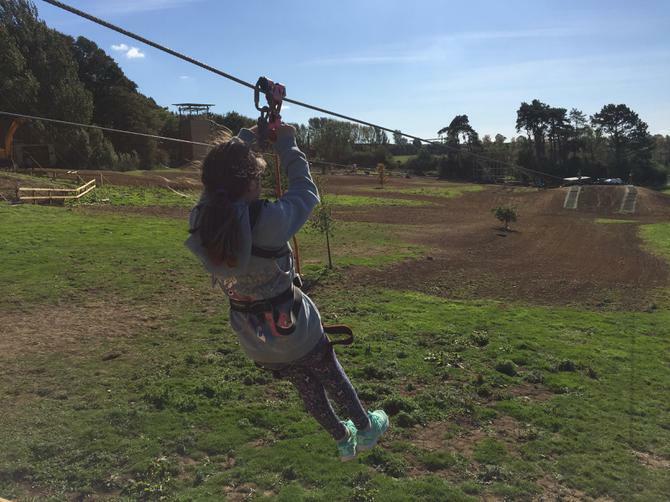 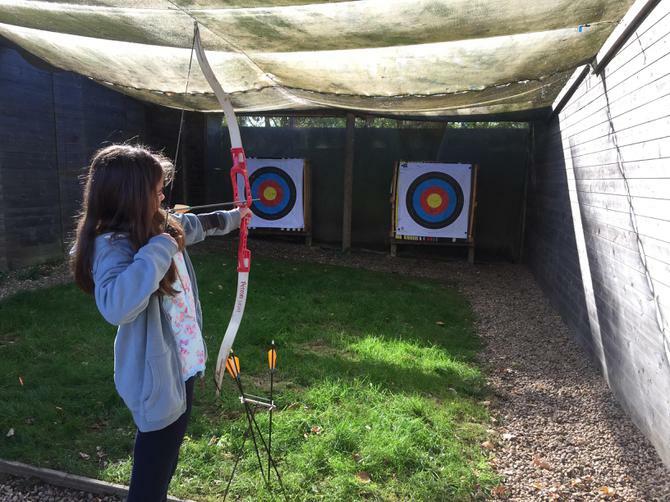 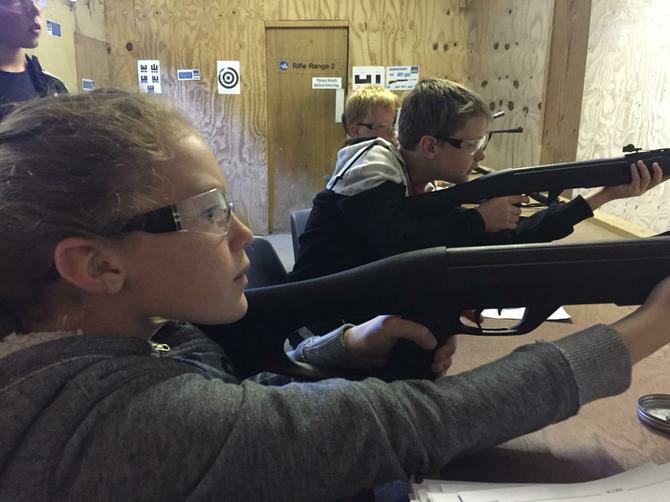 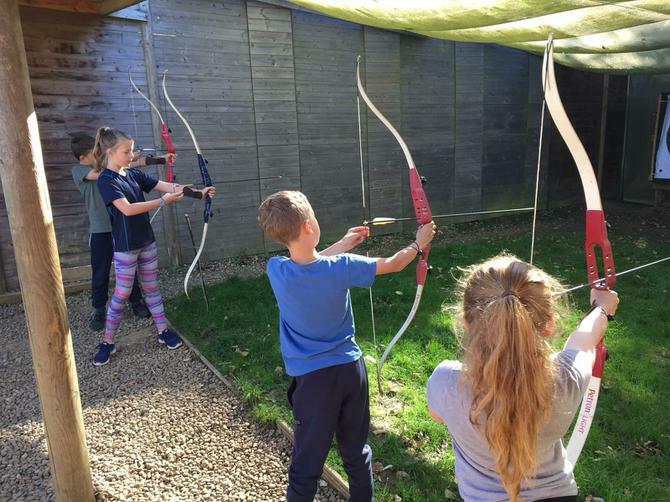 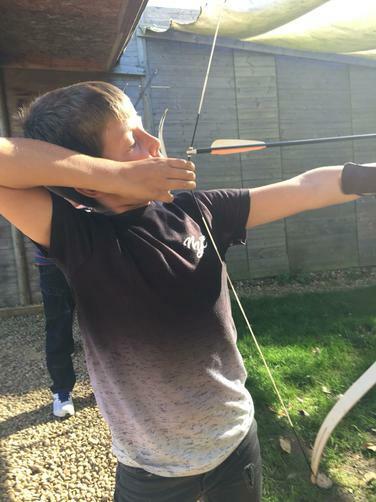 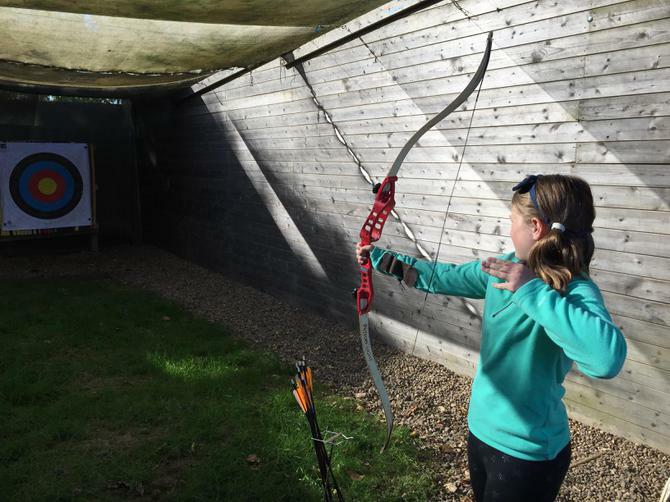 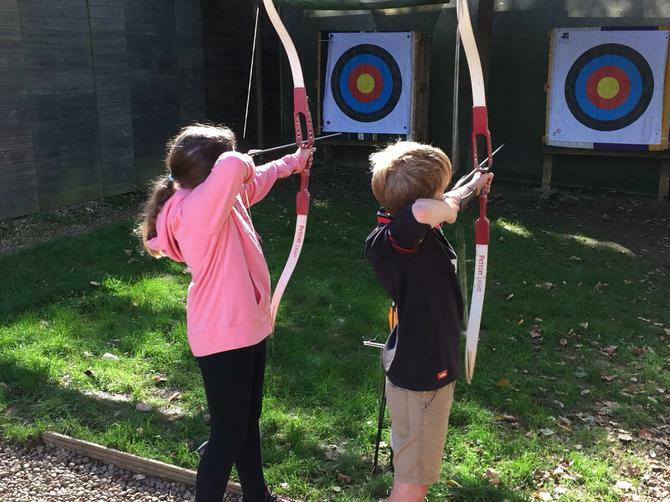 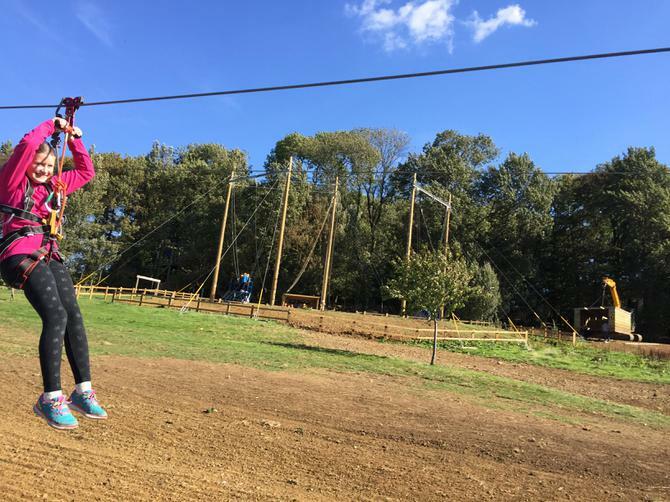 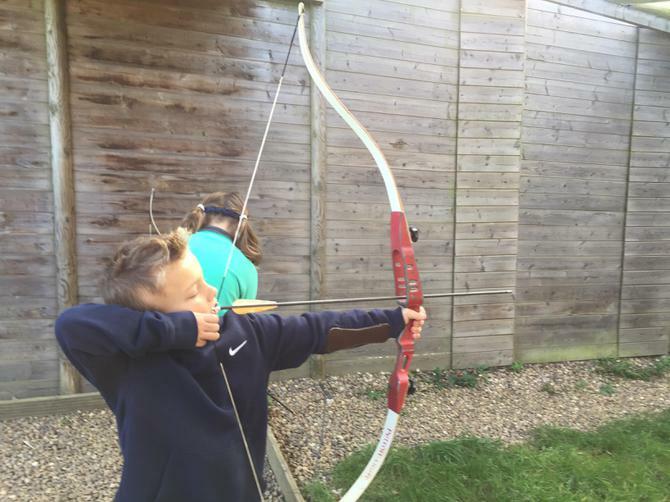 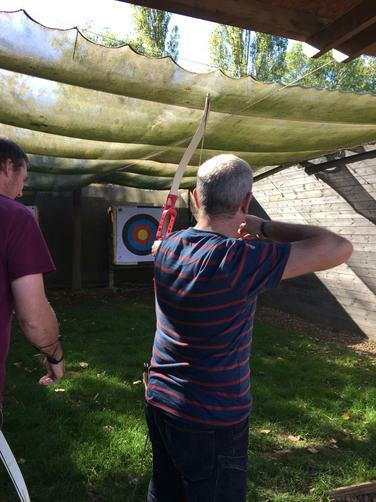 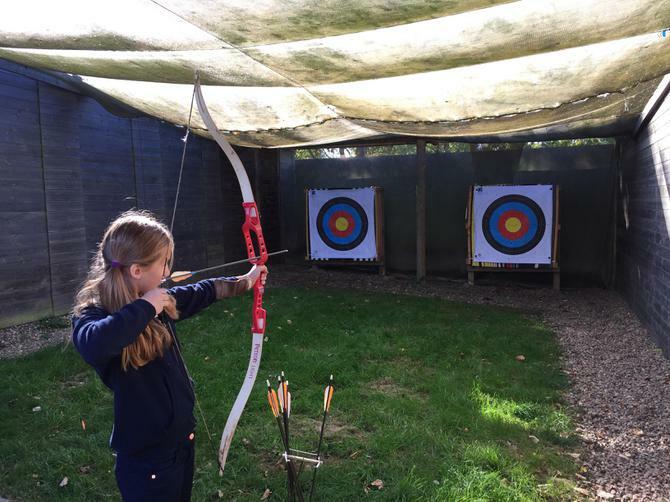 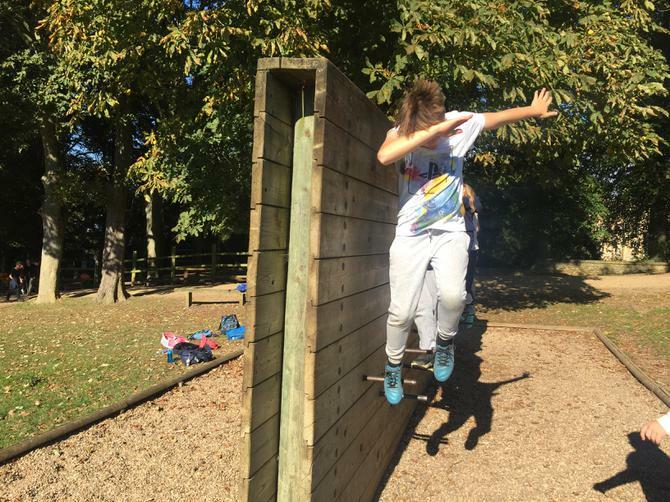 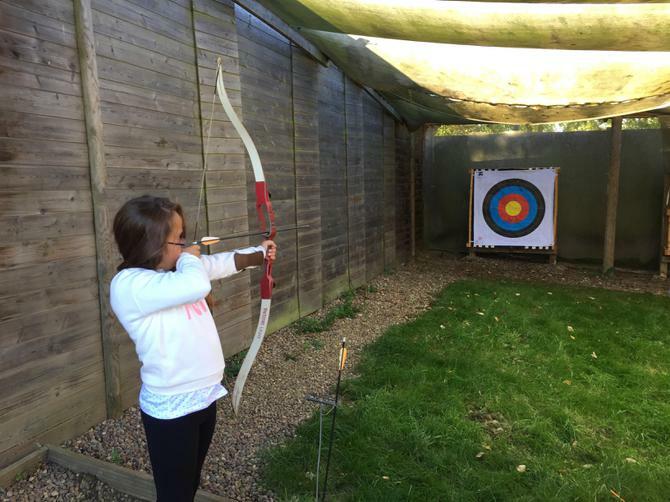 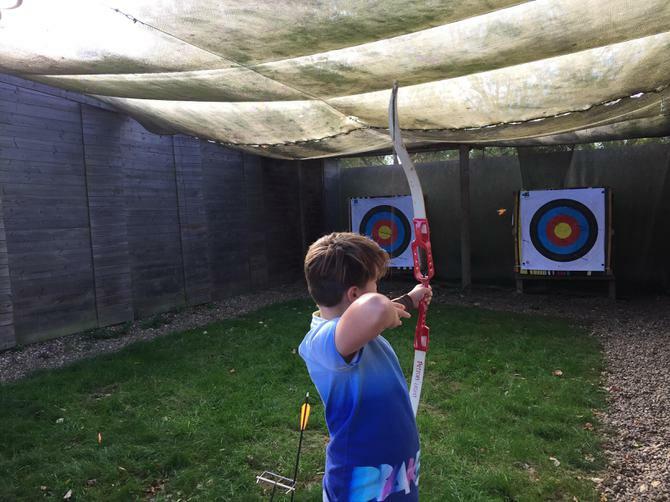 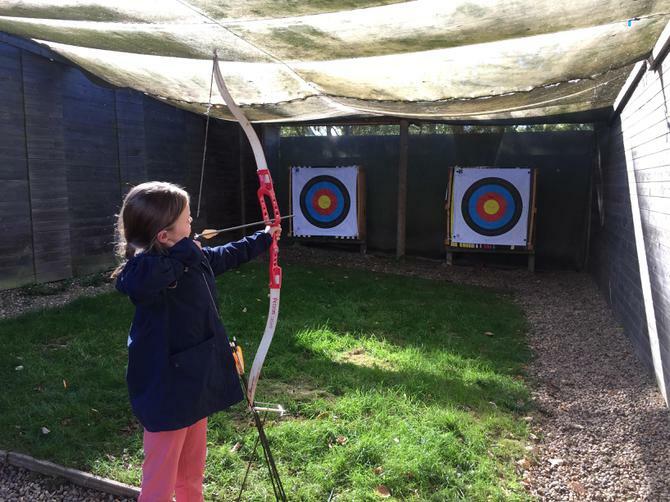 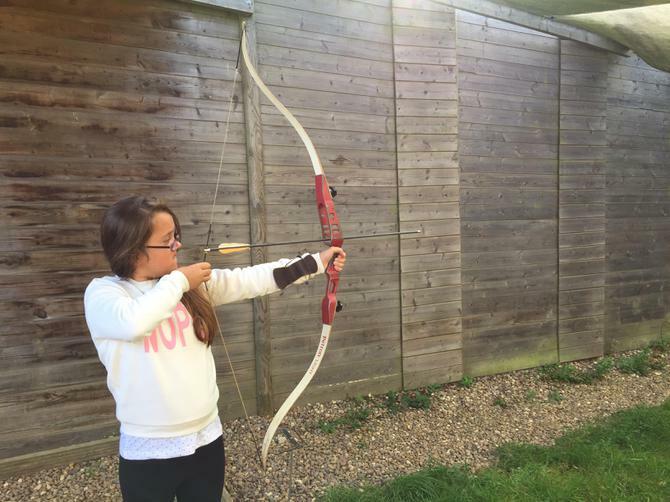 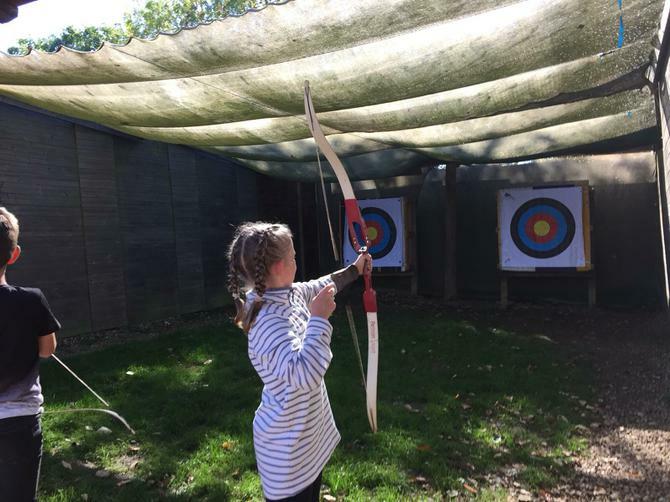 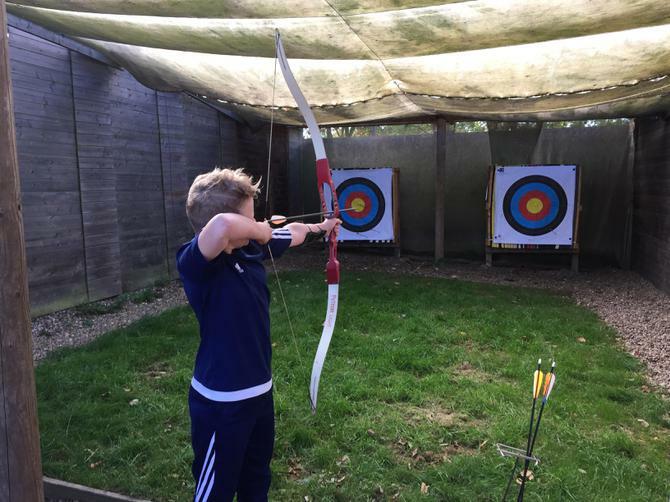 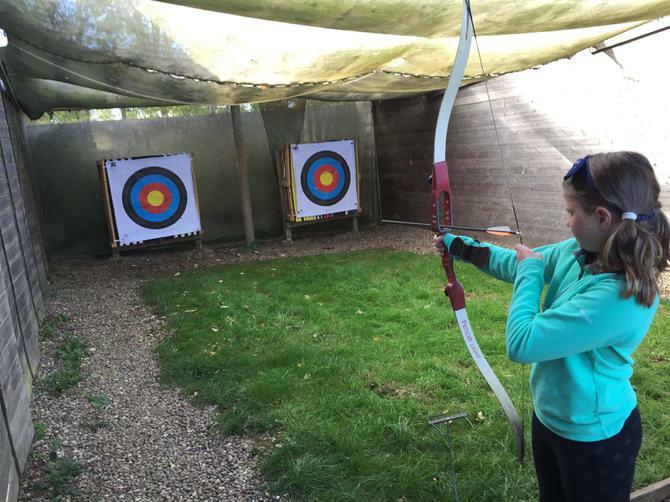 Throughout the day, the different groups tried out: orienteering, archery, rifle shooting, fencing, and the ultimate – the giant swing! 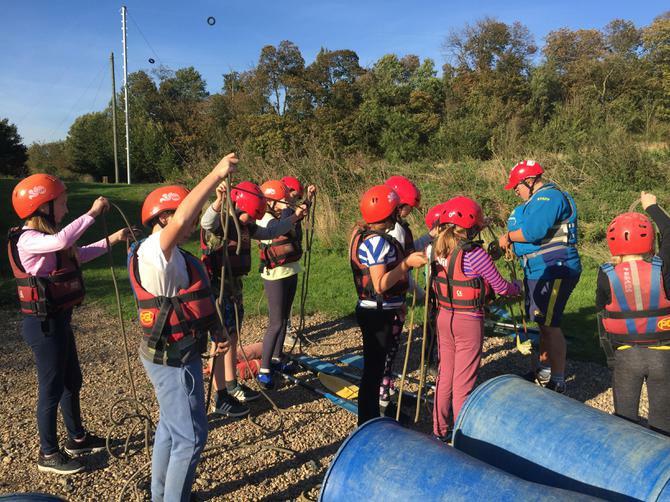 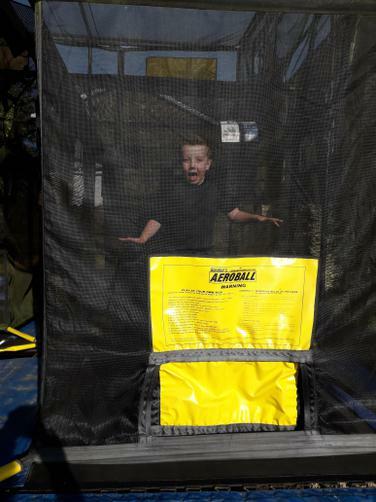 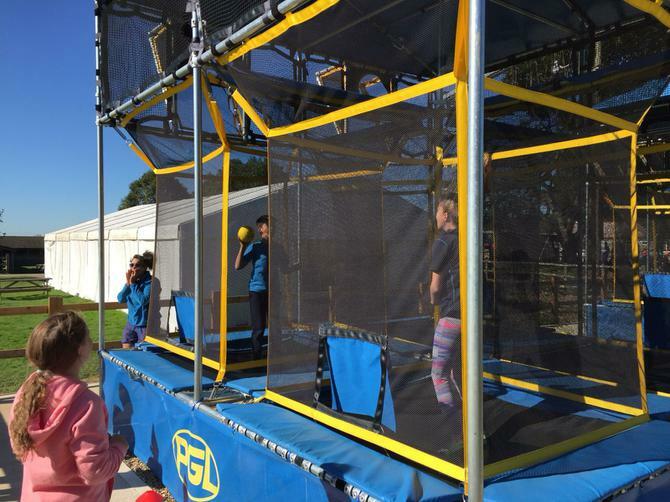 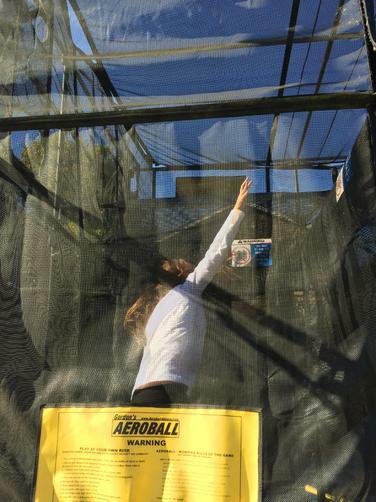 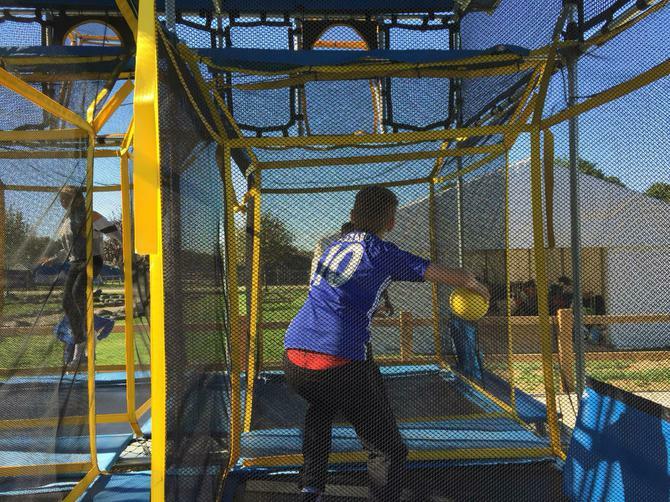 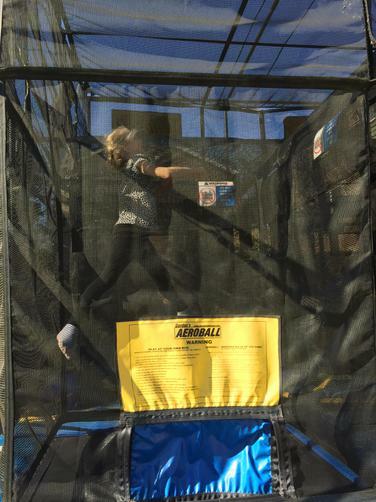 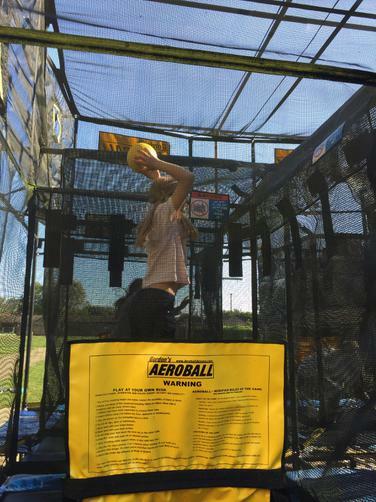 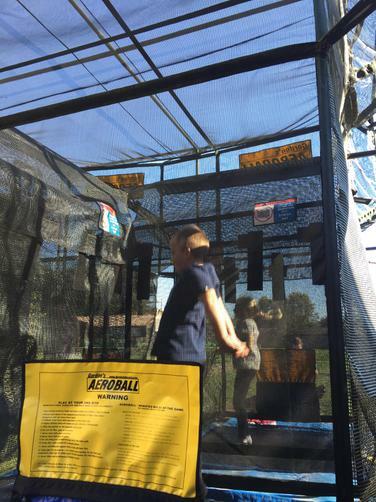 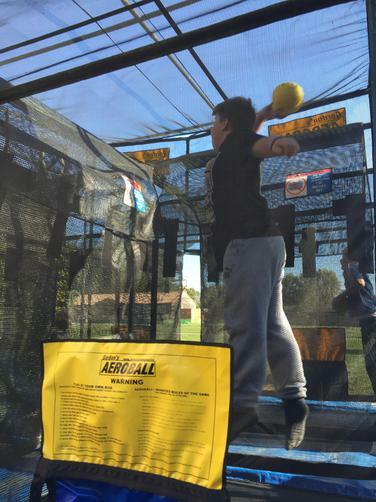 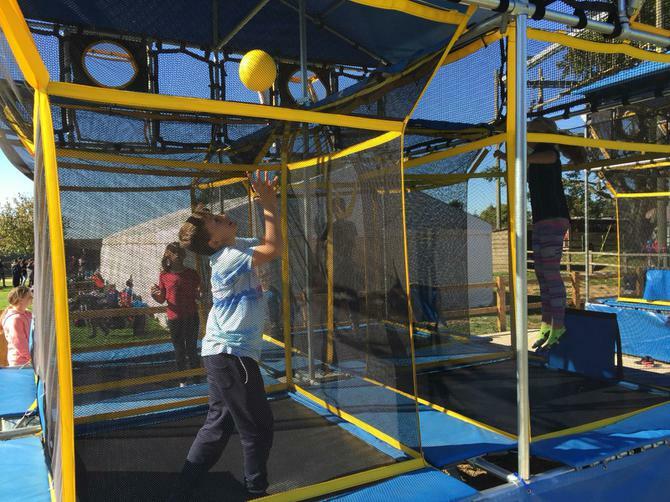 Others also had their turn on the vertical challenge, aeroball and raft building. 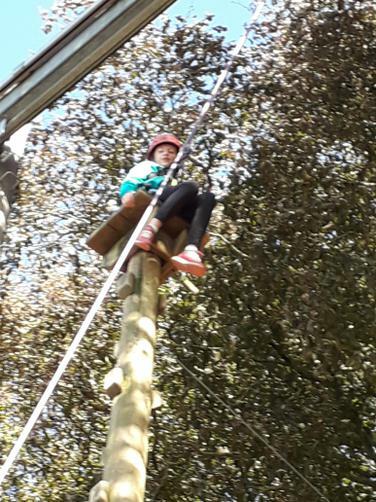 Another real test today has been the trapeze with others braving the leap of faith! 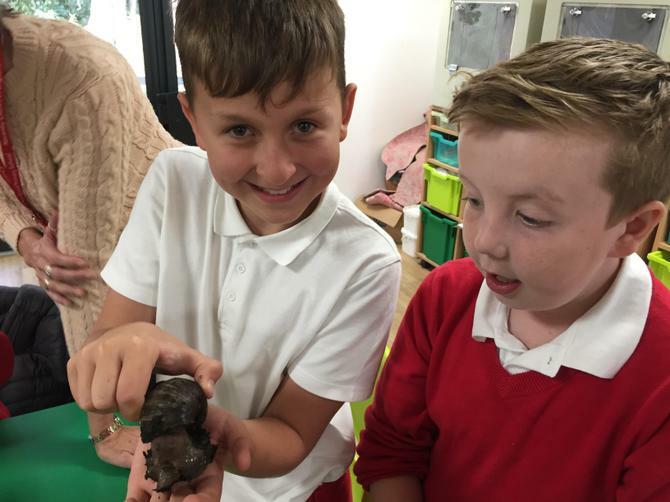 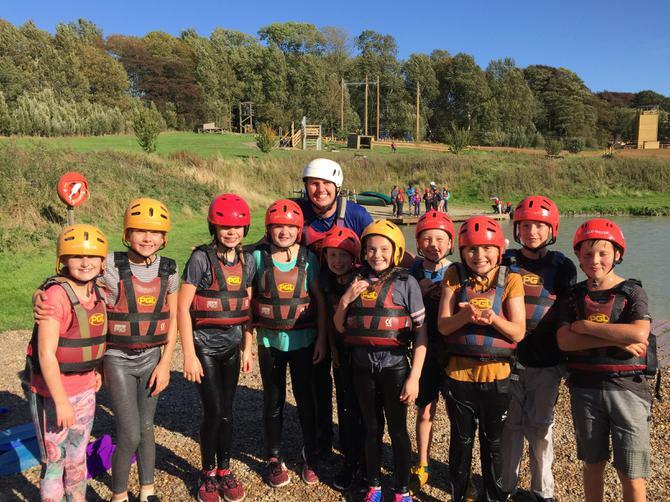 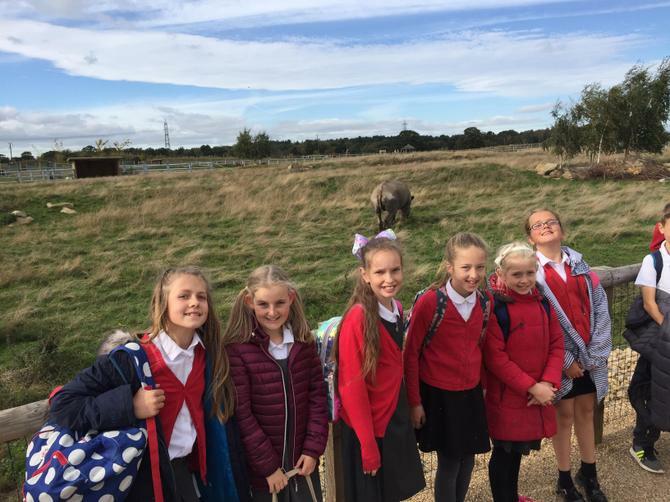 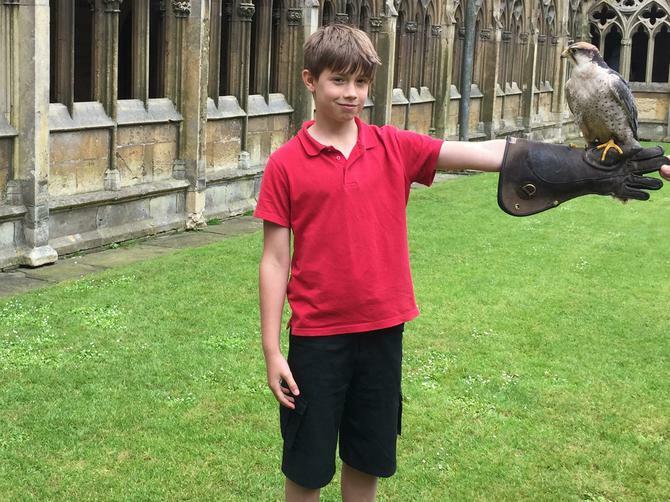 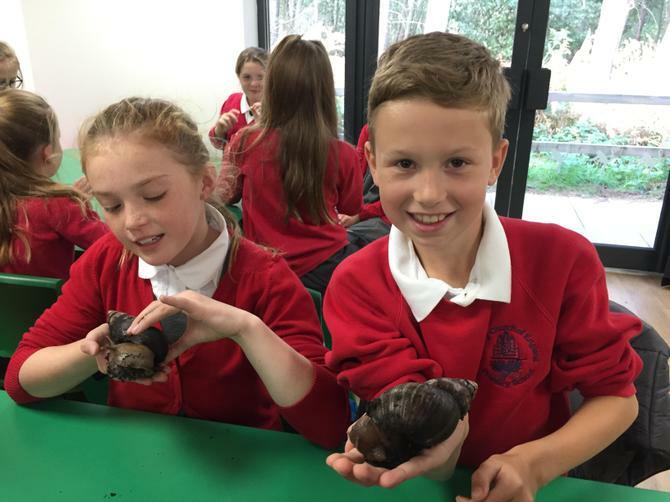 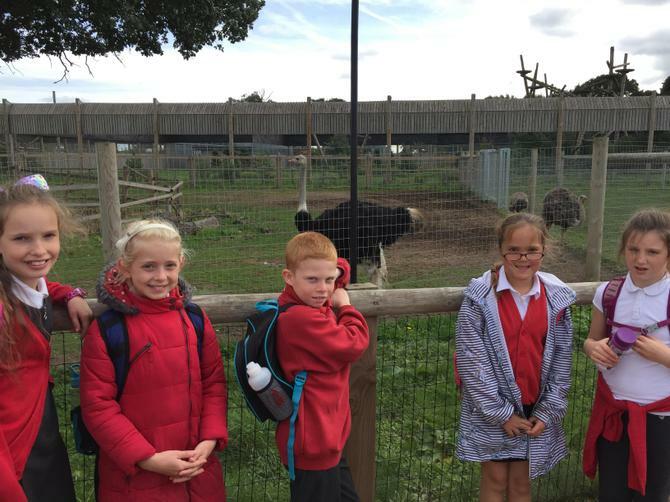 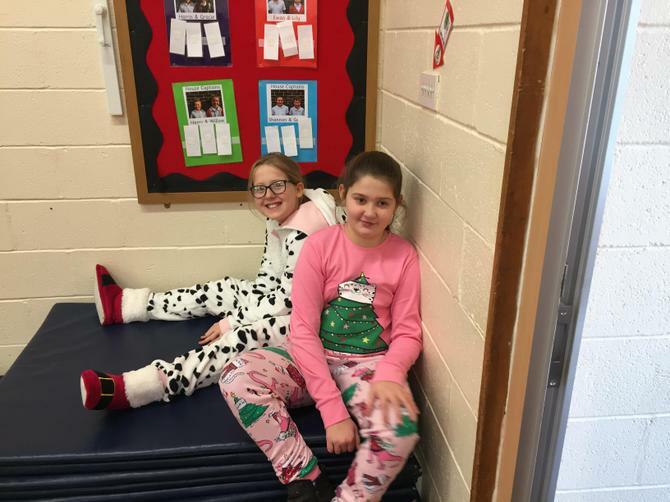 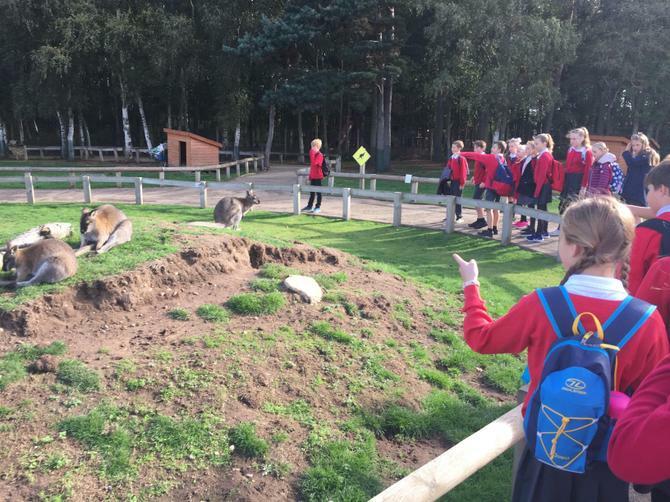 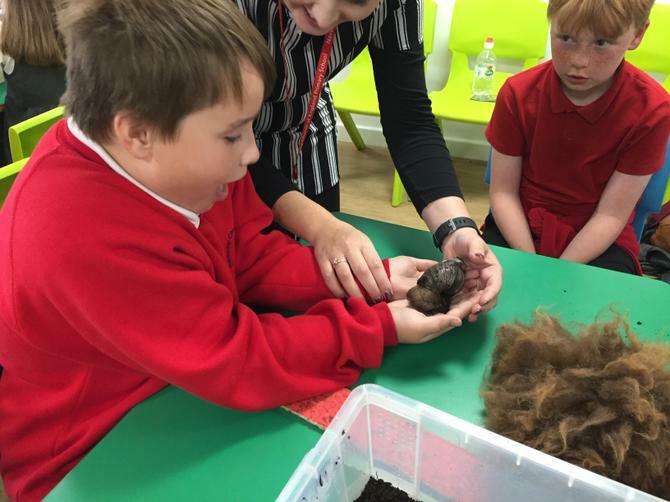 There are so many fantastic photos (Mr Hickerton, Mrs Bennett & Miss Sheardown have all been a bit snap happy), a selection are available below! 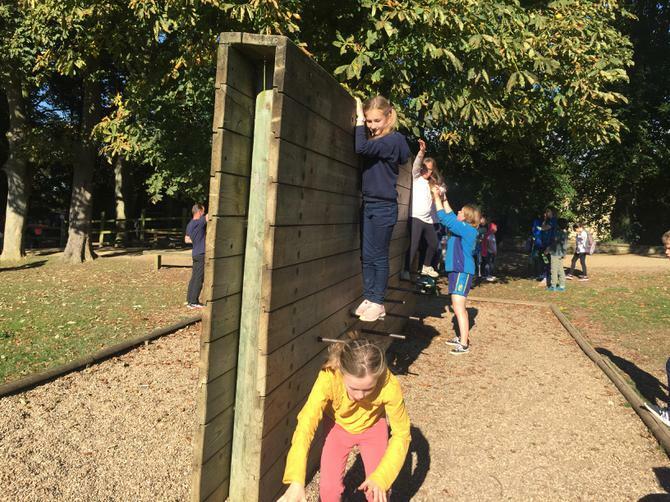 What a full-on day! 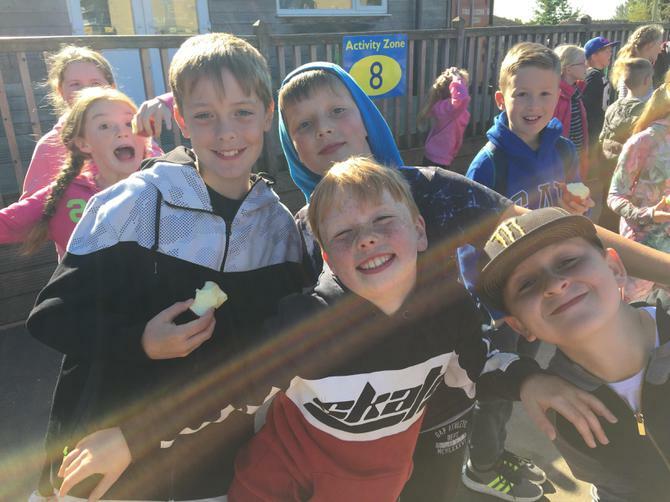 We awoke at 7.15am for a 7.40am breakfast ready to fuel ourselves for the day. 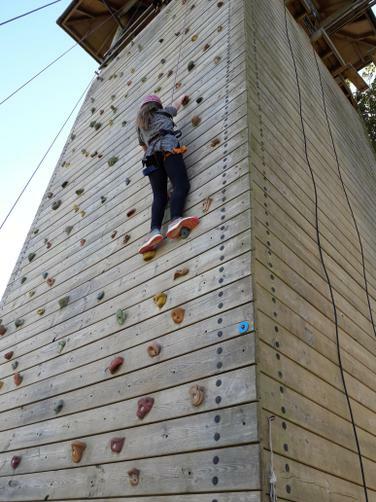 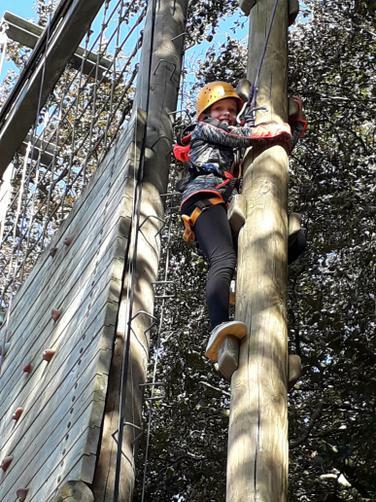 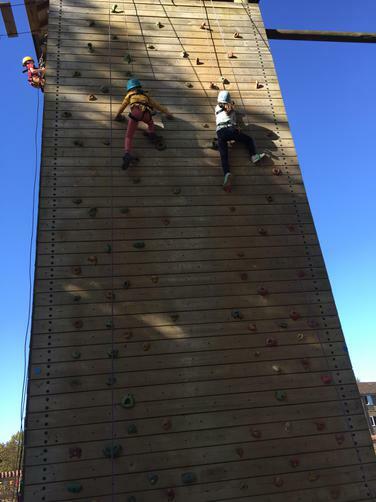 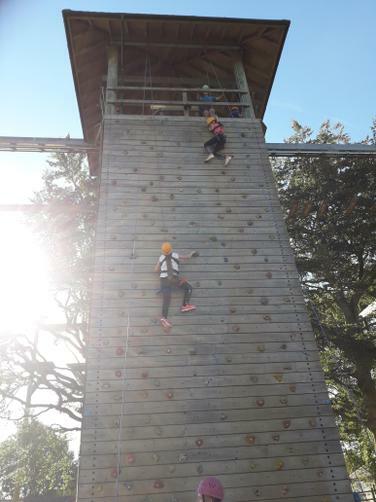 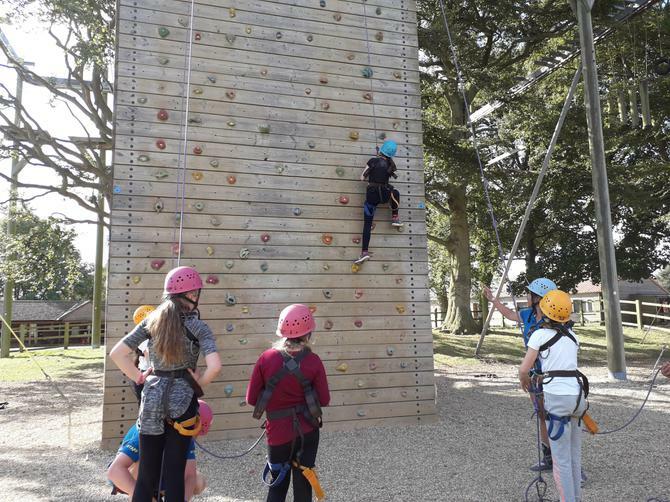 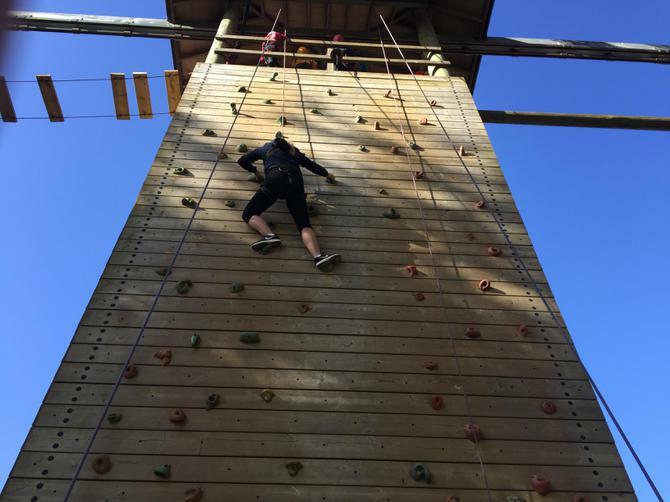 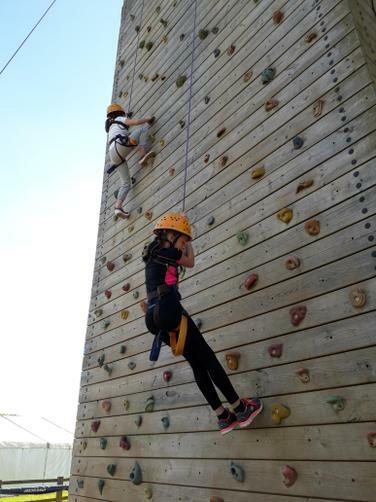 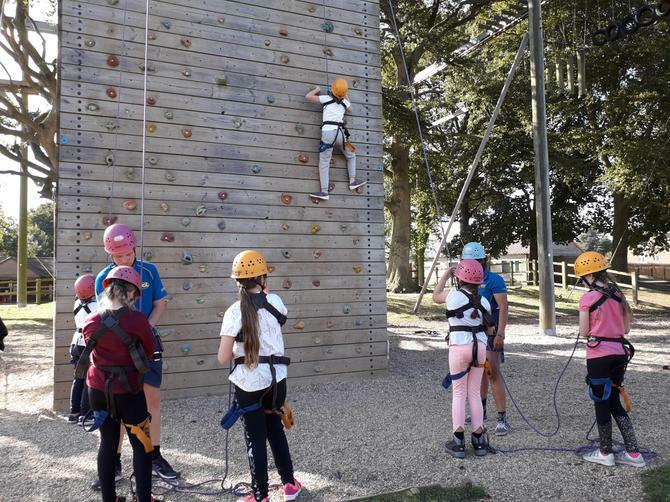 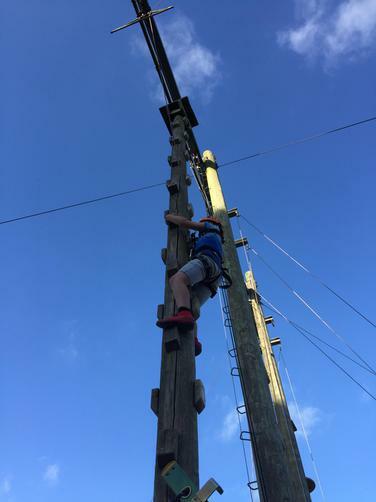 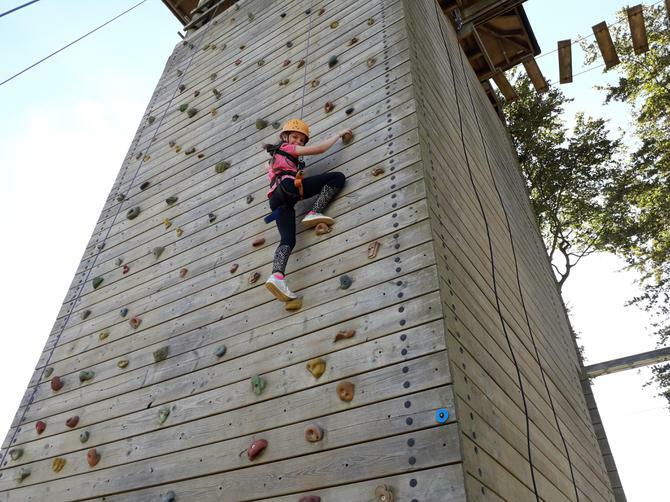 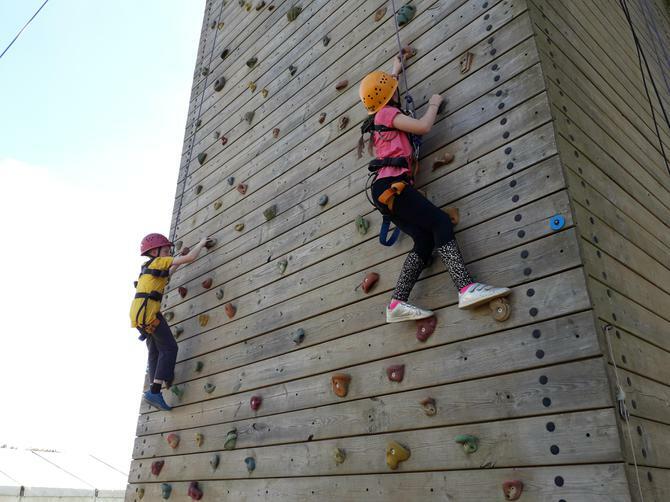 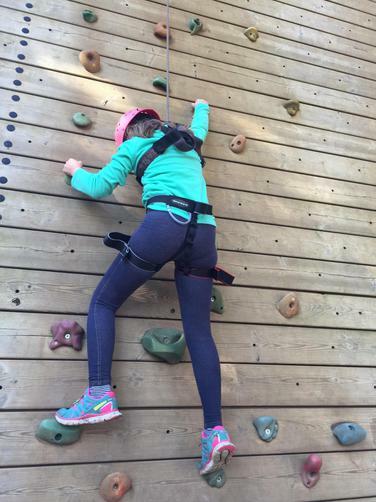 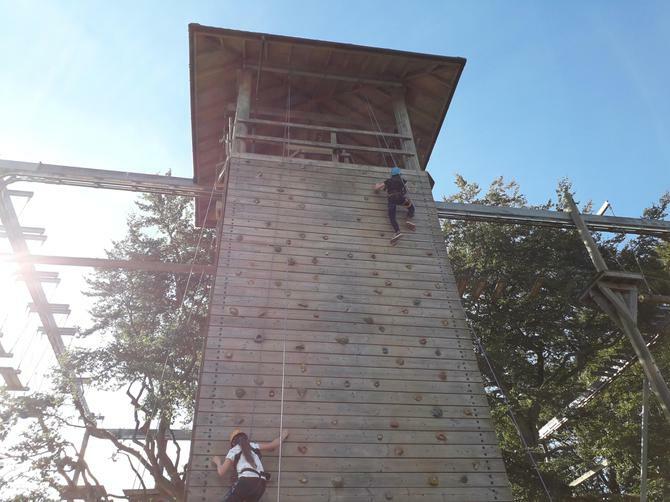 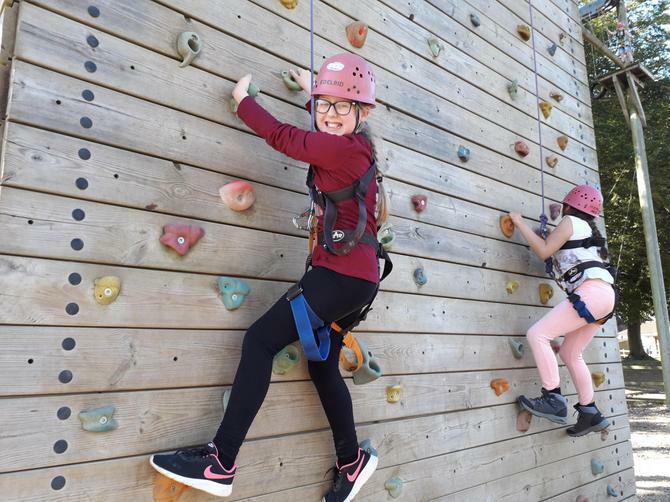 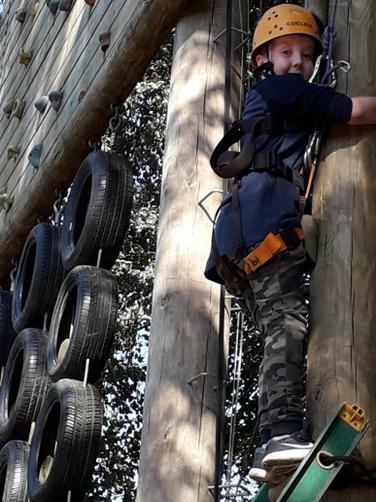 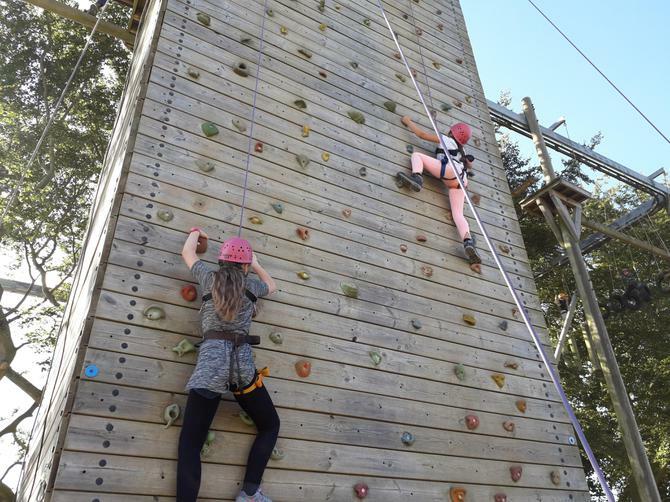 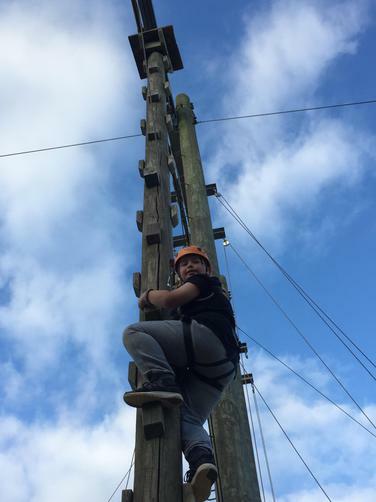 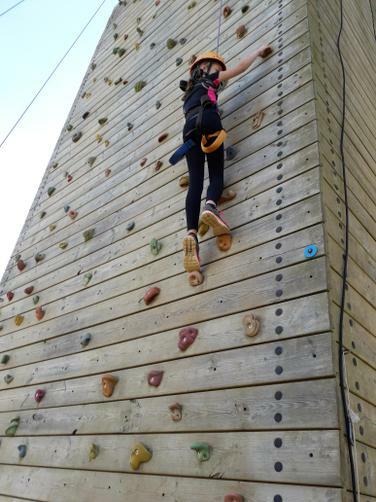 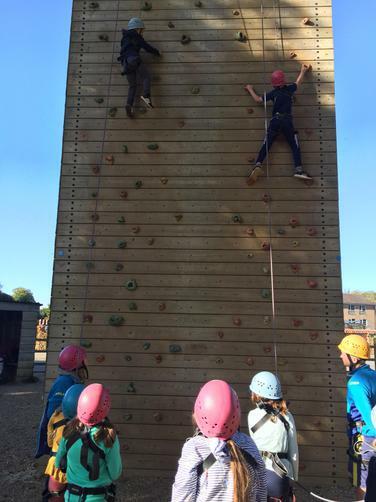 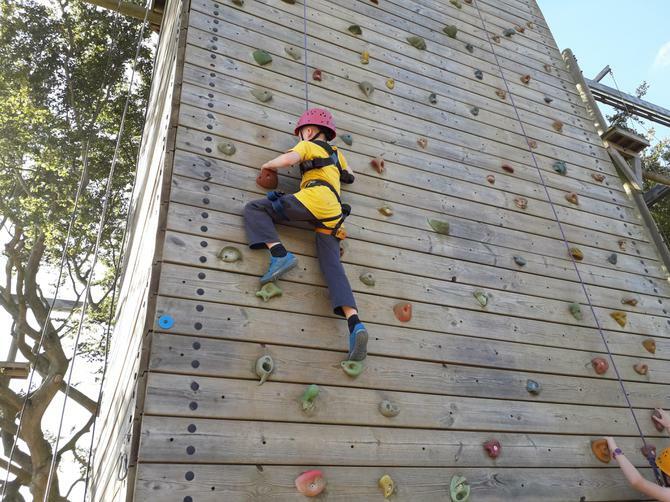 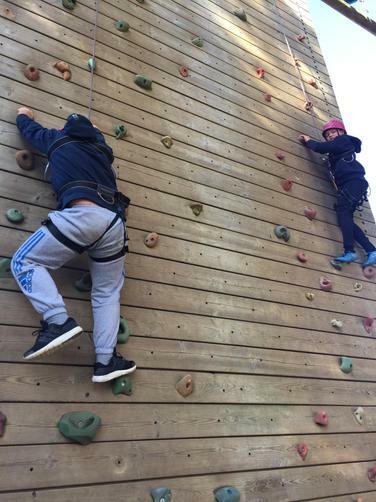 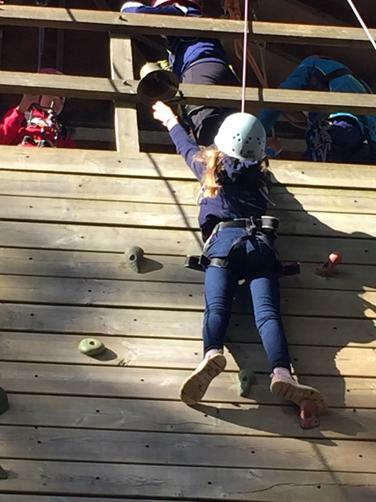 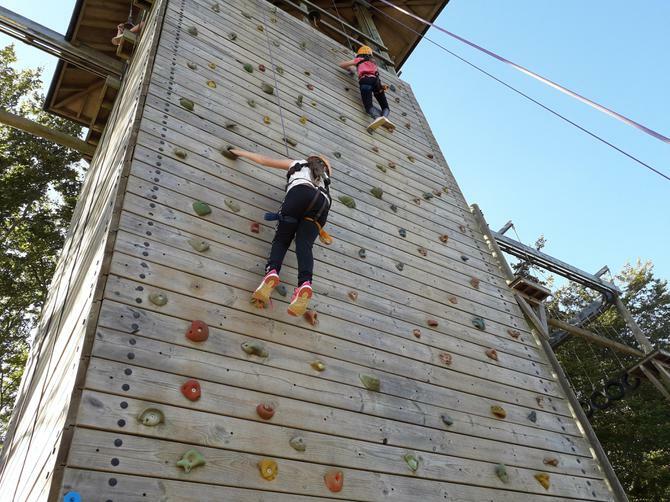 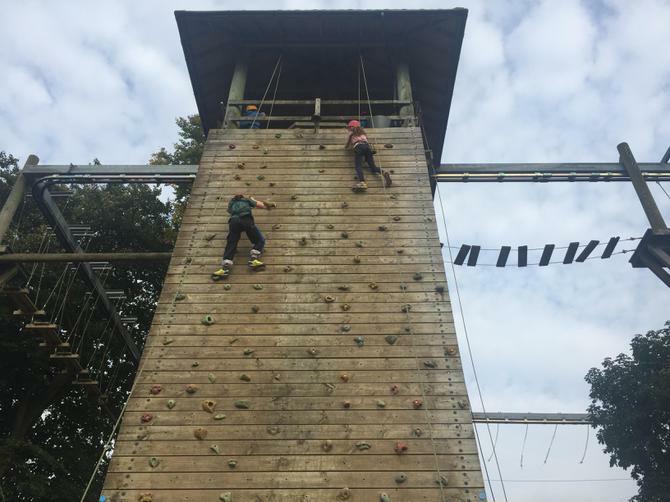 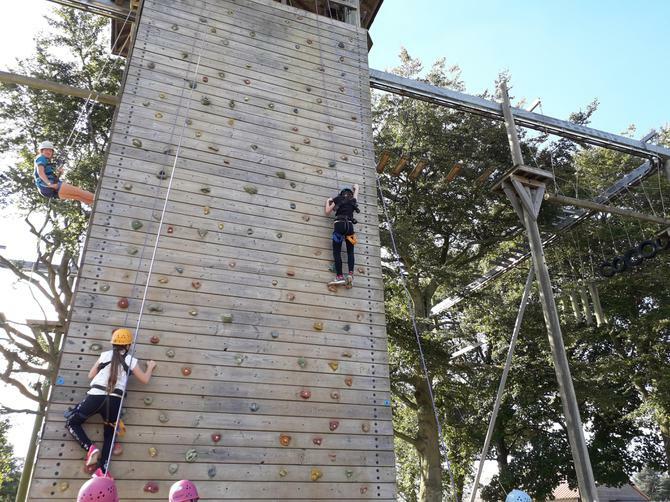 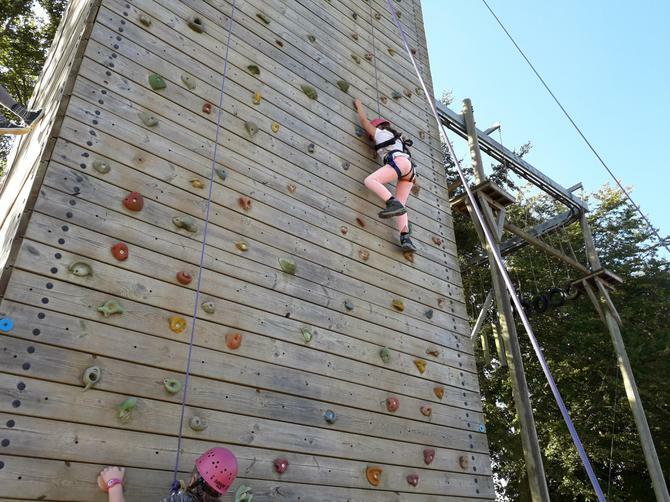 Our final full day consisted of fencing, problem-solving, buggy building, orienteering, zip wire and one group even took on the 35ft high climbing wall with a fantastic four reaching the top to ring the bell! 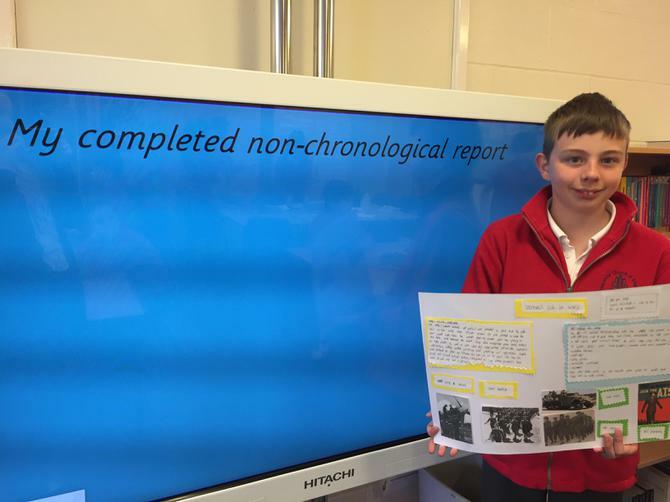 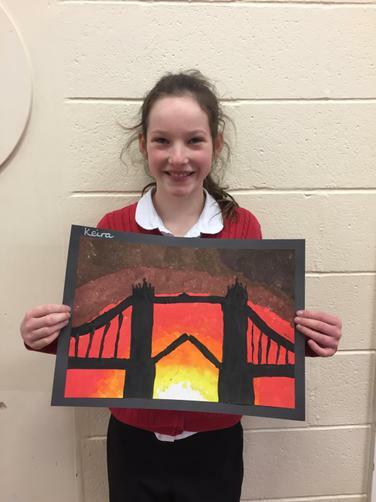 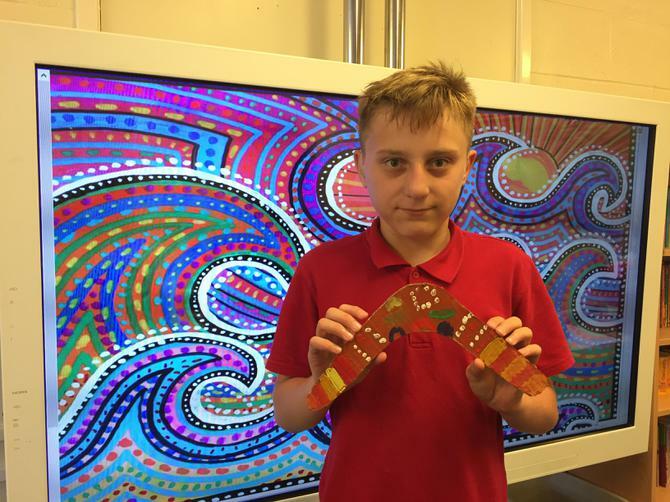 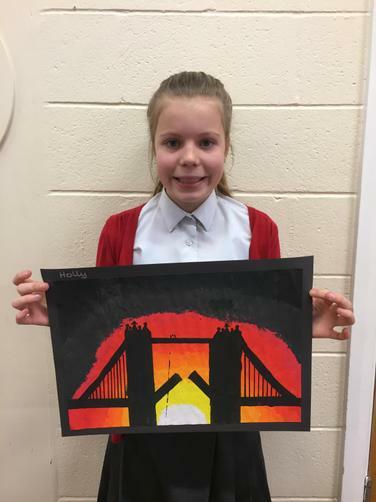 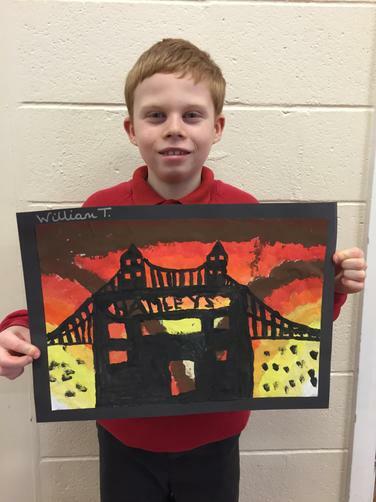 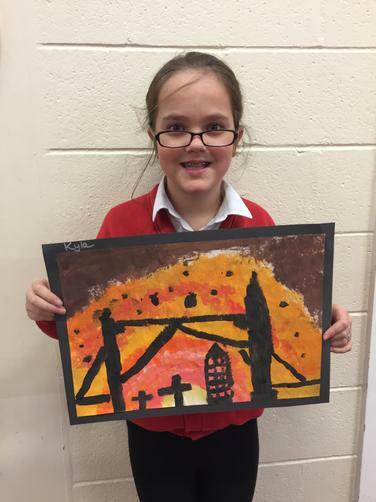 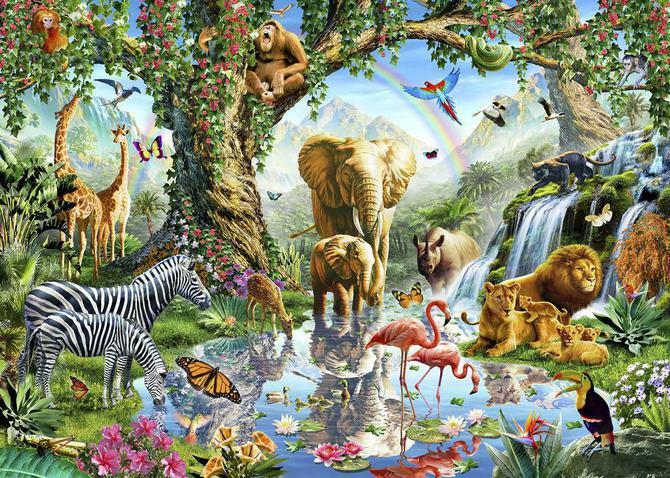 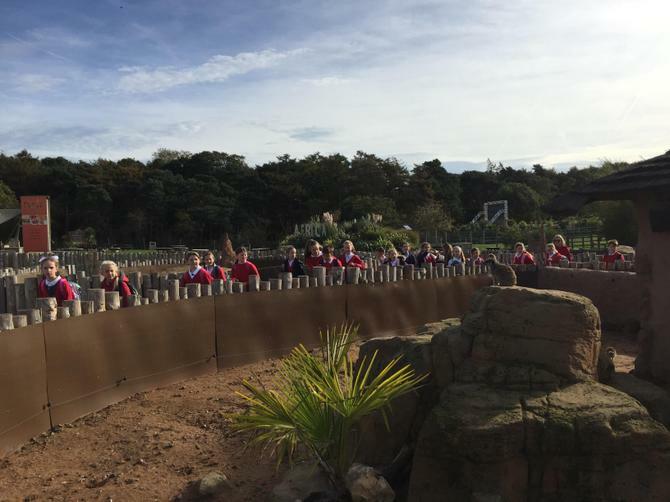 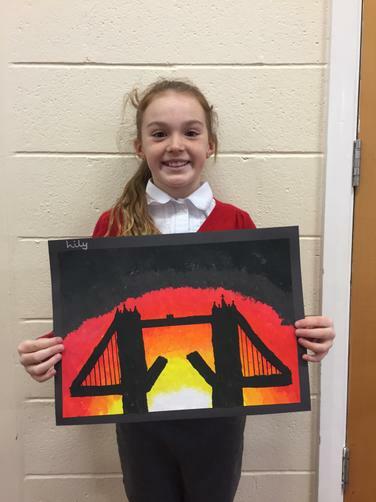 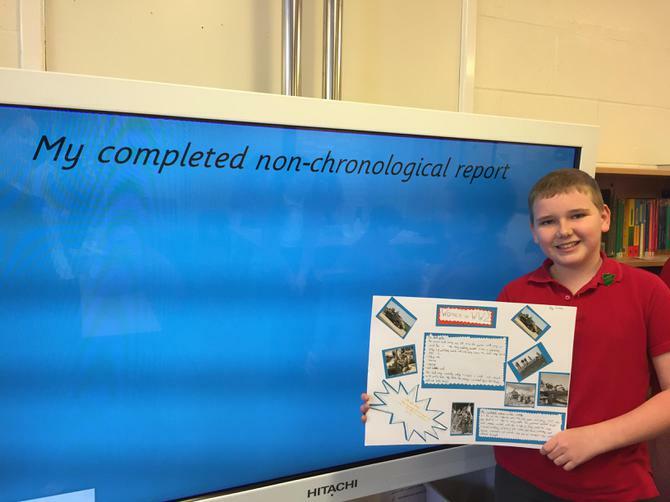 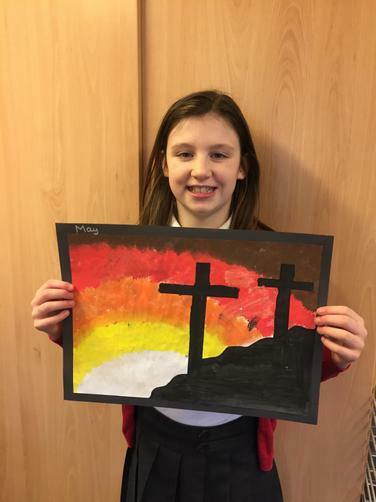 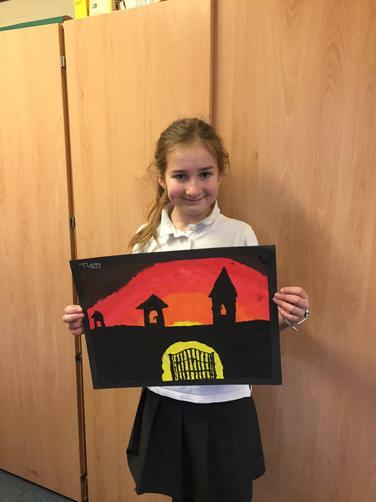 There are so many pictures of our fantastic achievements below, take a look! 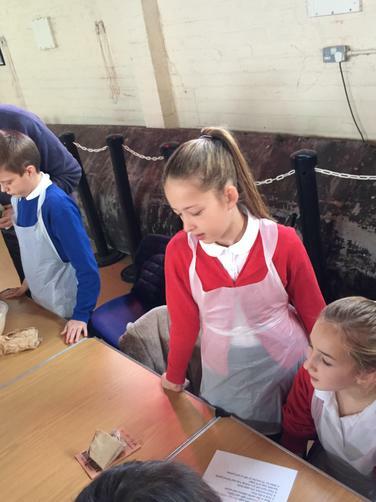 On the menu today for lunch was soup with crusty baguette, pasta with carbonara or marinara sauce, garlic bread and an array of salads. 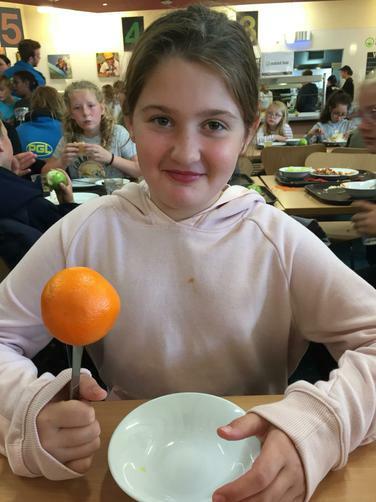 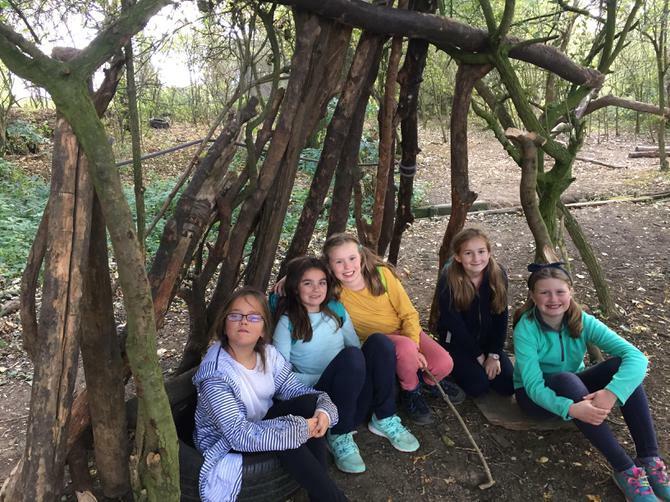 For dinner we were treated to homemade cottage pie with vegetables, chicken korma curry with rice or enchiladas, followed by chocolate crispy cakes for dessert – we were certainly ready for it after all of today’s activities! 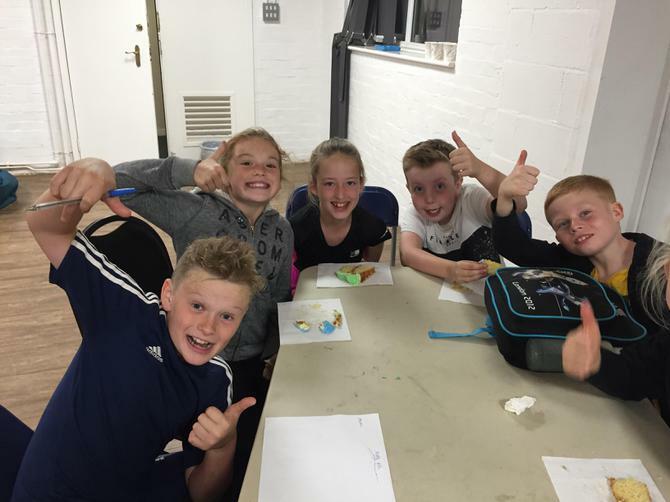 In the evening we were treated to a fantastic quiz, hosted by our wonderful groupie Matty. 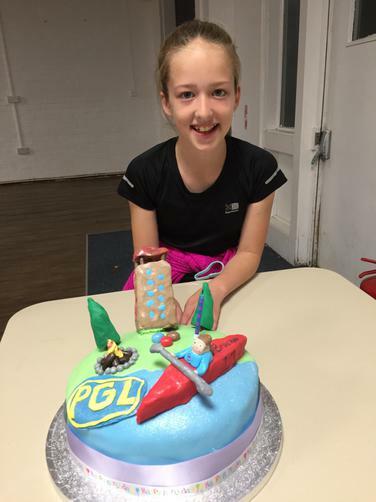 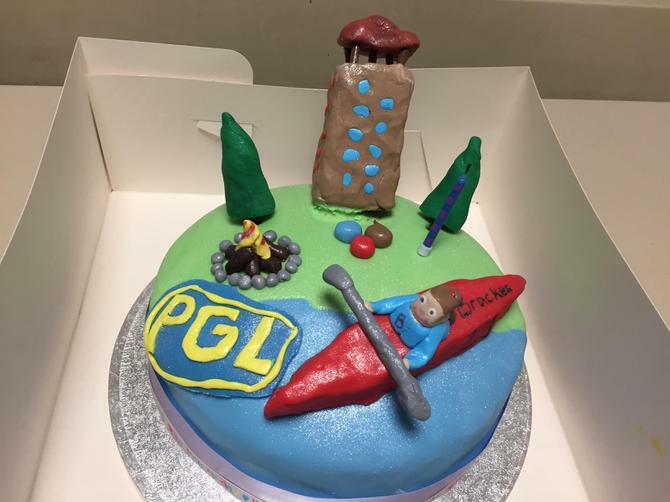 It featured question rounds about PGL, Disney and nursery rhymes, as well as challenge activities! 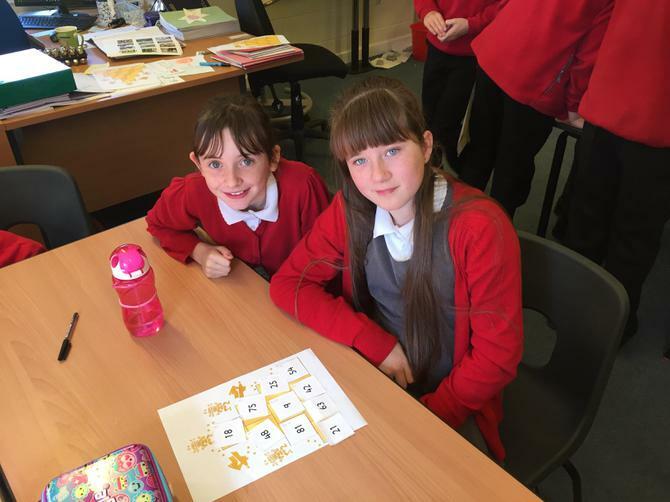 The overall winners were the teachers by 1.5 points – boo! 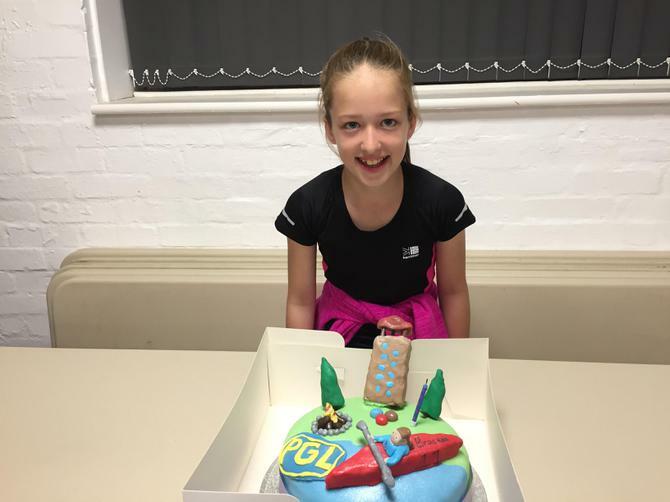 Also, this evening we celebrated Bracken’s birthday, which is on Saturday, with a fabulous cake baked by her grandma! 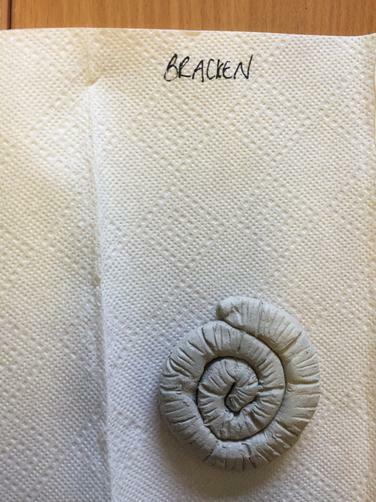 Happy birthday Bracken! 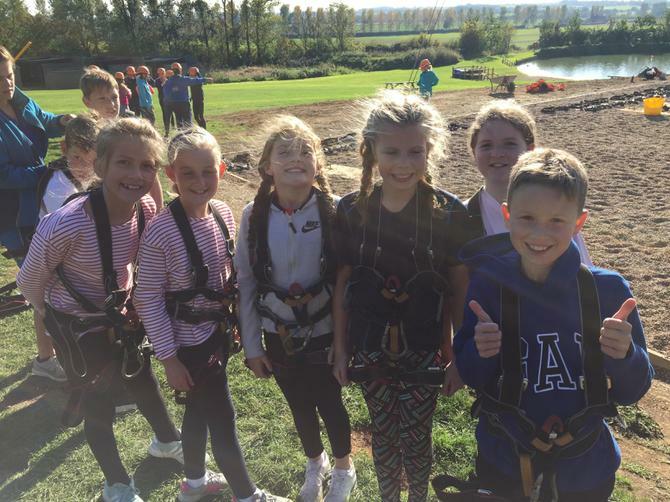 What a way to spend our last day! 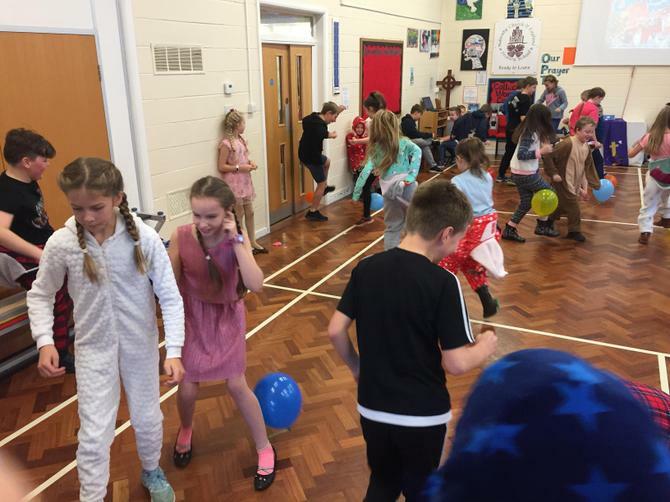 In the blink of an eye, our final day had arrived! 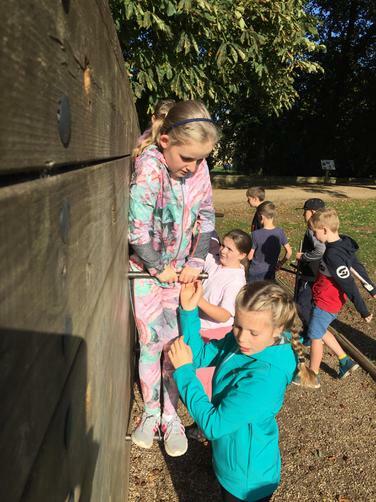 We awoke slightly earlier to pack our suitcases before heading off for breakfast at 7.40am. 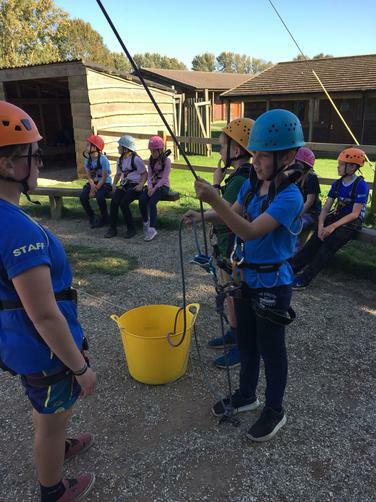 It was then time to move our bags, strip the beds and check our rooms for stray socks before heading off to our morning activities. 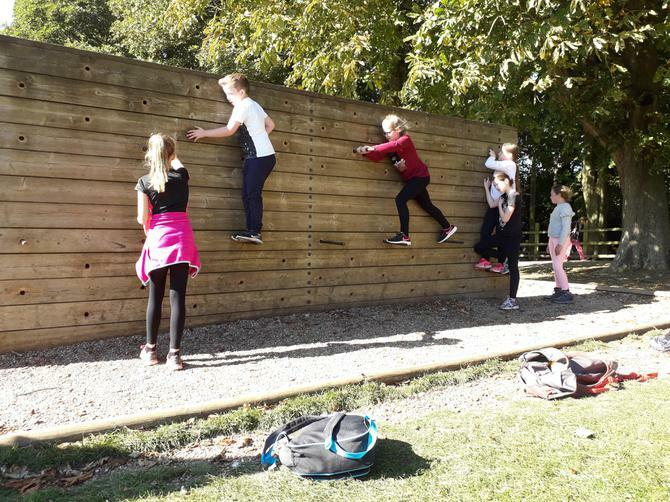 Two groups took on the climbing wall for their first challenge, whilst others headed over to the zip wire. 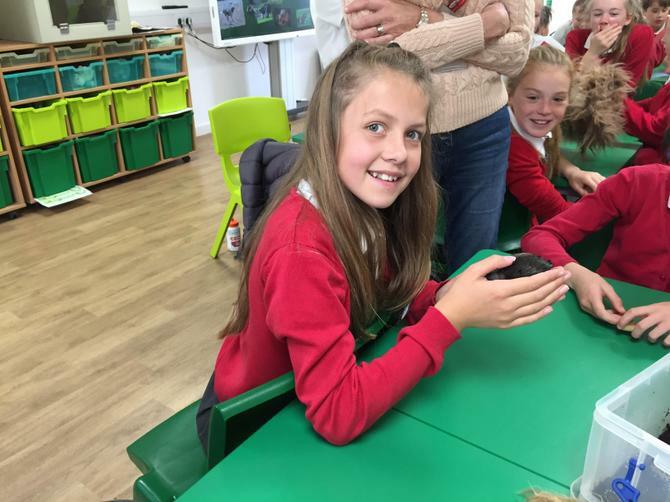 Squeals of delight all round! 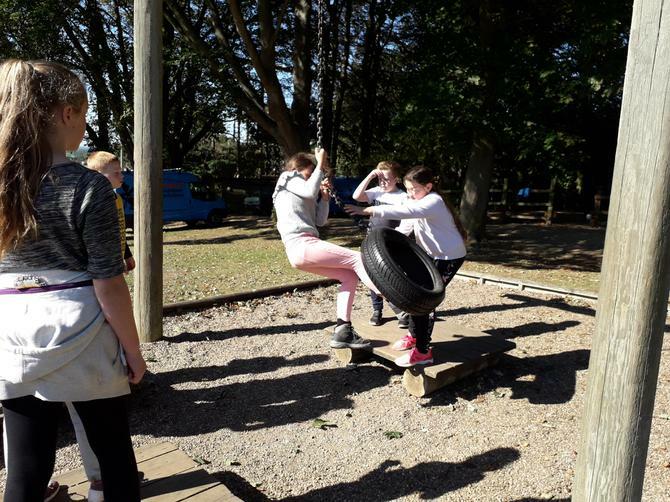 Our final activity was the same for all groups, and it was lovely to work alongside each other for what seems like the first time in a long time! 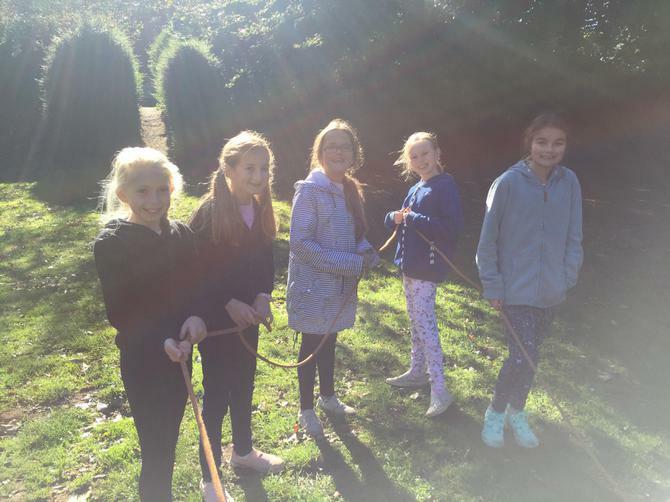 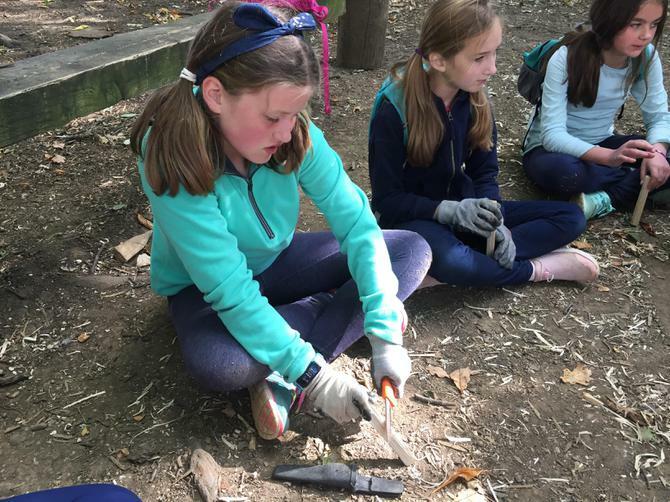 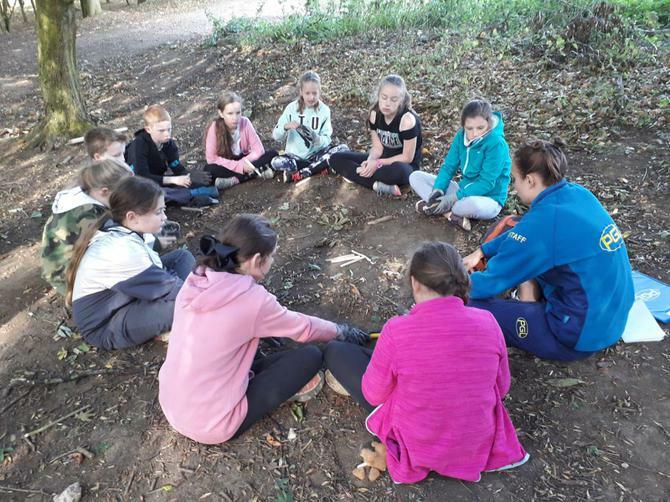 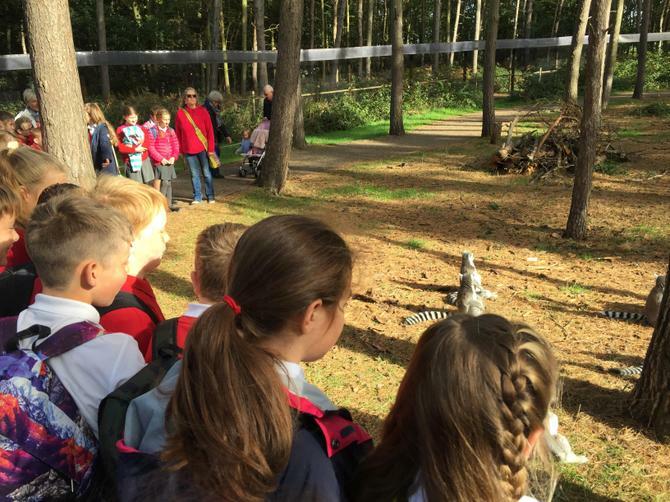 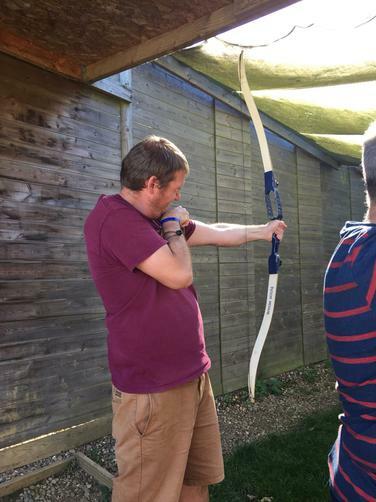 We took part in 'survivor', an activity based upon survival skills in the woods. 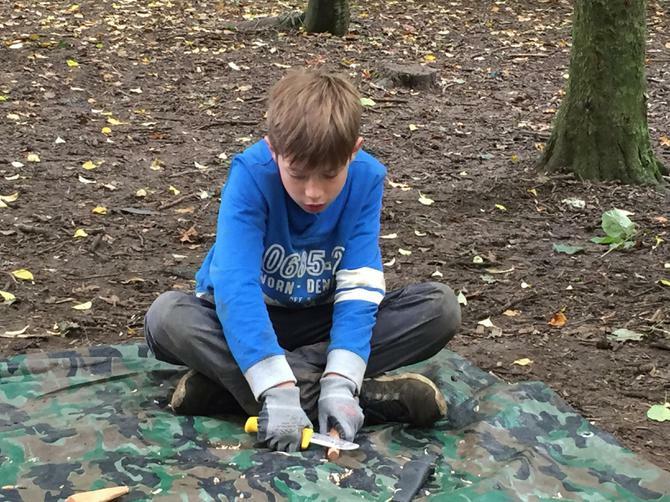 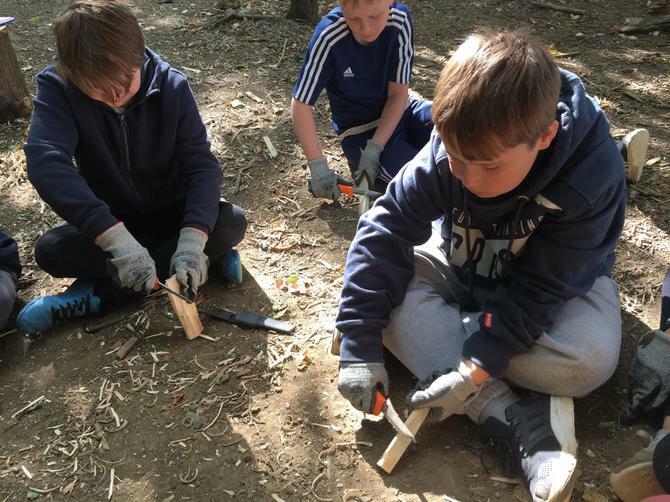 For this we built dens, made fires and whittled some wood to make tent pegs! 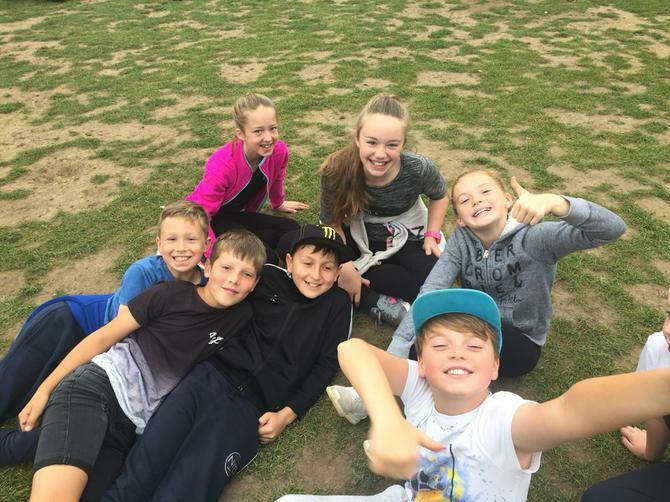 Have a look at the gallery below! 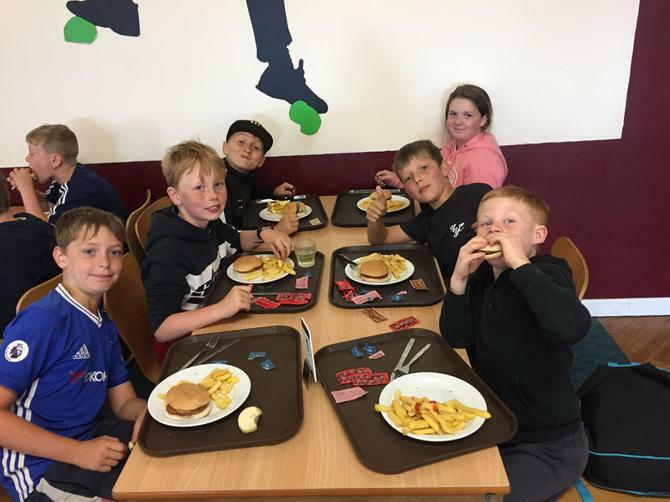 We then enjoyed one final meal together before going to retrieve our many bags and getting ready to greet our eager parents! 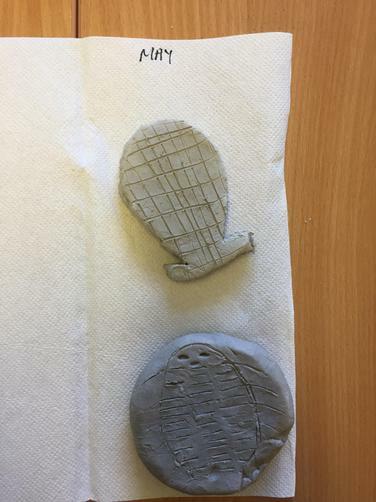 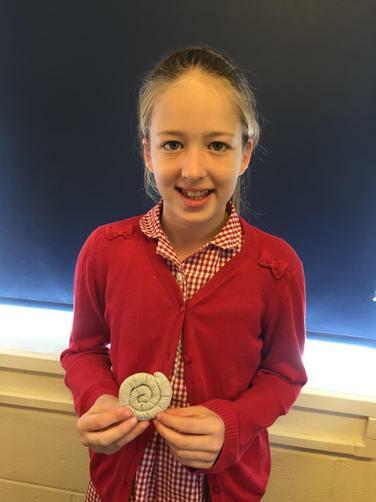 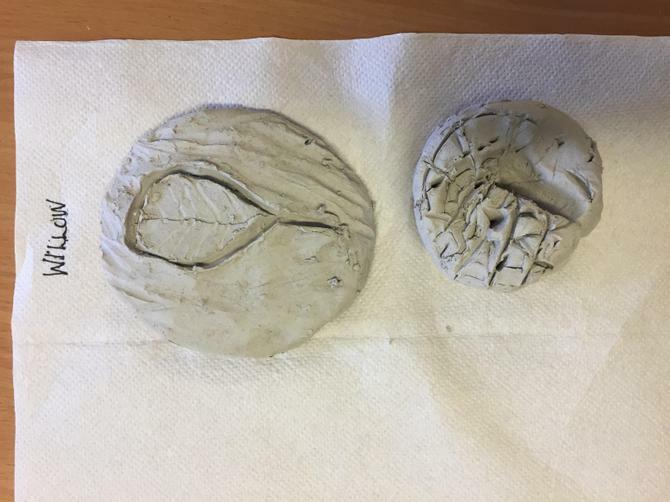 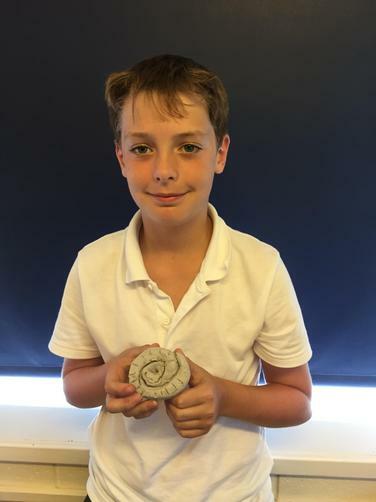 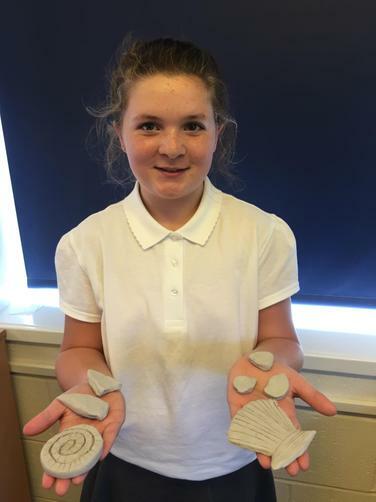 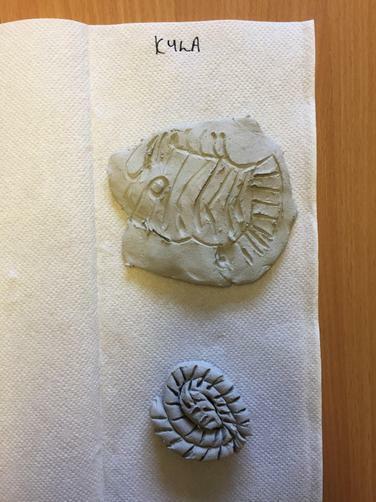 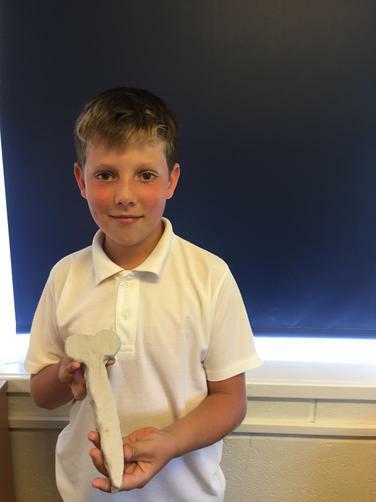 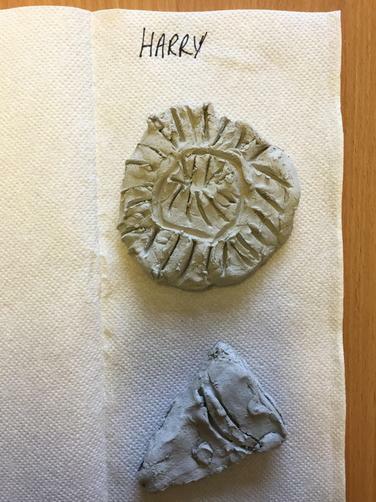 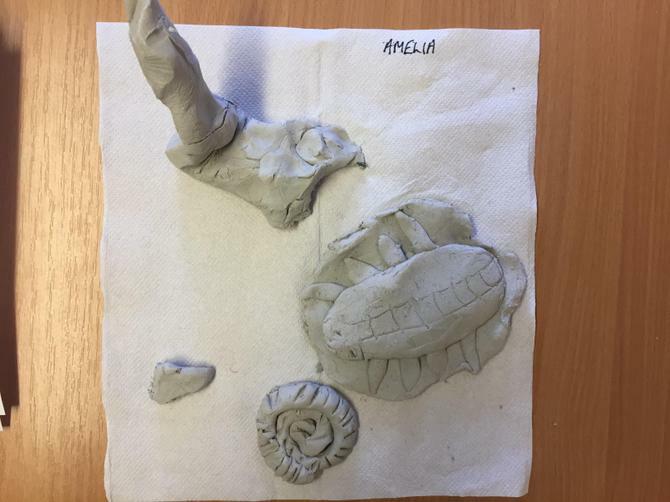 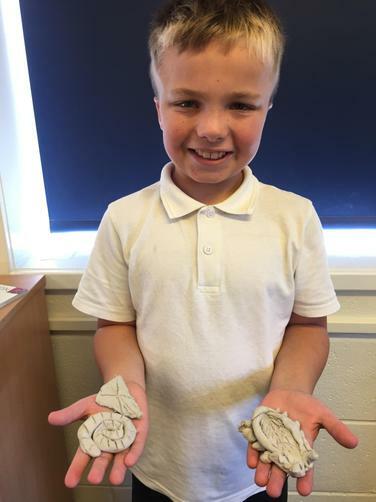 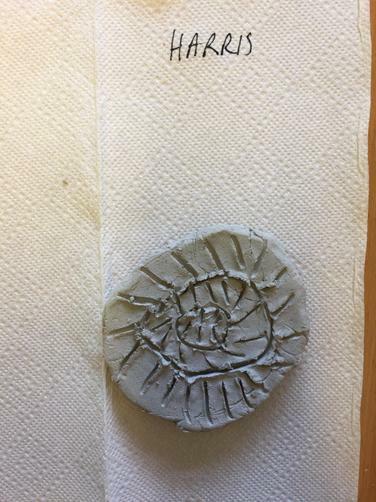 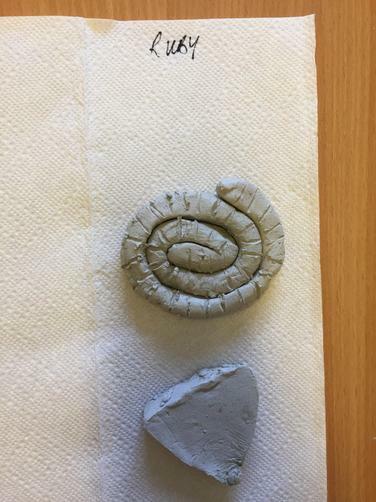 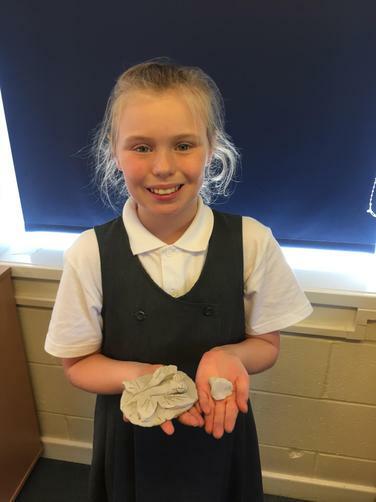 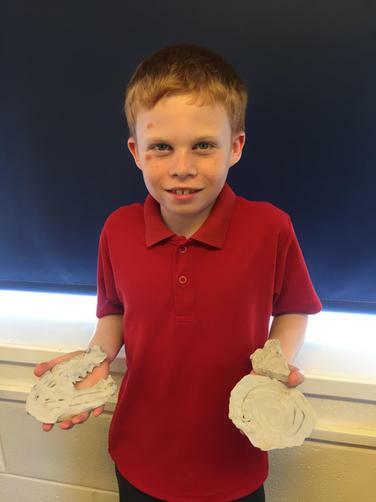 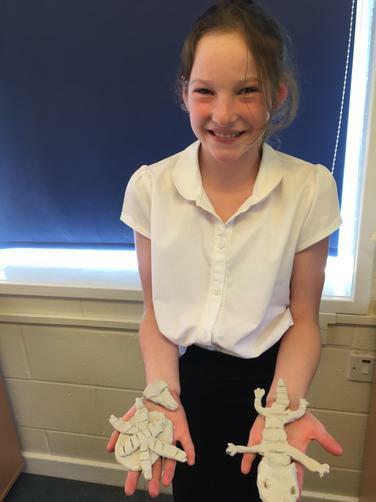 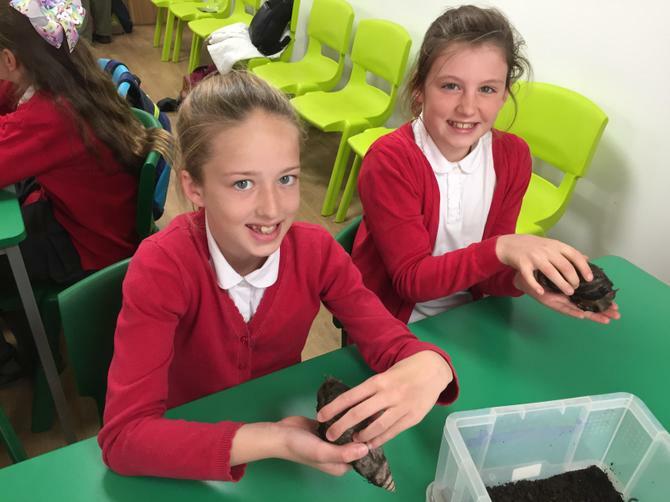 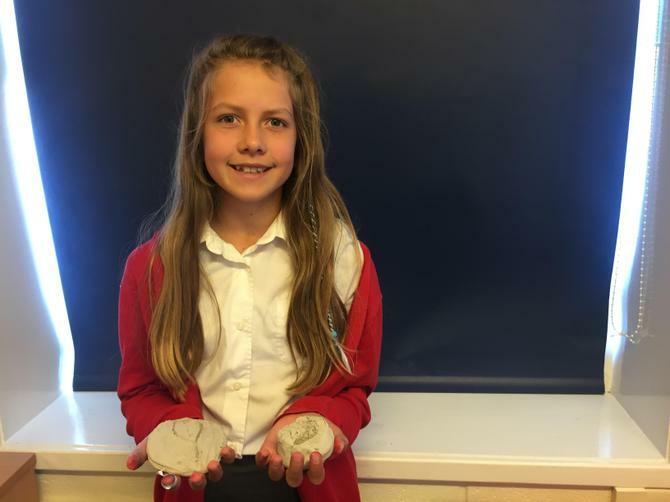 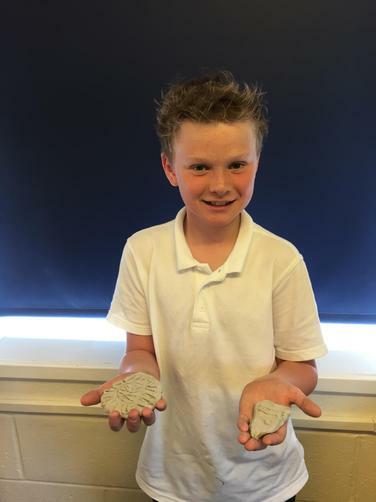 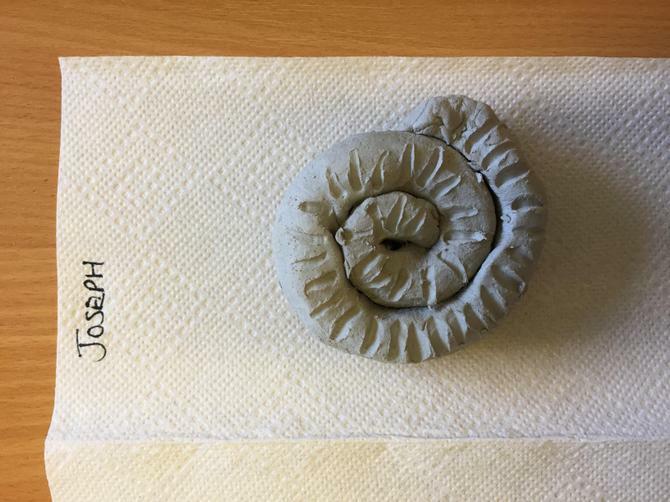 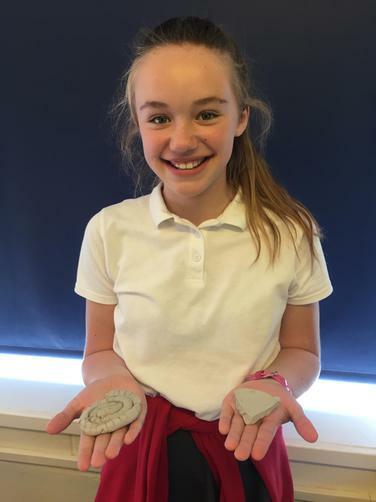 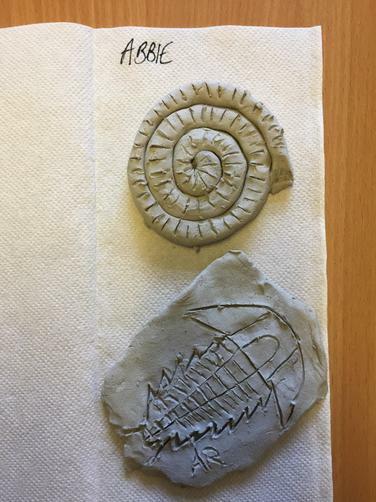 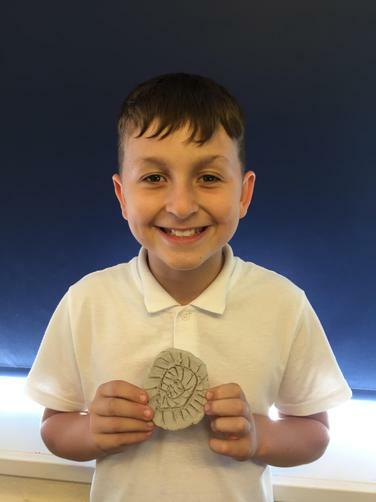 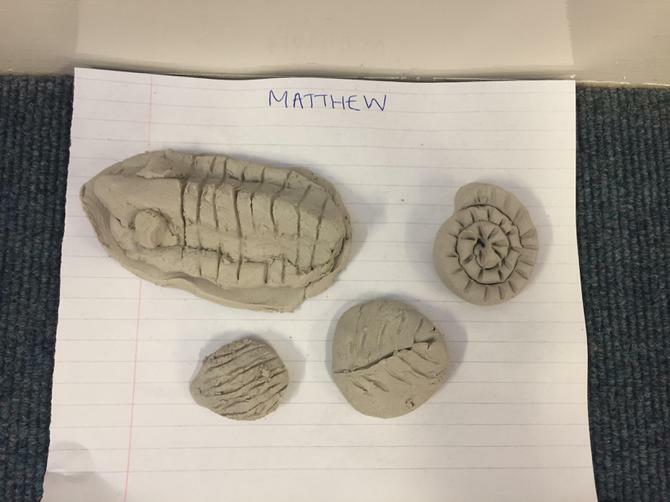 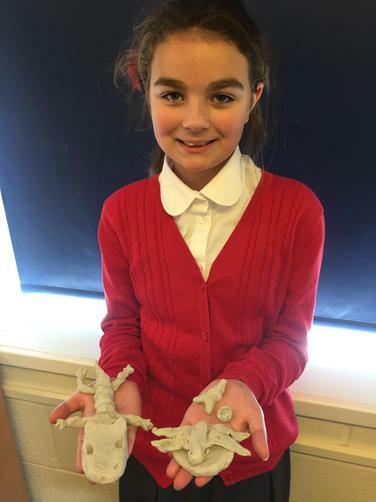 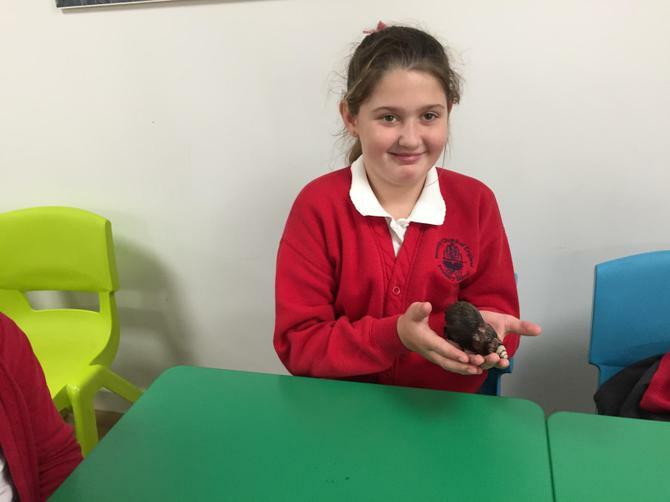 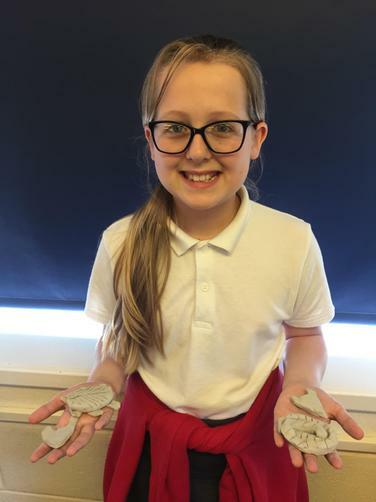 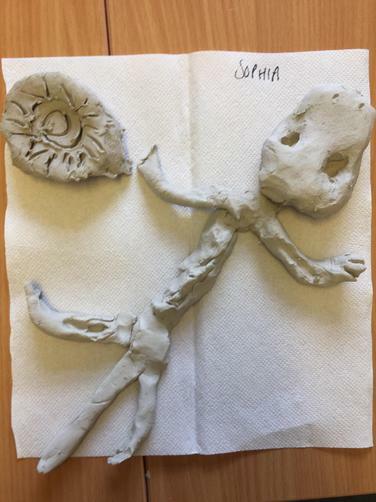 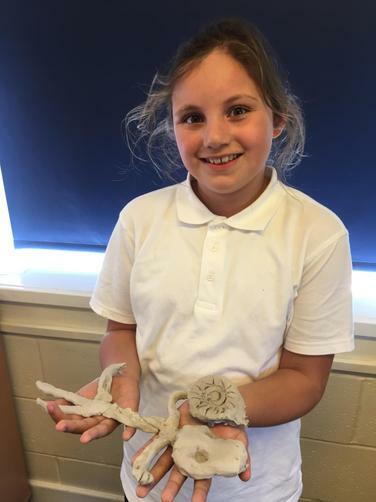 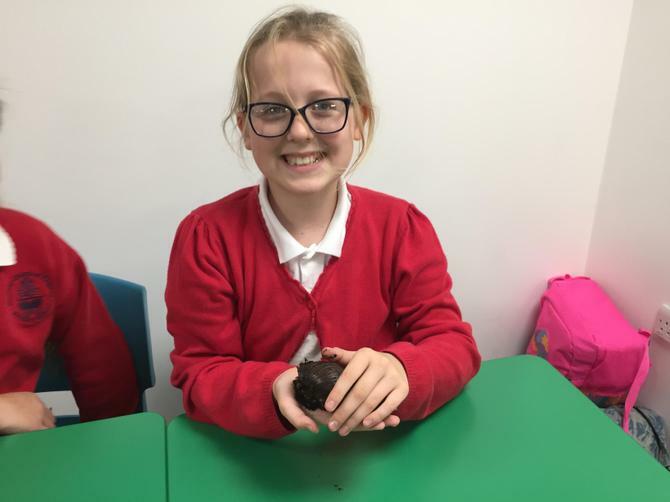 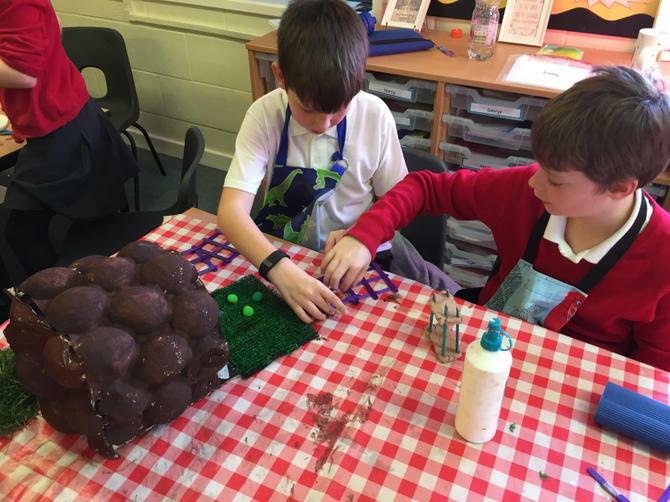 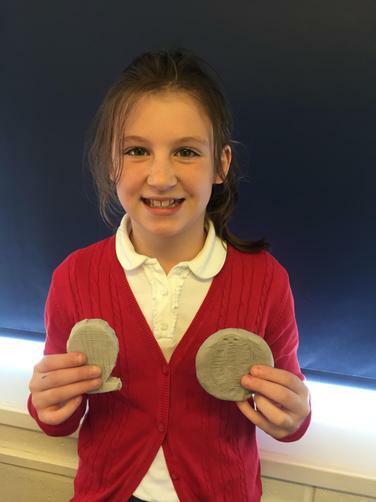 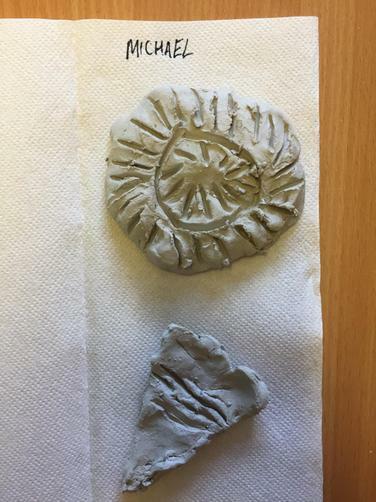 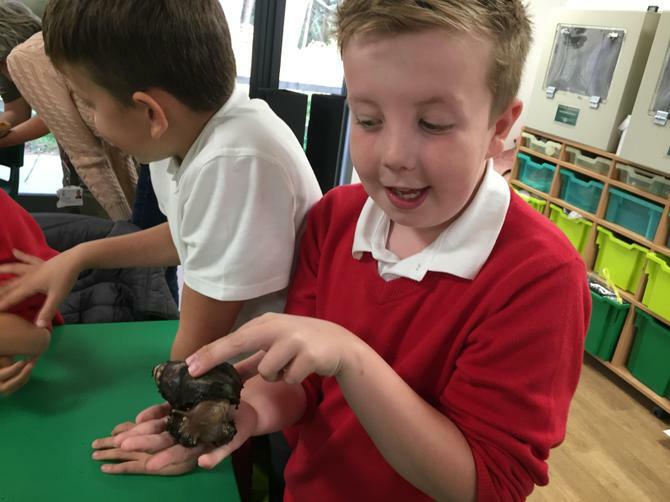 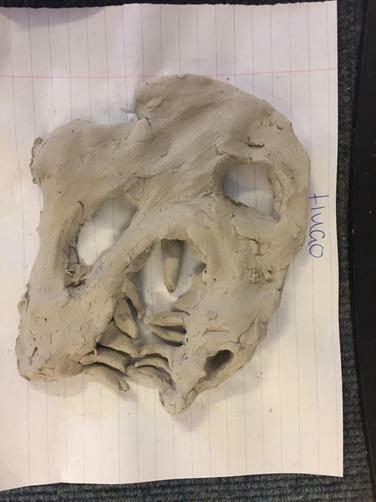 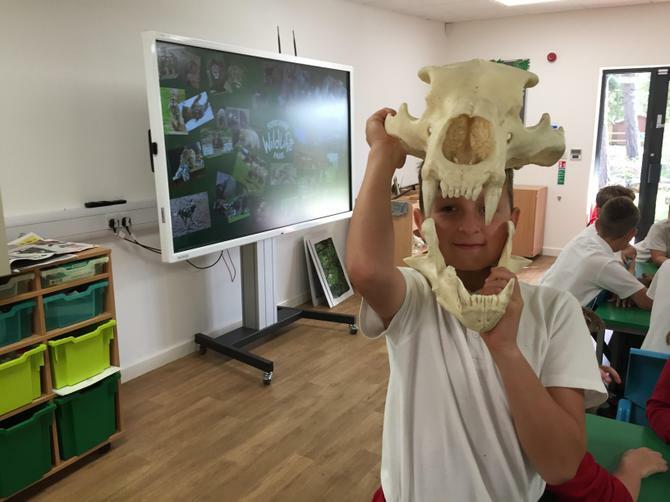 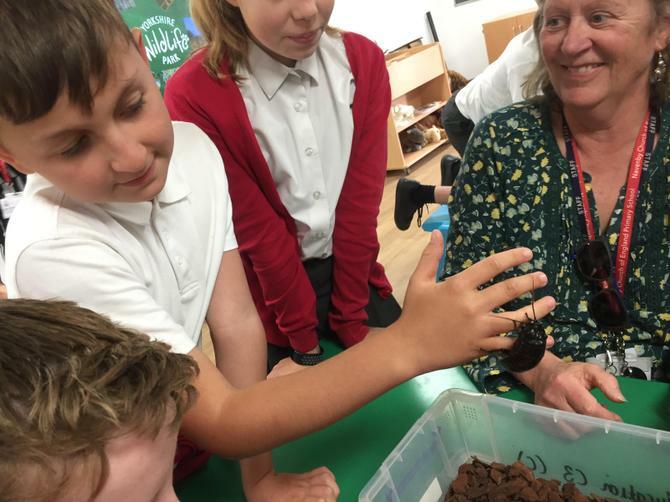 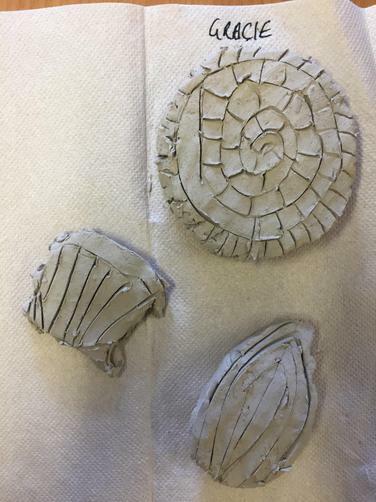 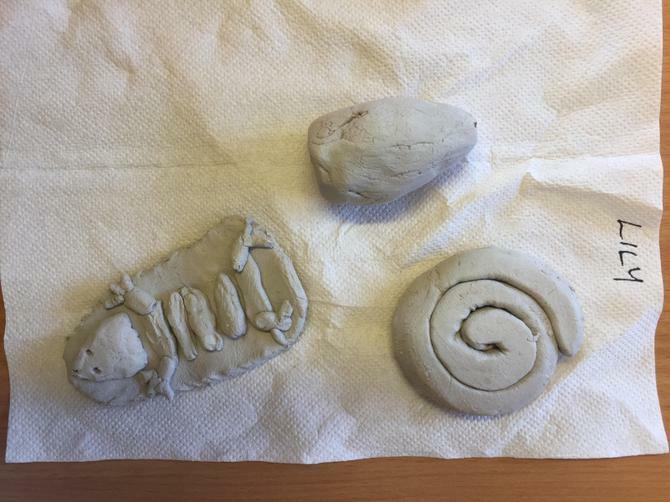 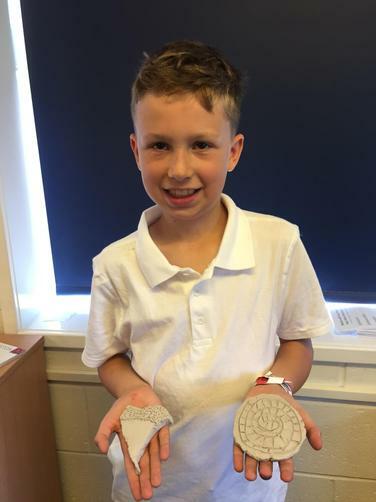 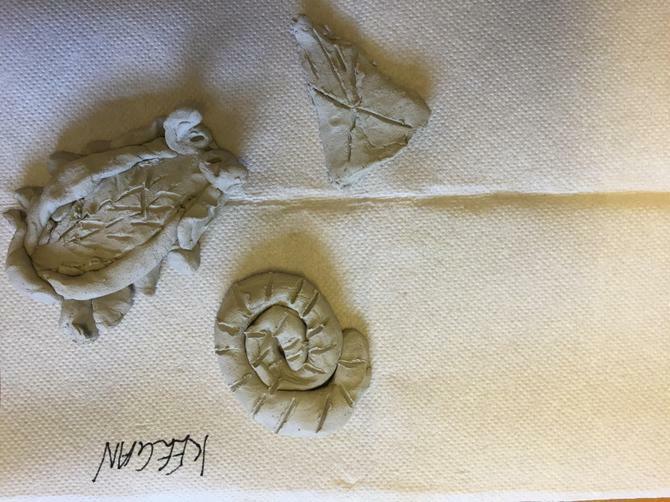 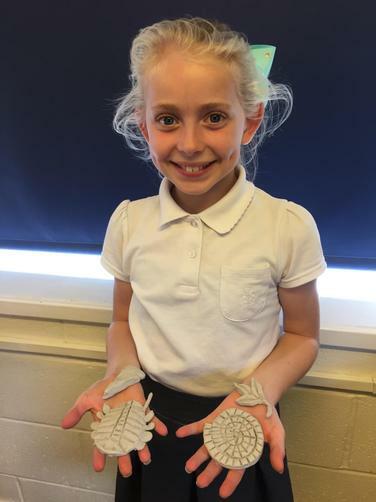 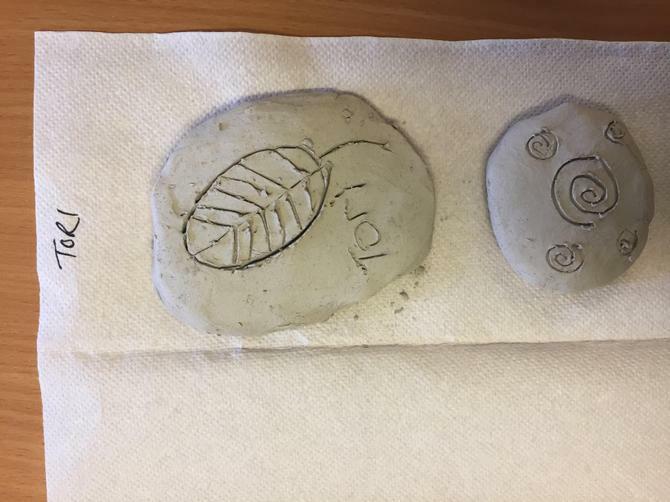 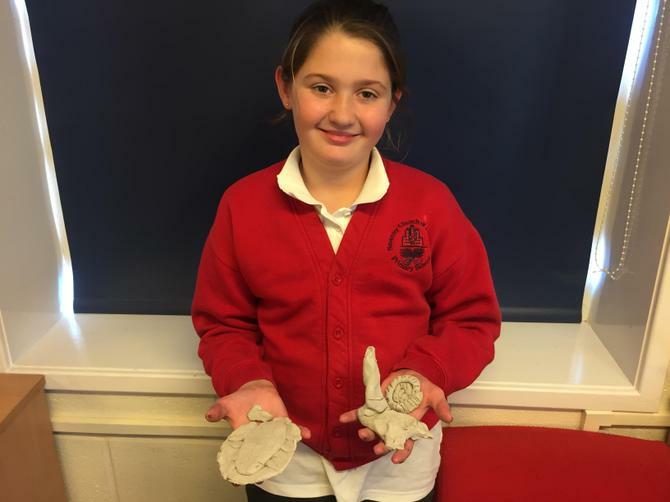 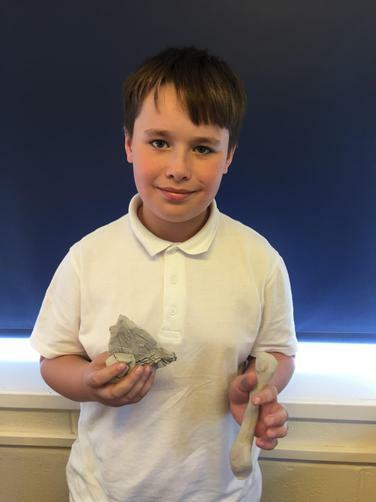 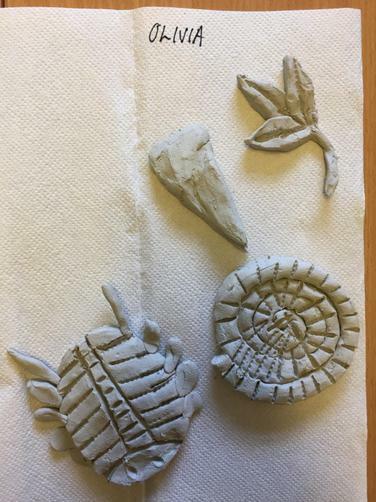 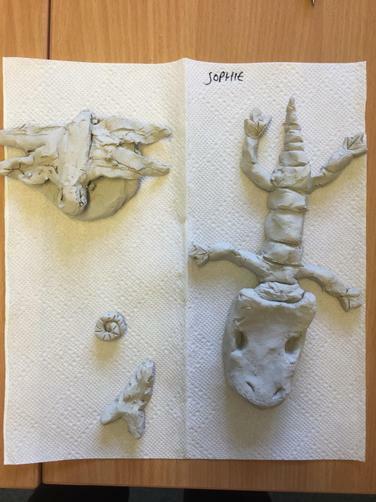 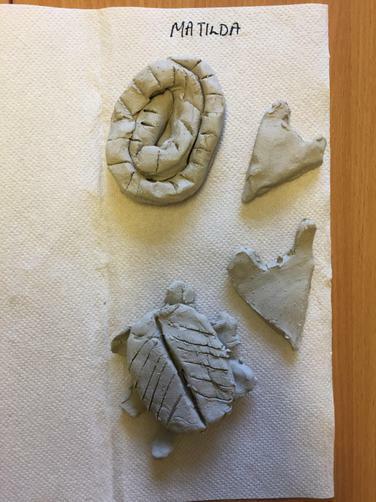 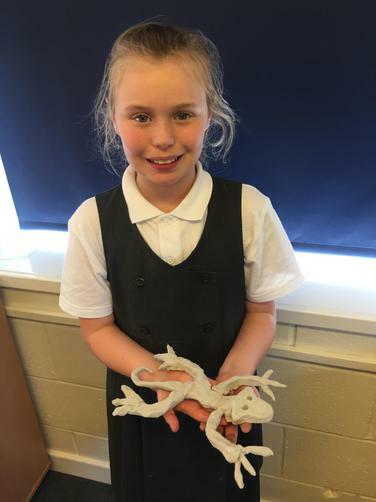 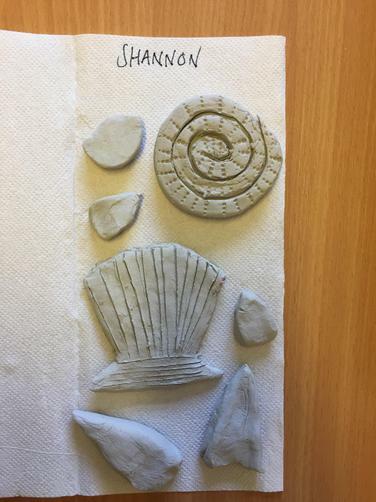 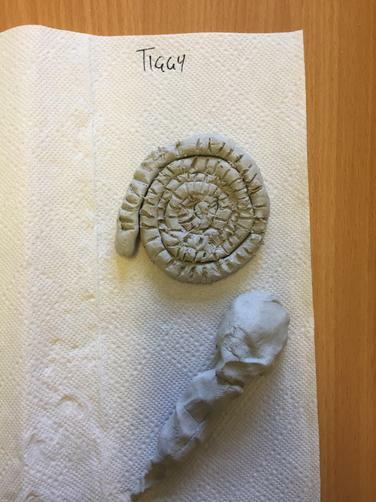 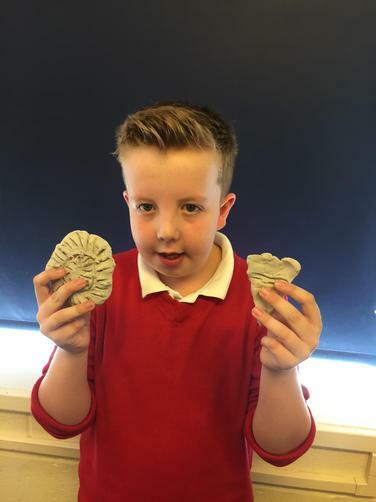 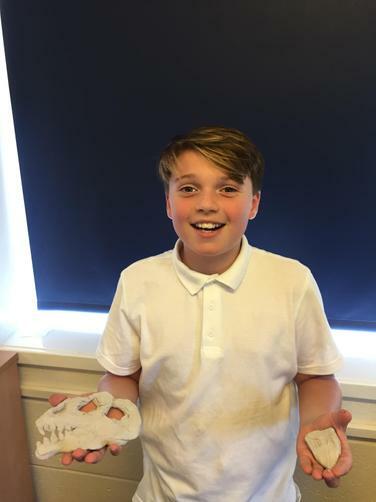 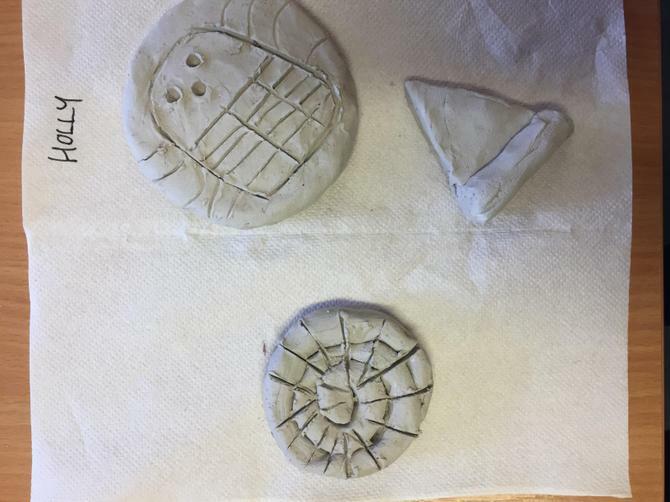 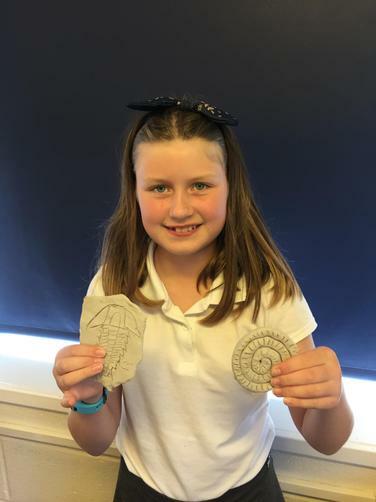 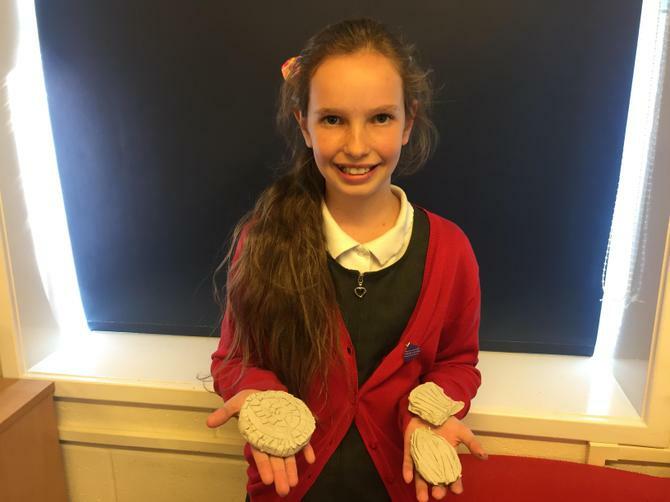 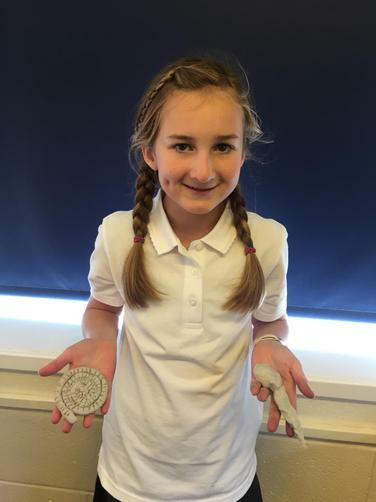 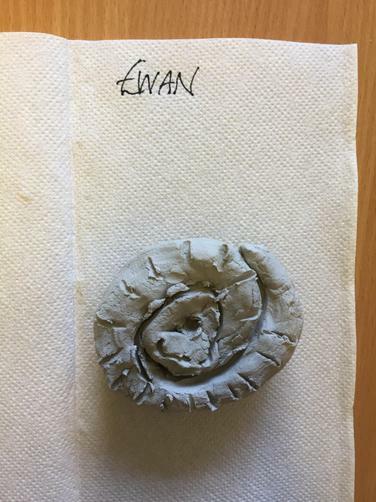 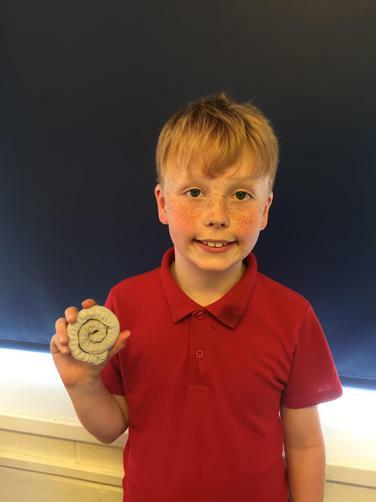 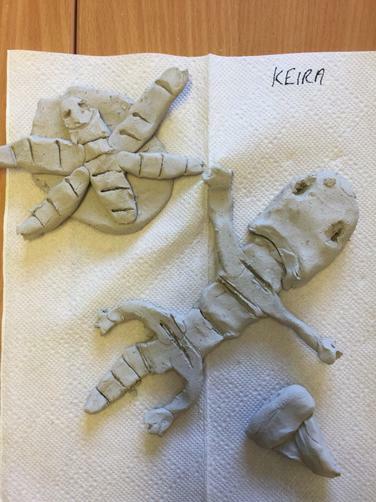 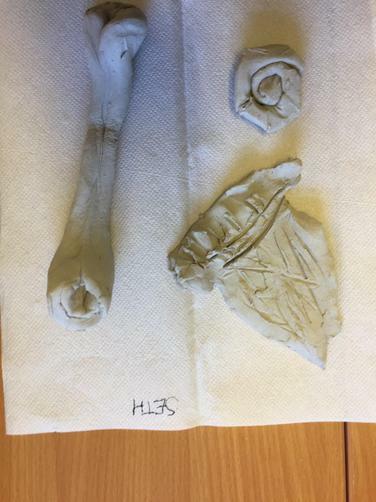 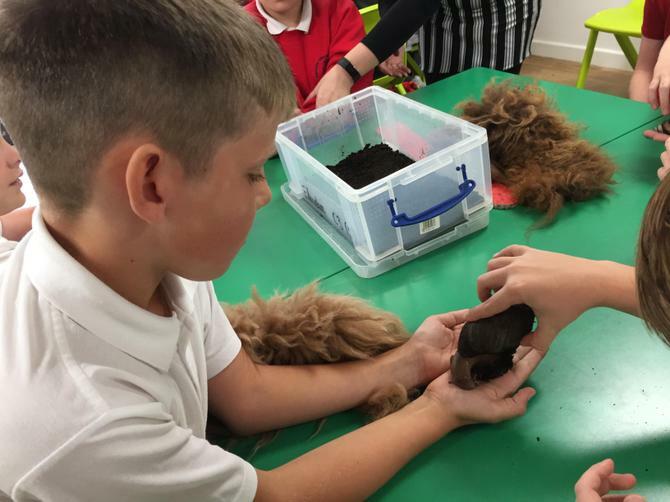 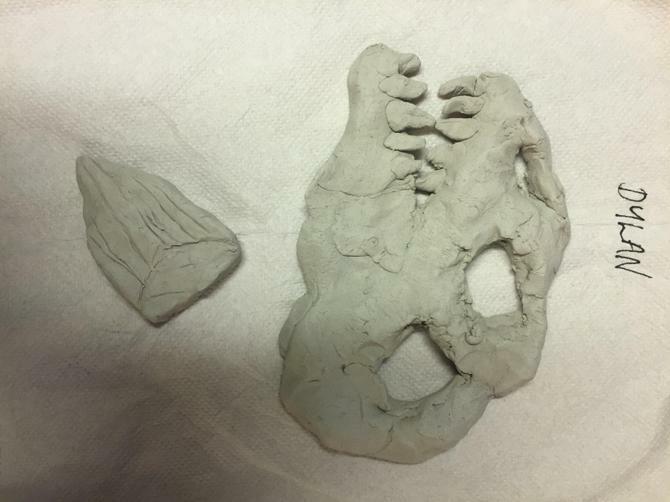 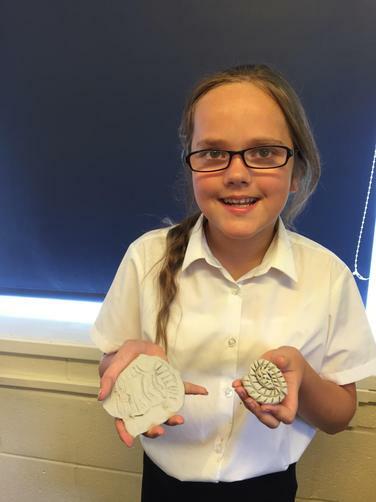 This week we have been designing and making fossils out of clay to fit in with our science learning on fossilisation - take a look at our fantastic creations!